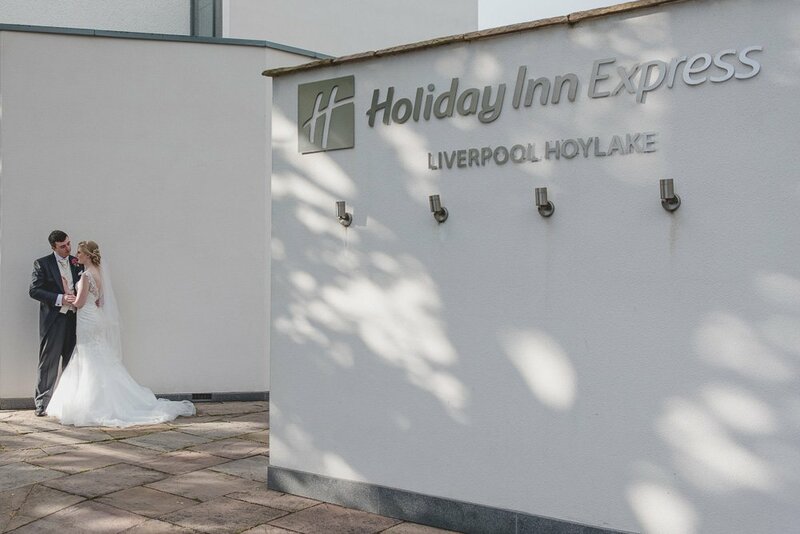 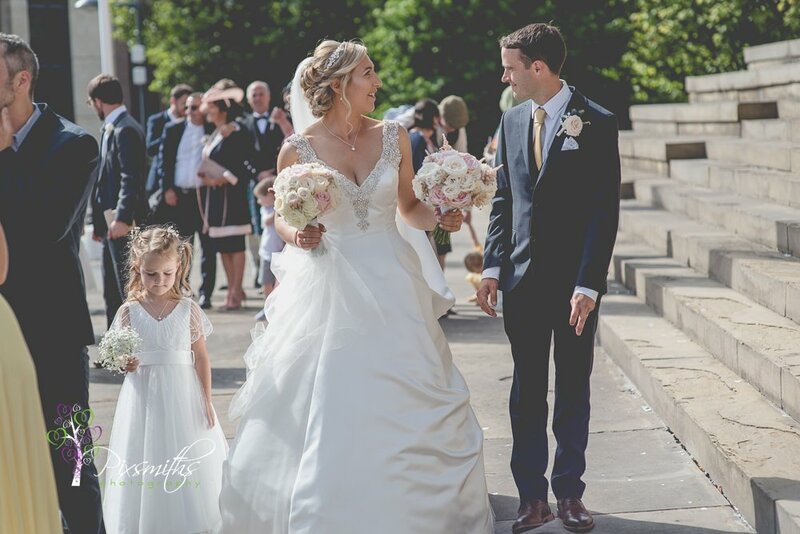 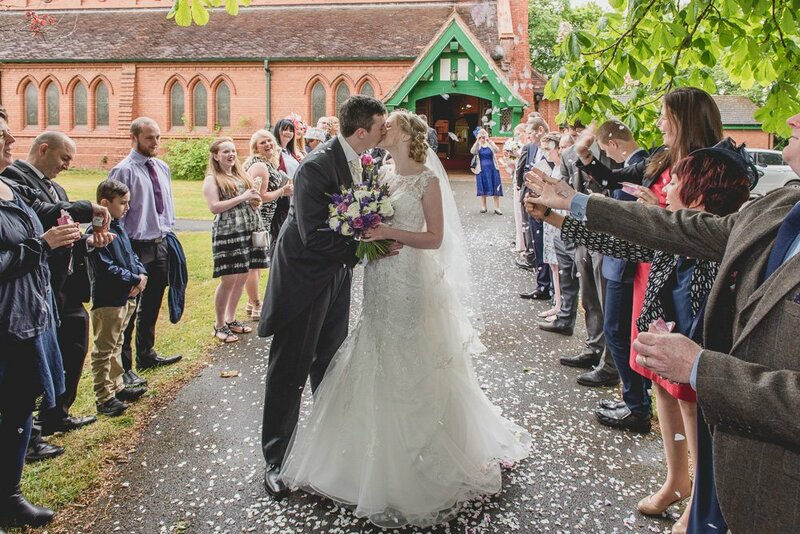 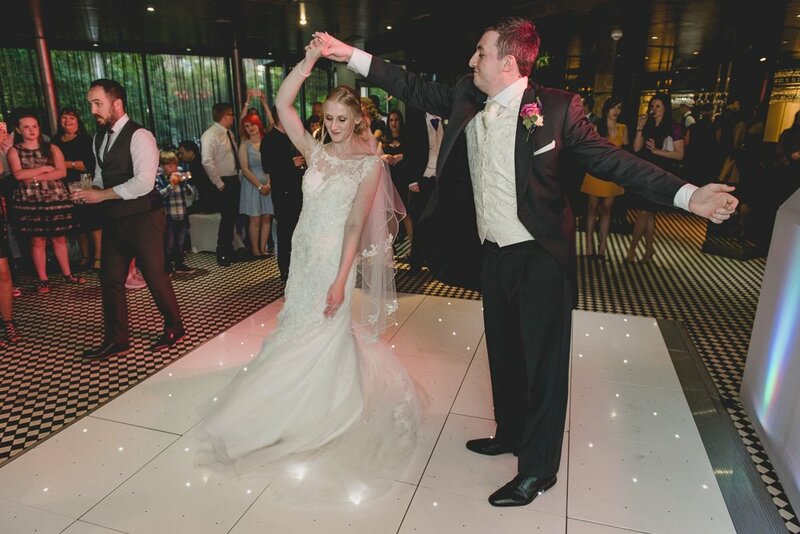 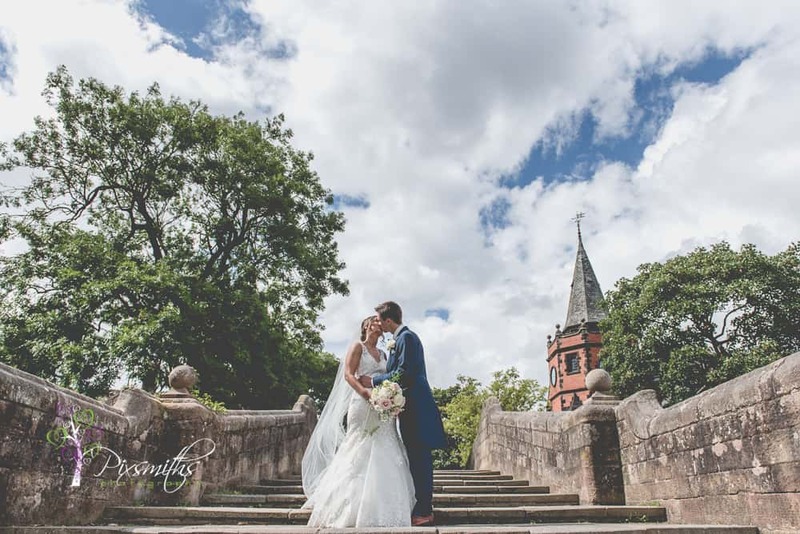 Sarah and Chris had a fabulous day for their summer Leverhulme Hotel Wedding . 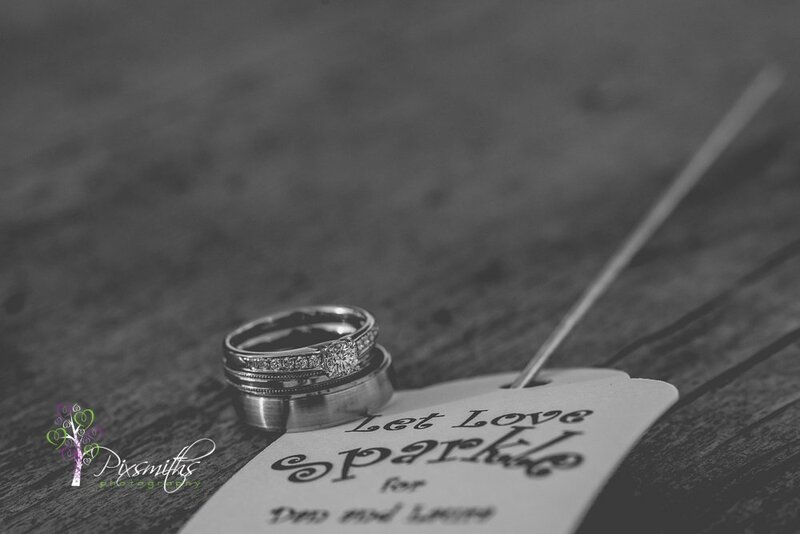 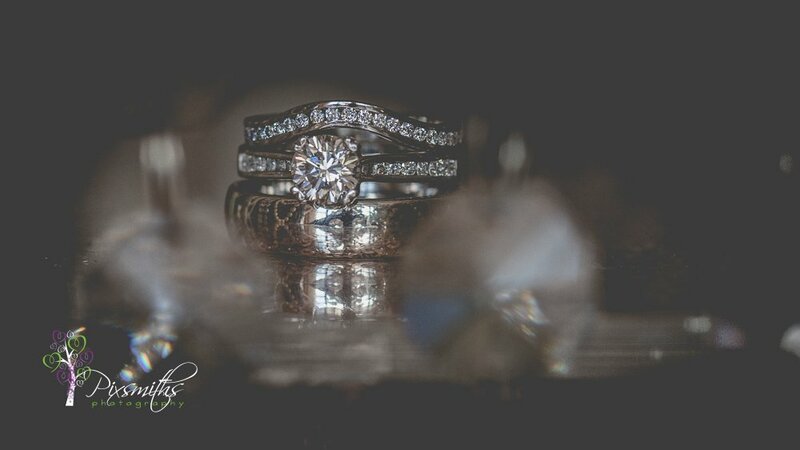 Been so looking forward to sharing this post after their honeymoon. 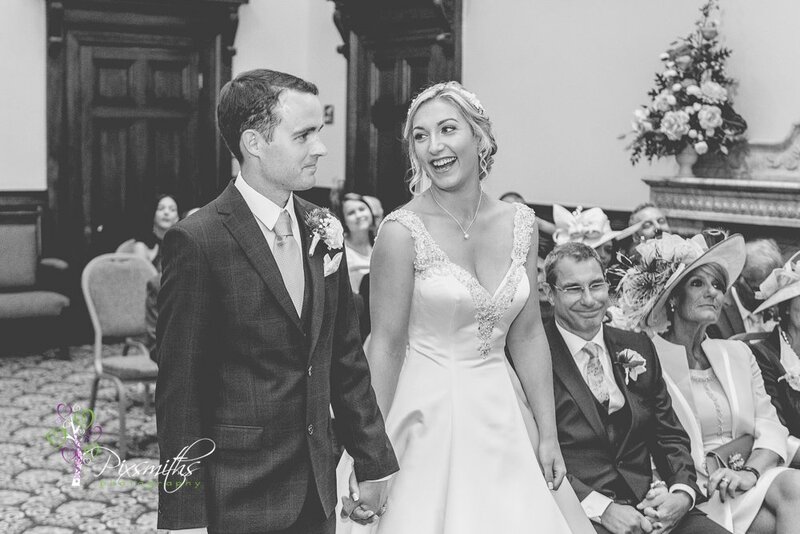 More importantly Sarah and Chris had looked forward to this day they had planned so well. 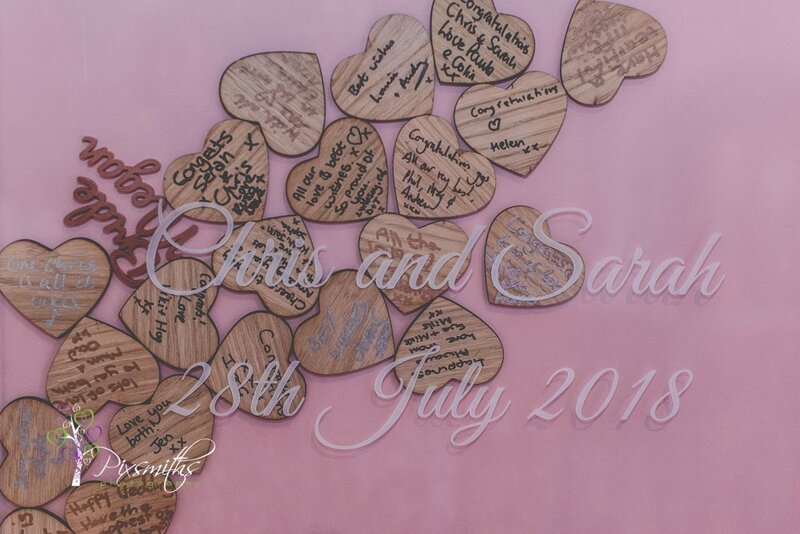 Sarah & Chris have been together for 10 years and had put much love and thought into this day. 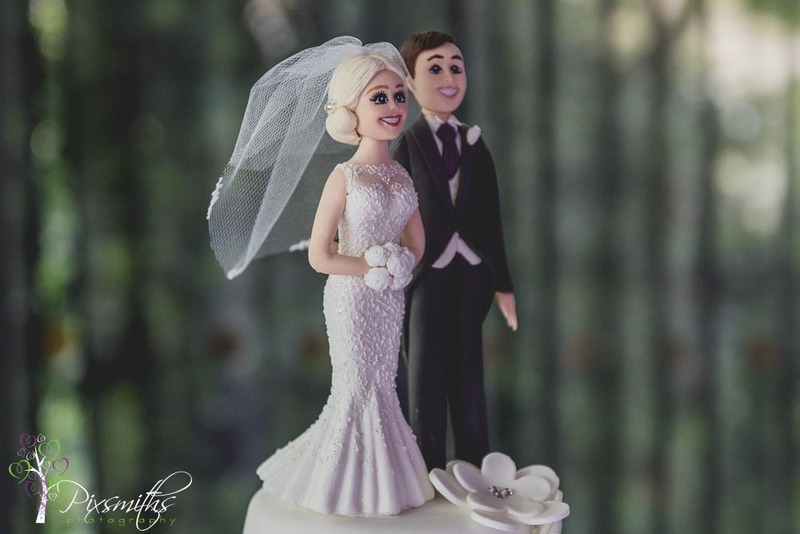 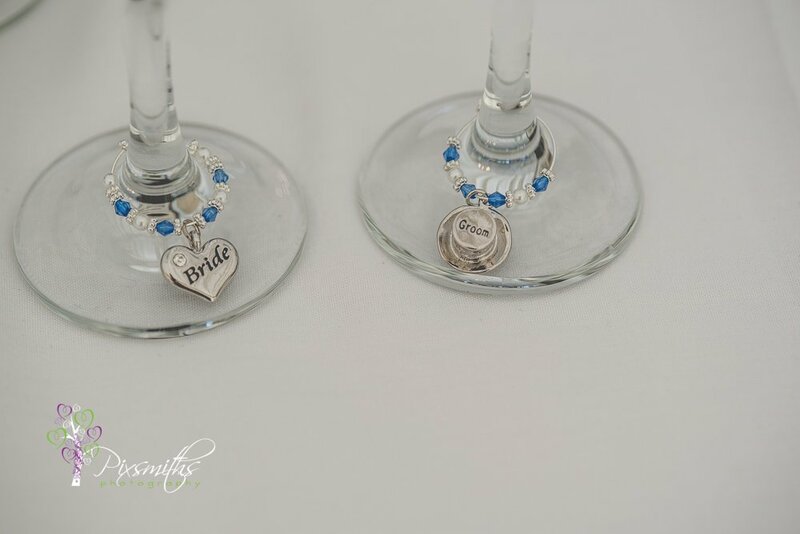 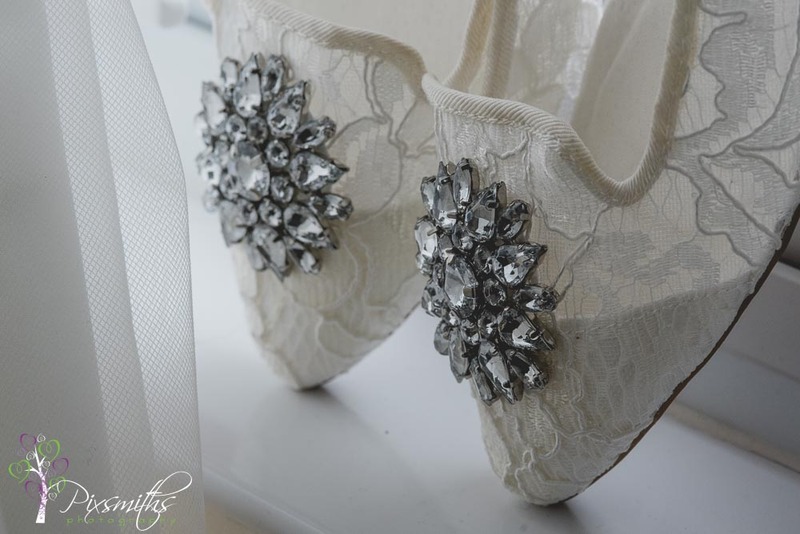 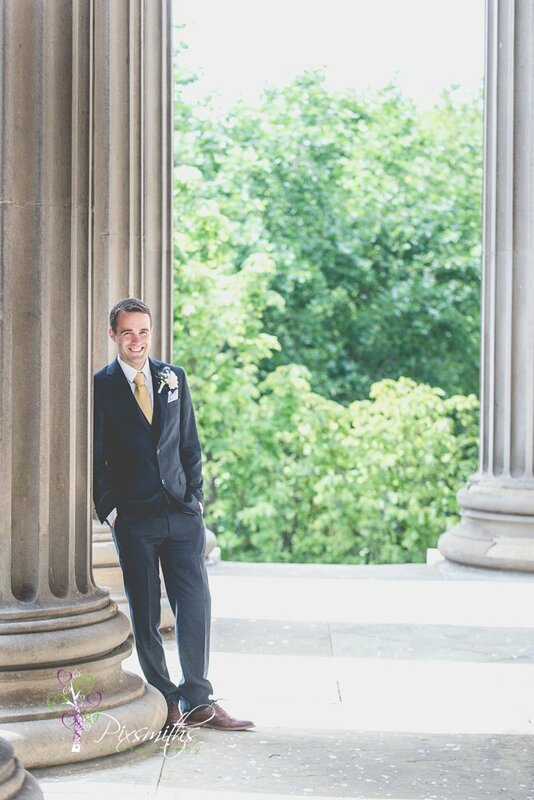 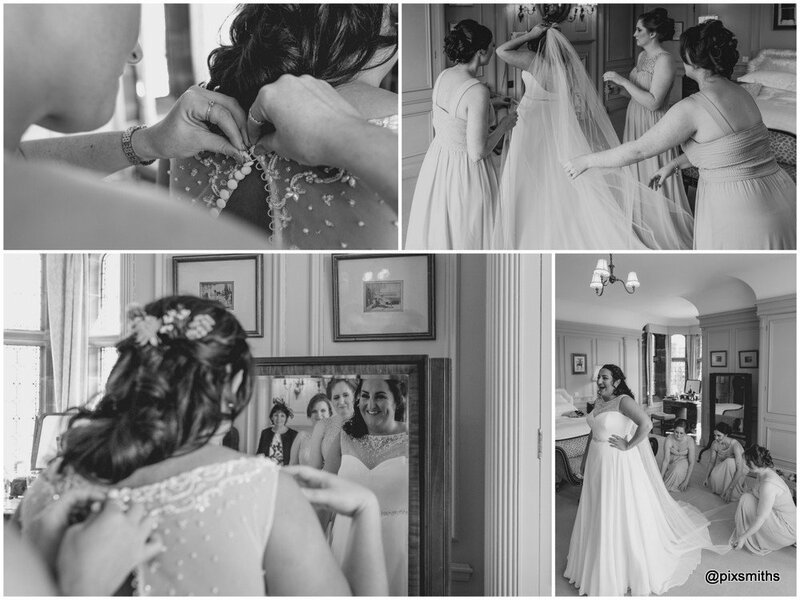 We love all the details and candid shots as well as some fun groups. 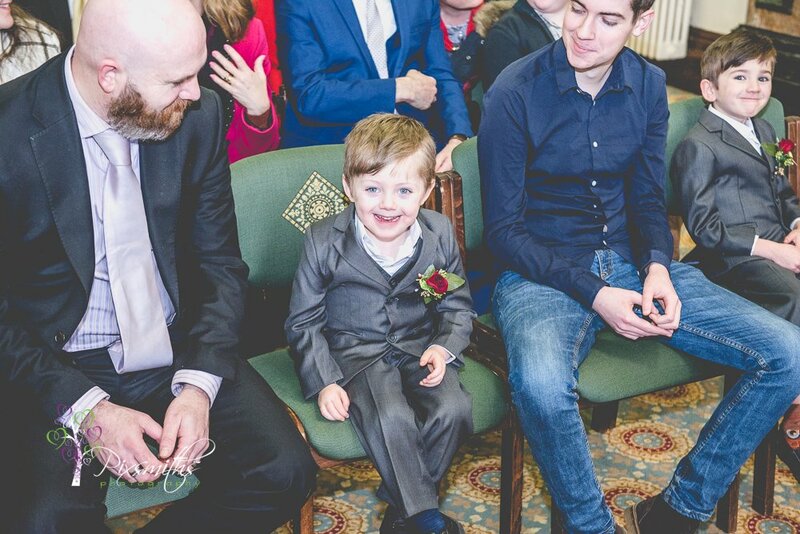 We had the cutest flower girl and page boy! 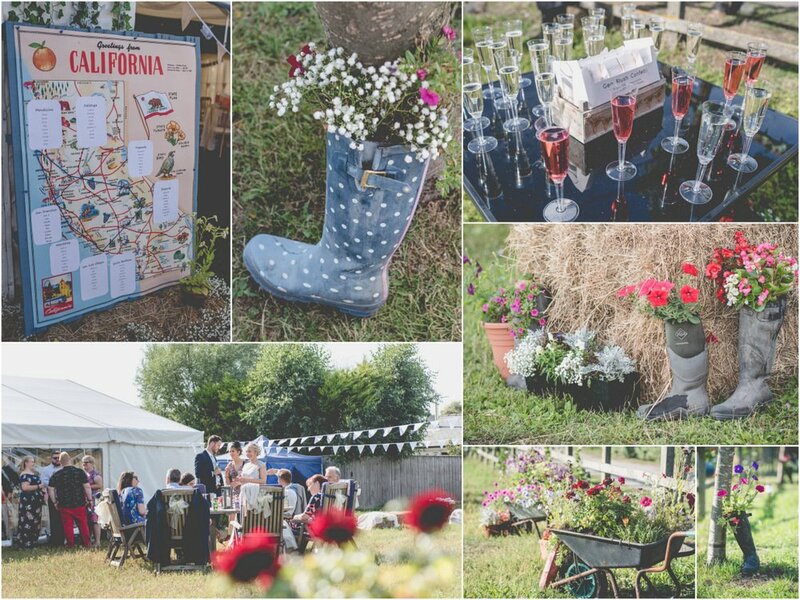 So many fab suppliers on hand too, we knew it would be a fab day. 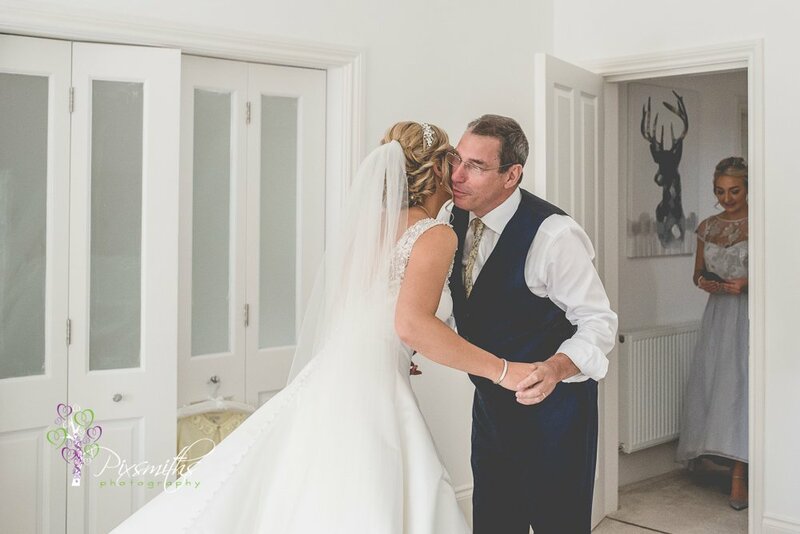 Loved the big heart drop frame – of course someone had to write, “One Chris is all it takes” ..seemed to be song of the day! 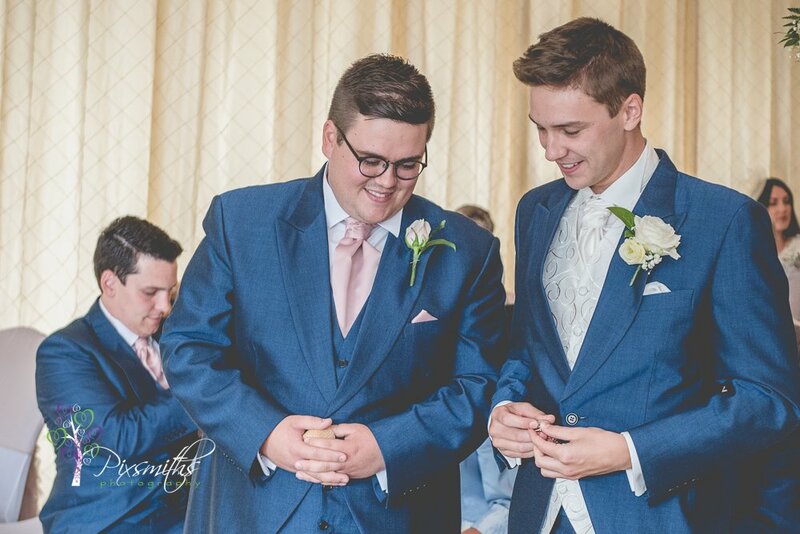 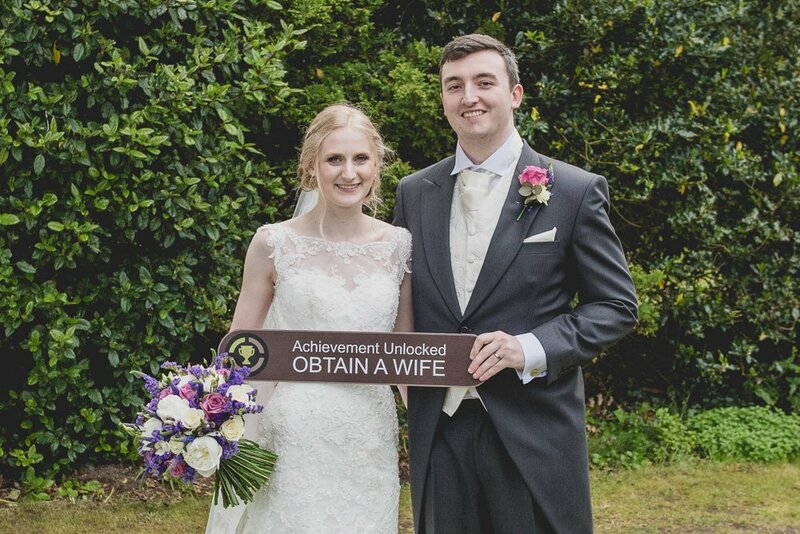 Many congratulations guys, such an amazing day for you with your friends and family. 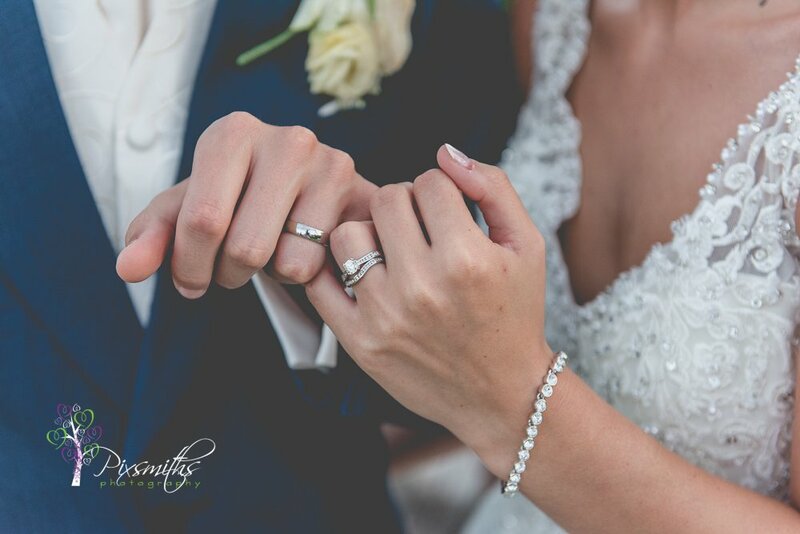 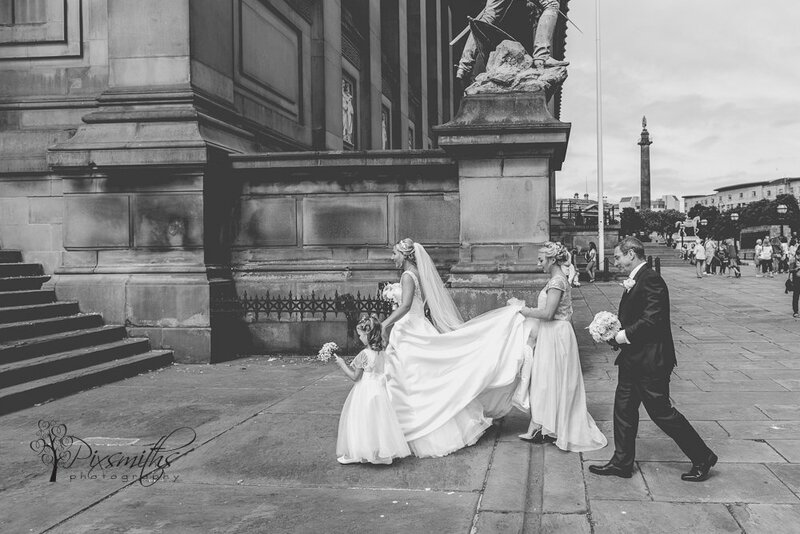 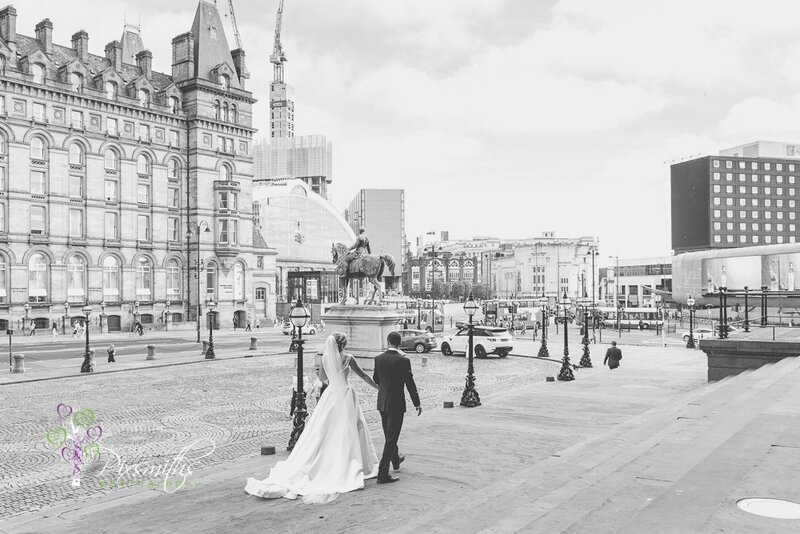 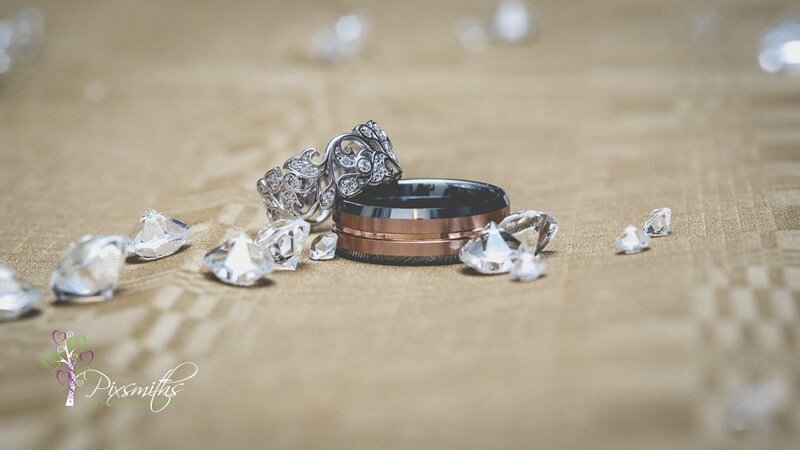 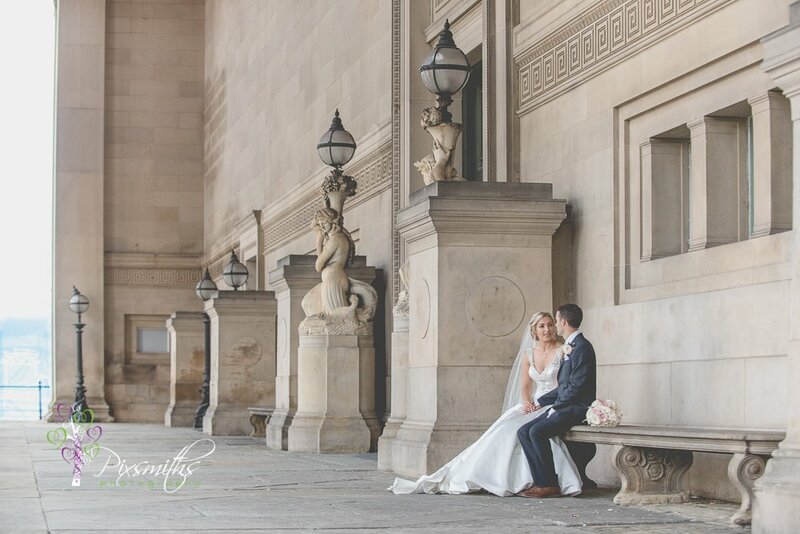 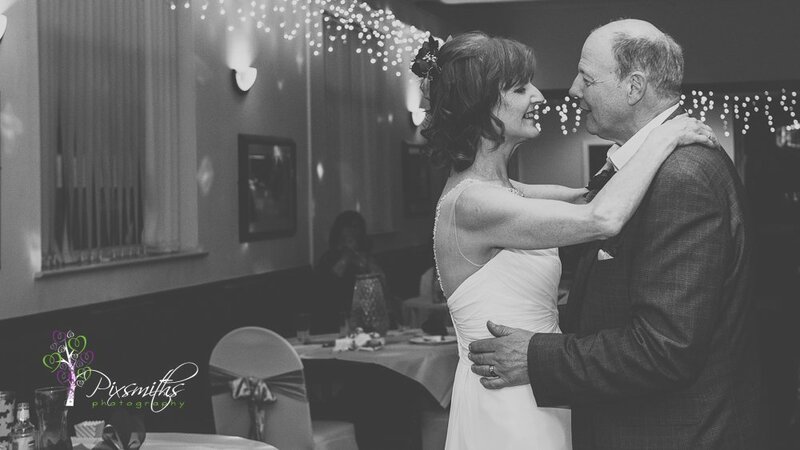 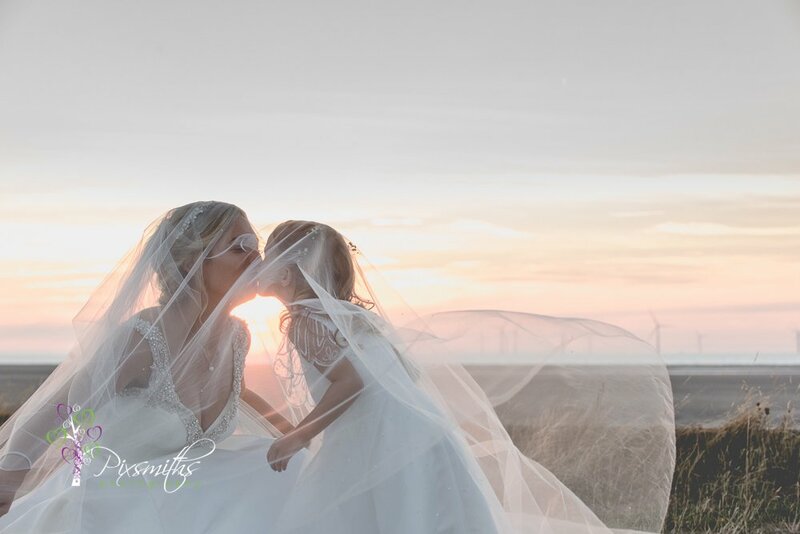 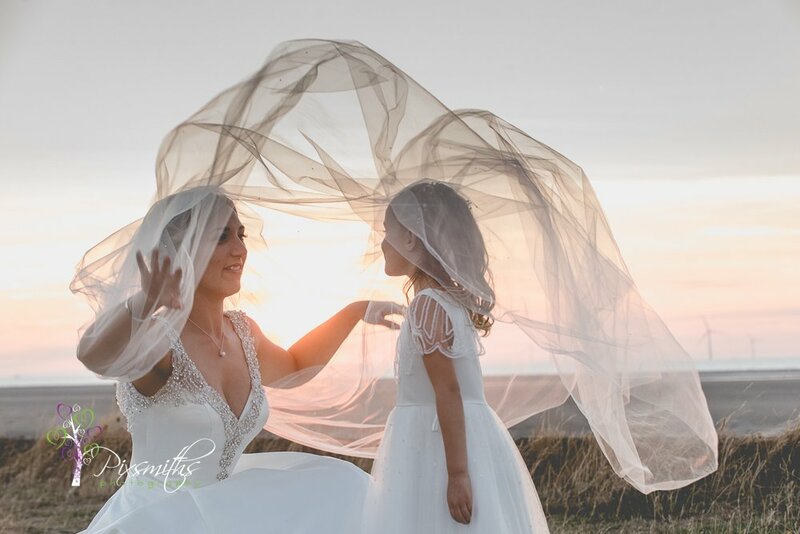 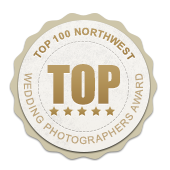 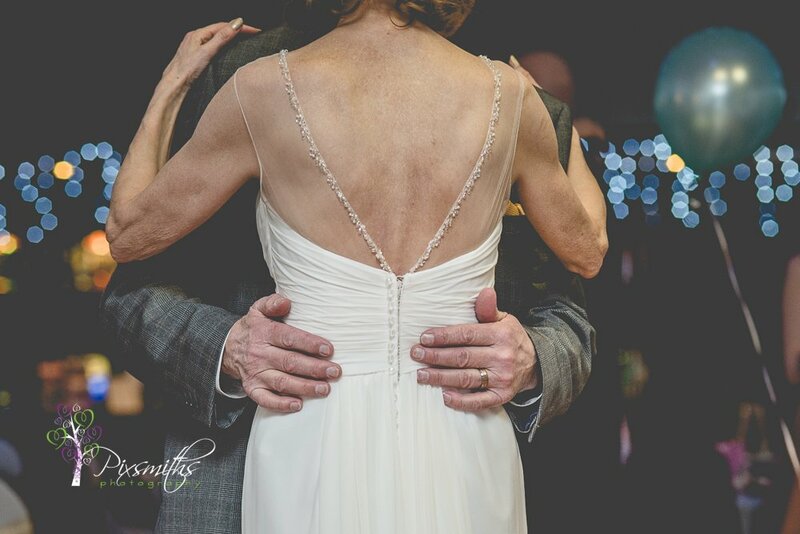 We are so privileged to share and capture your day. 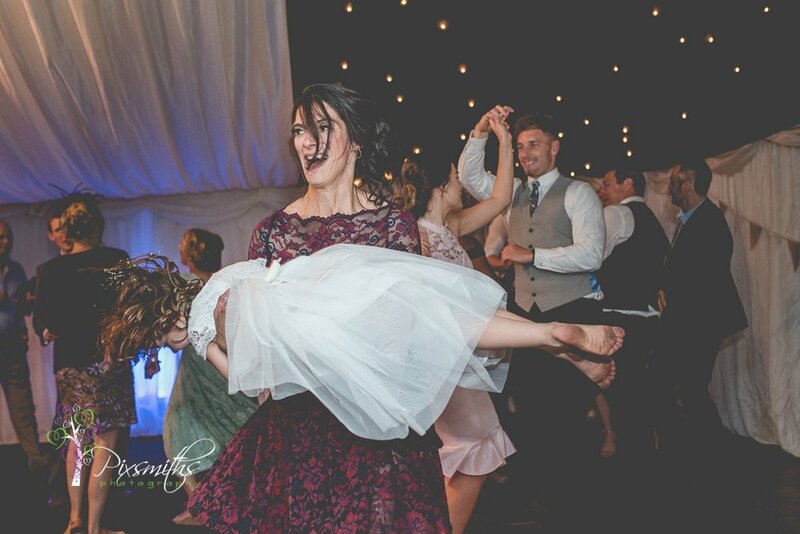 This is it, this is the moment! 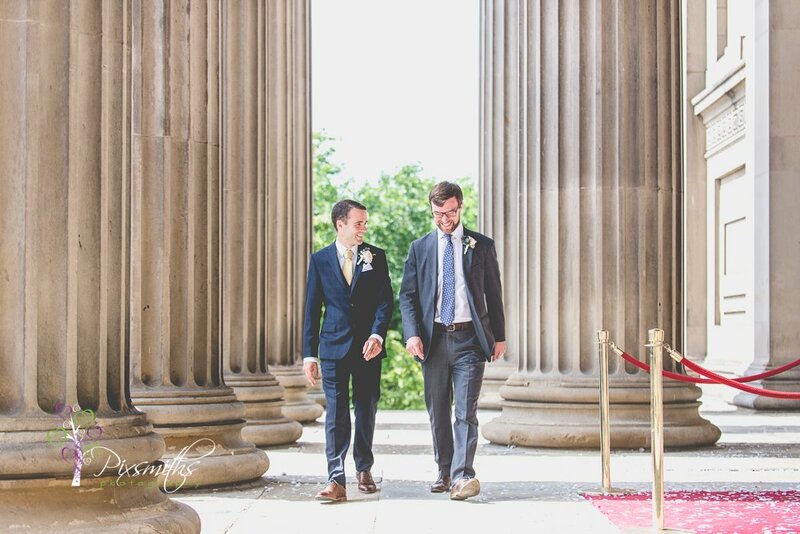 time to get married! 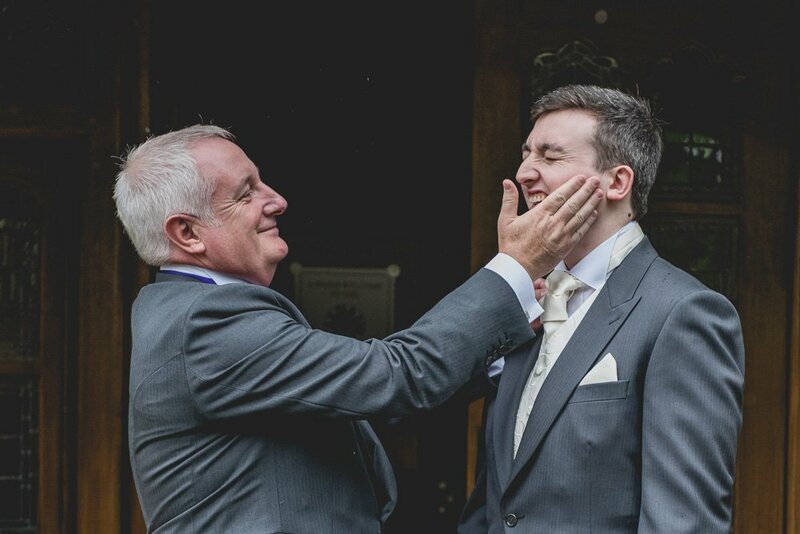 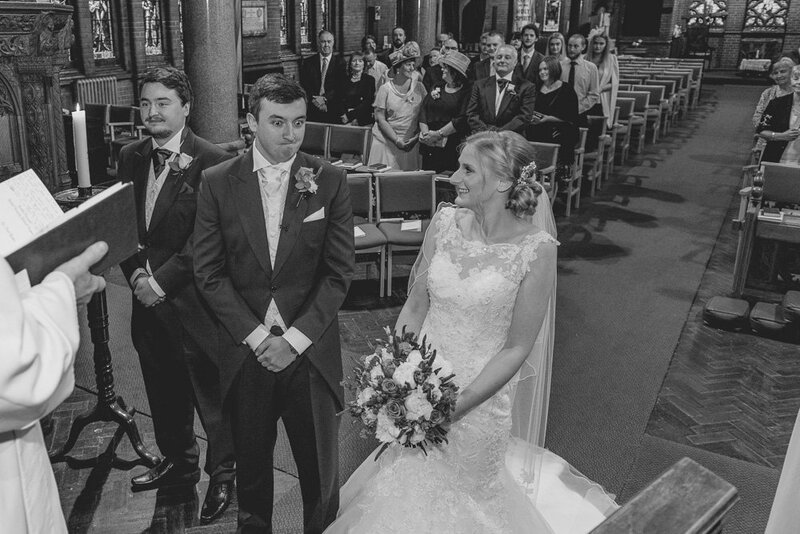 ah a little moisture in his eye as Sarah comes down the aisle! 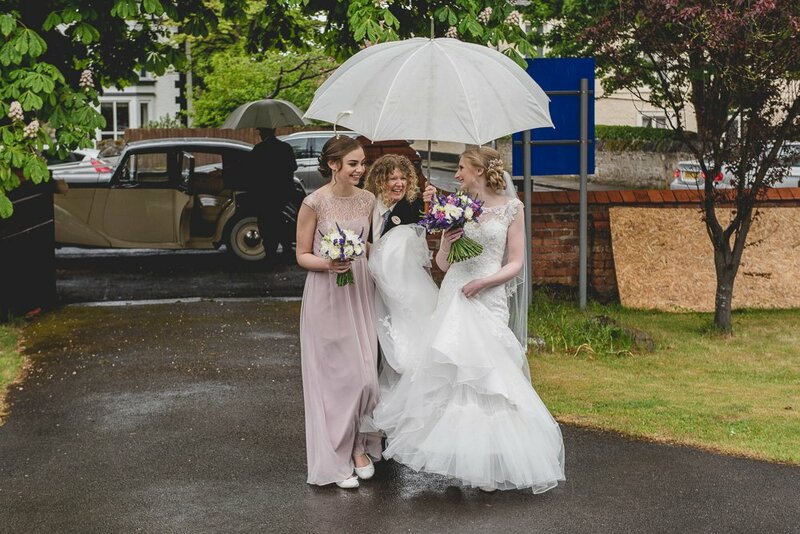 The day was dry but grey but Anne and Ken and their family and friends made this a colourful and joyful event. 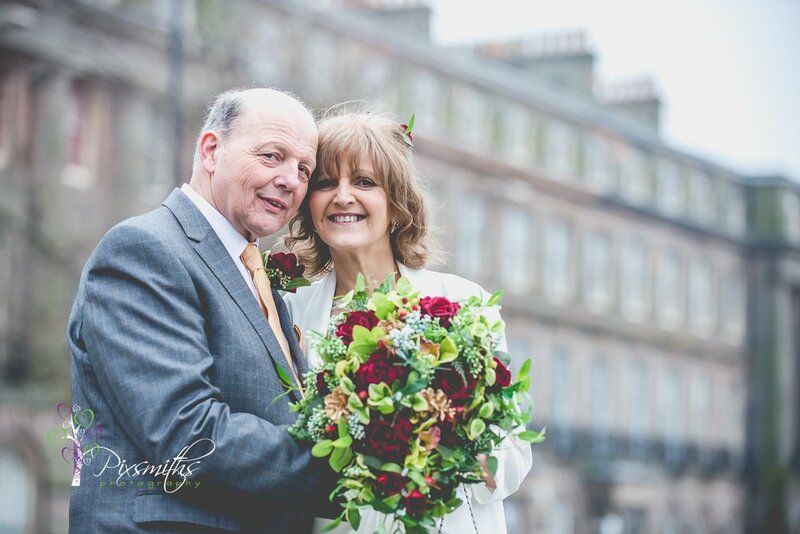 No snow as such …even if there was Anne and Ken would soon melt it – sizzling! 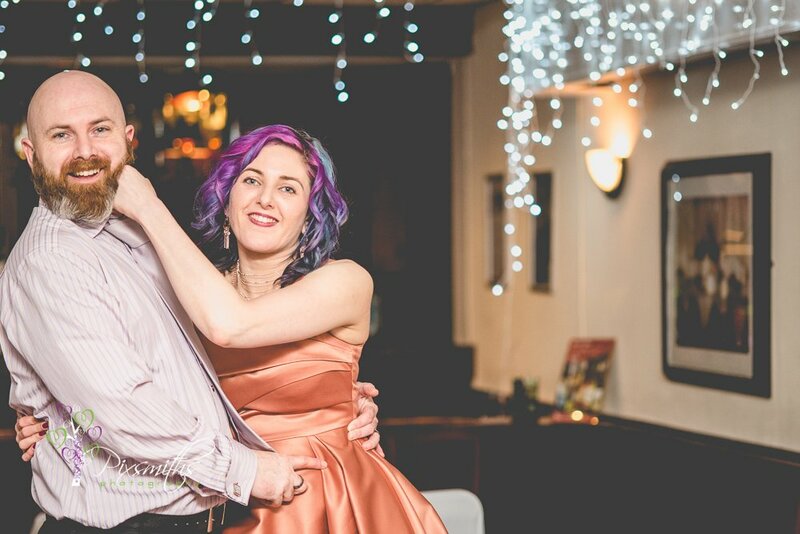 Originally planned just before Christmas Anne and Ken were so disappointed to have to cancel that date but this time it was systems go! 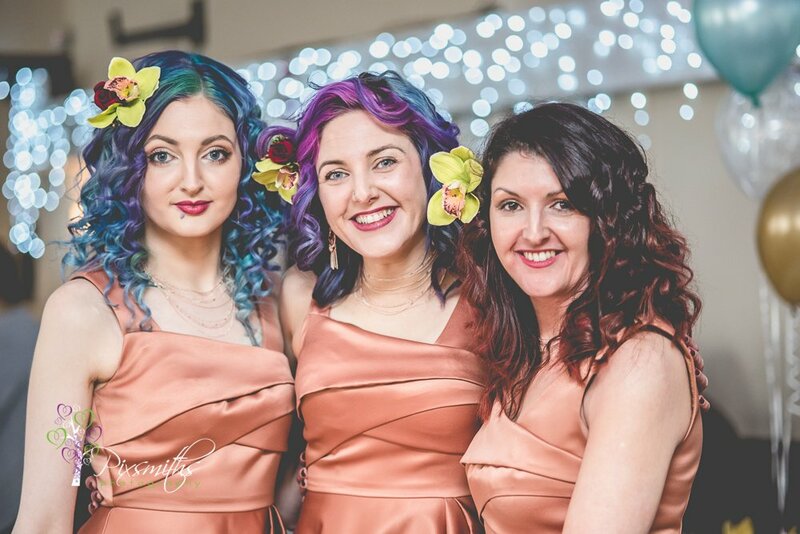 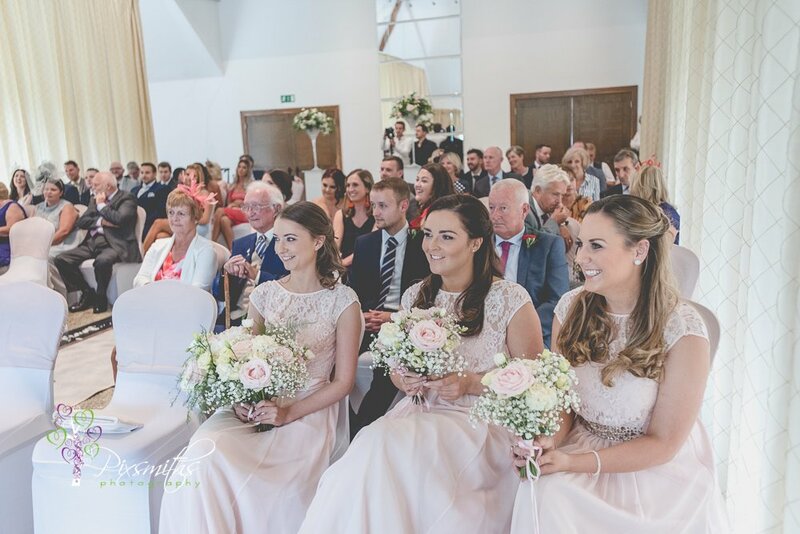 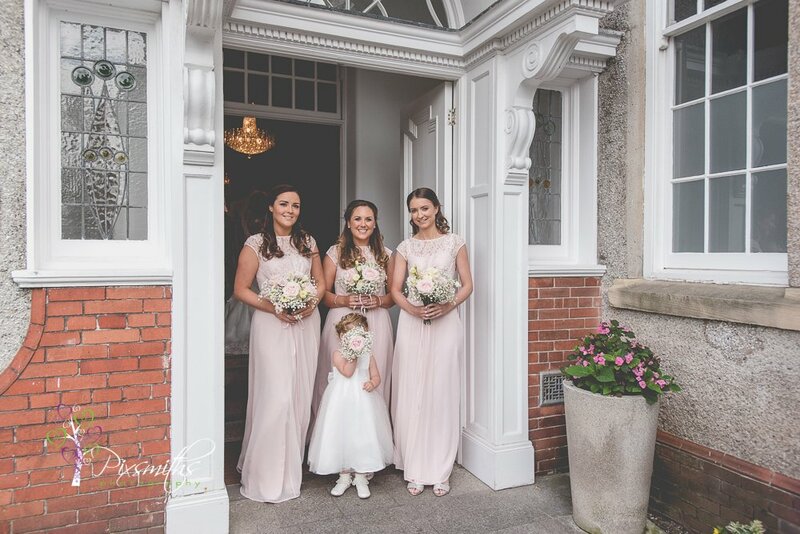 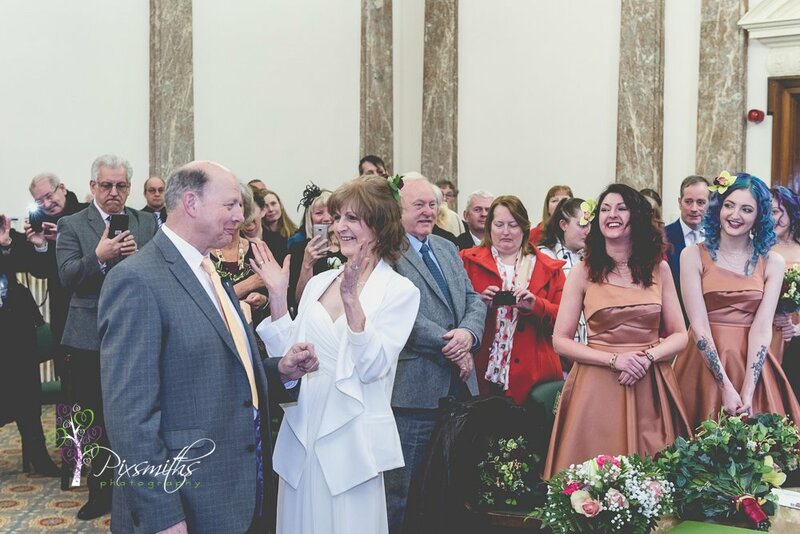 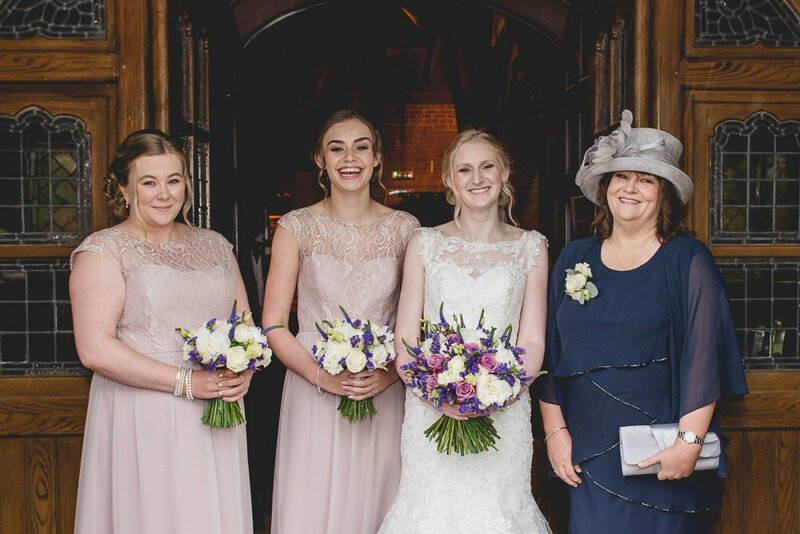 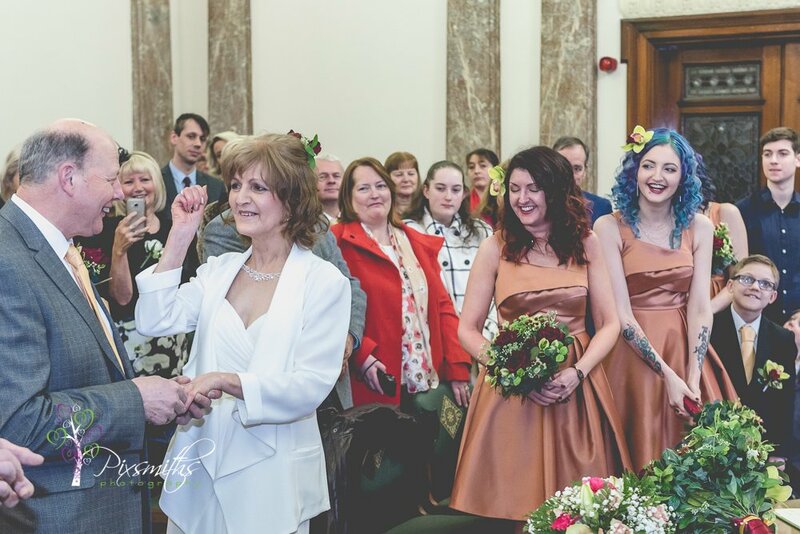 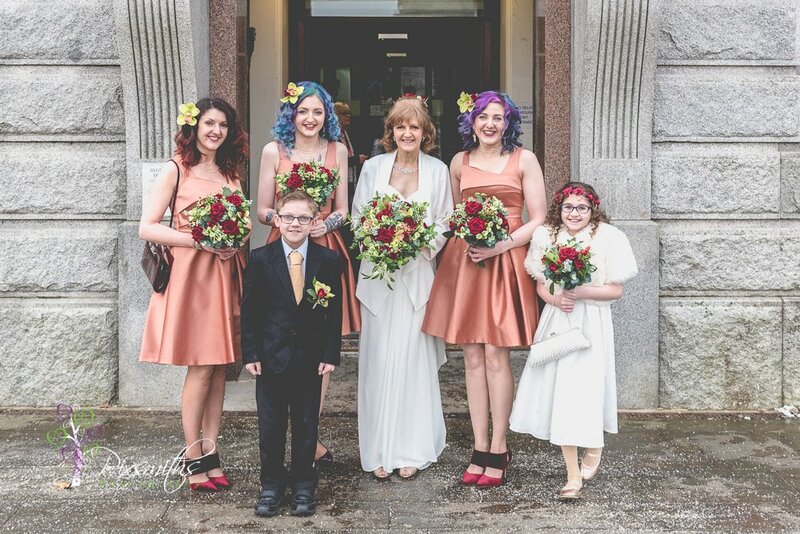 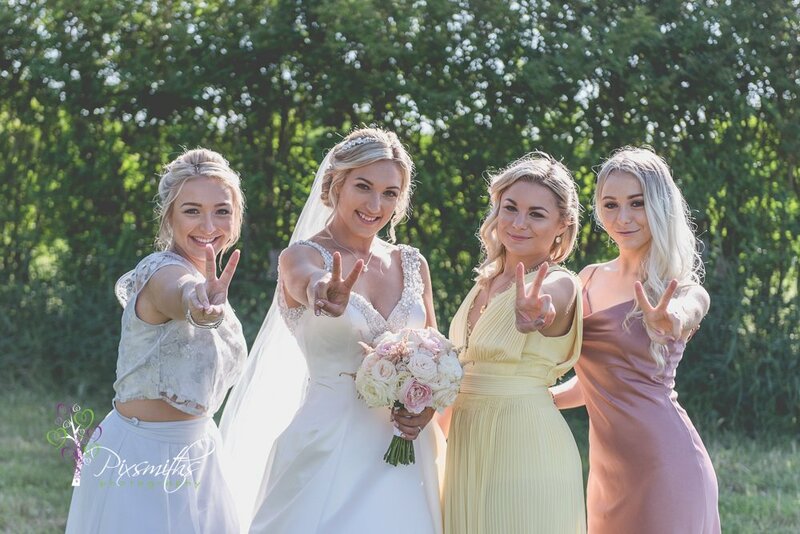 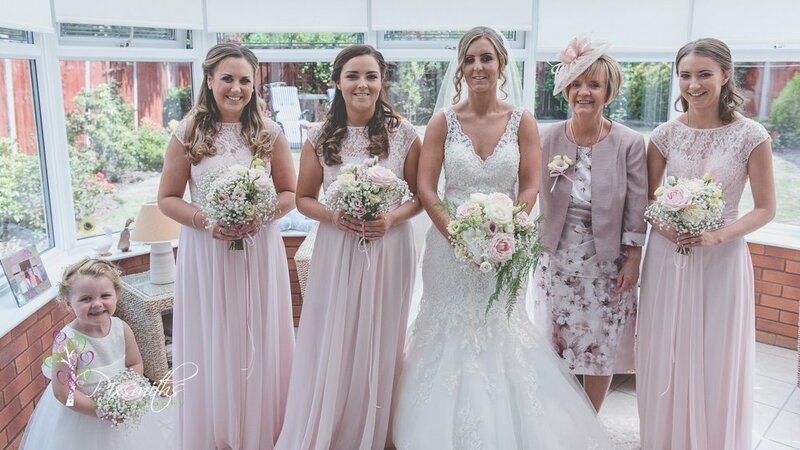 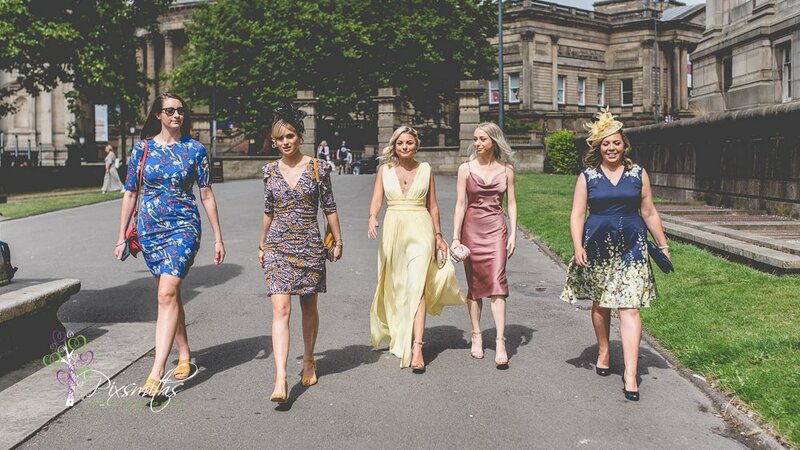 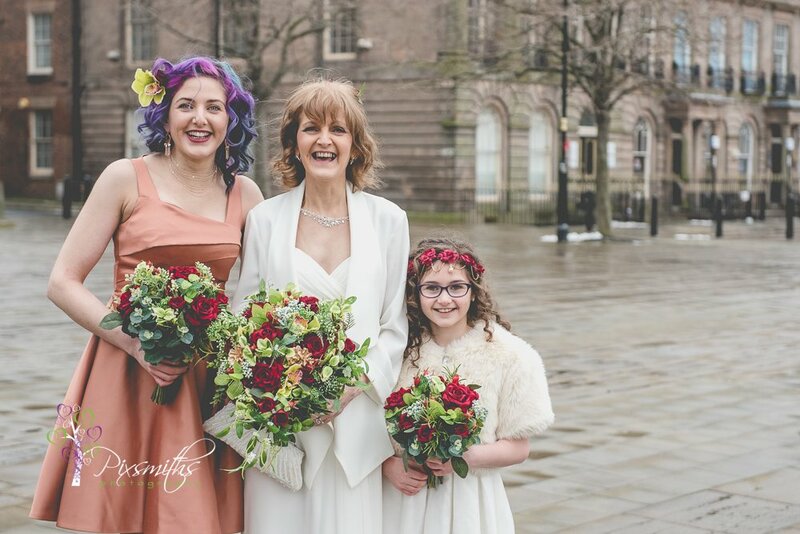 Anne’s daughters made gorgeous bridesmaids and so colourful in their apricot coloured dresses. 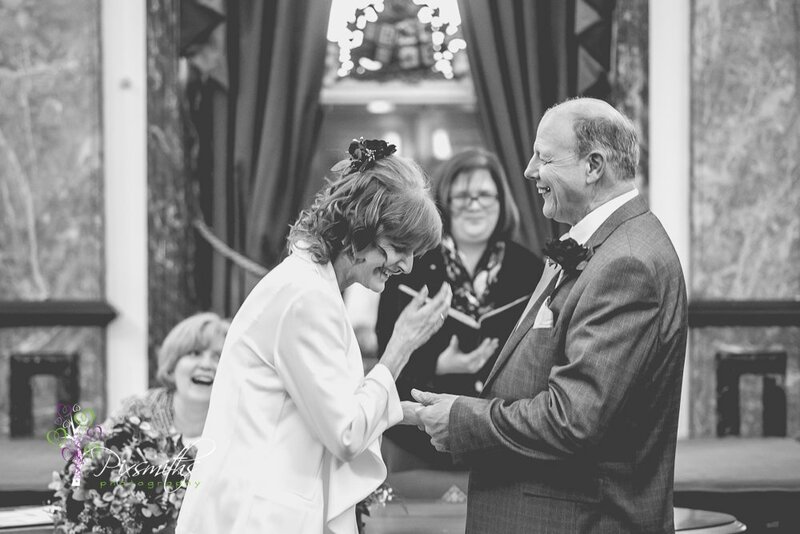 Such an endearing wedding, so romantic to see this couple so happy, dare I say like love-struck teenagers. 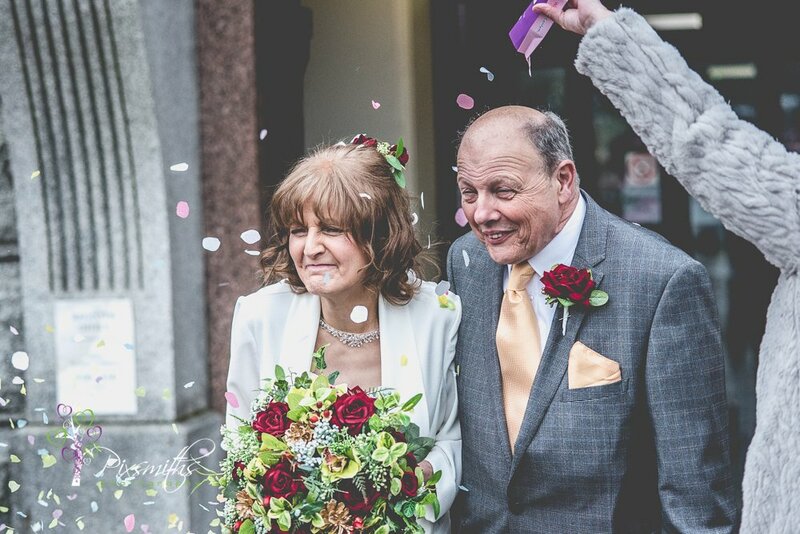 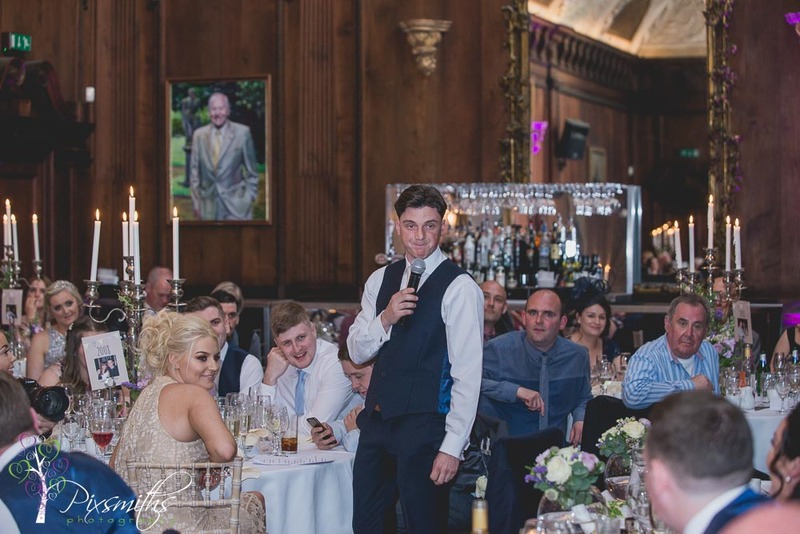 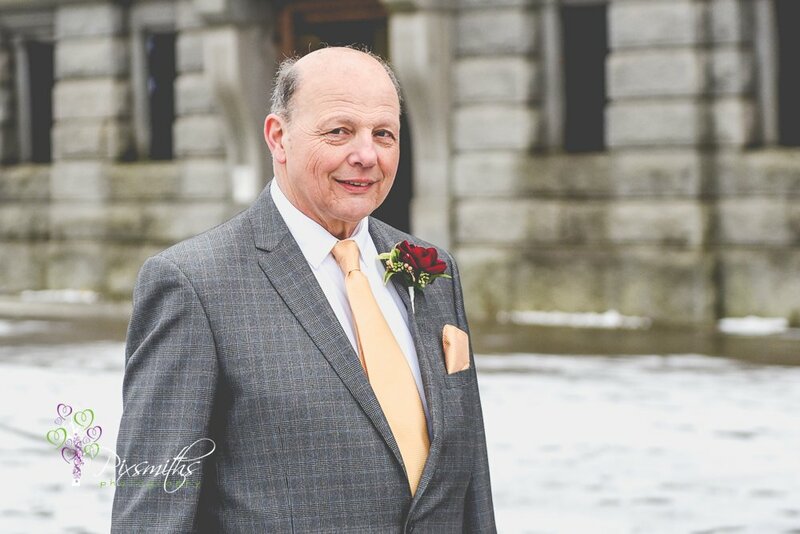 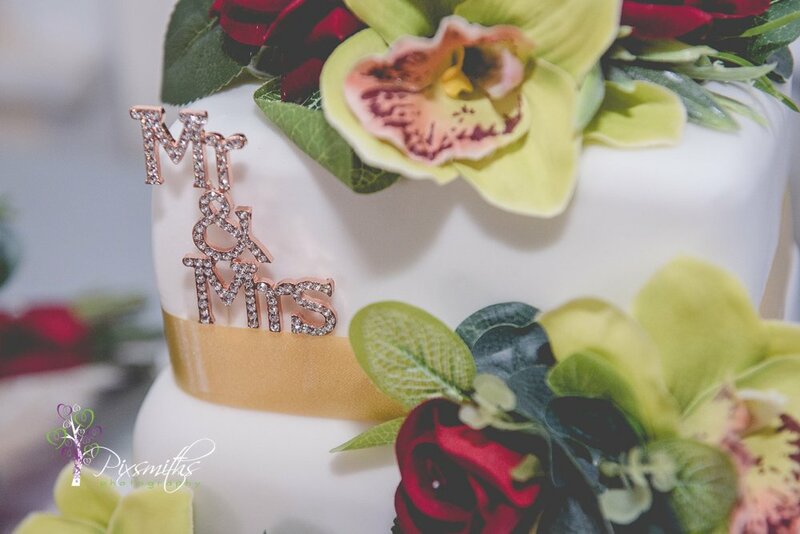 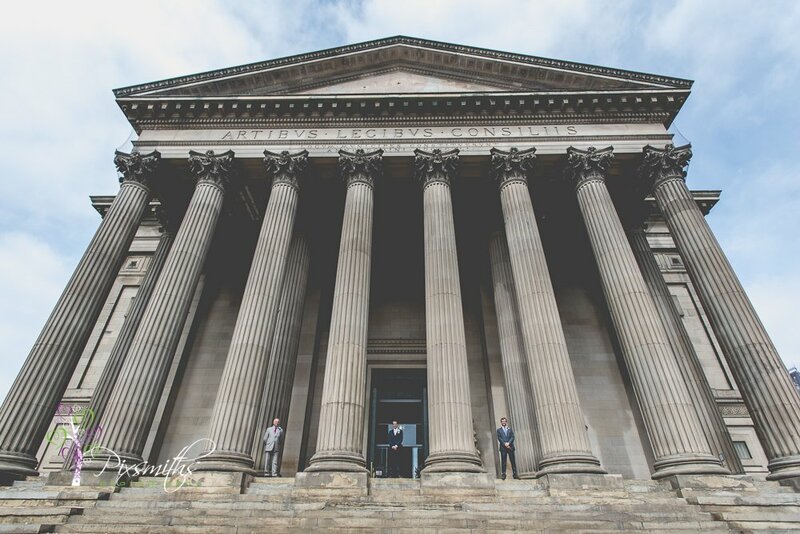 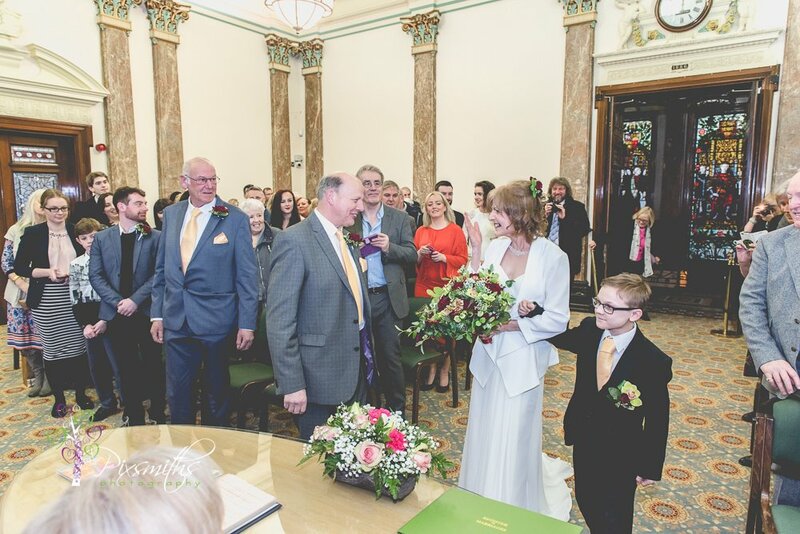 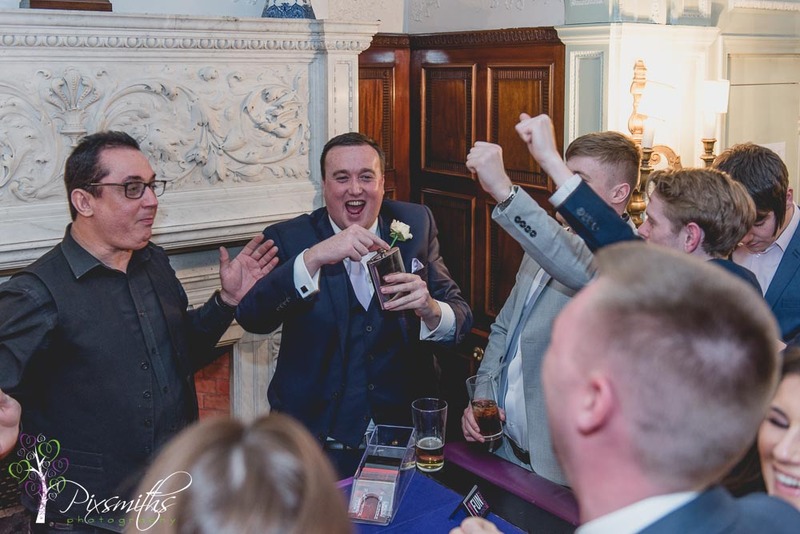 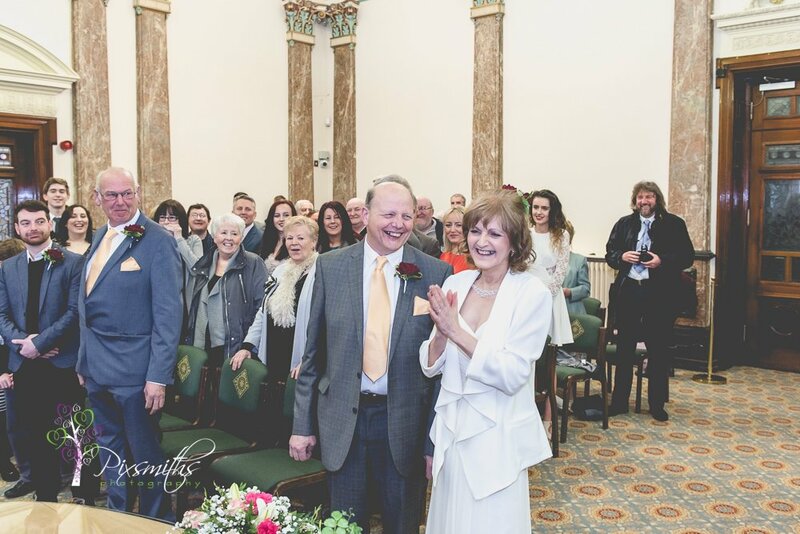 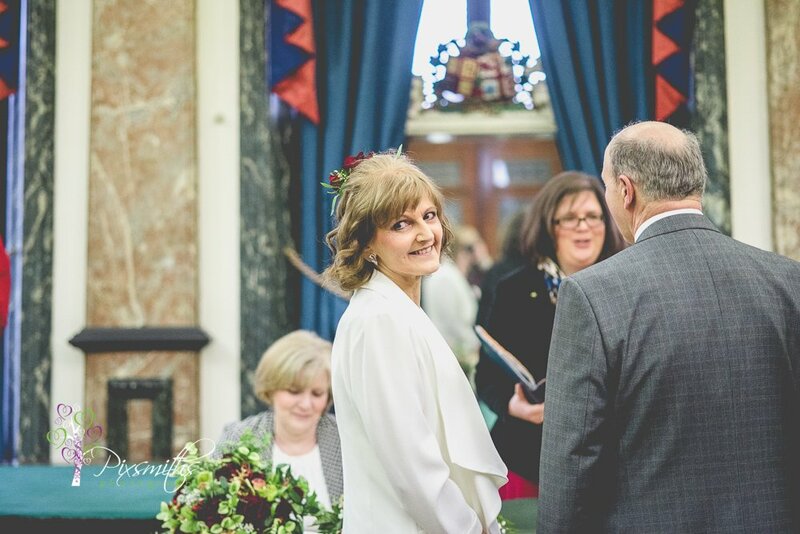 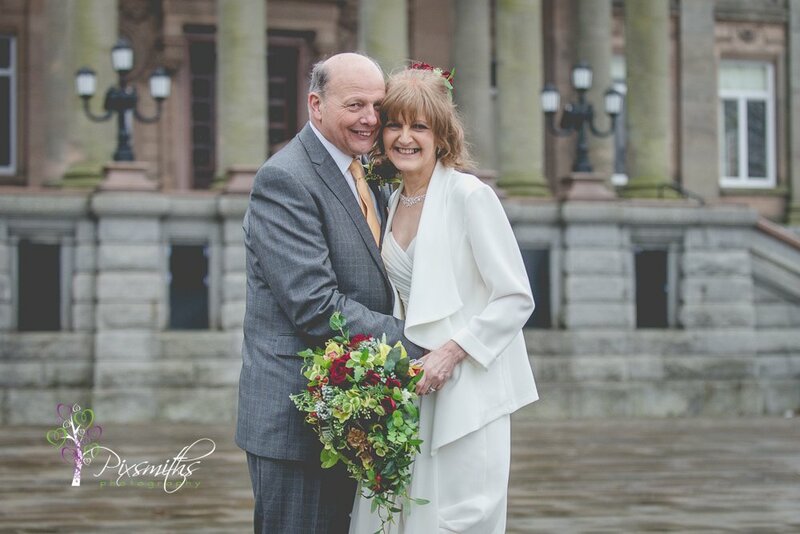 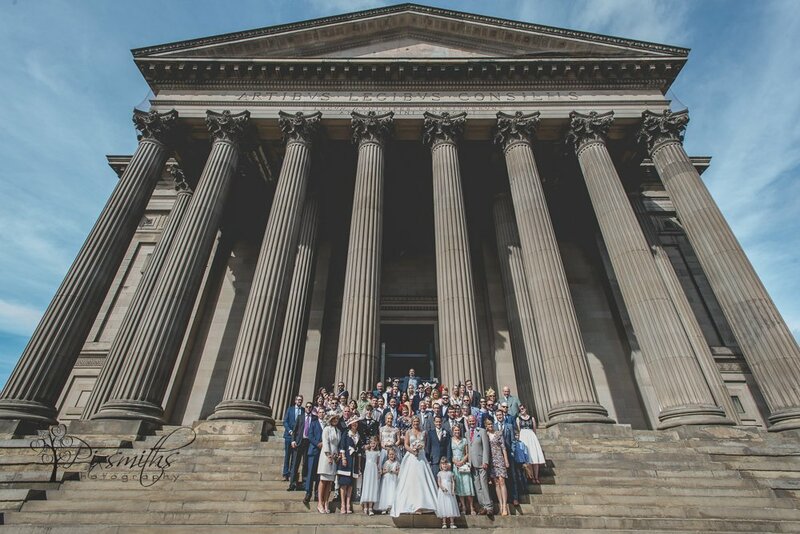 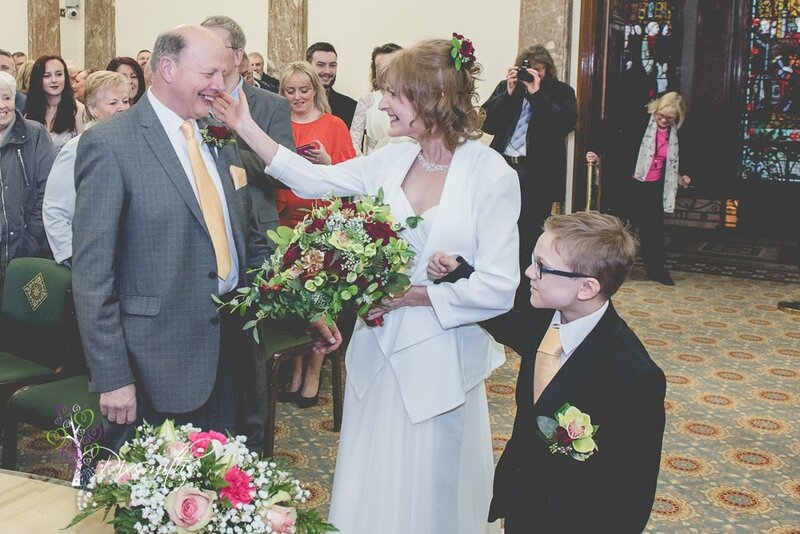 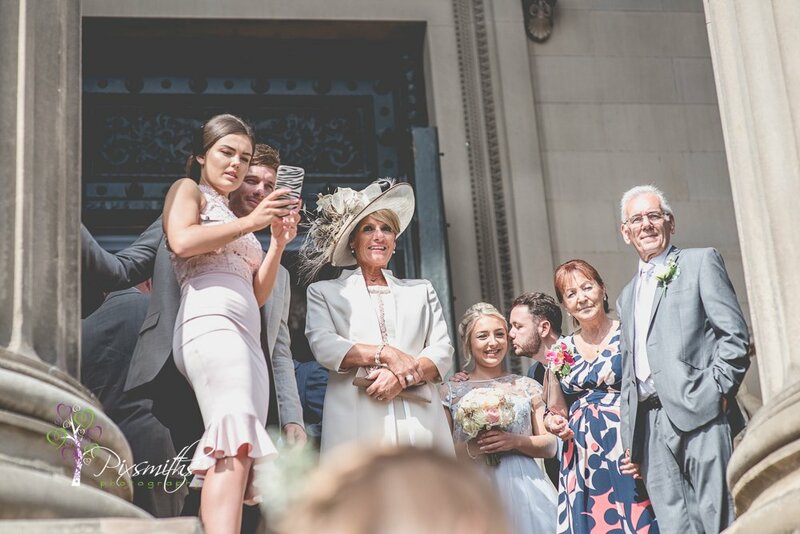 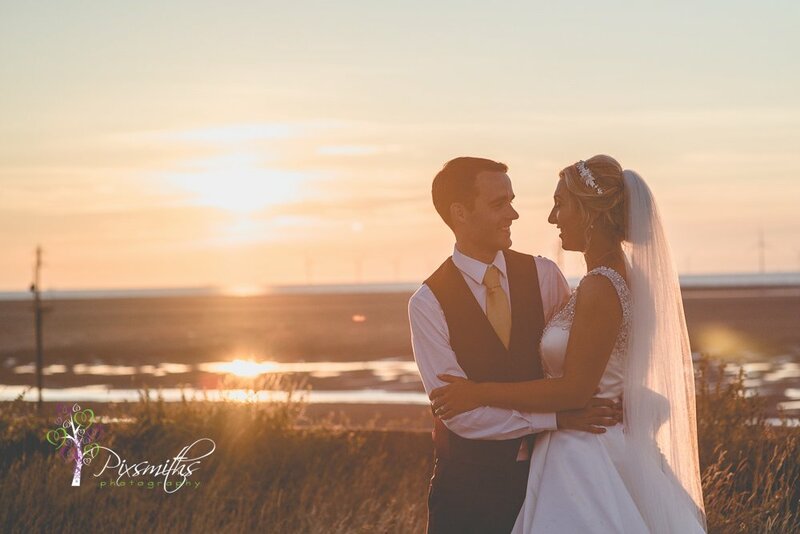 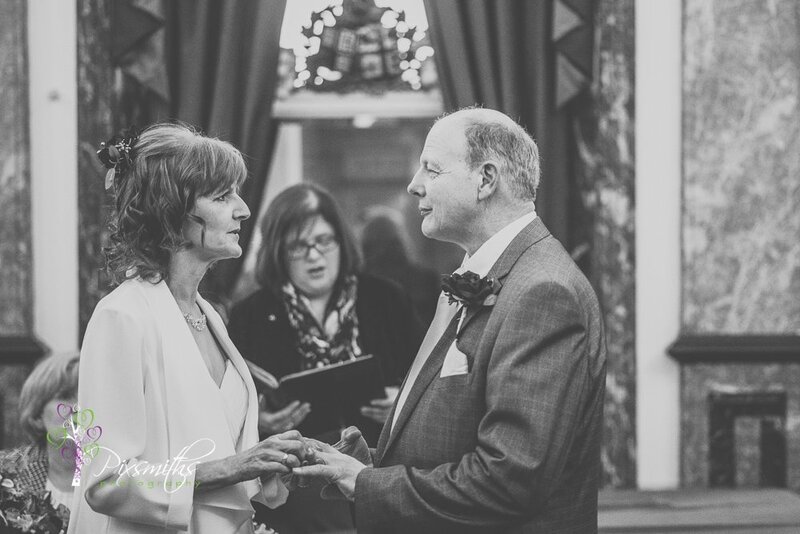 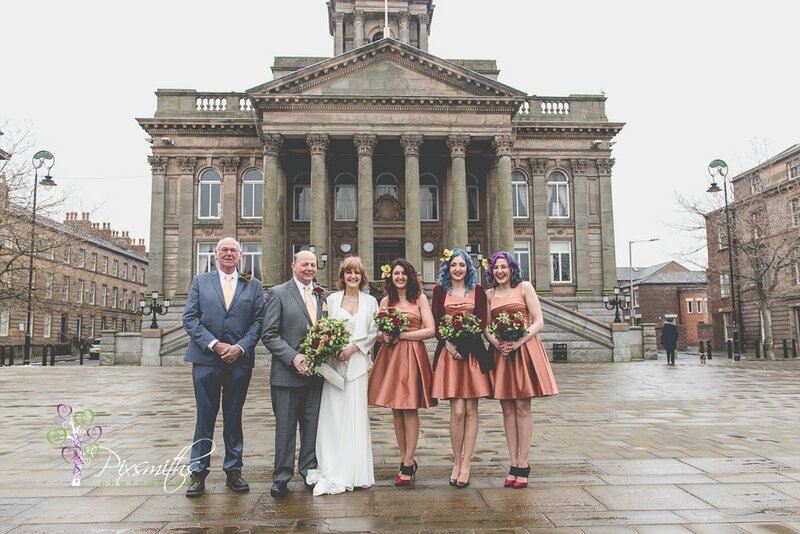 Mike Jones & his close up, mind blowing magic; Joro with delicious vegan catering & Angie from St Joseph’s venue in Wallasey who made sure everything was just right for Anne and ken on their arrival. 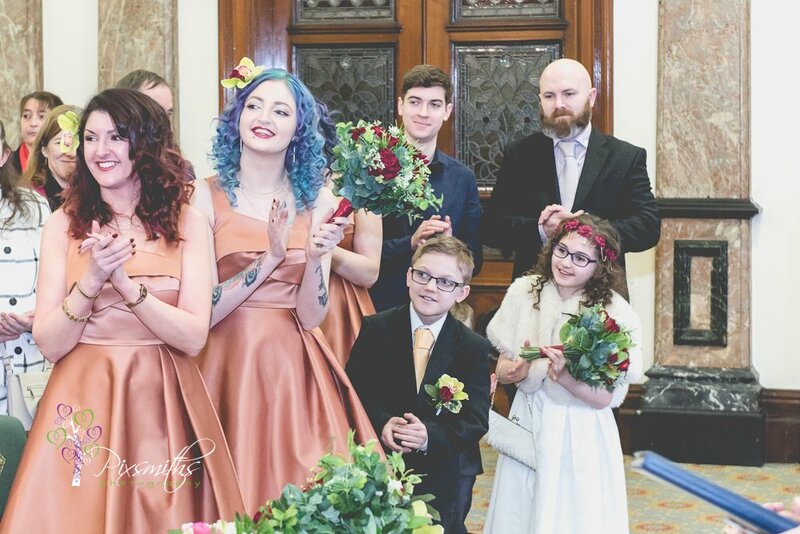 This was such a joyful wedding of two beautiful people who deserve every happiness. 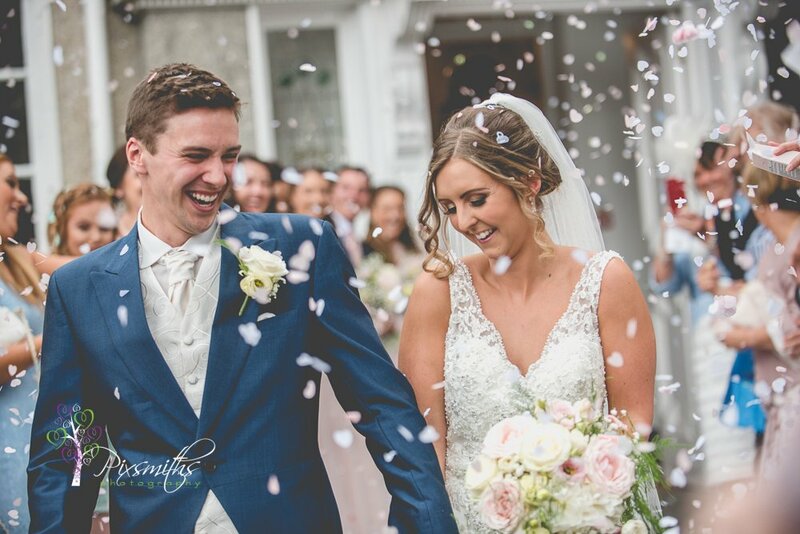 Don’t think they stopped smiling all day long! 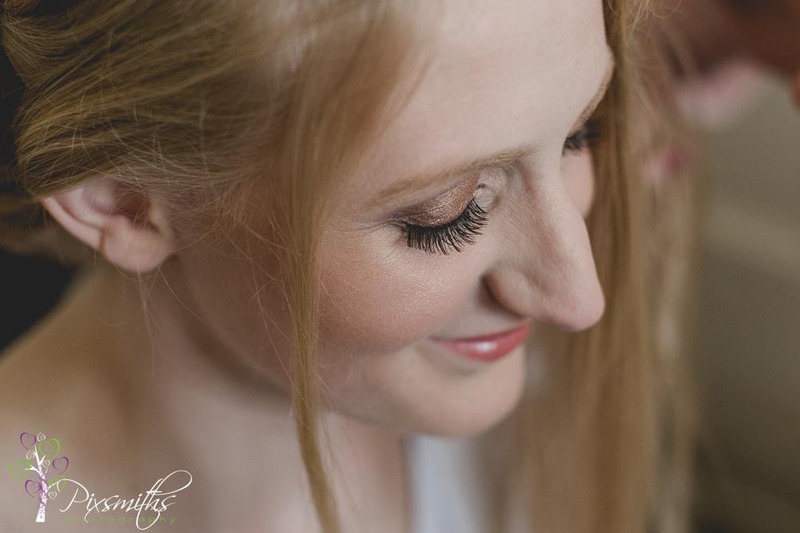 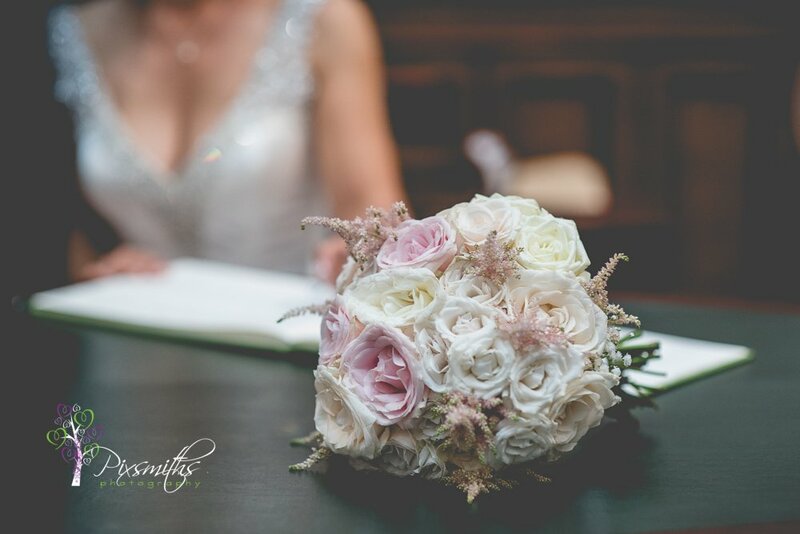 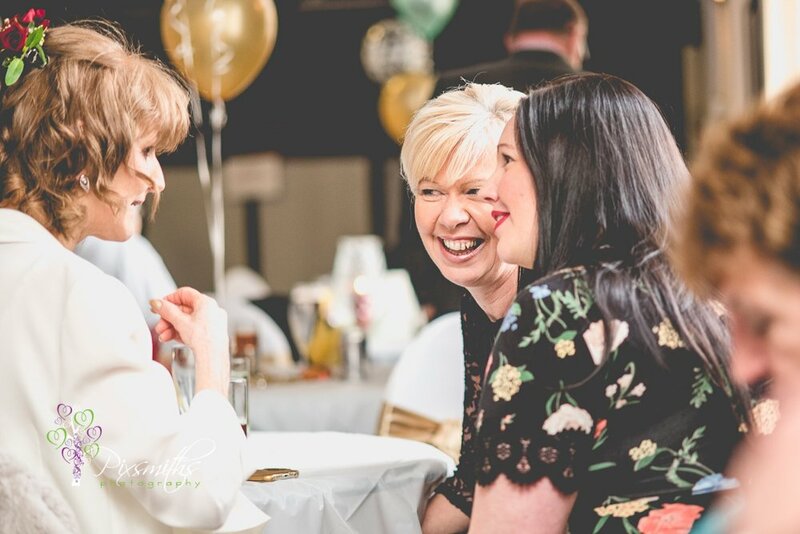 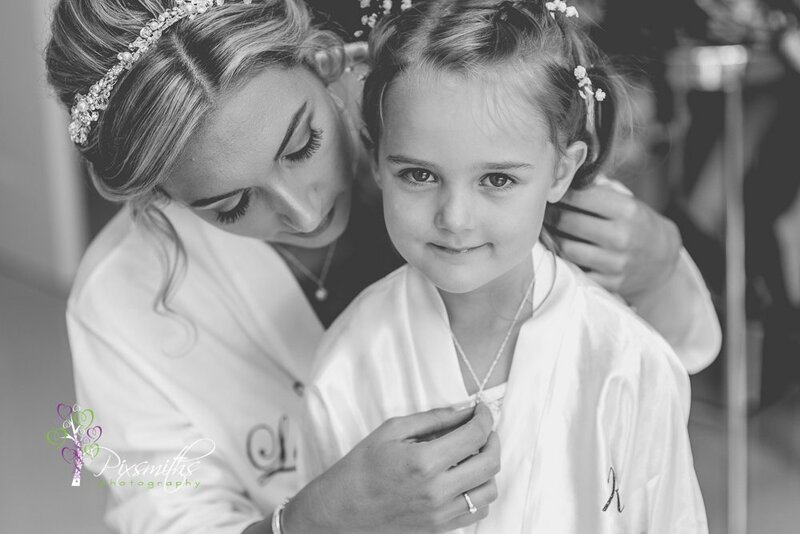 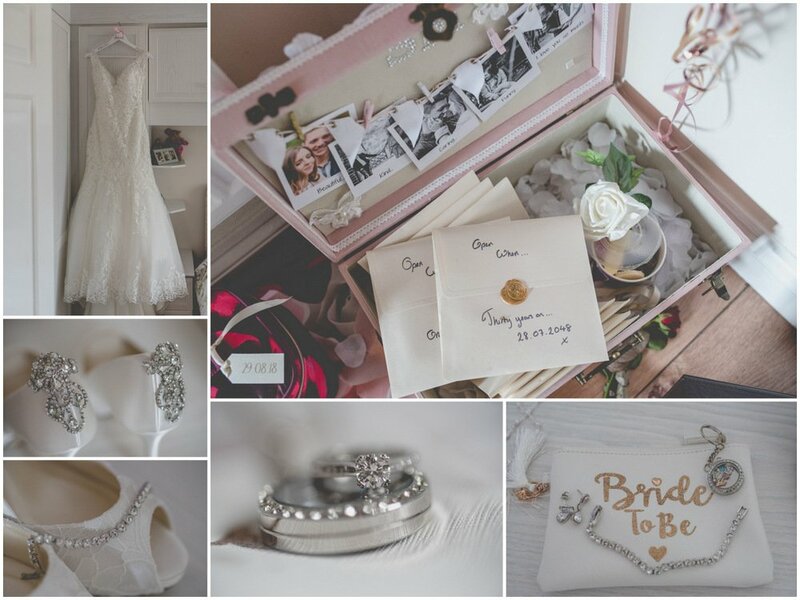 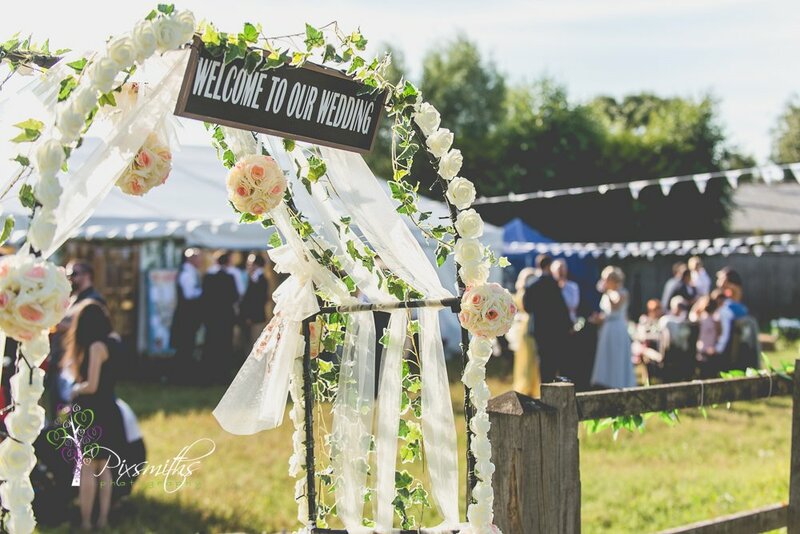 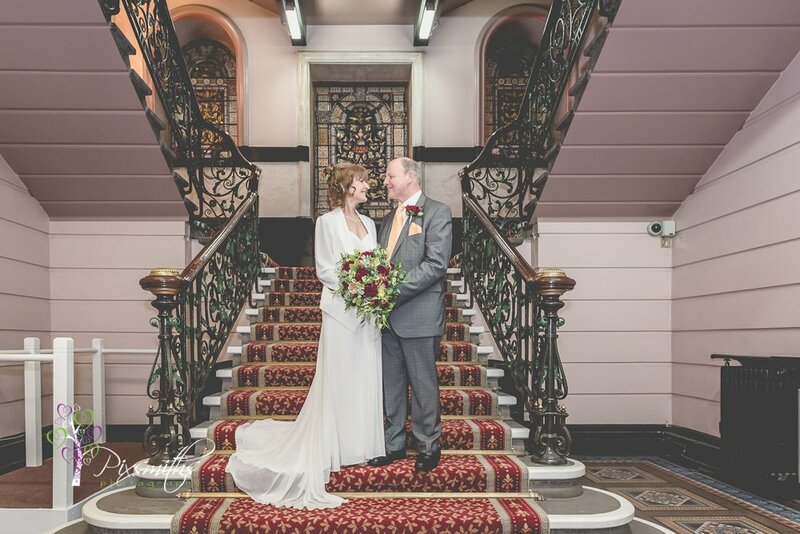 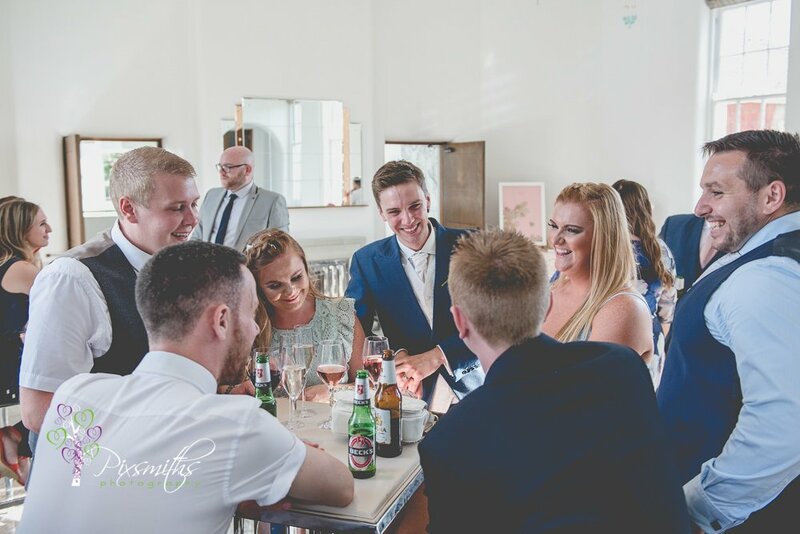 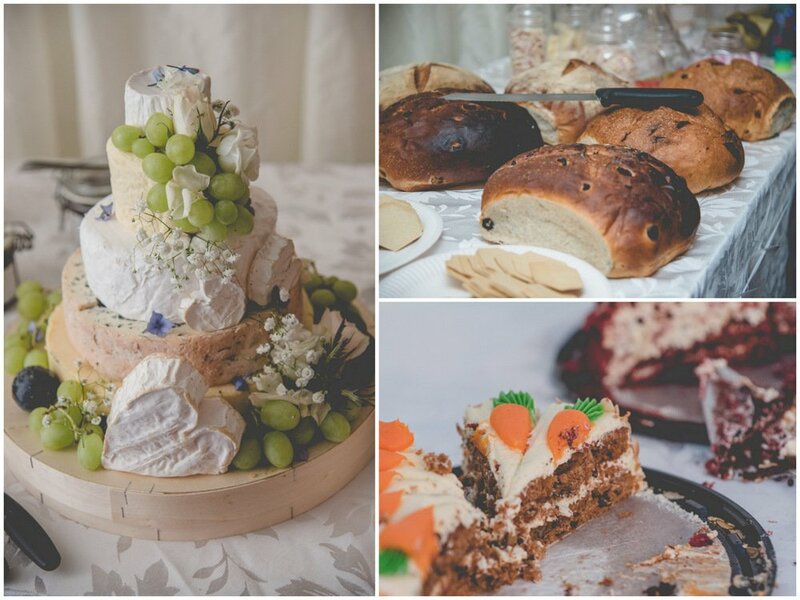 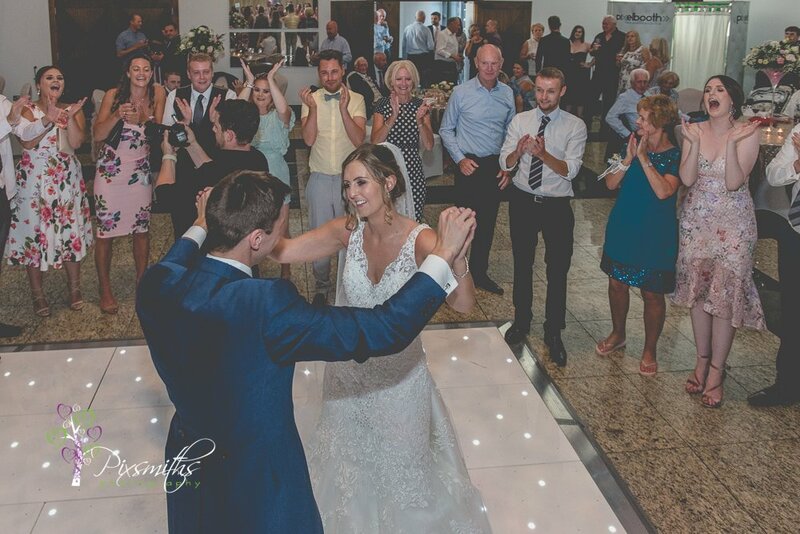 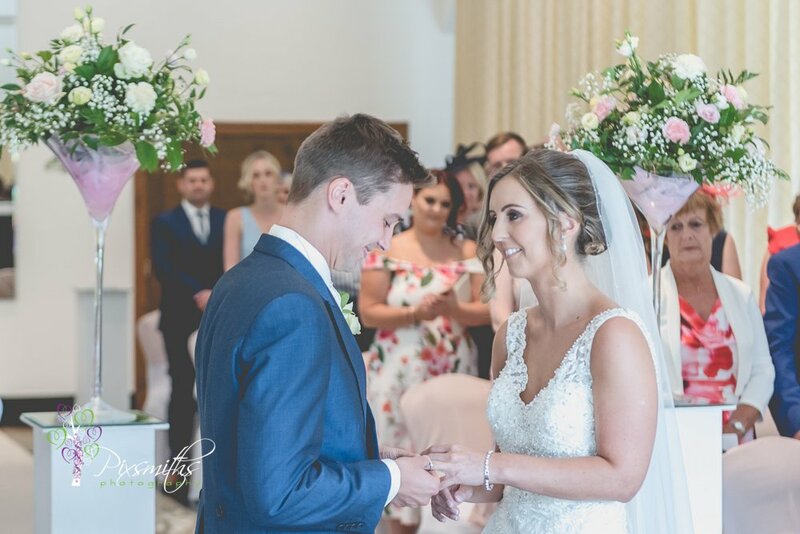 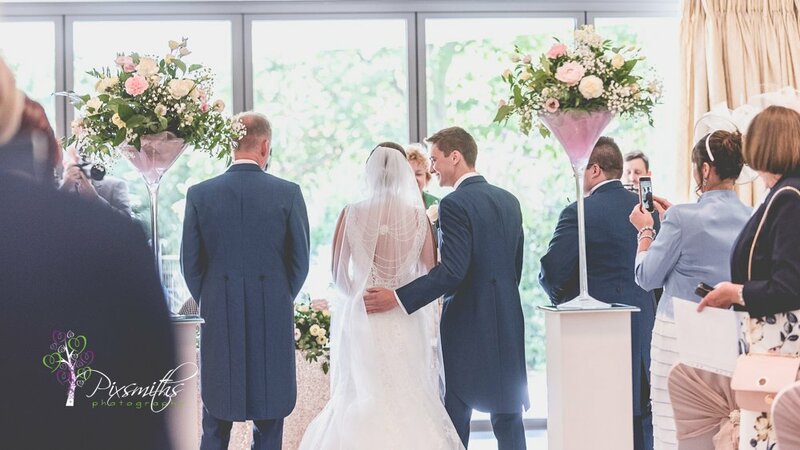 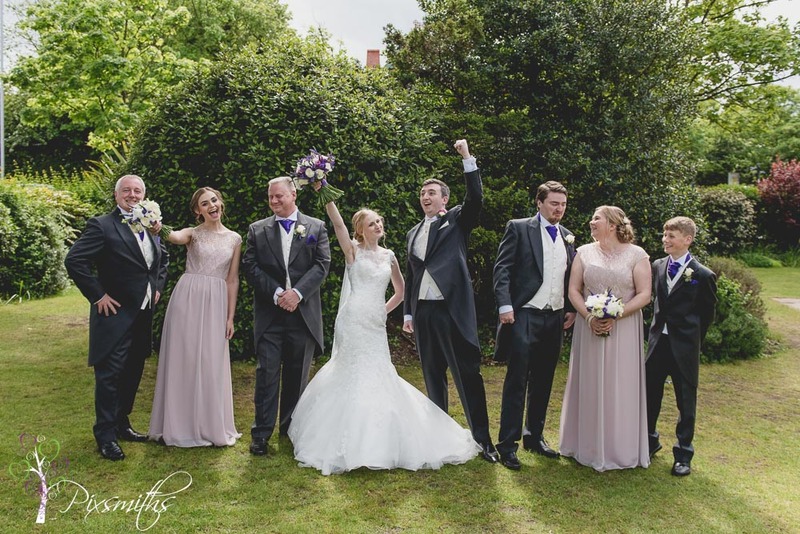 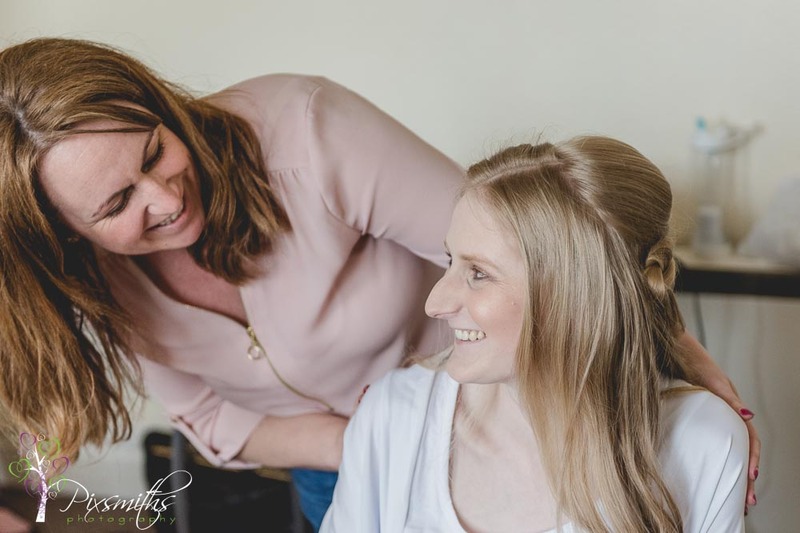 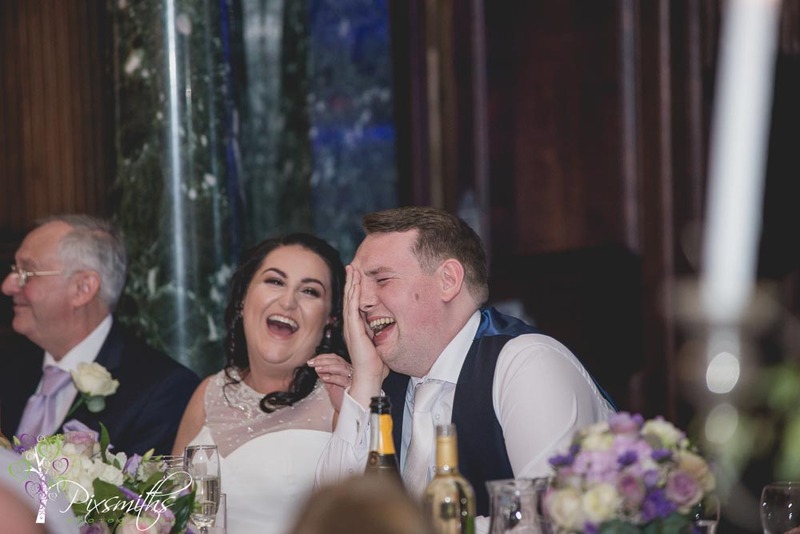 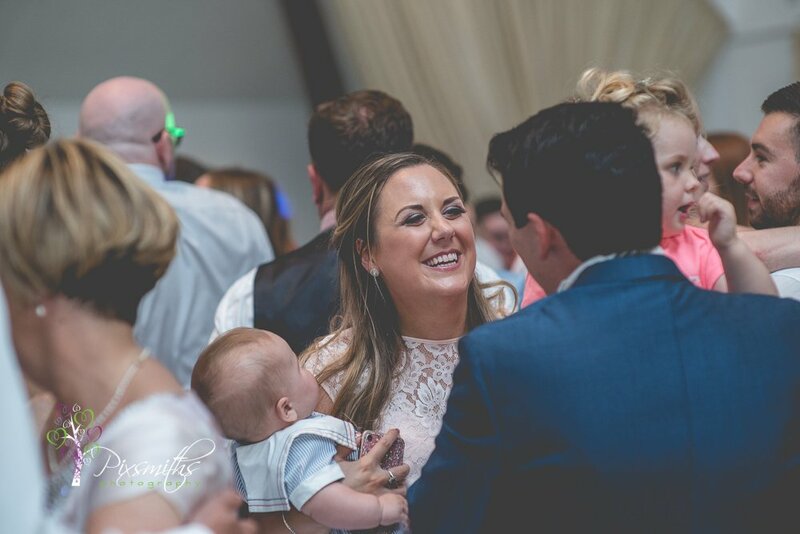 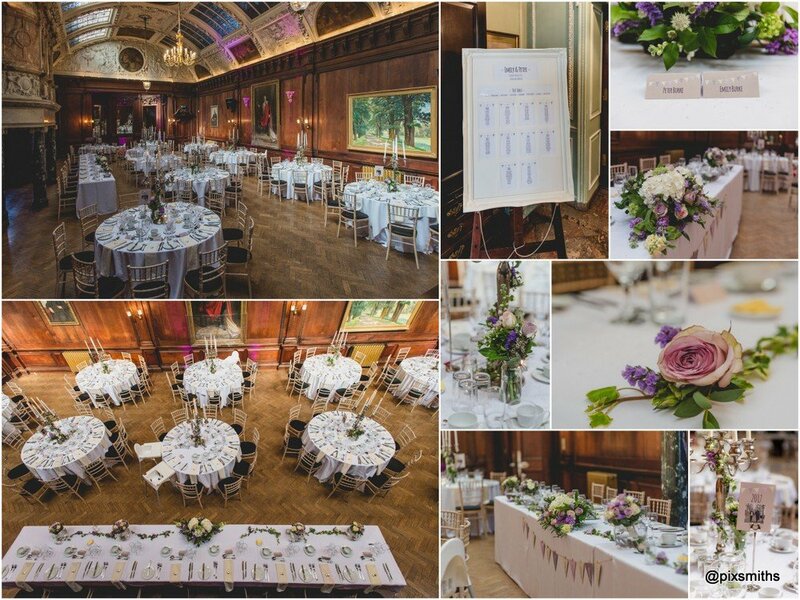 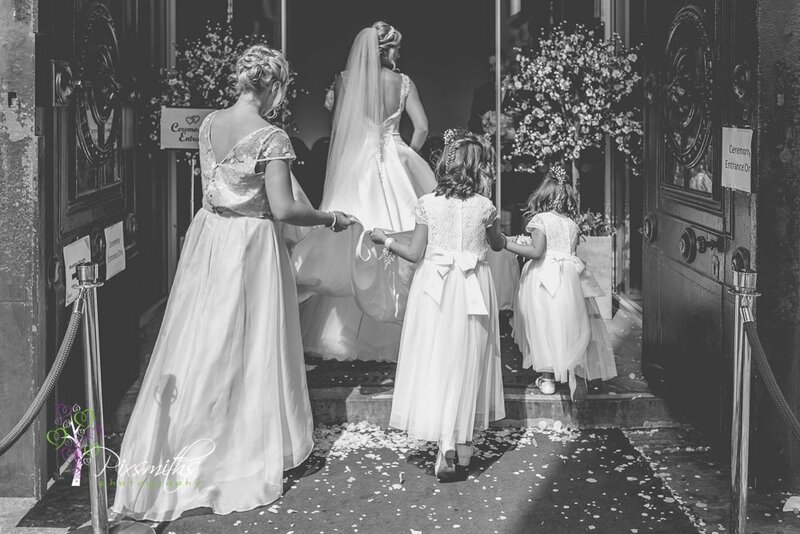 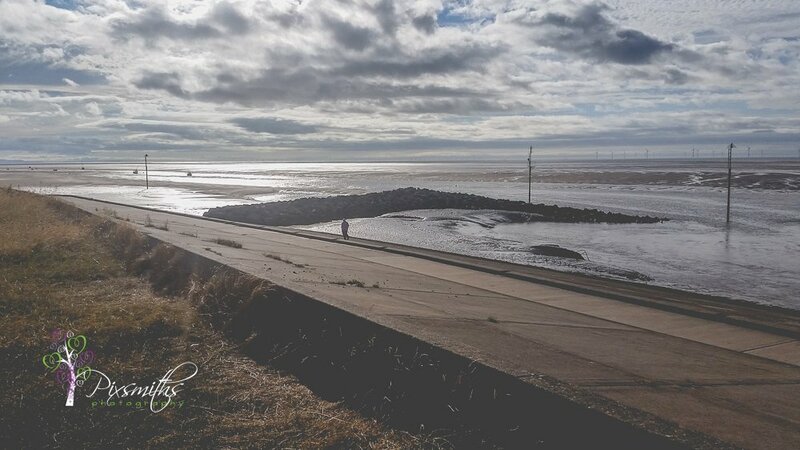 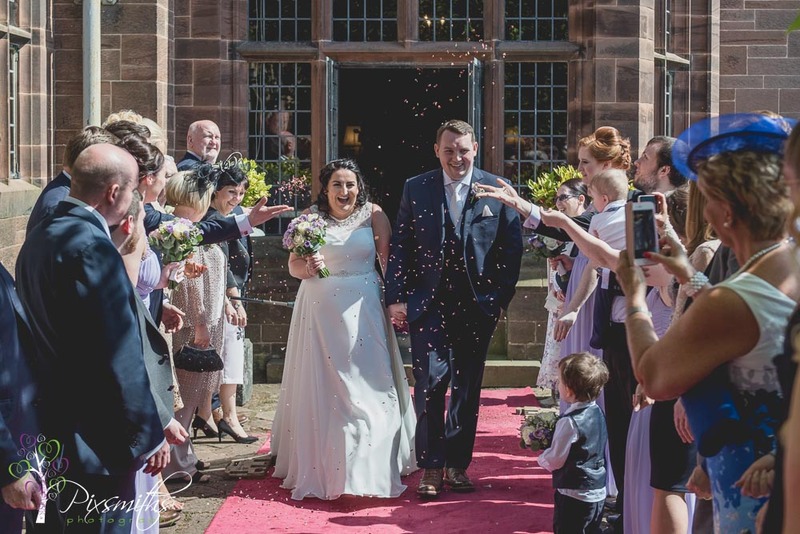 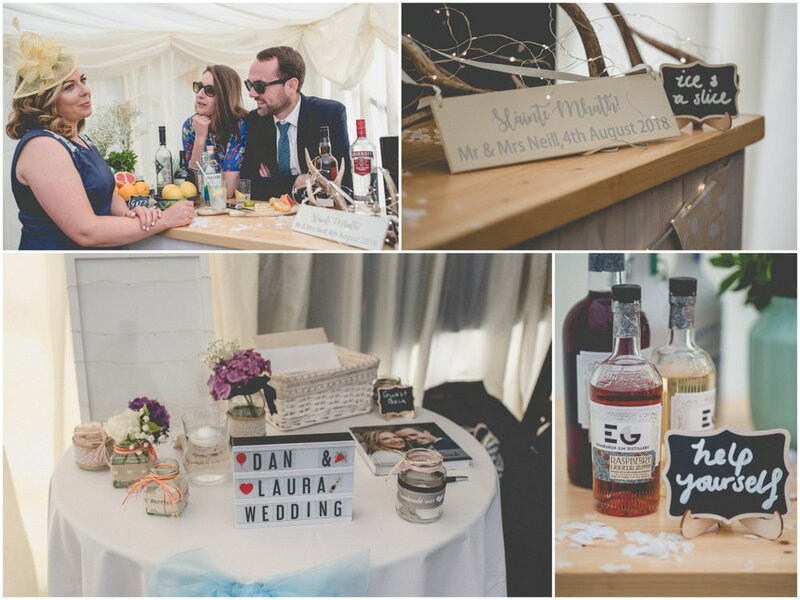 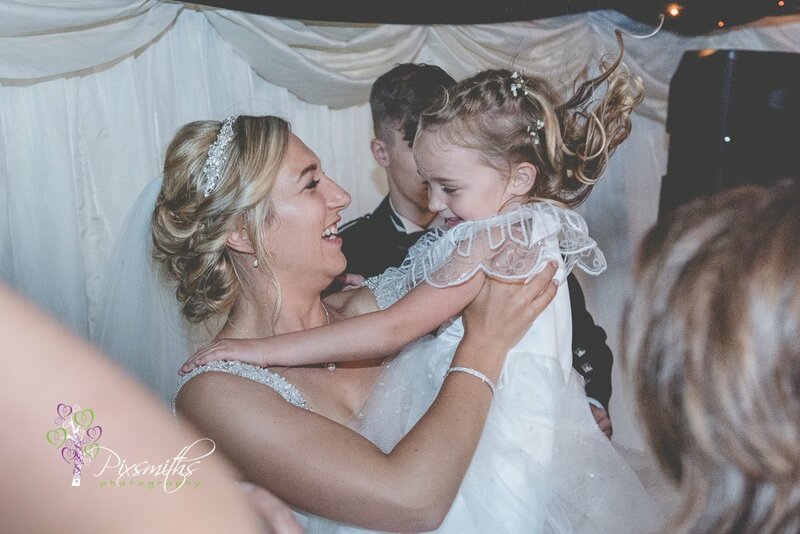 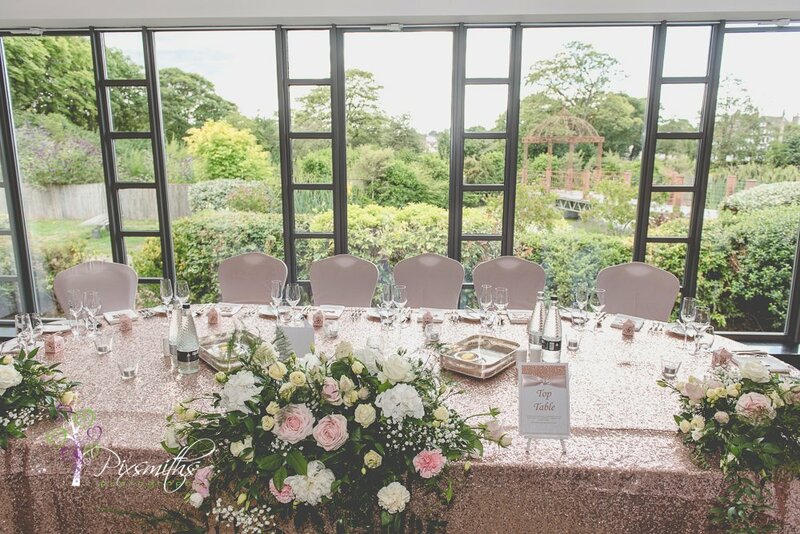 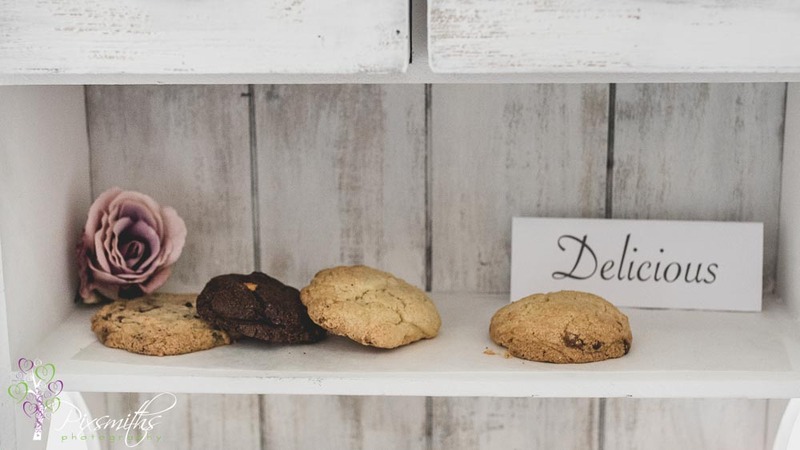 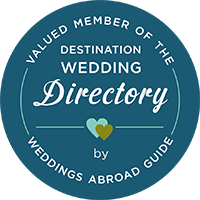 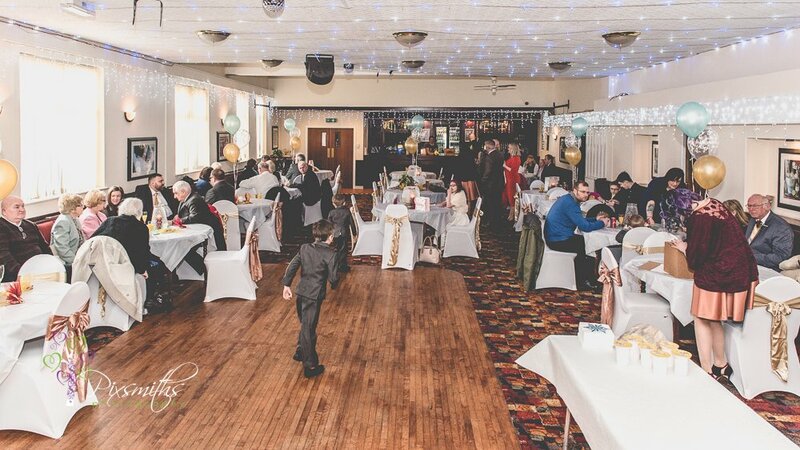 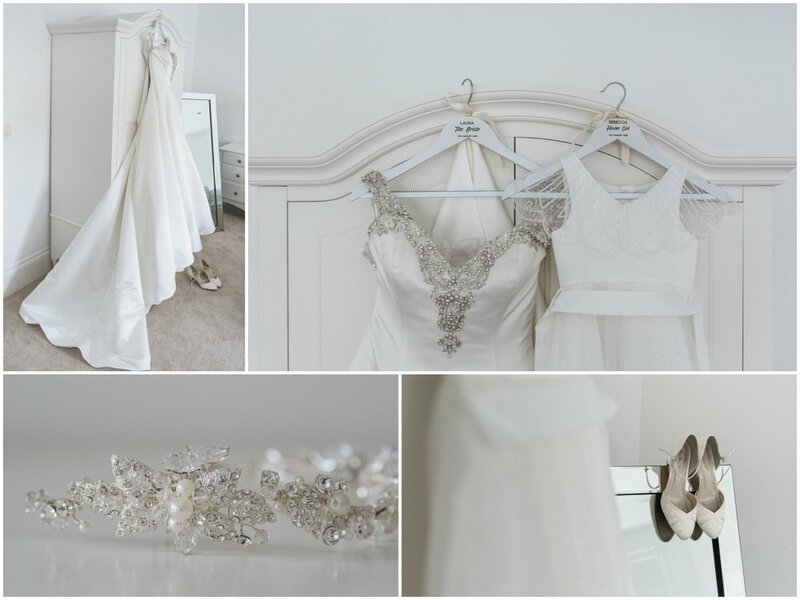 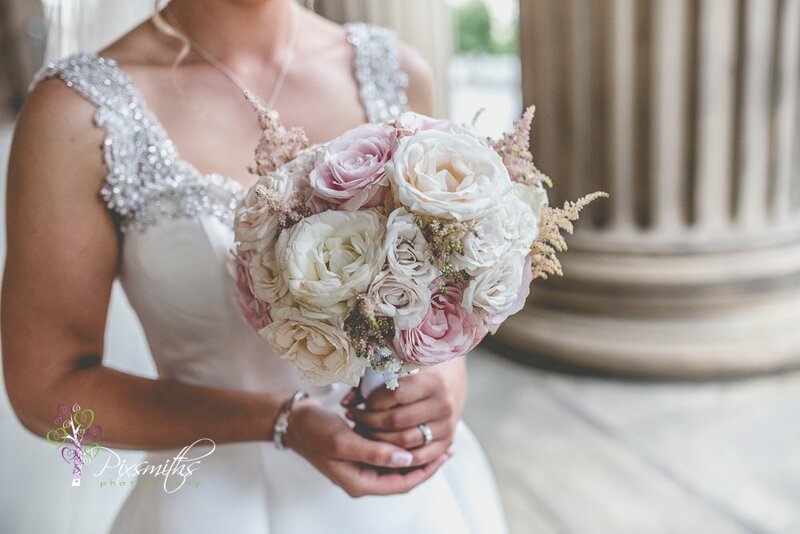 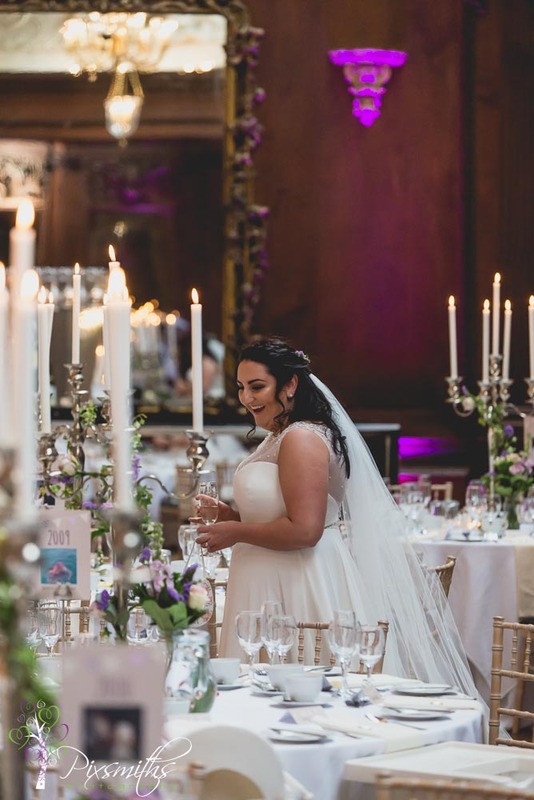 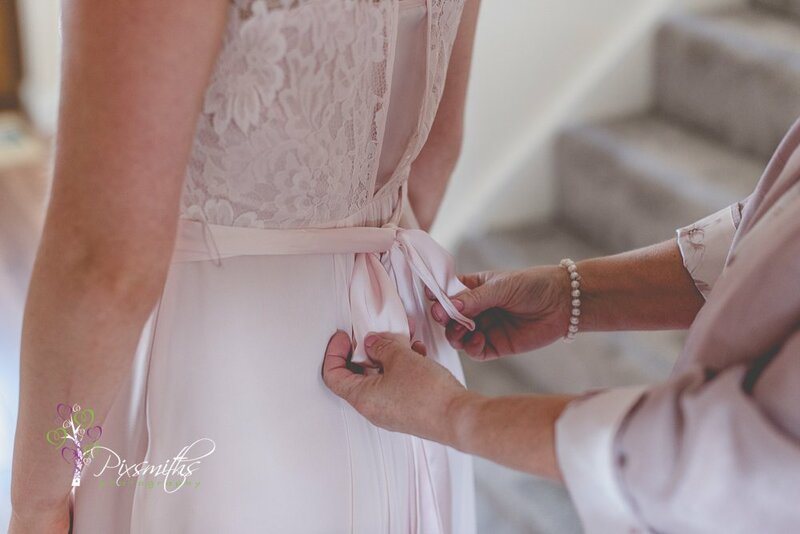 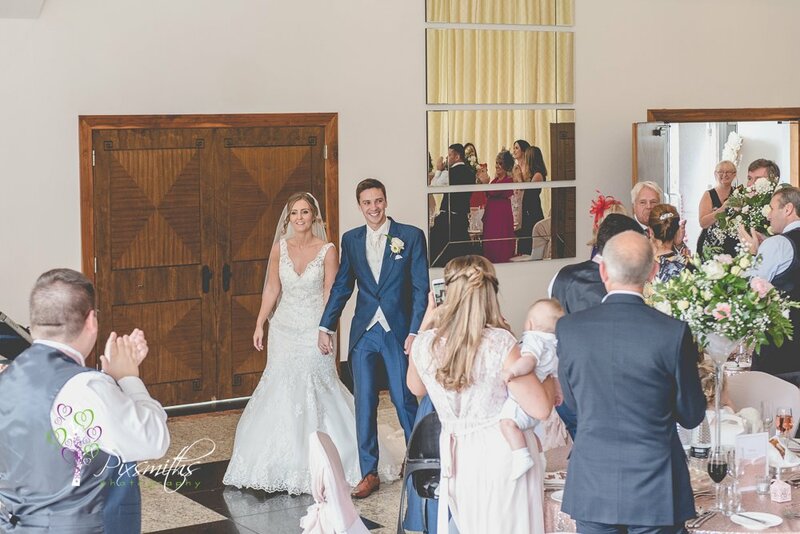 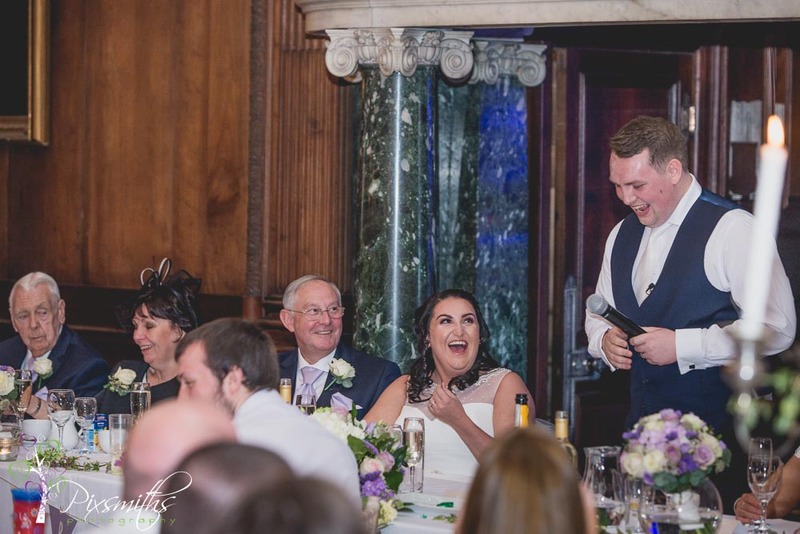 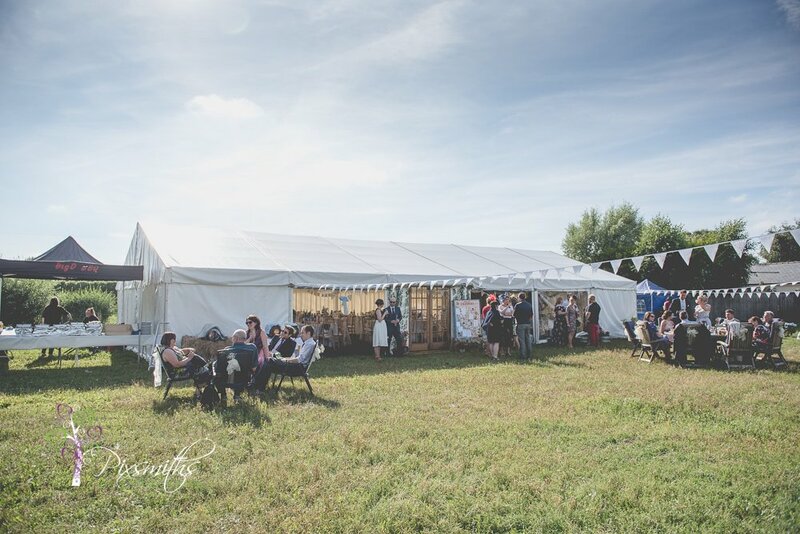 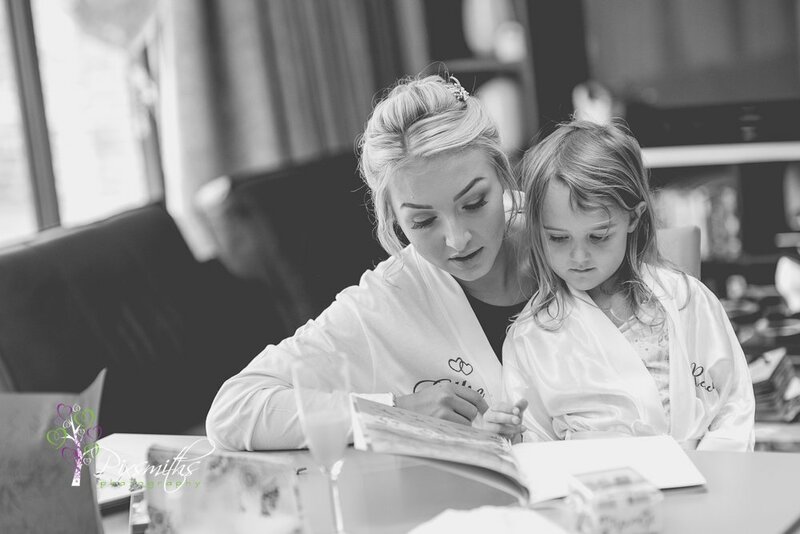 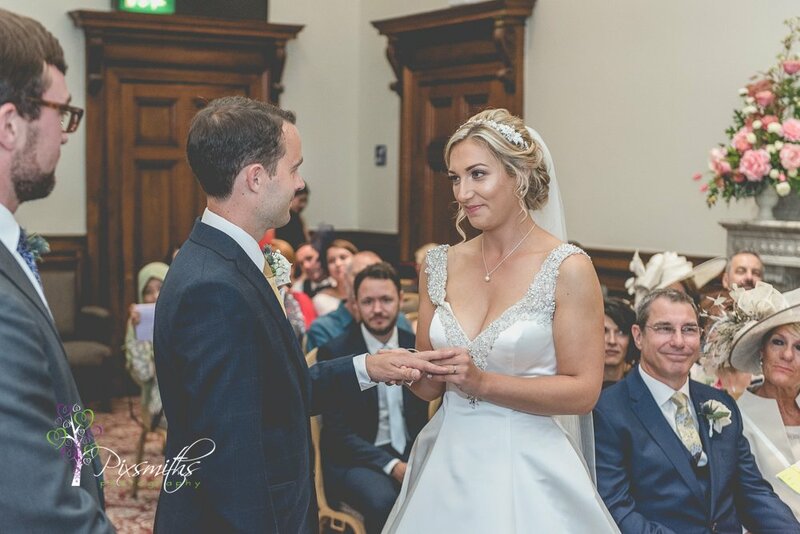 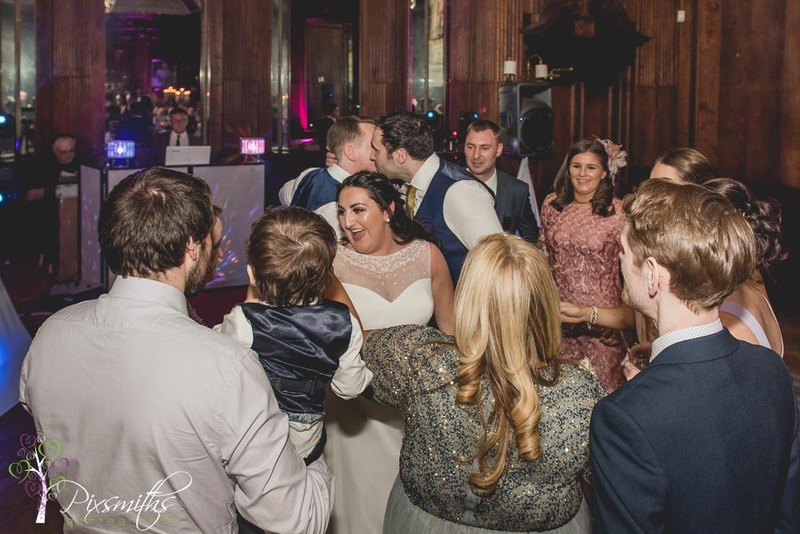 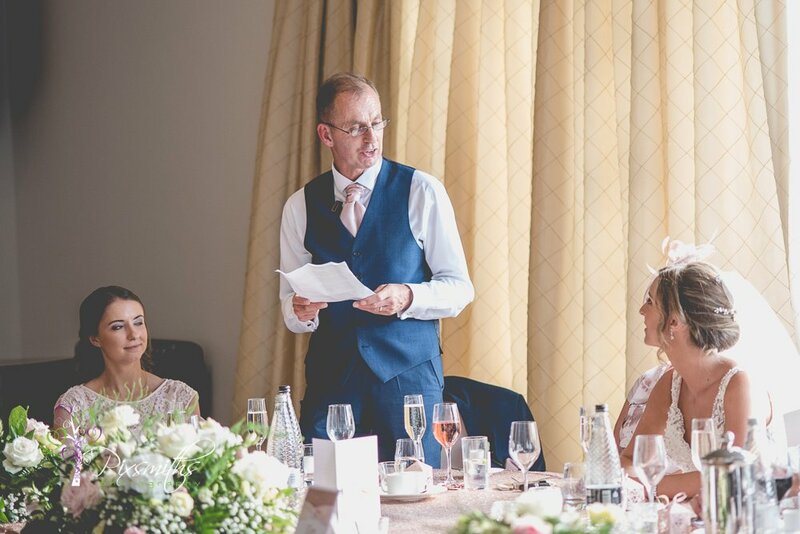 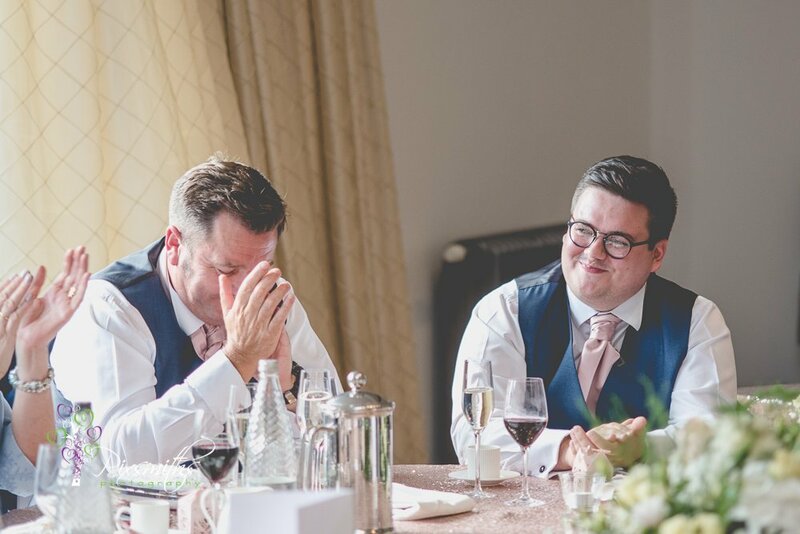 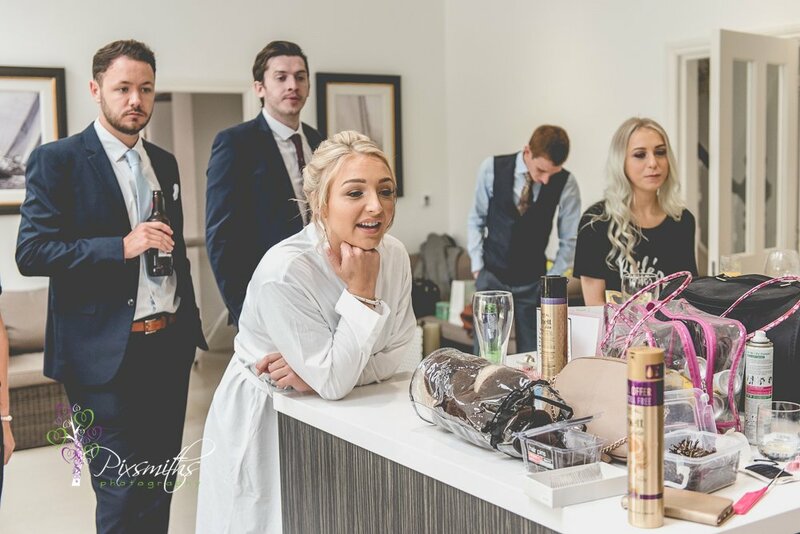 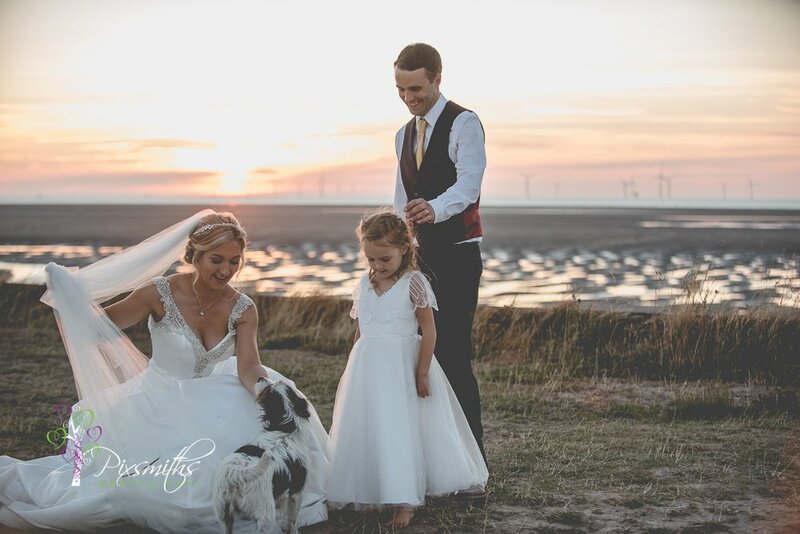 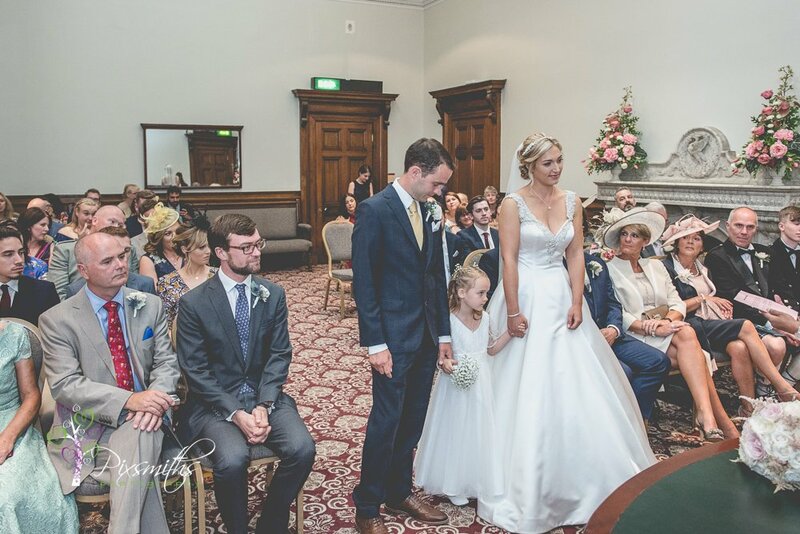 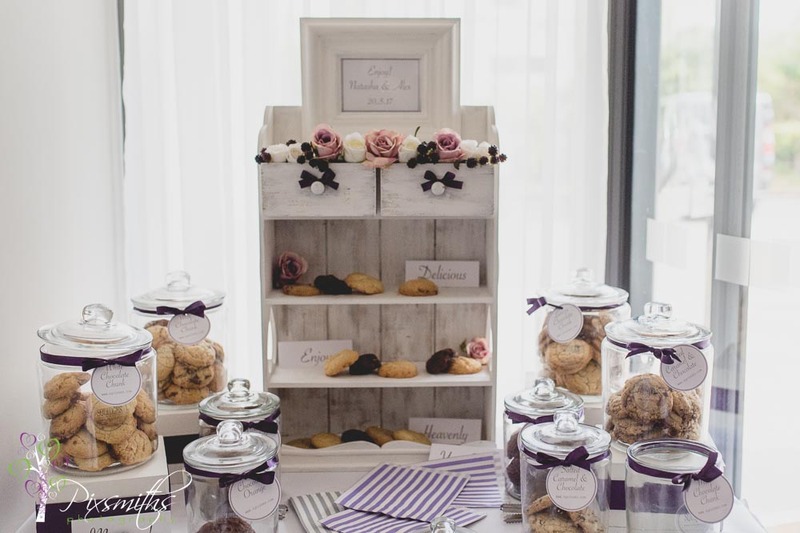 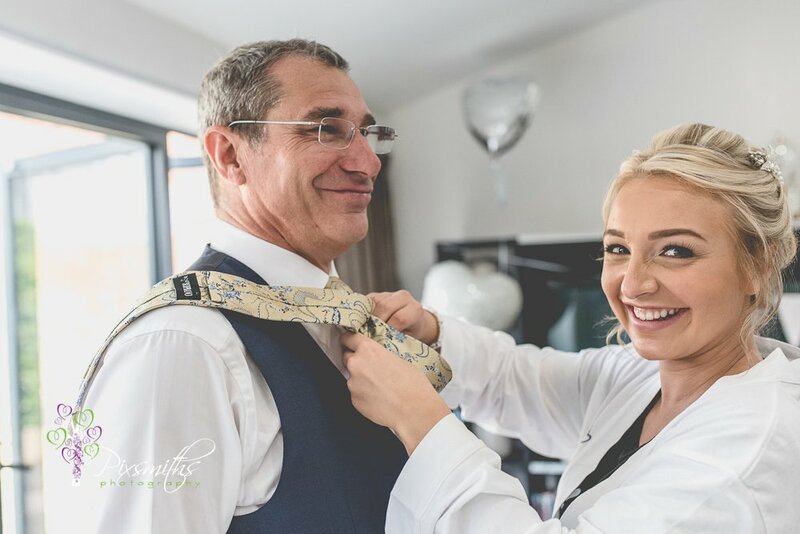 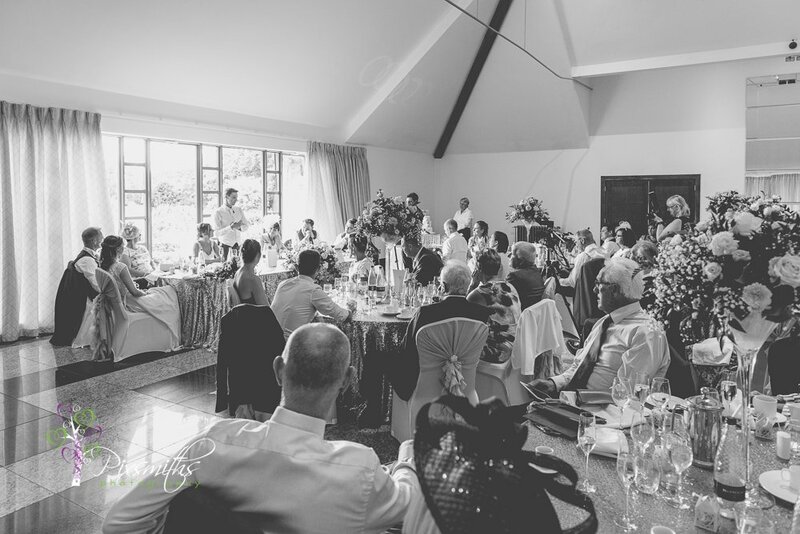 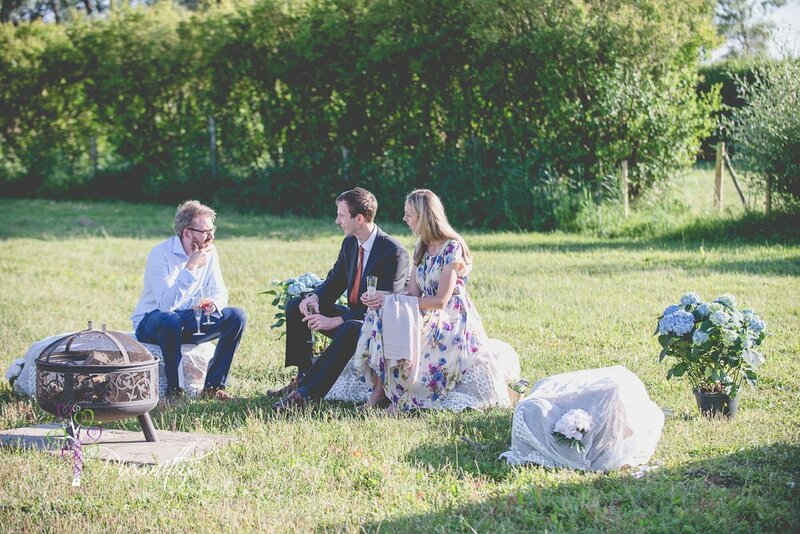 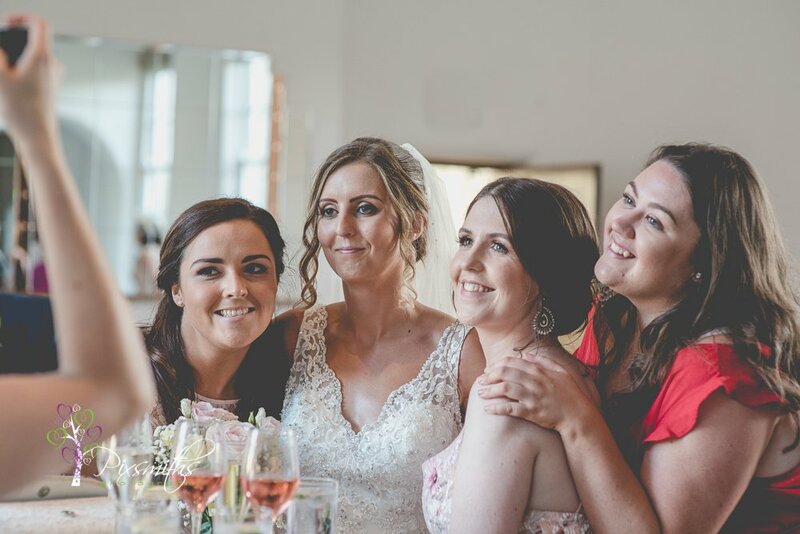 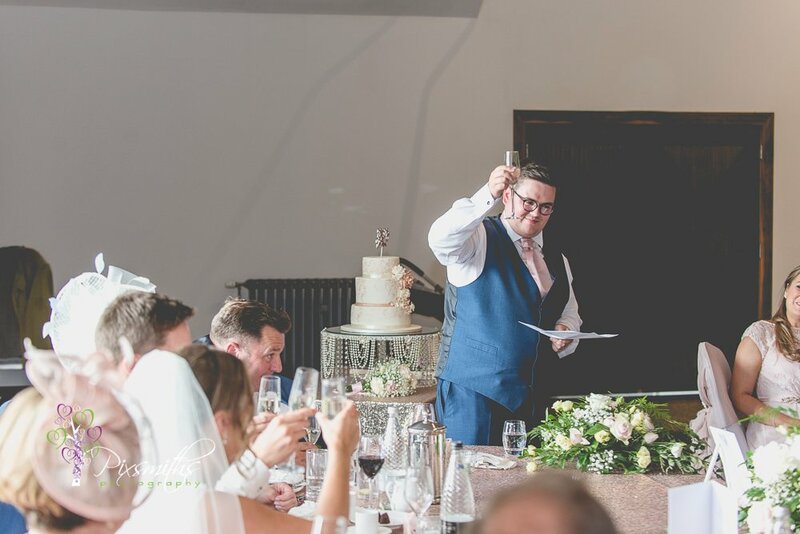 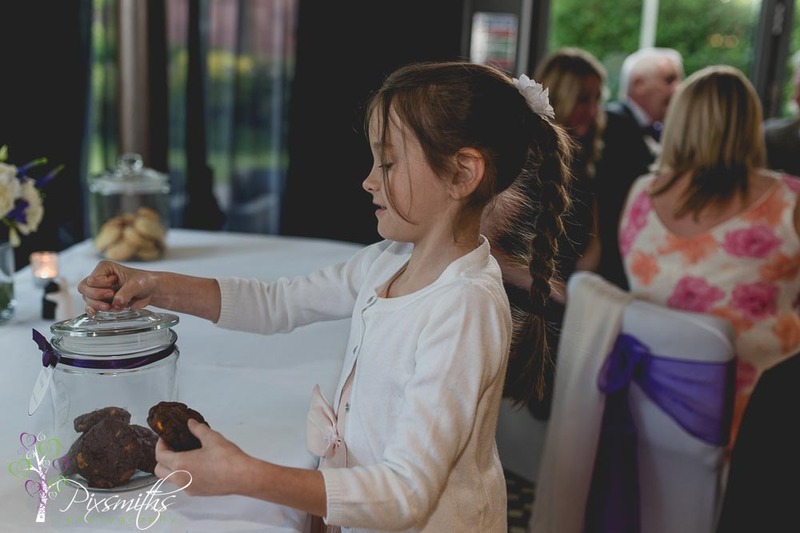 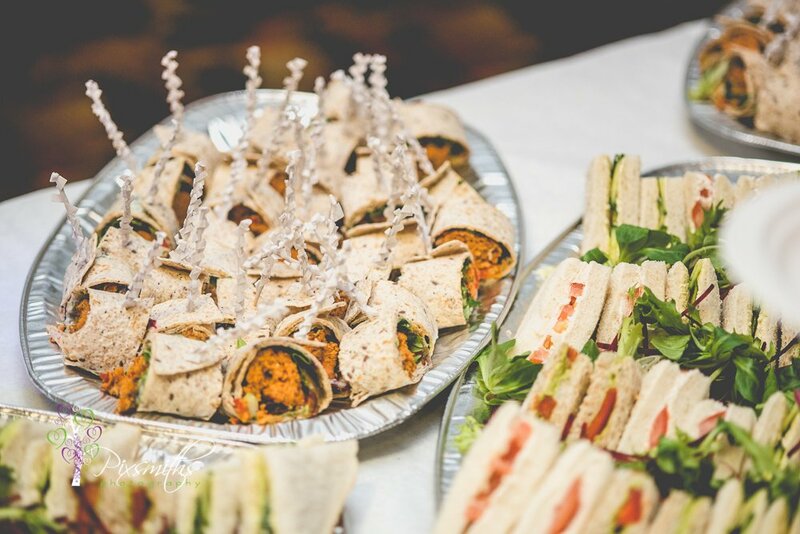 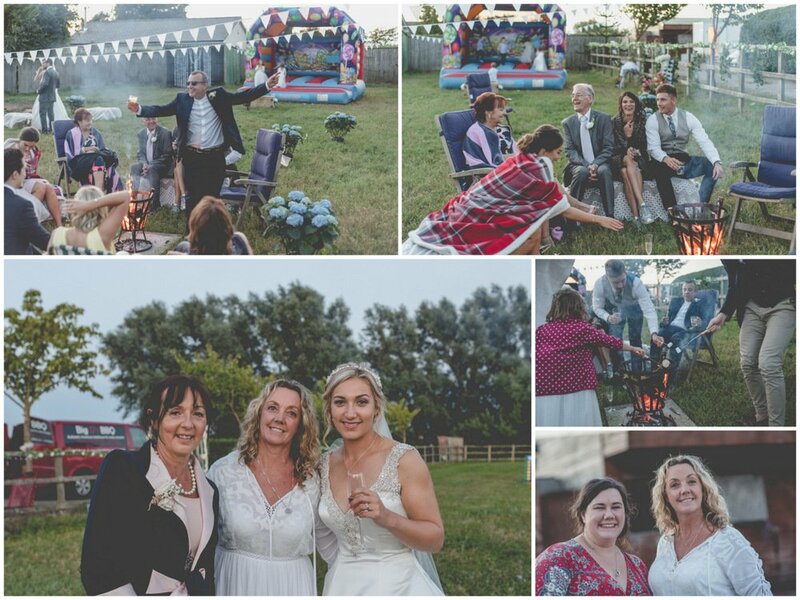 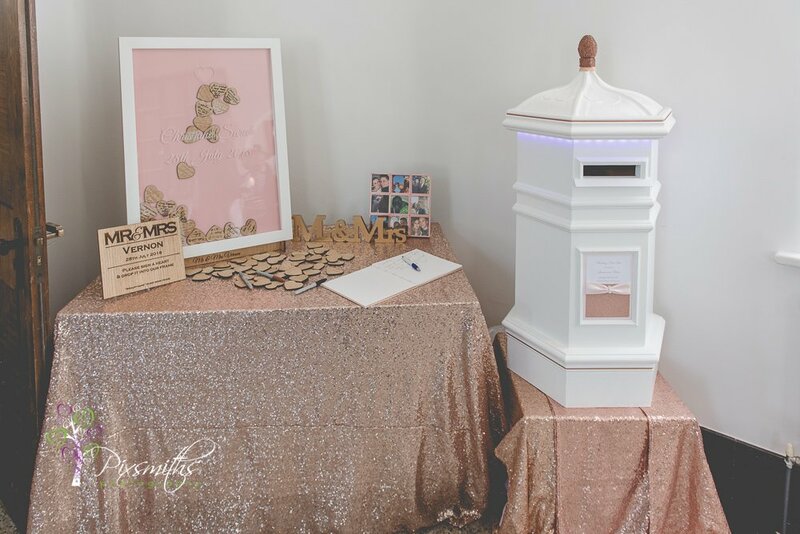 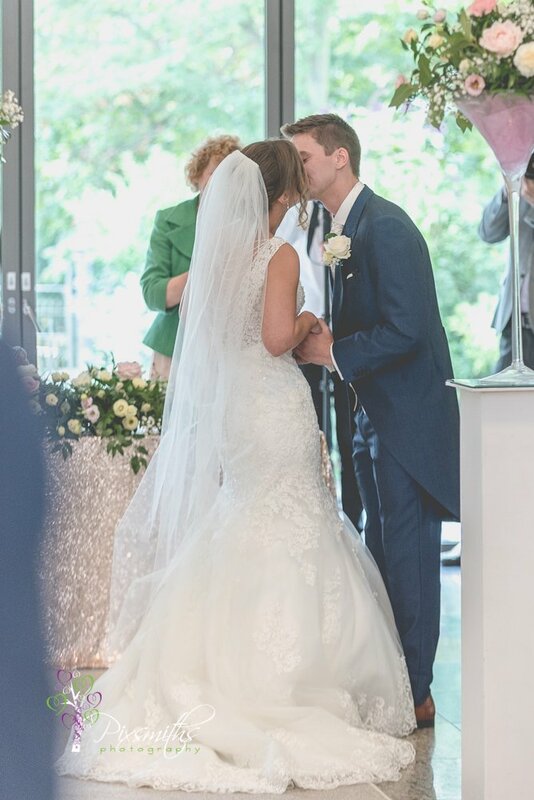 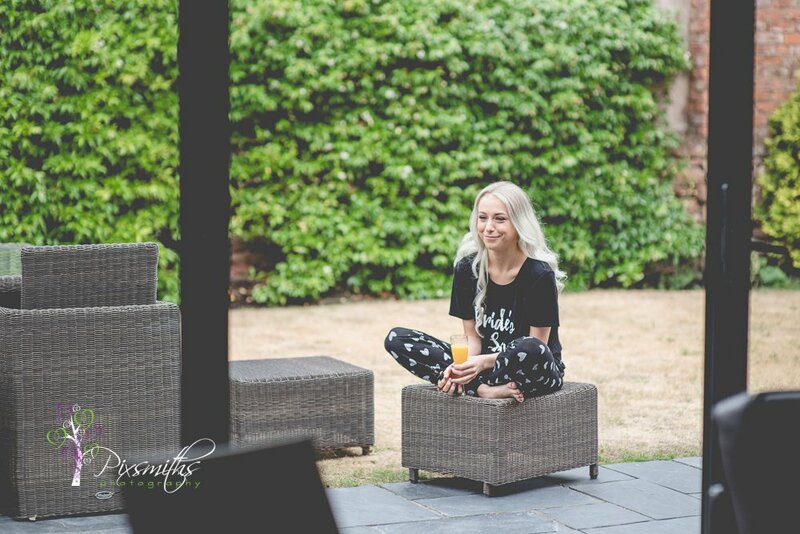 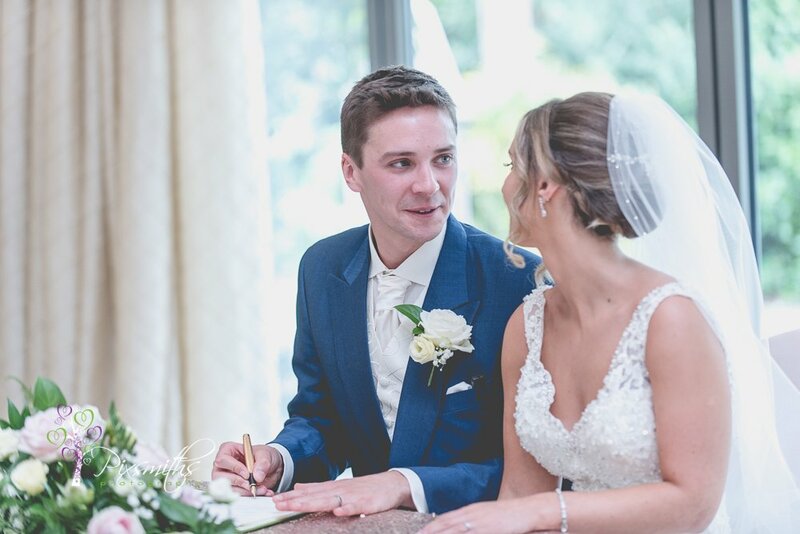 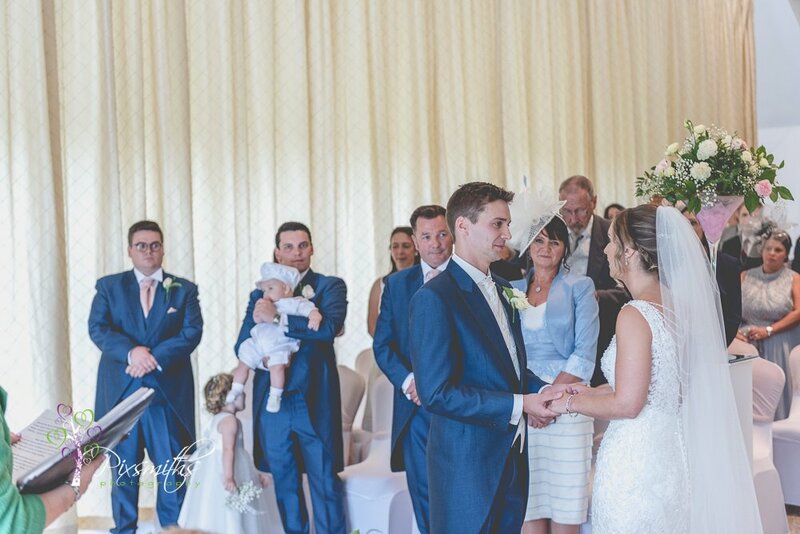 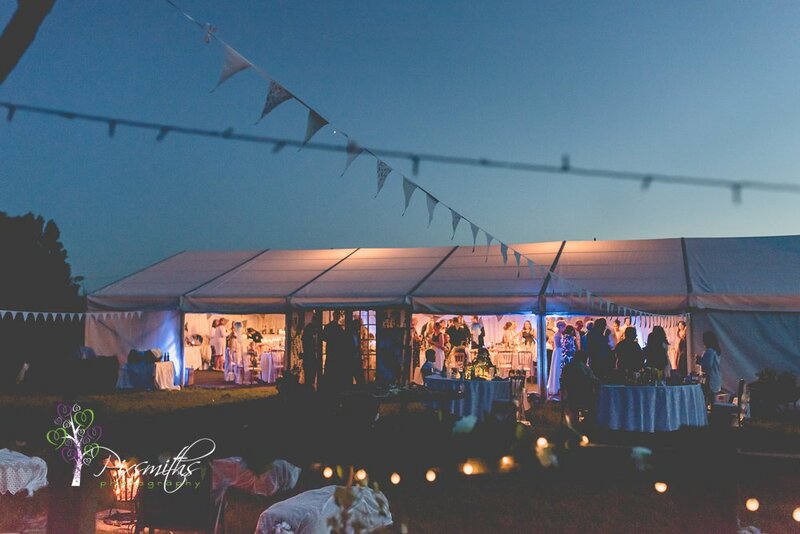 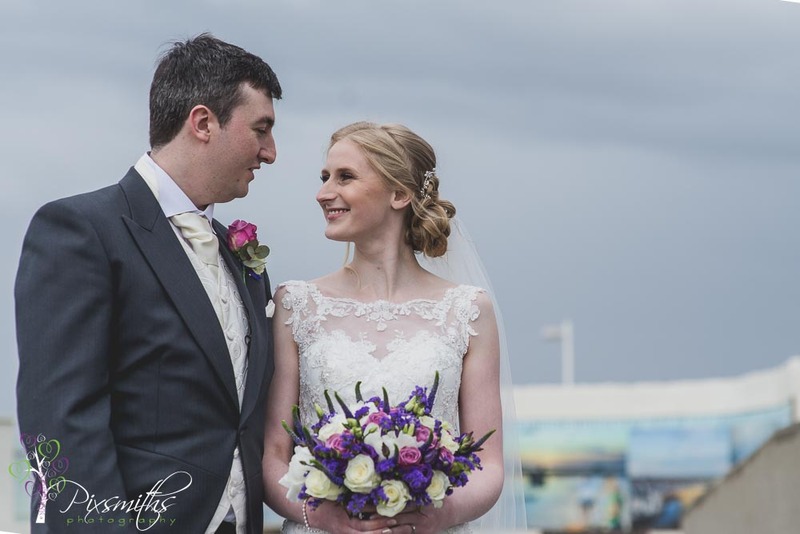 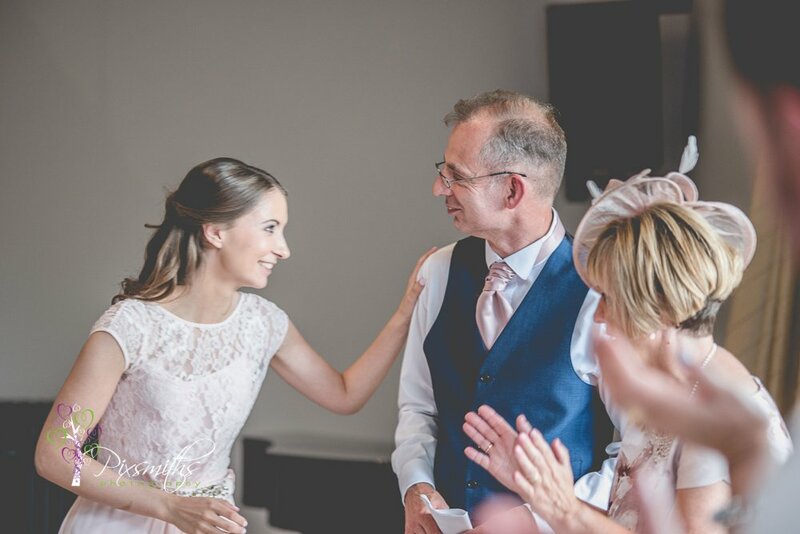 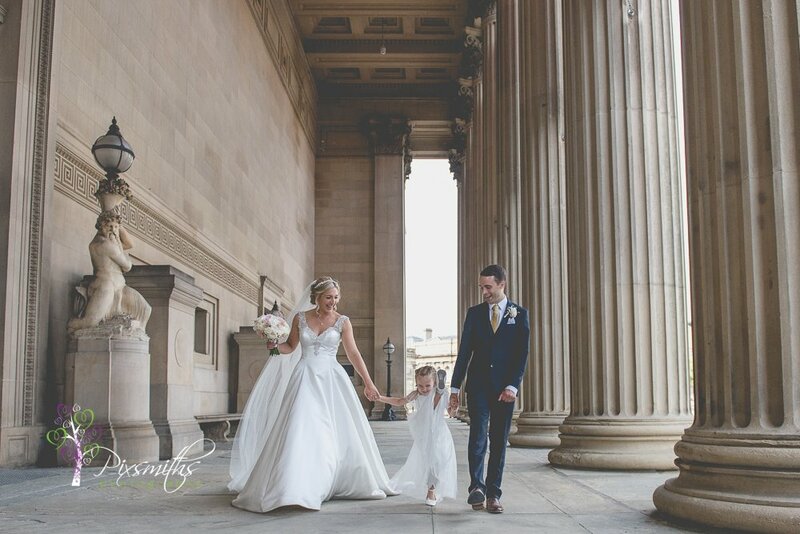 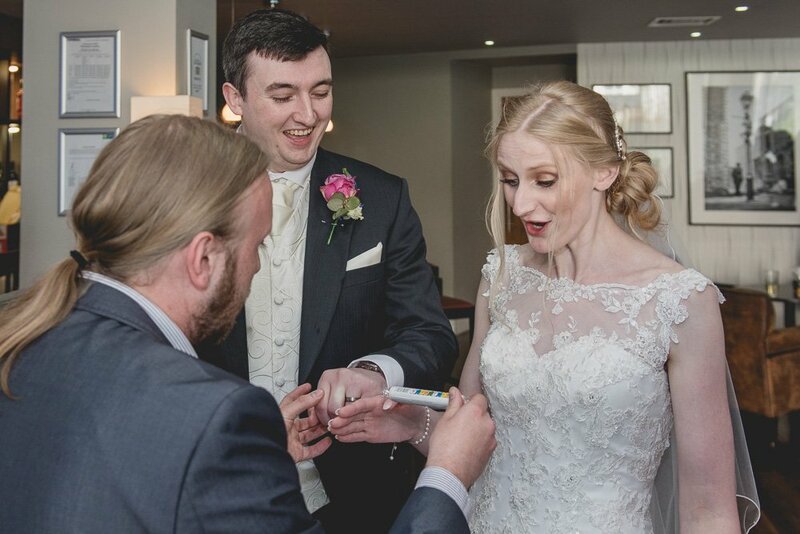 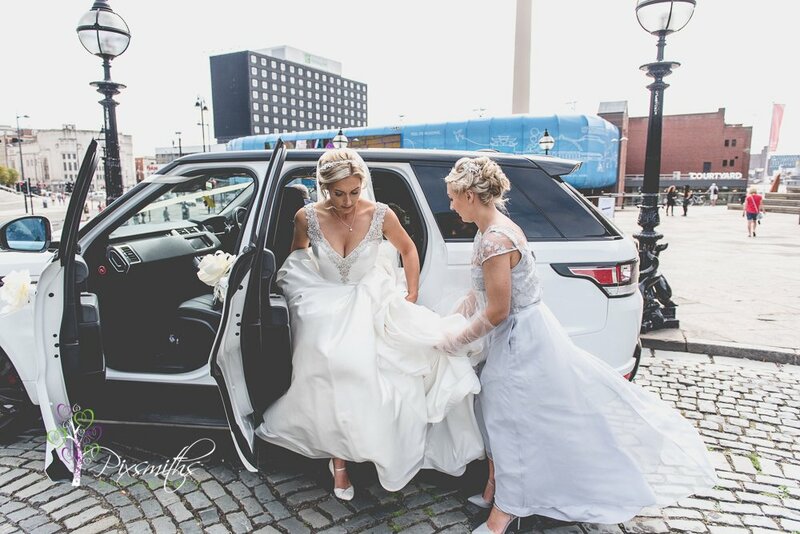 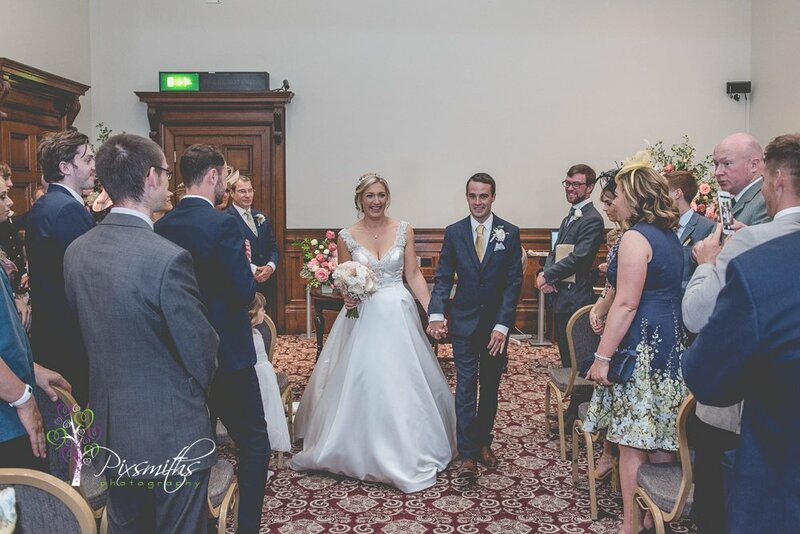 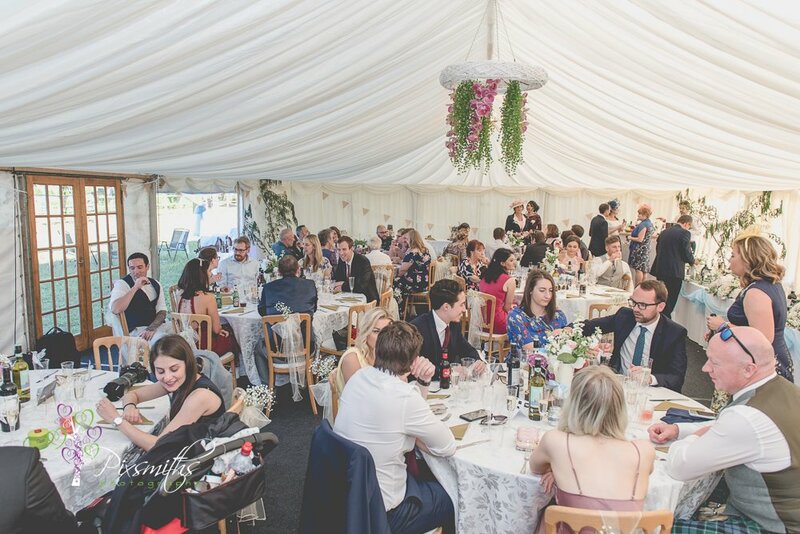 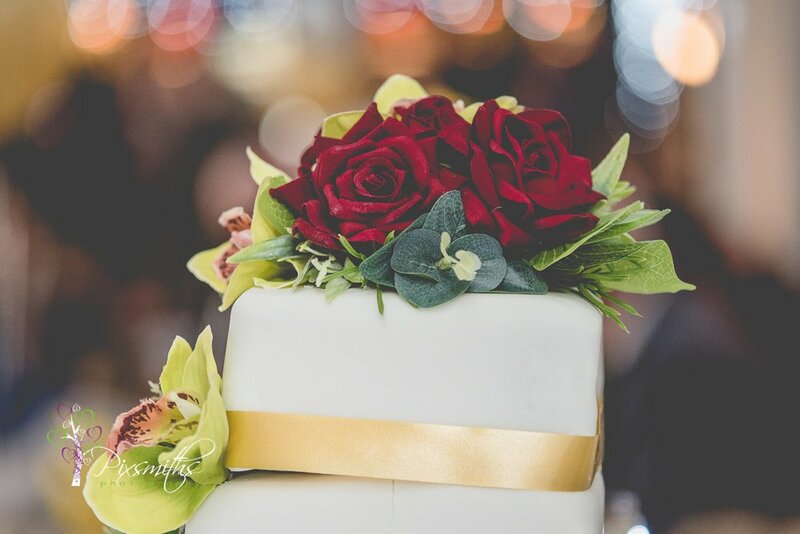 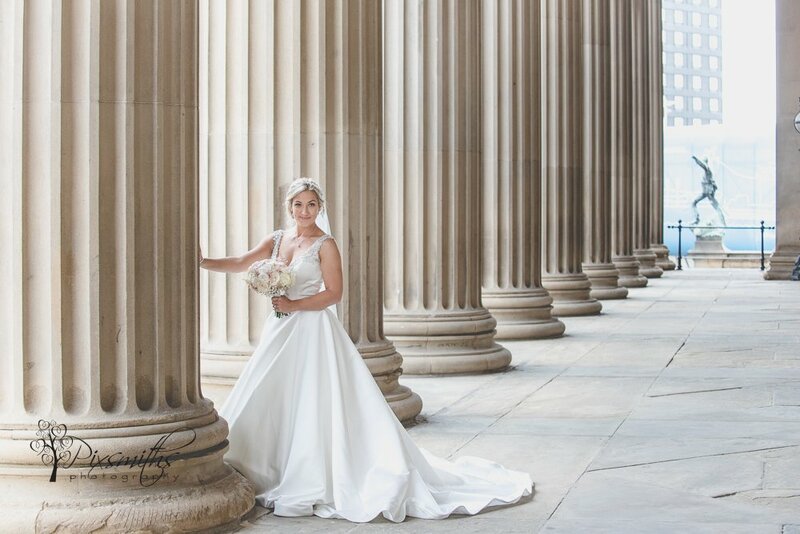 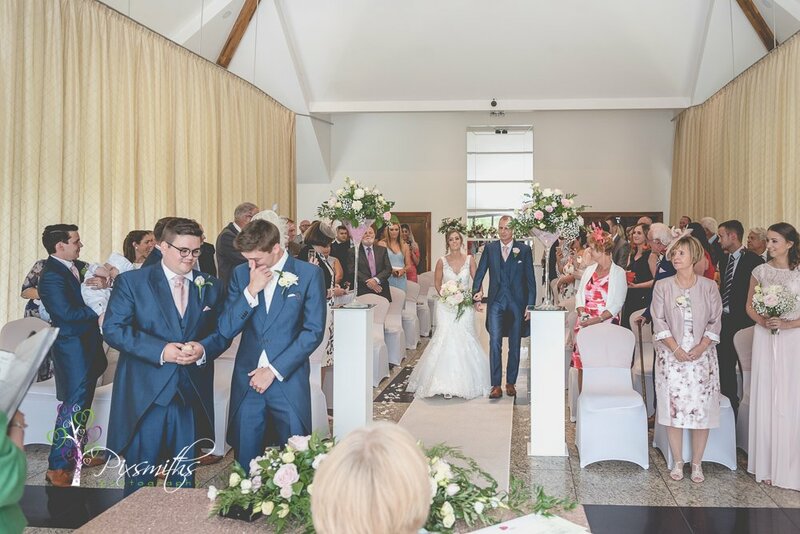 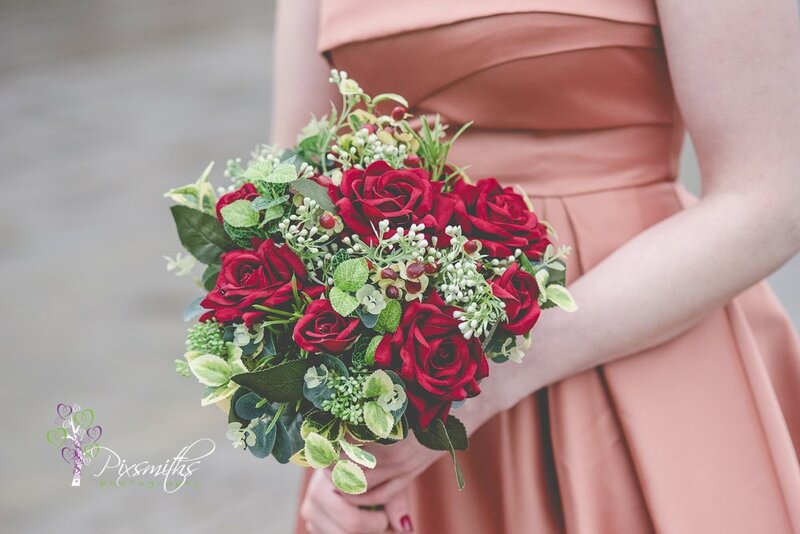 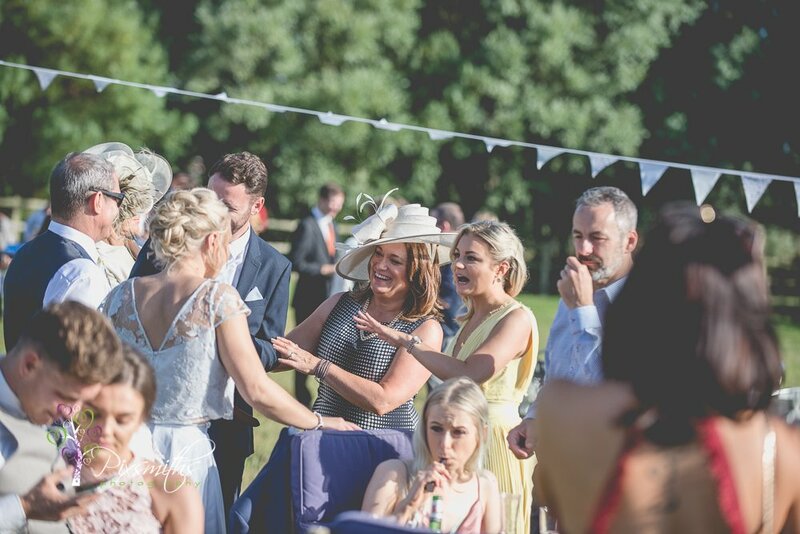 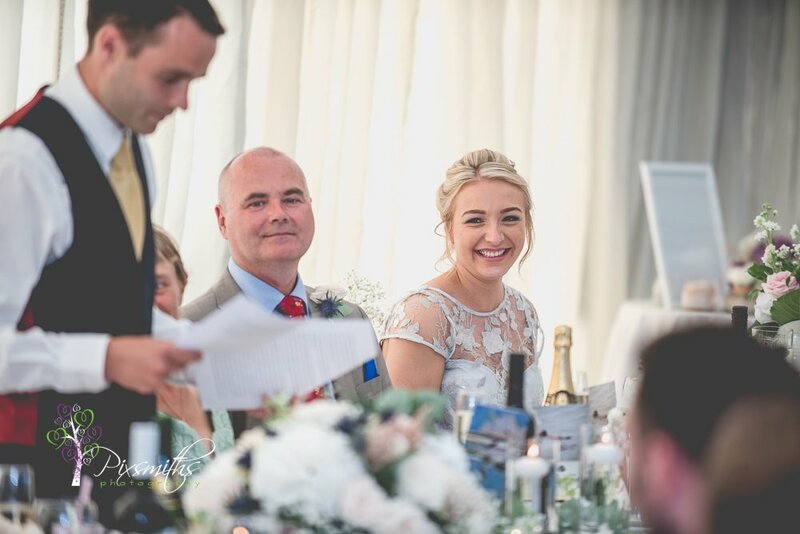 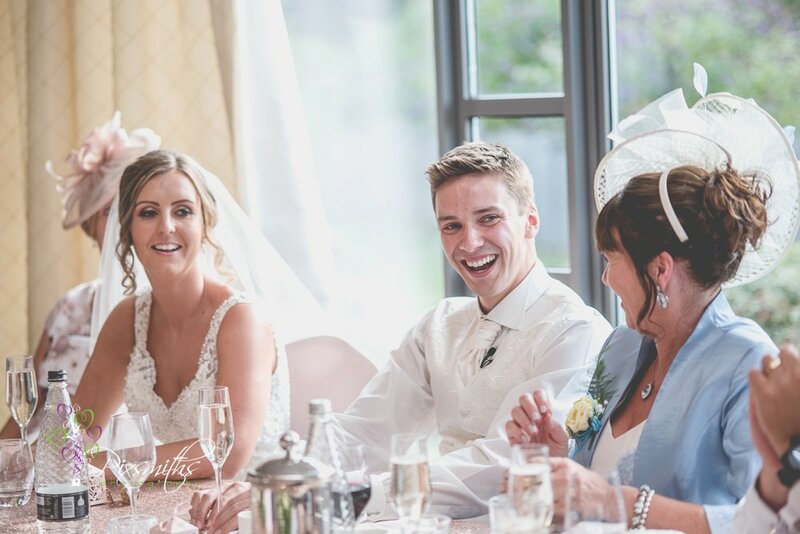 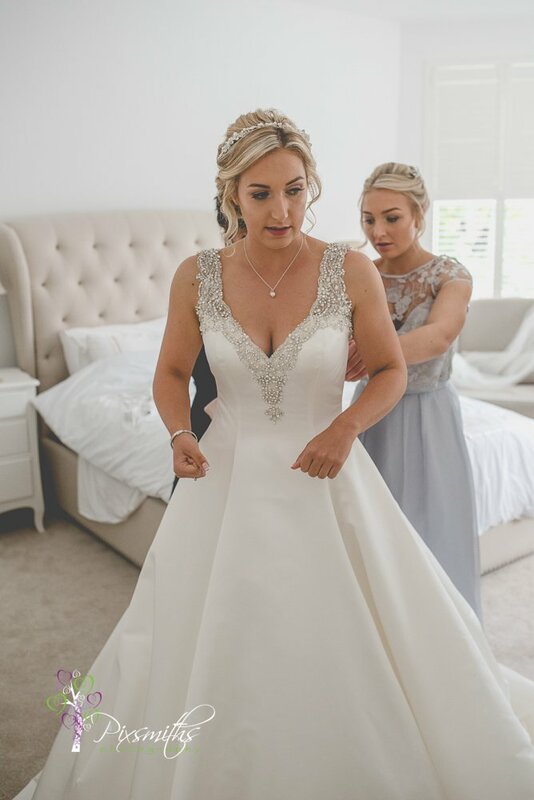 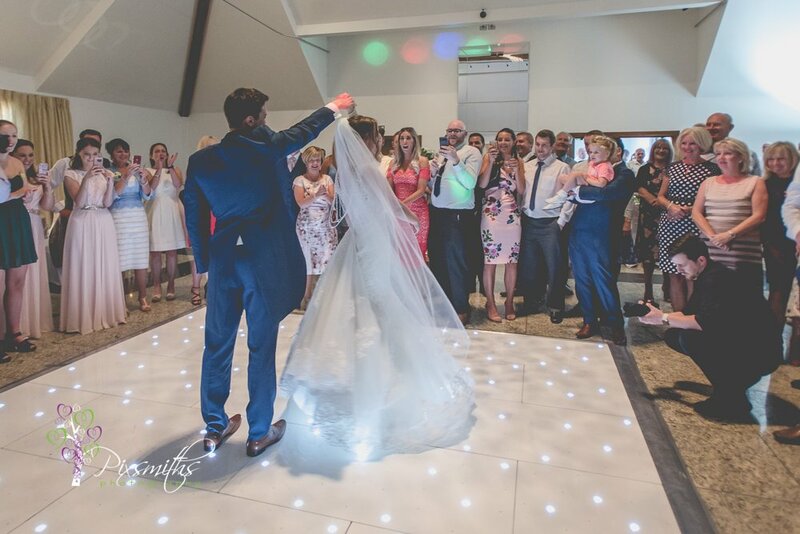 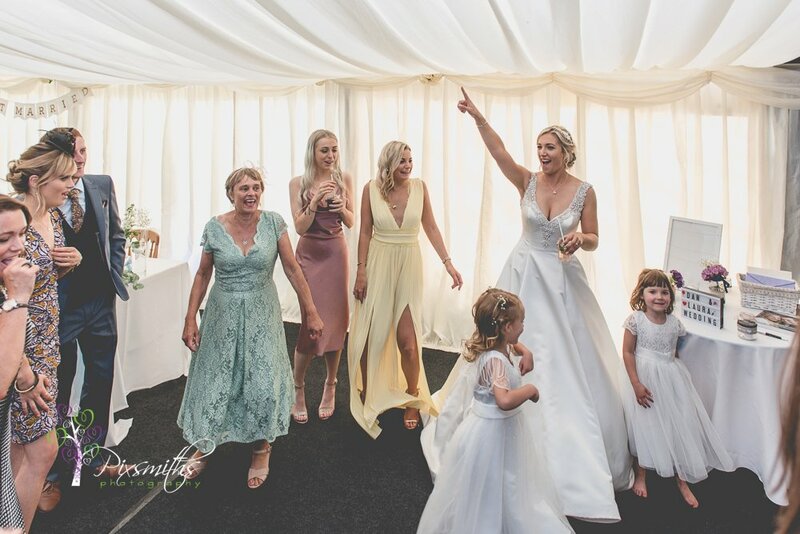 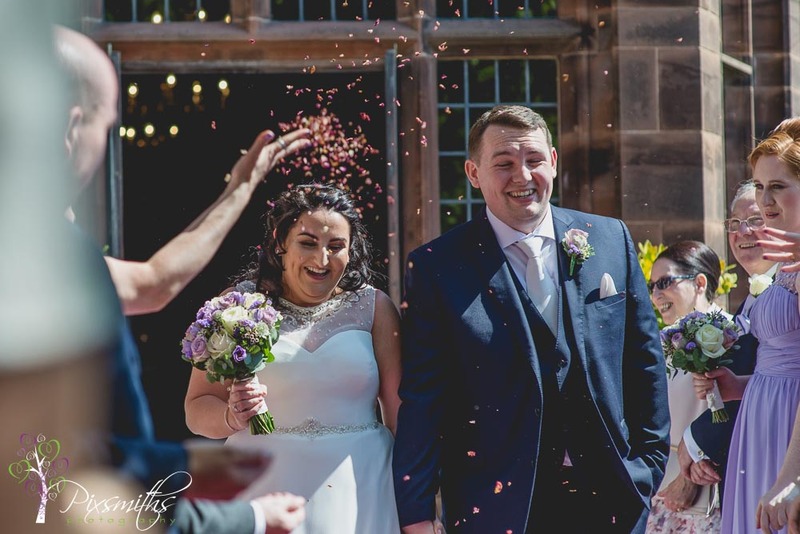 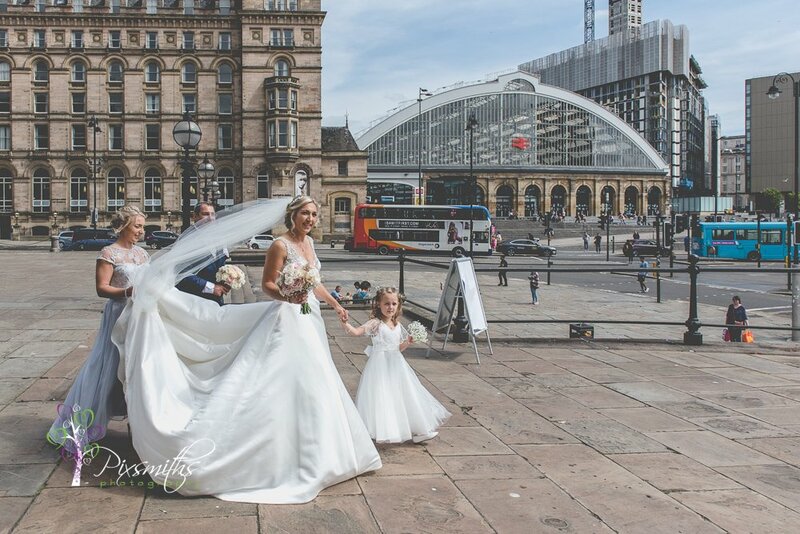 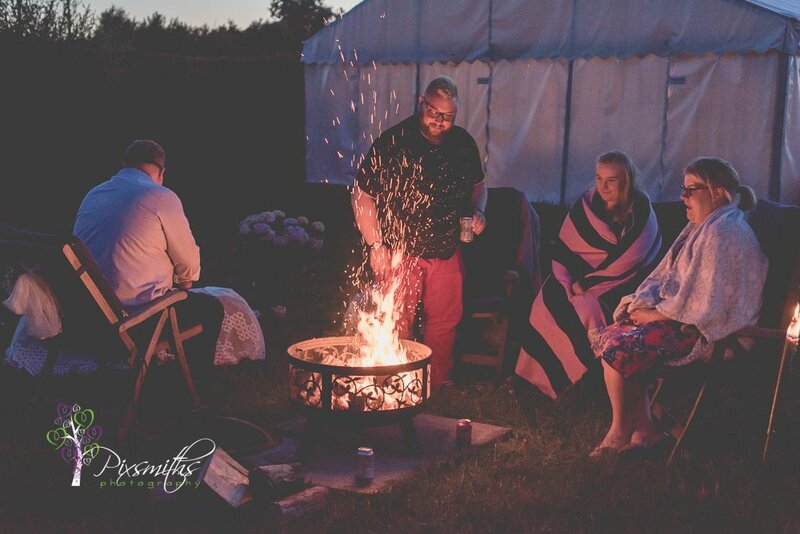 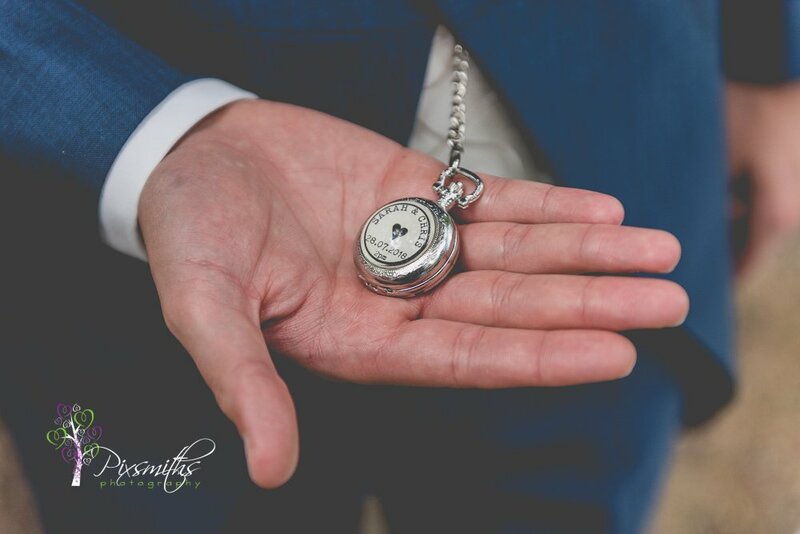 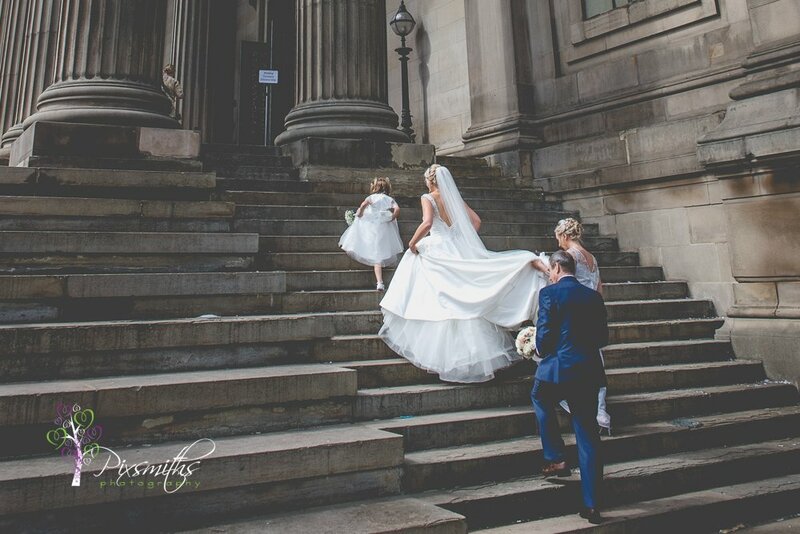 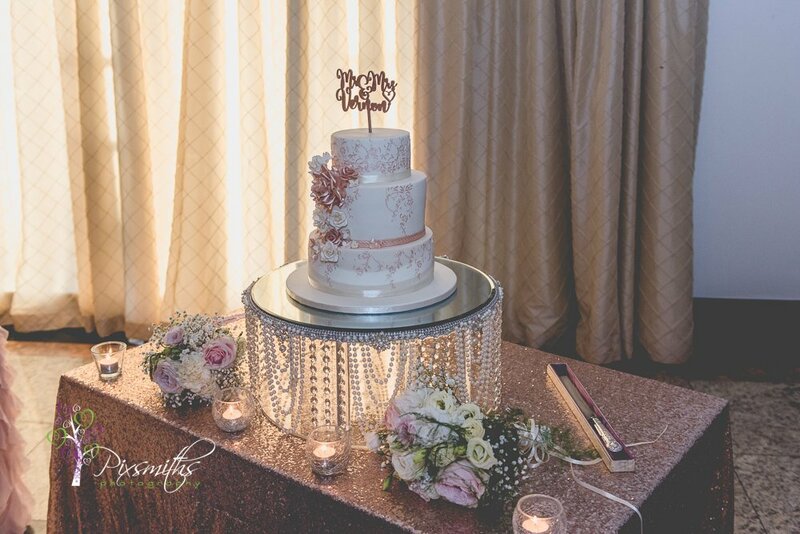 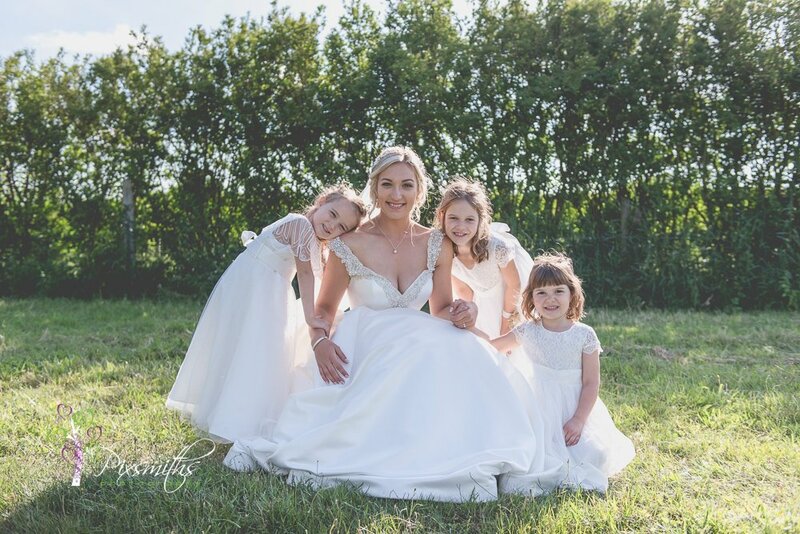 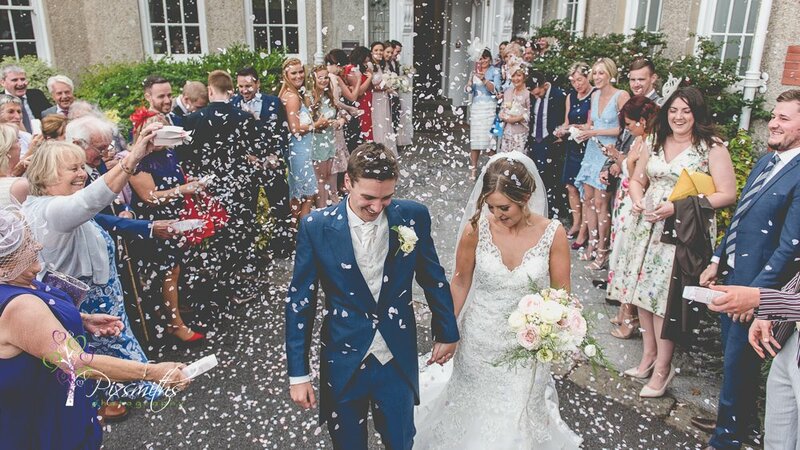 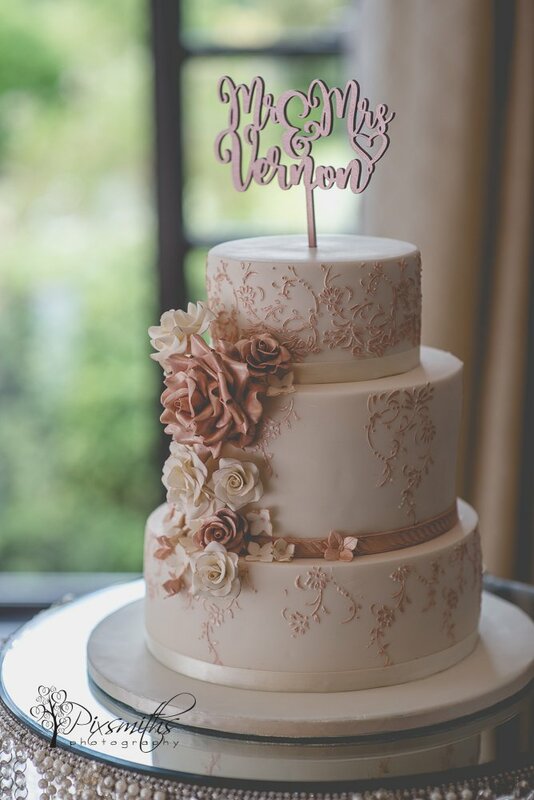 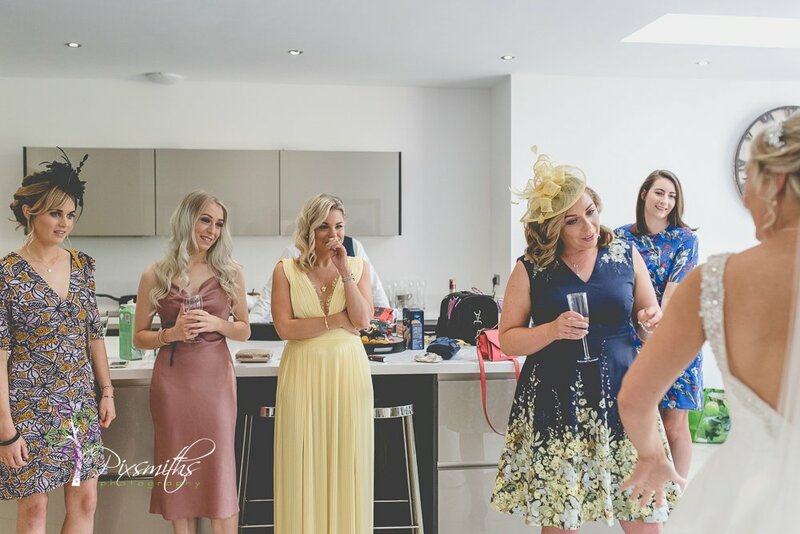 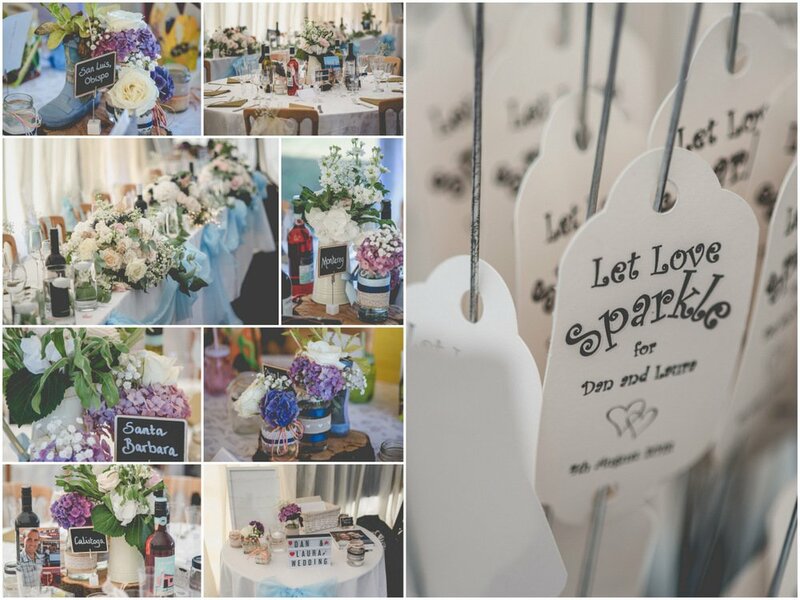 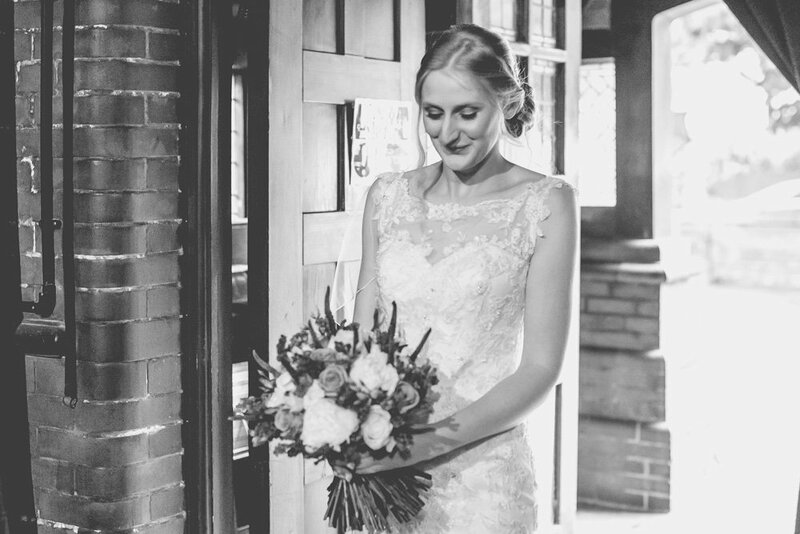 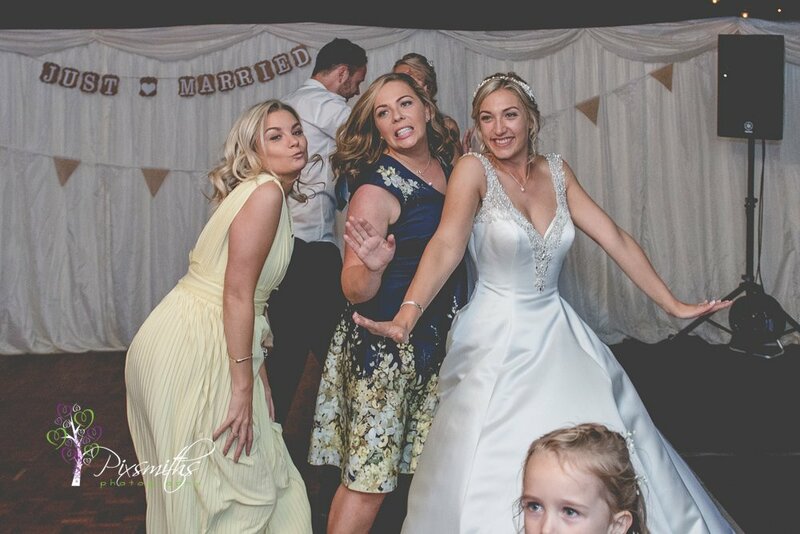 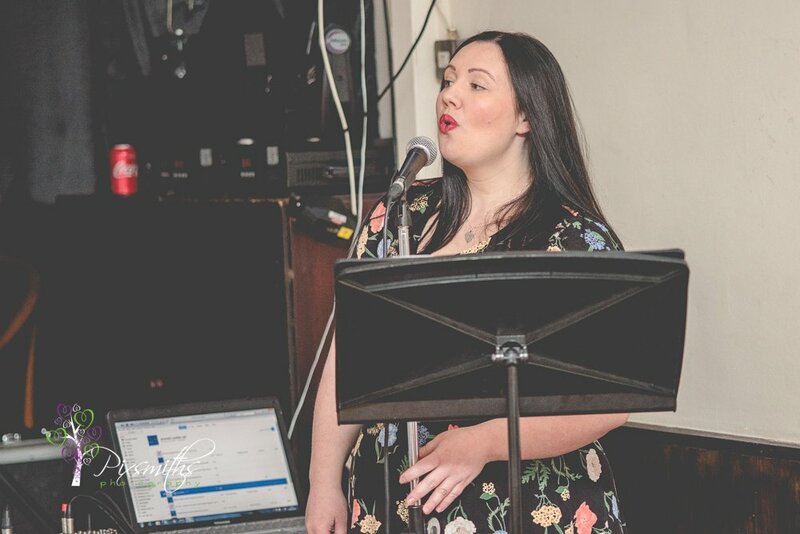 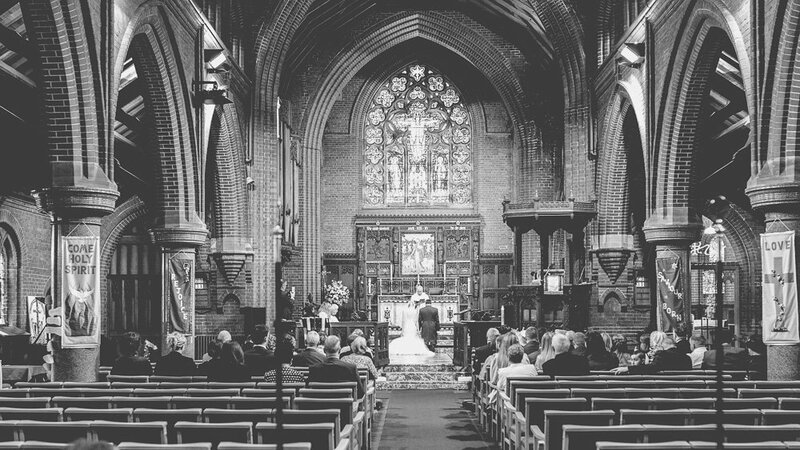 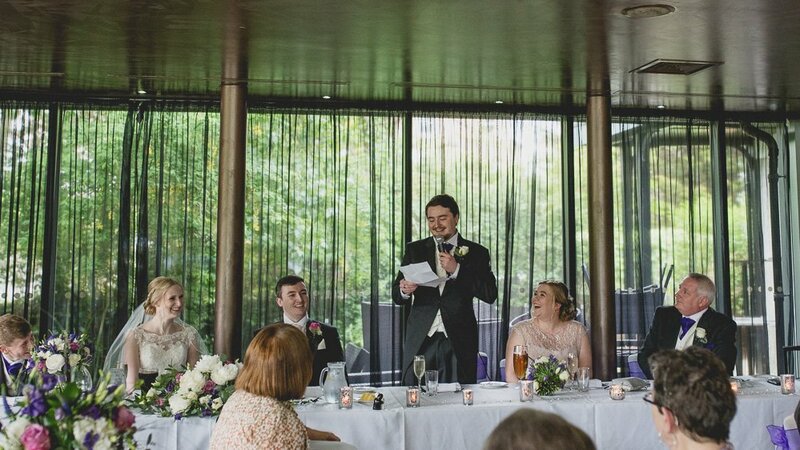 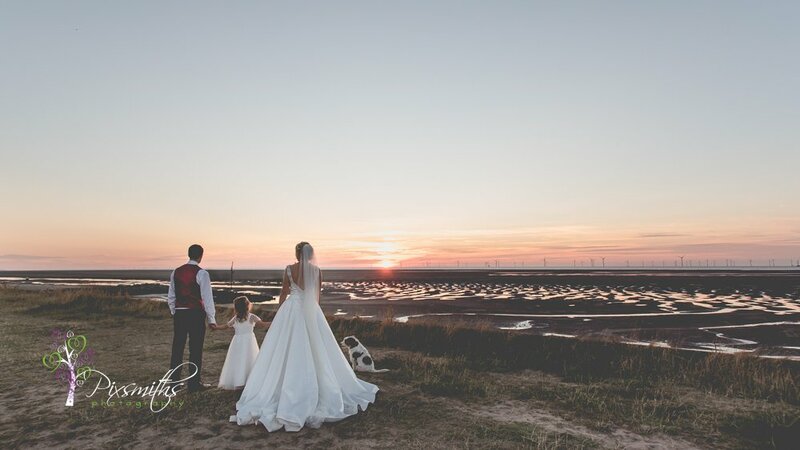 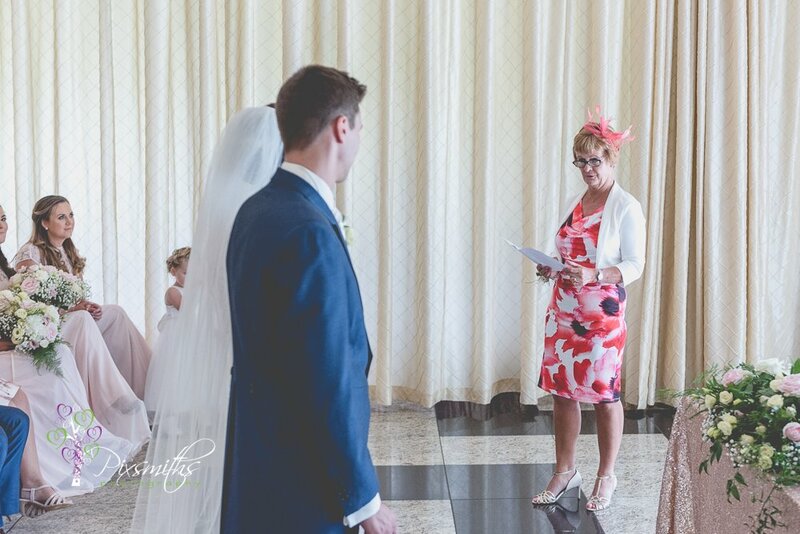 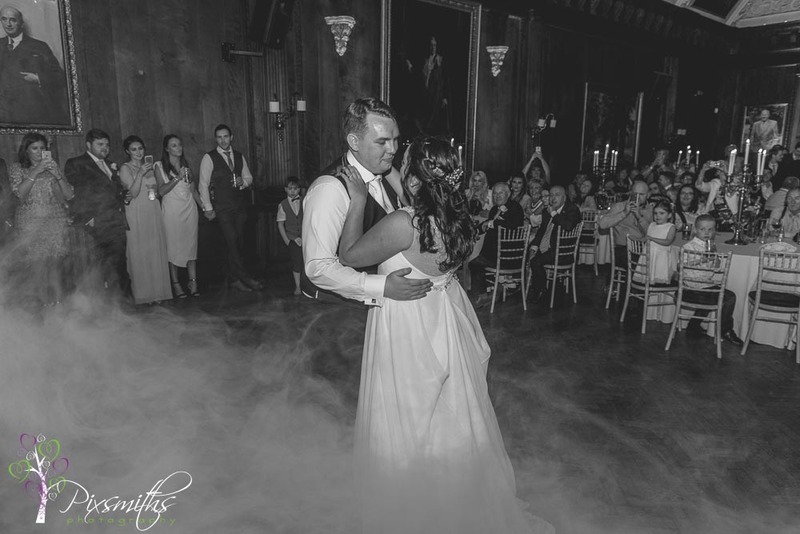 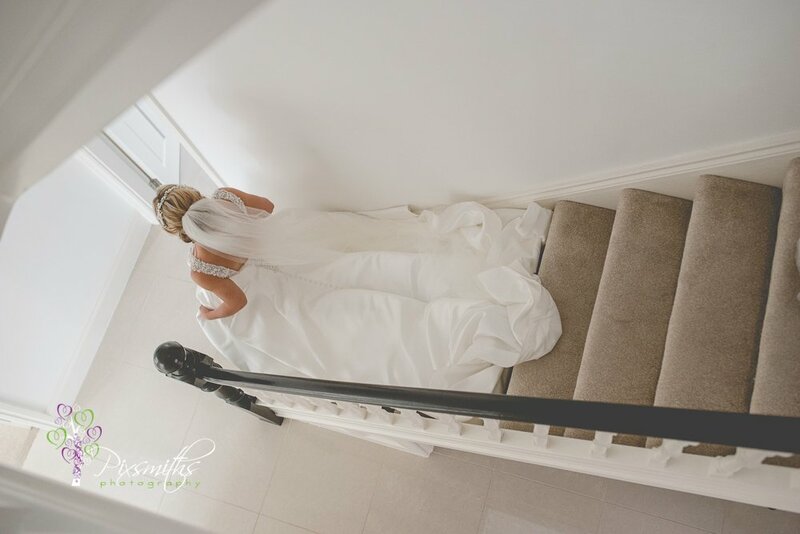 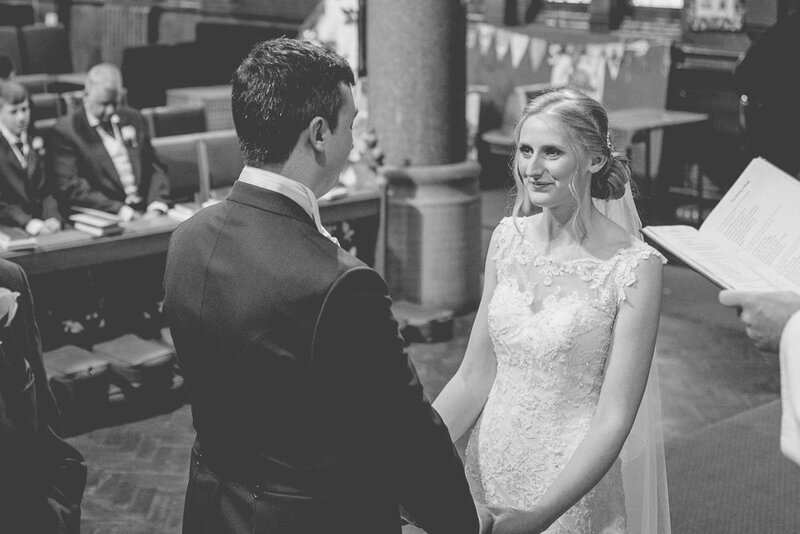 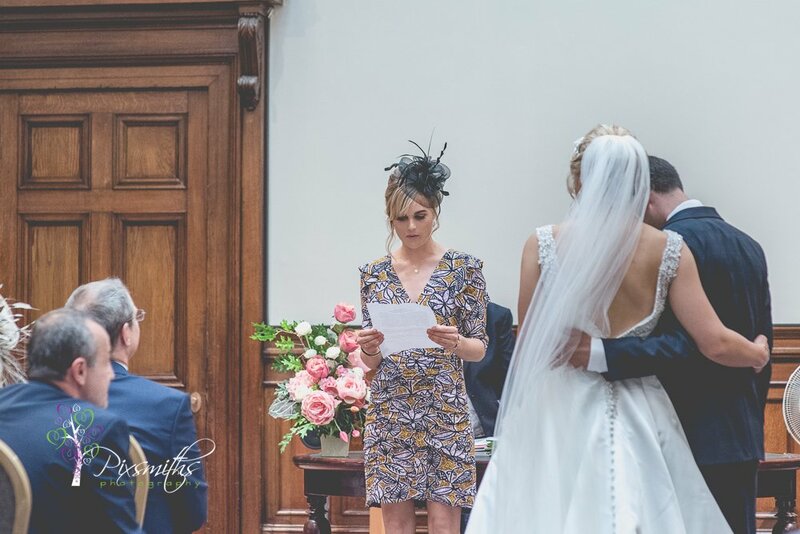 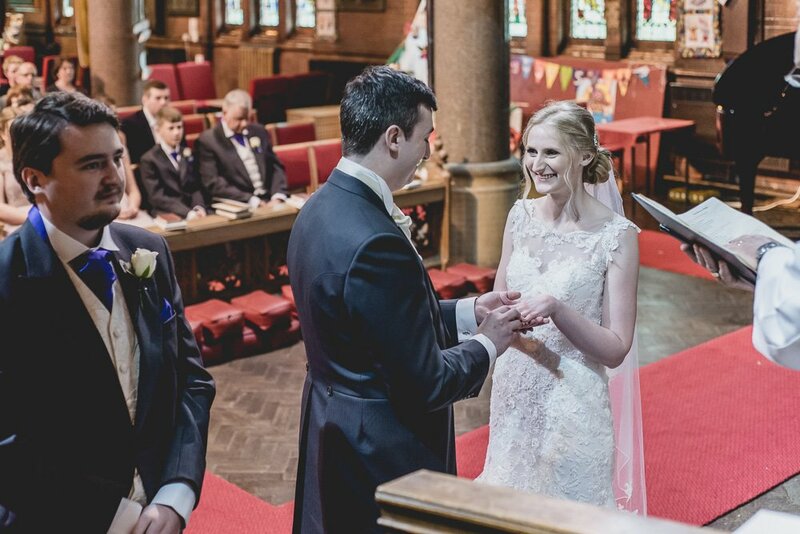 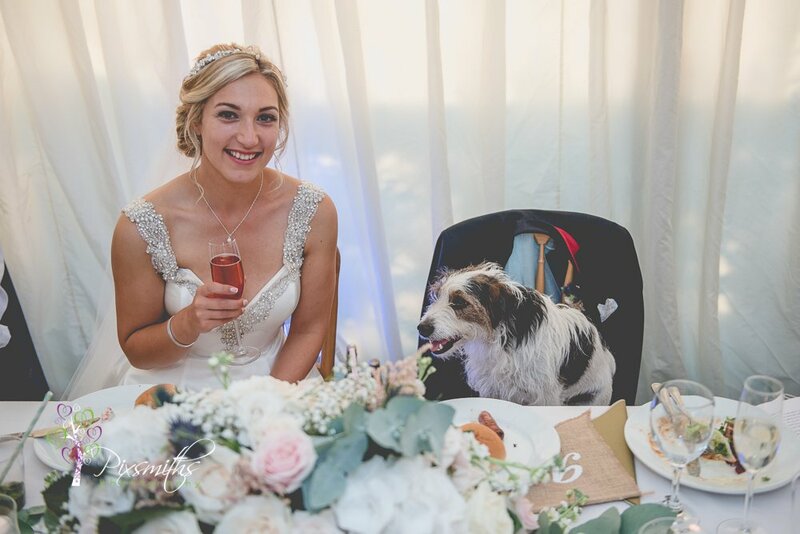 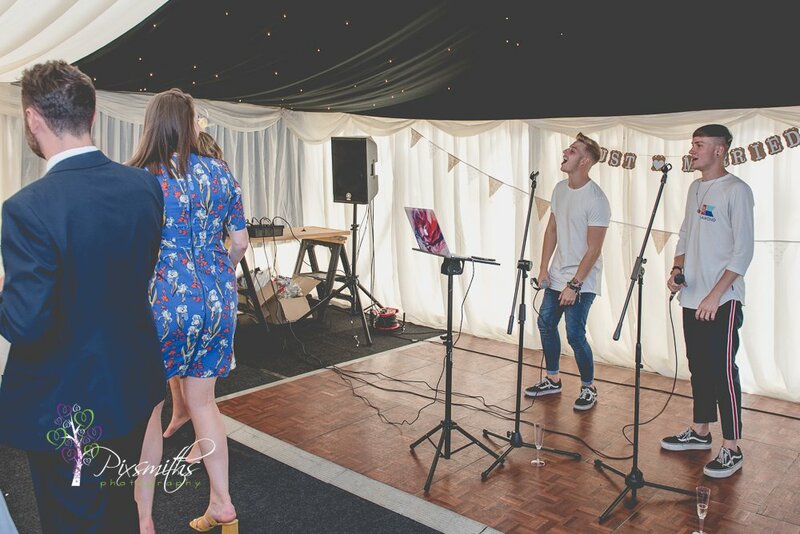 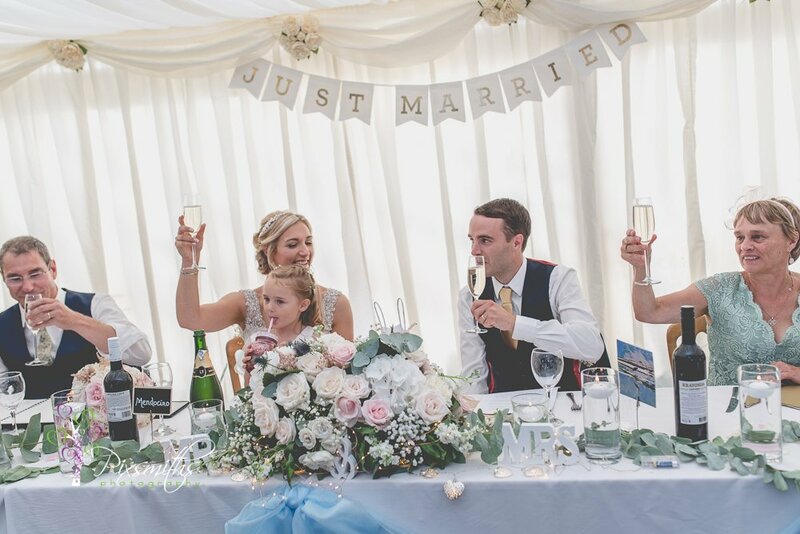 This was a first time we had worked with weddign planner Charlotte Dodd of Charlotte Elise Weddings and Events and it was great – so well organised and good communication beforehand. 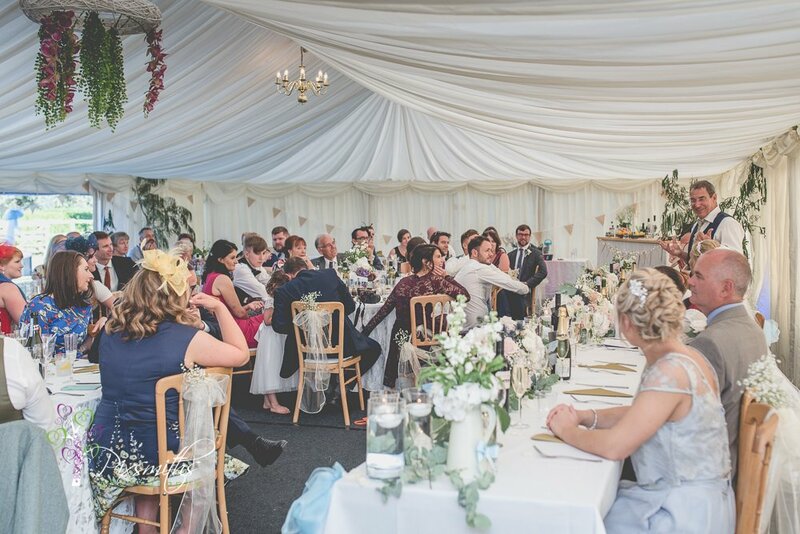 This wedding was a great collaboration of many suppliers we love to work with too – all helps for smooth running of the day. 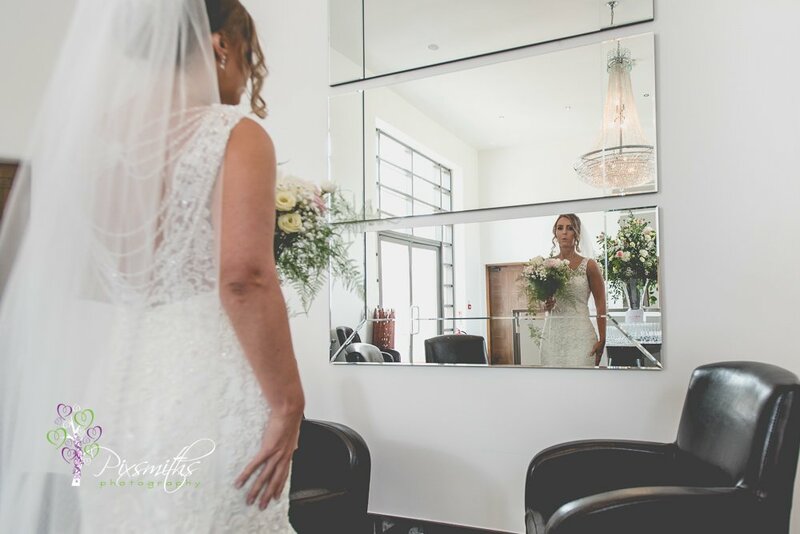 Bridal preps were just around the corner from Marcos too – see really couldn’t be much handier, a very neat triangle of venues. 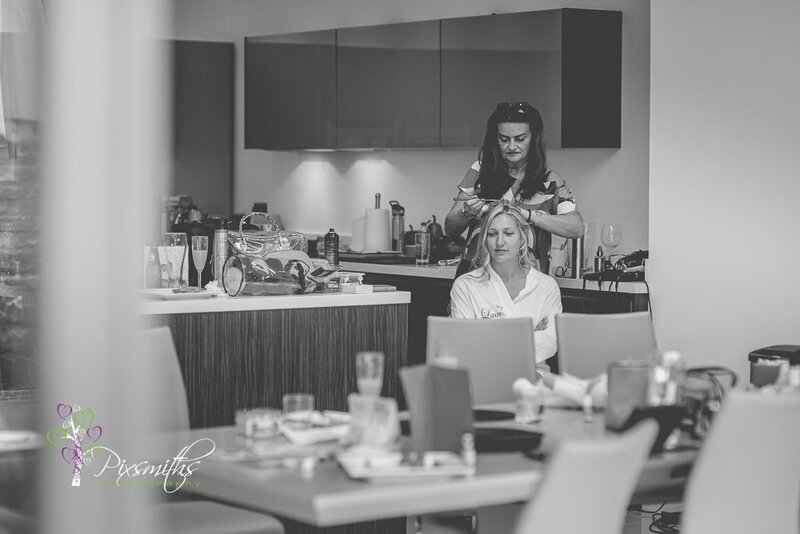 MUA was Cathryn Ann Rawlinson and Claire Kendrick on hair – fab combo! 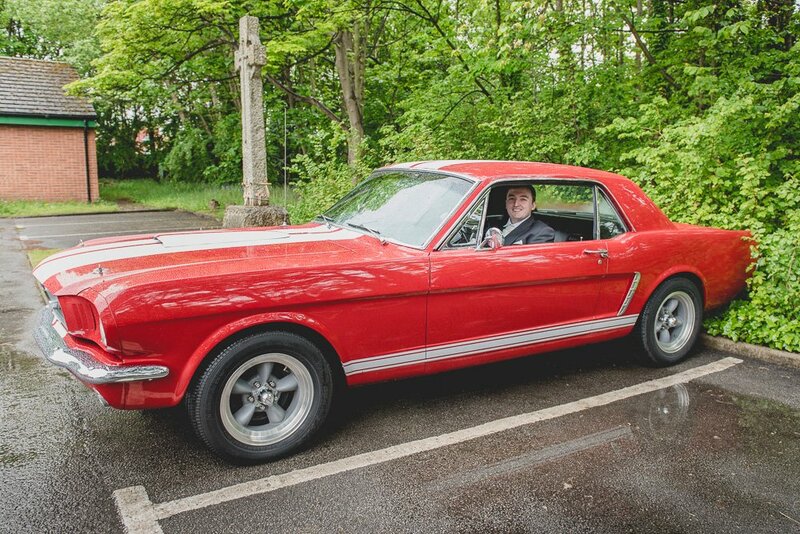 Alex was surprised with his ride from Liverpool where he was getting ready in a red mustang – his face was a picture! 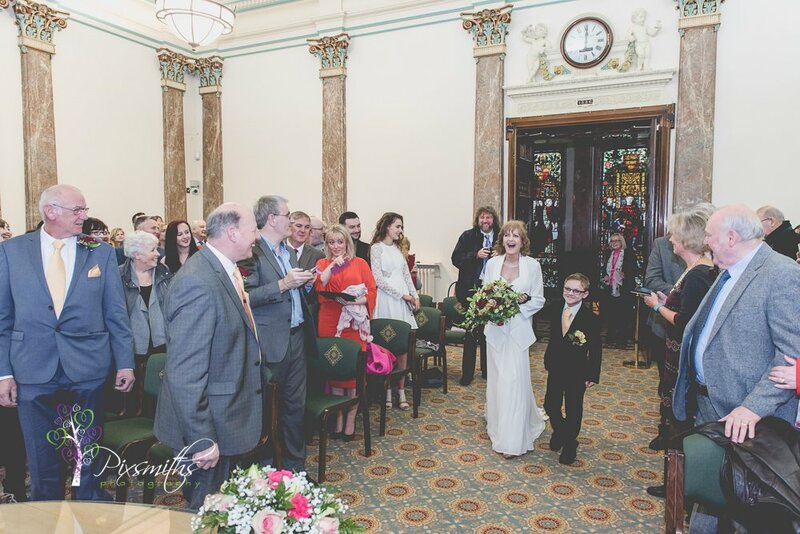 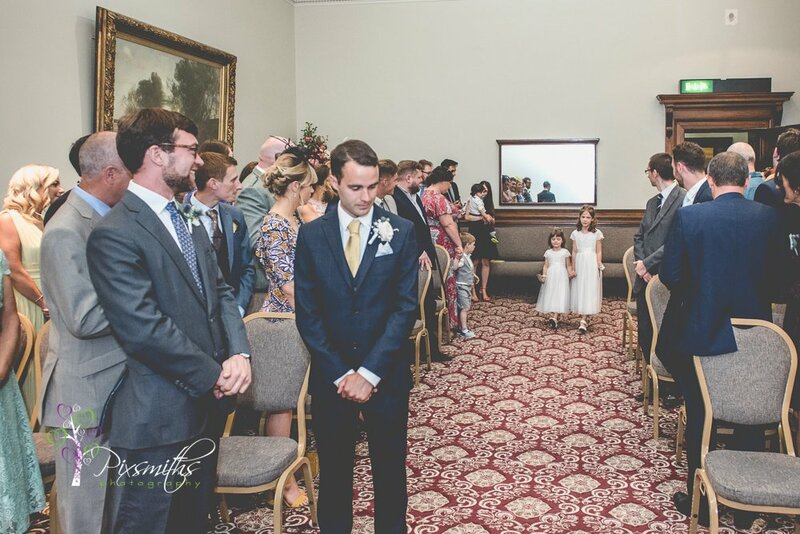 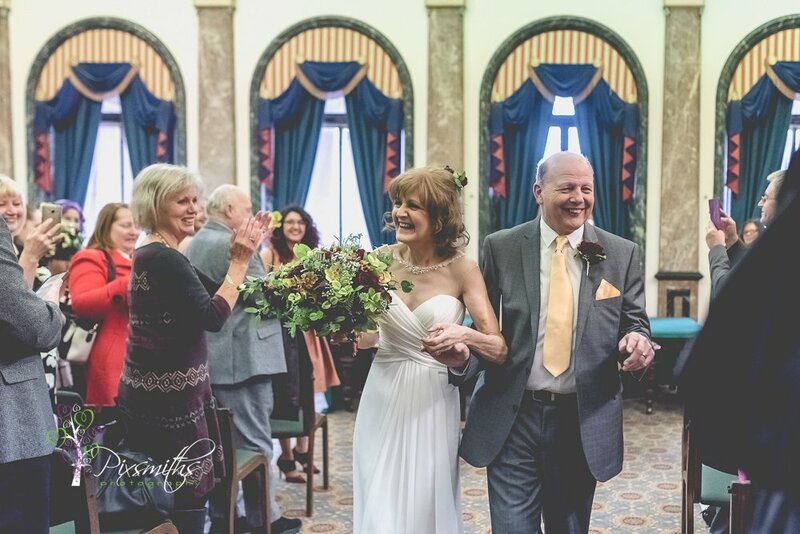 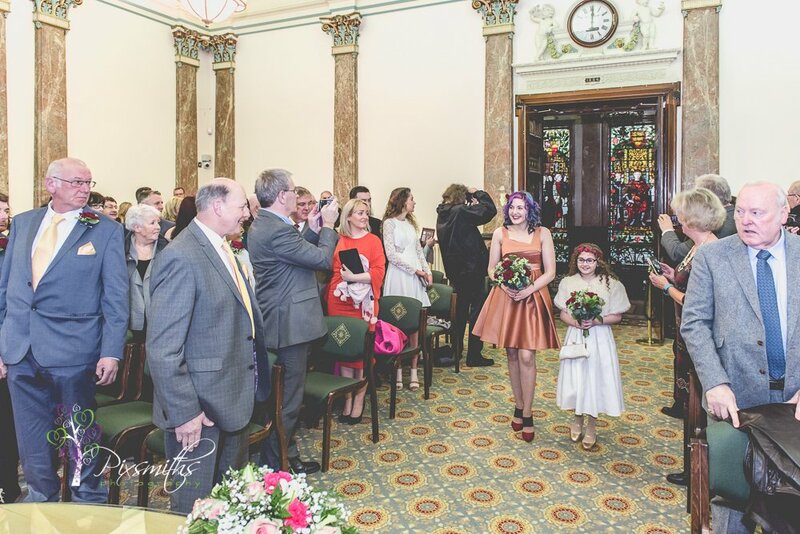 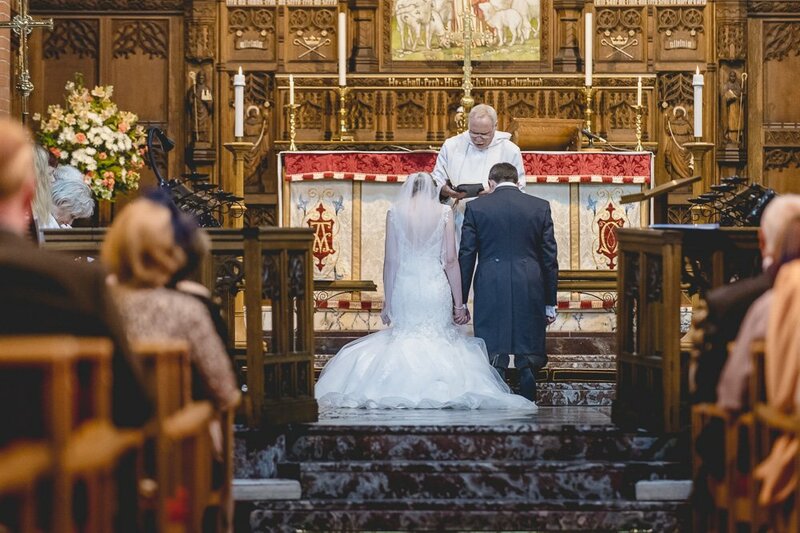 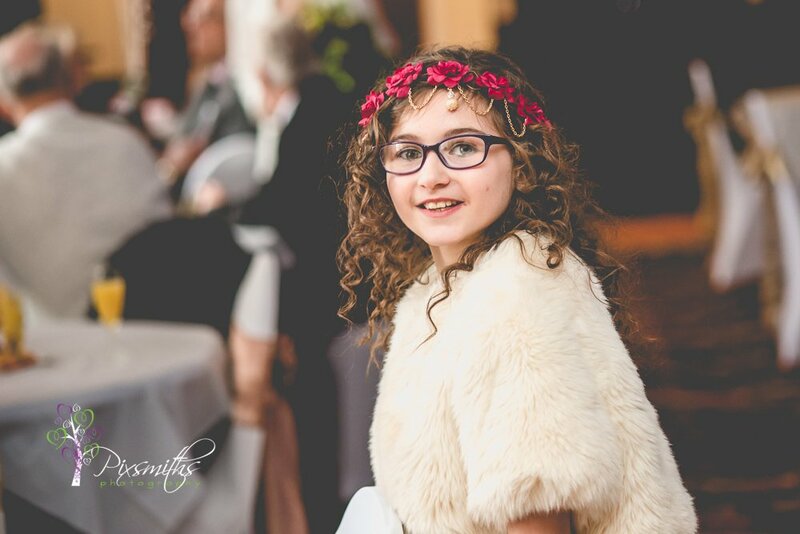 Natasha left tradition behind and walked down the aisle by her self too – very brave of her. 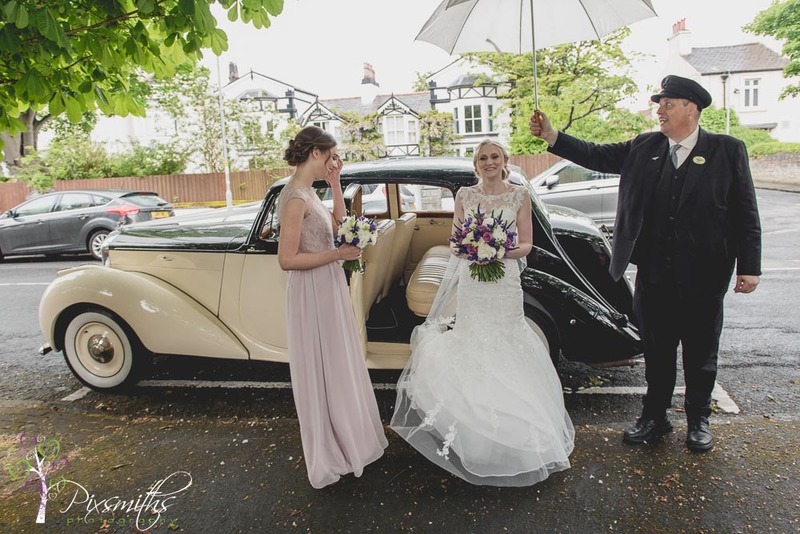 Always good to have indoor and outdoor options for our British weather! 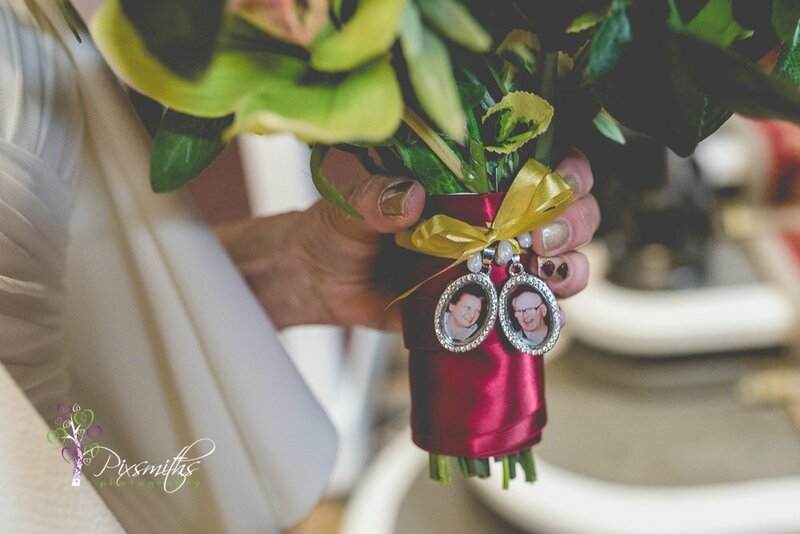 and not forgetting a so scrumptious Squidges cookie table – totally delicious – plus made for an interesting ring shot! 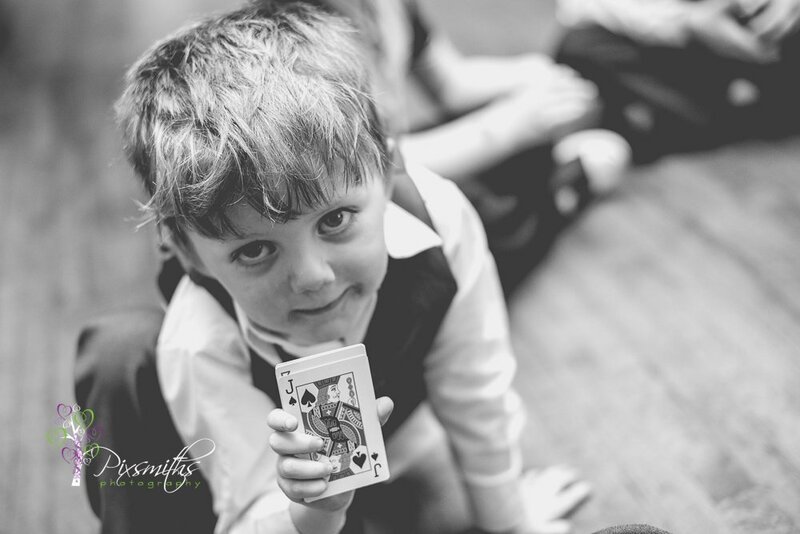 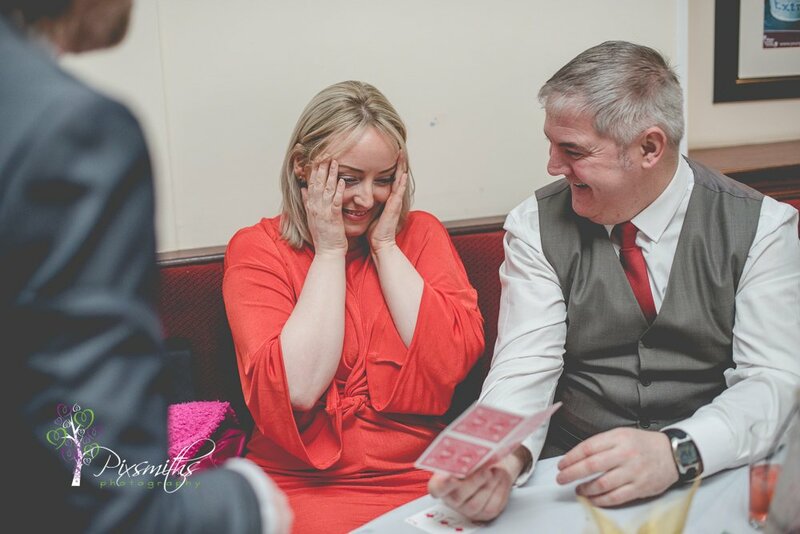 Entertainment was provide by Mike the Magician who wowed his audience as always with his tricks. 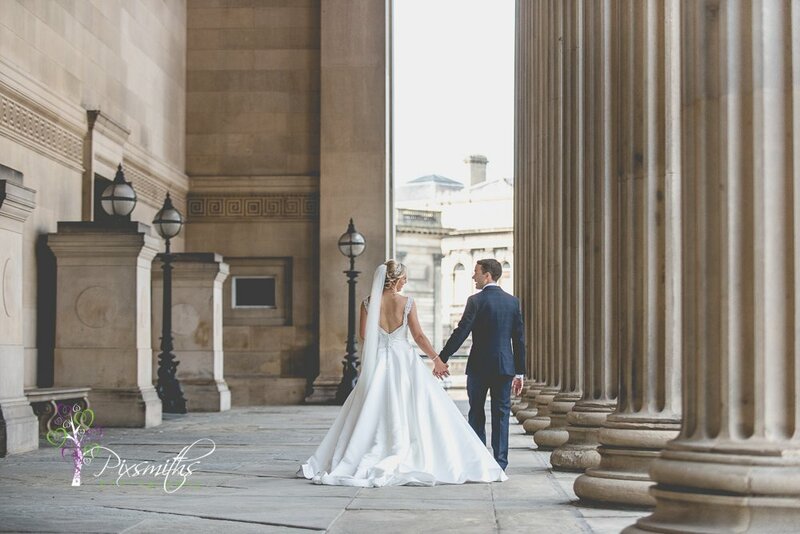 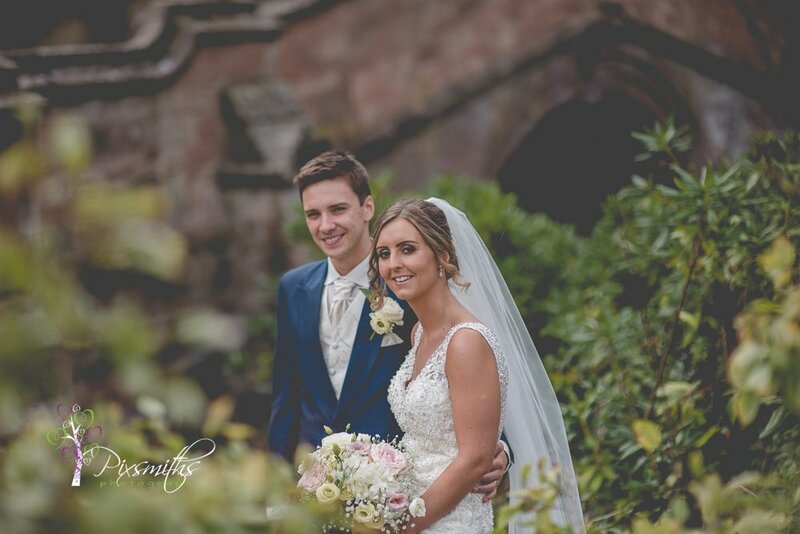 Thank you Natasha and Alex – it was a pleasure to cover your wedding and we wish you much happiness and health for the future . 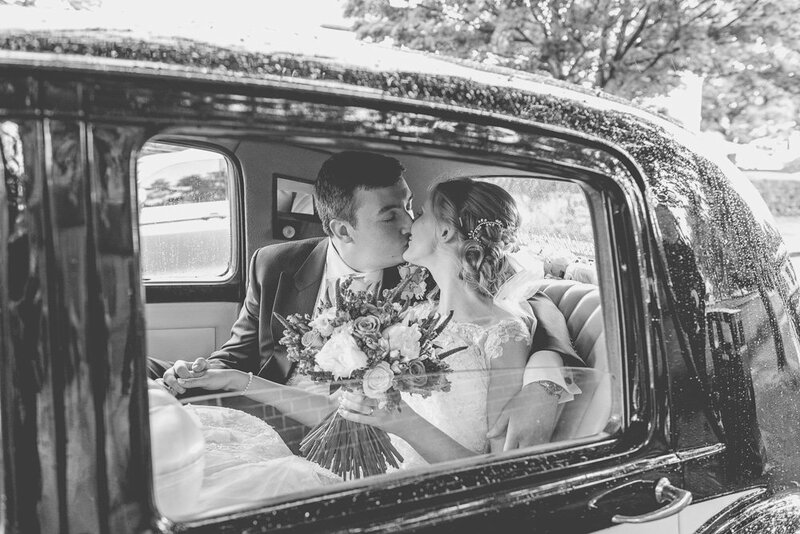 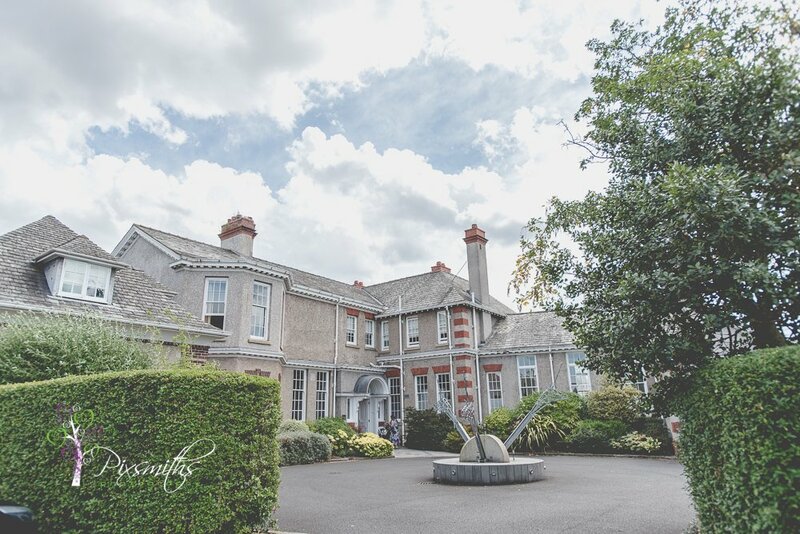 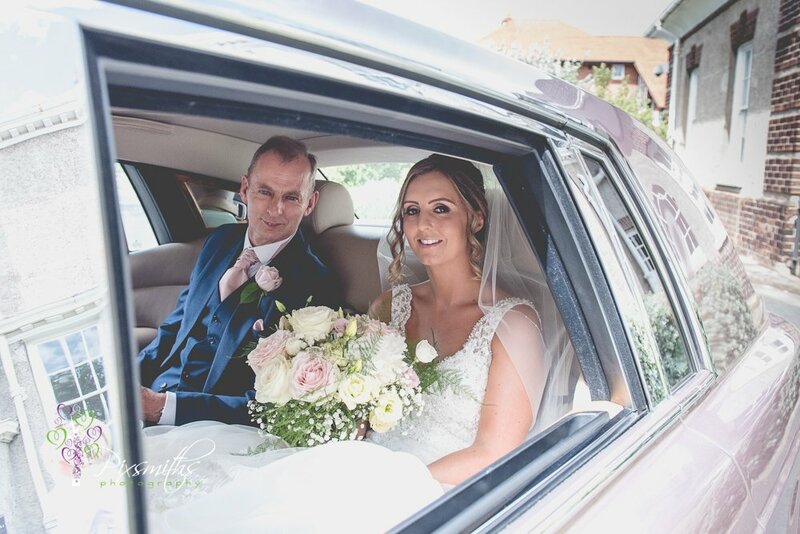 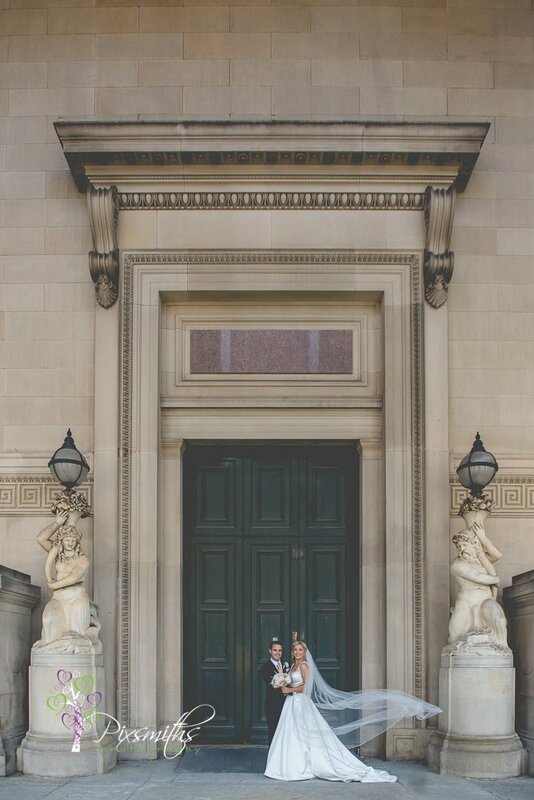 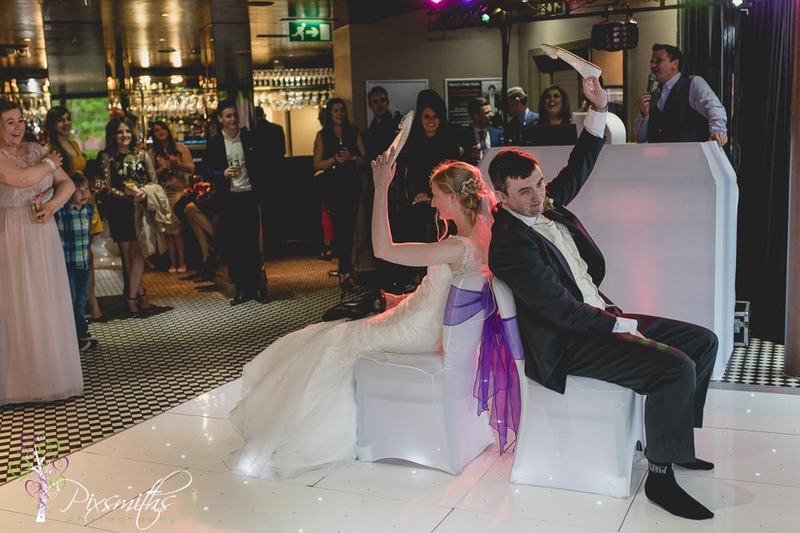 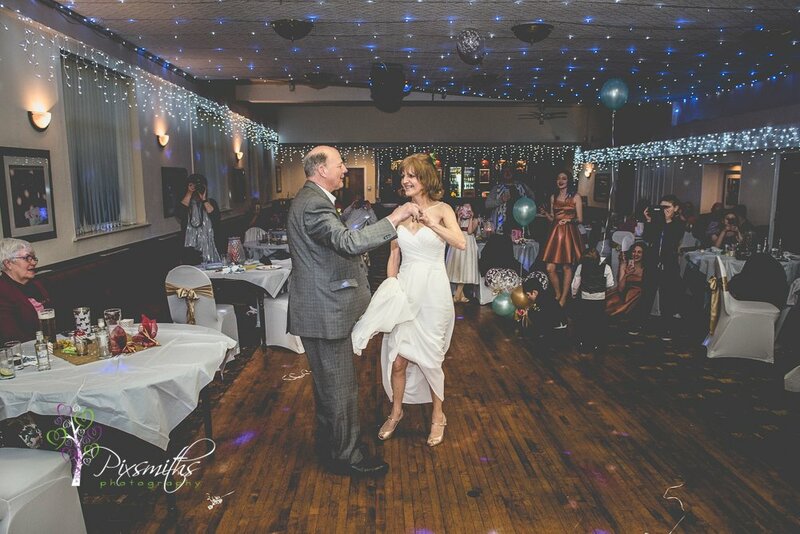 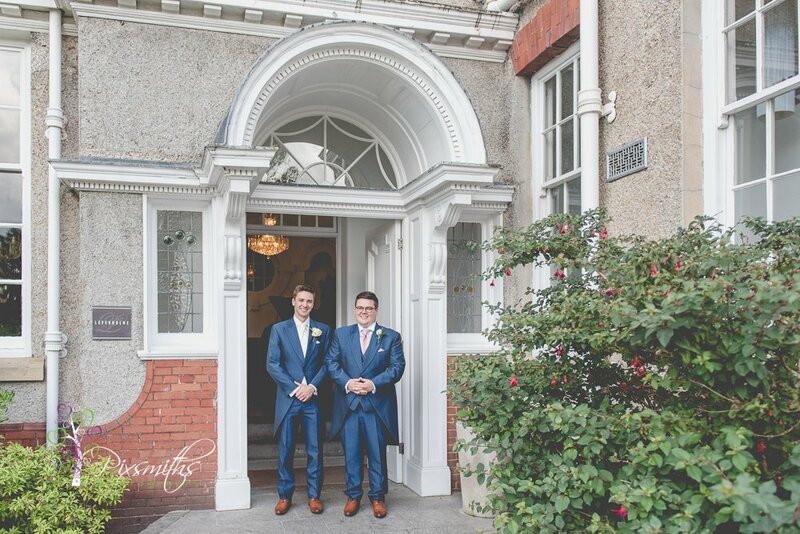 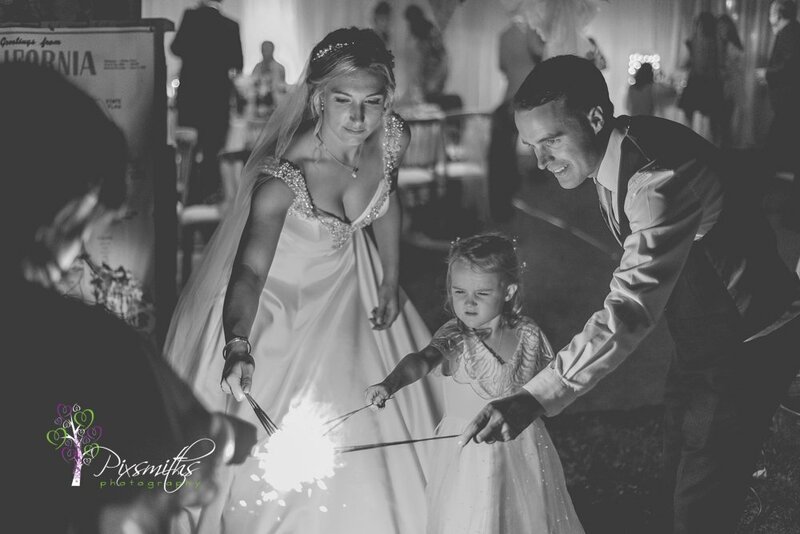 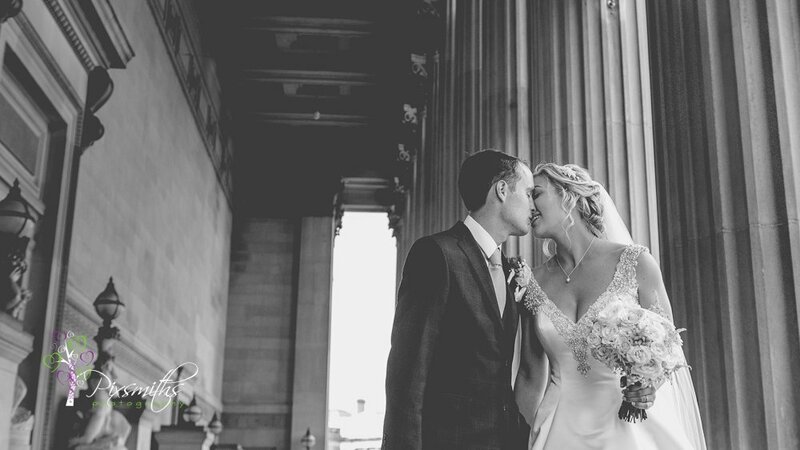 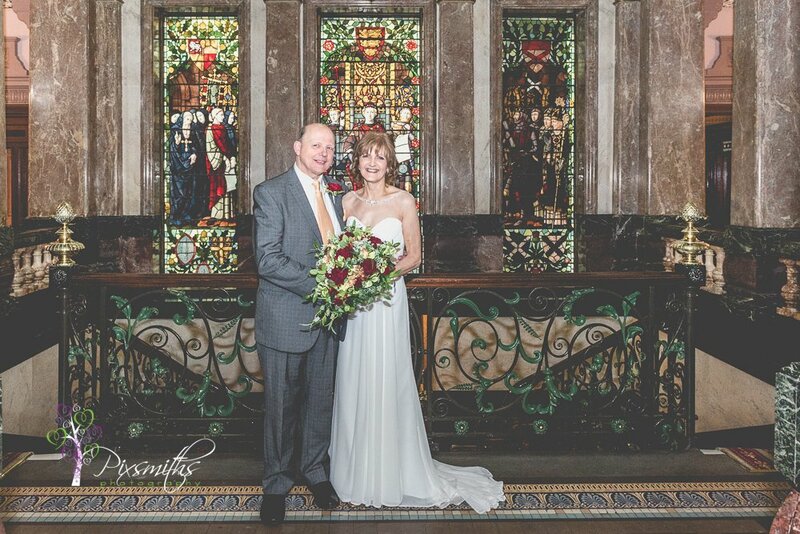 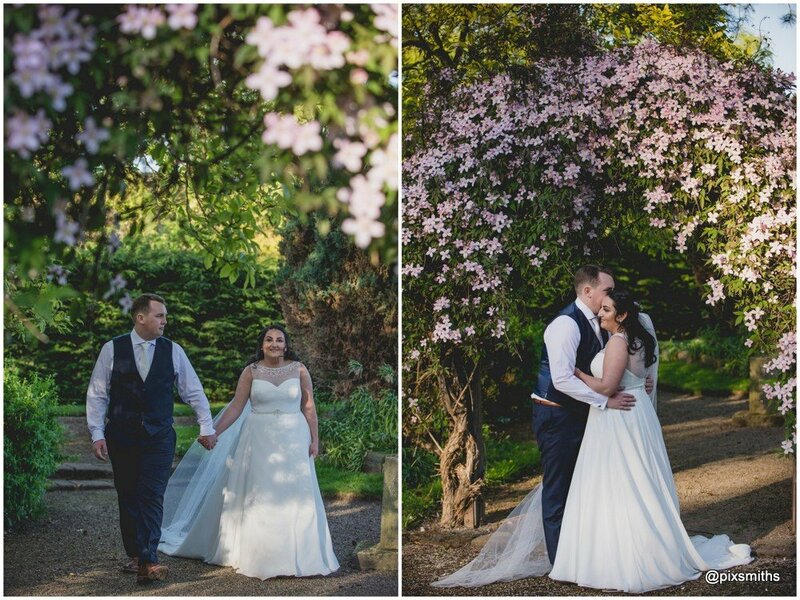 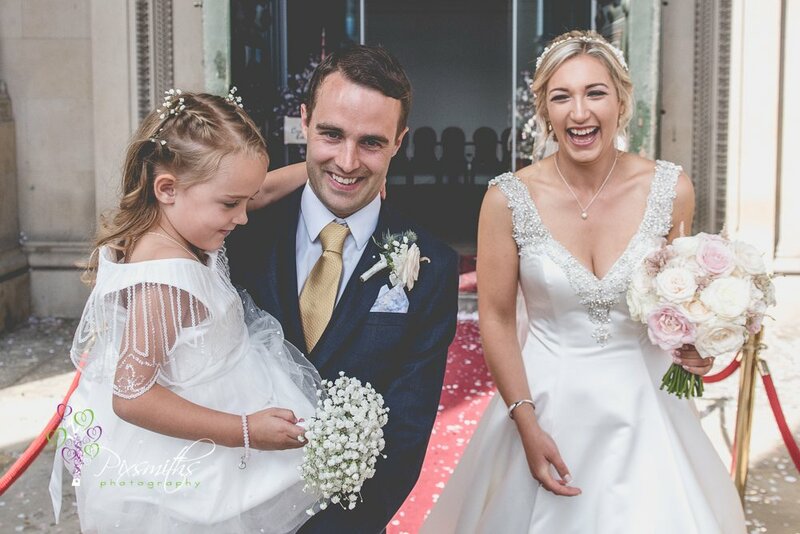 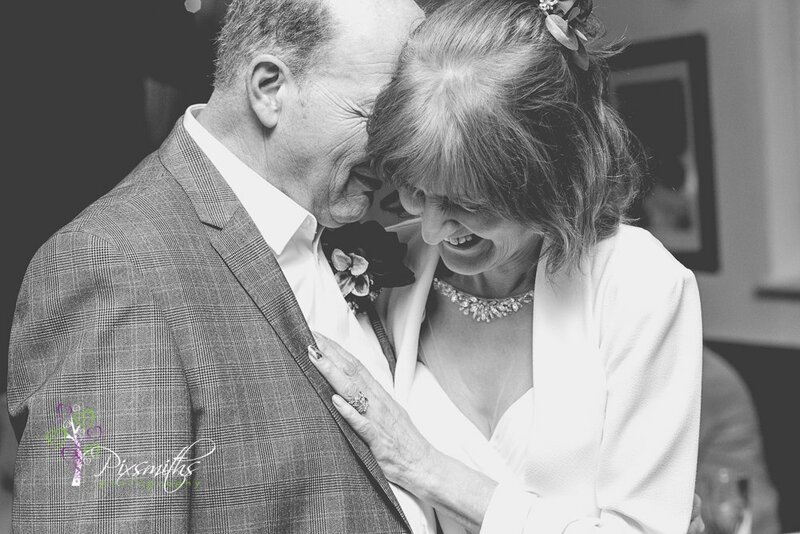 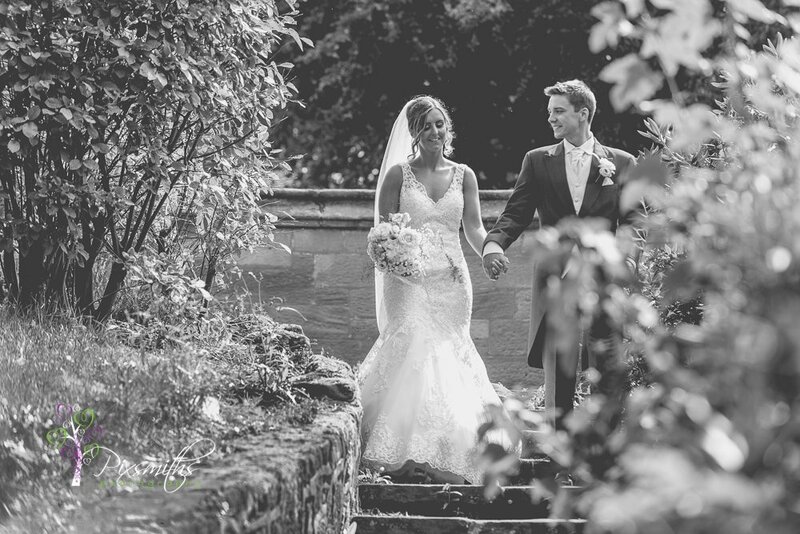 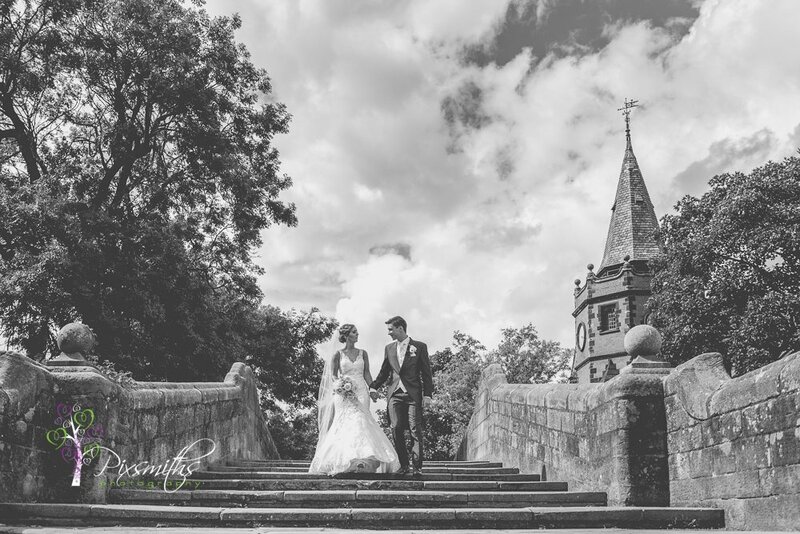 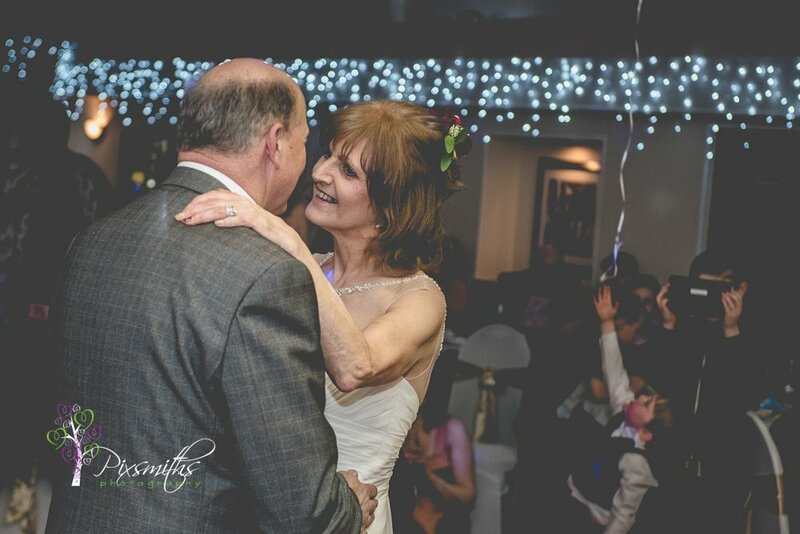 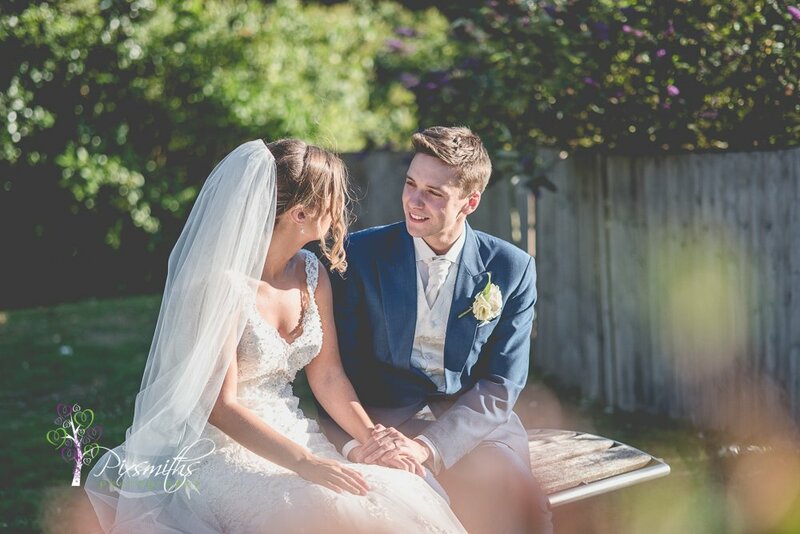 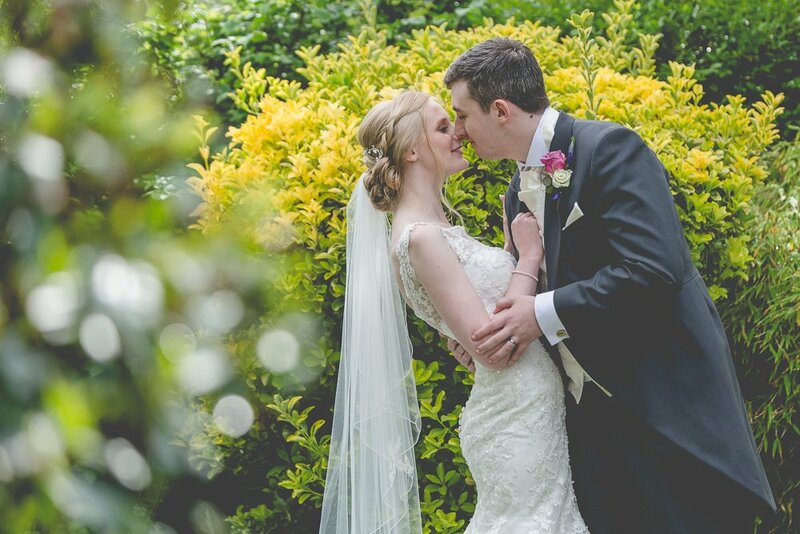 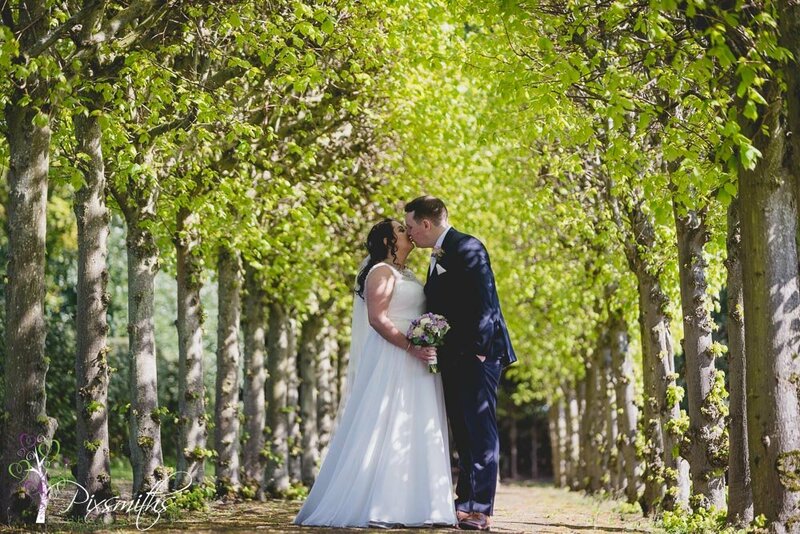 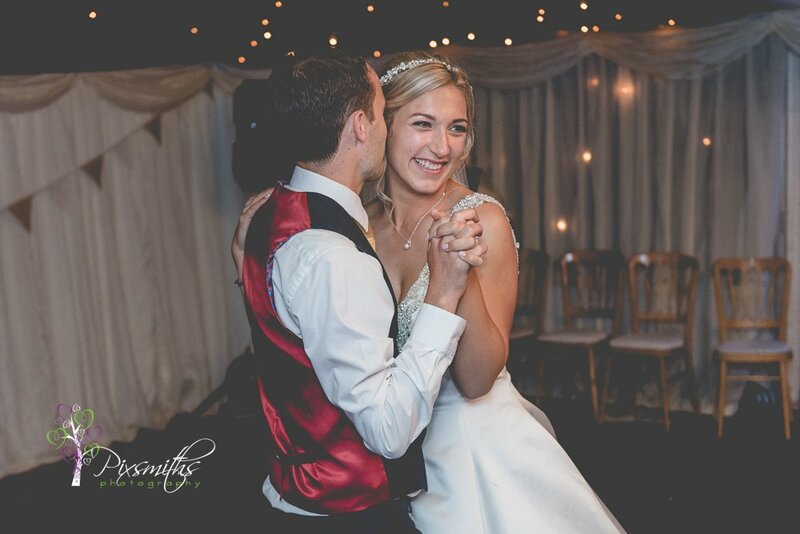 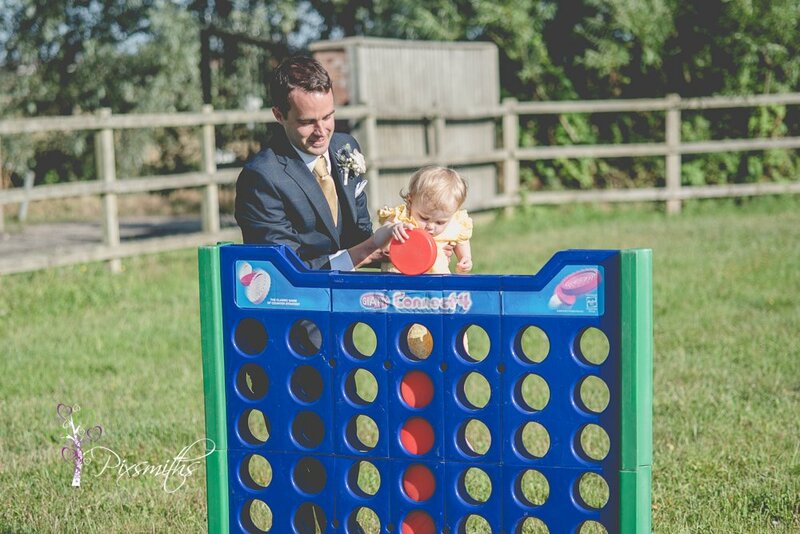 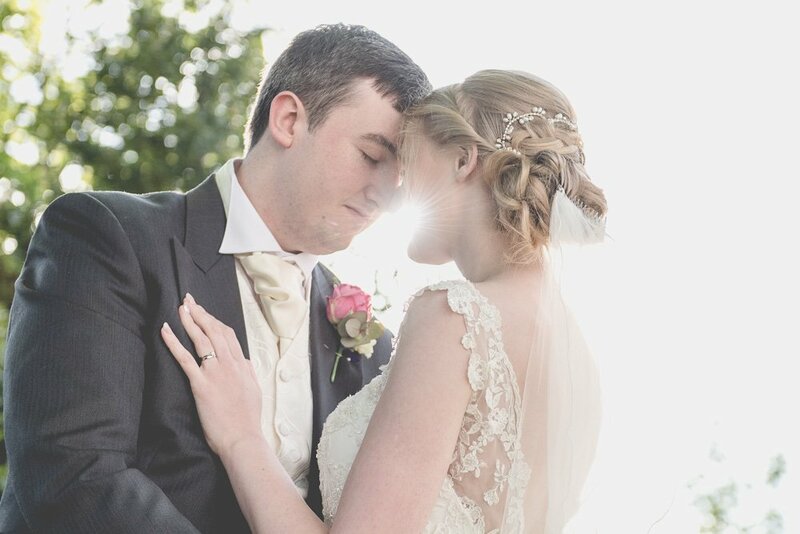 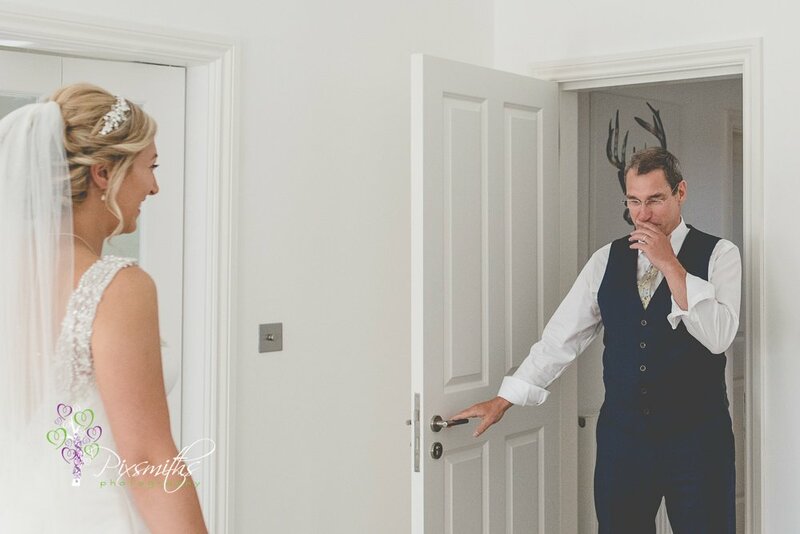 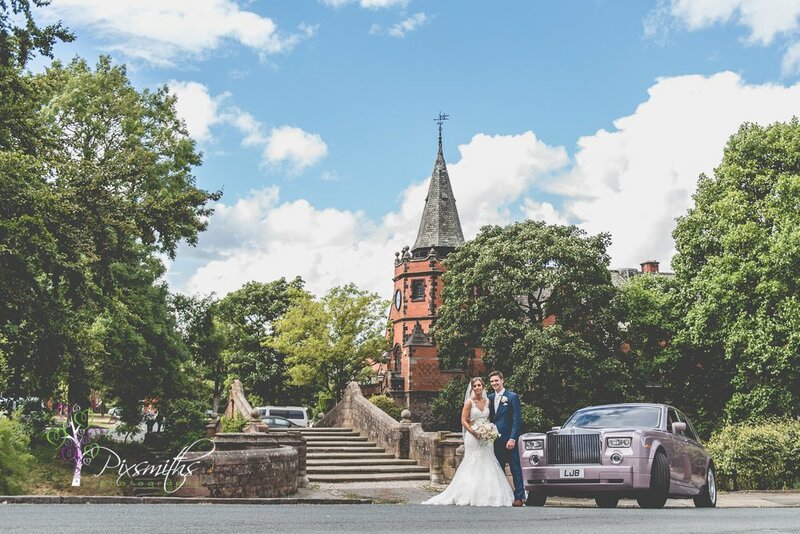 We were so delighted that peter and Emily asked Pixsmiths to be their Thornton Manor wedding photographer. 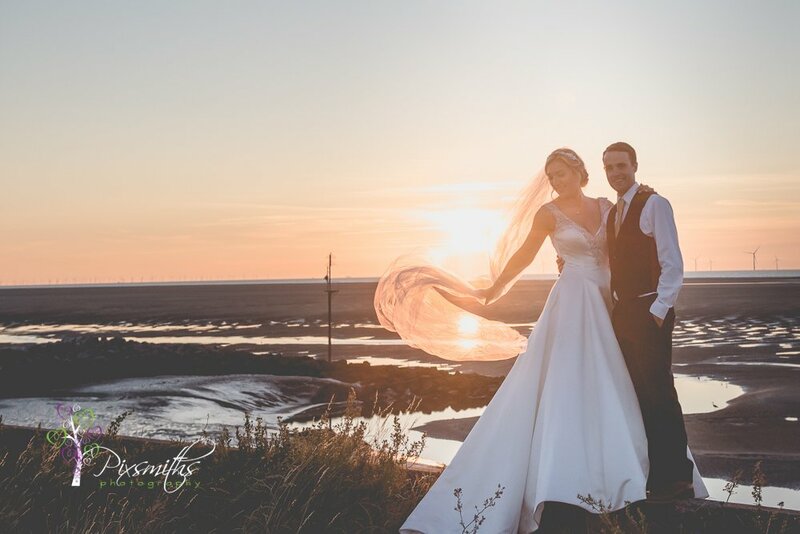 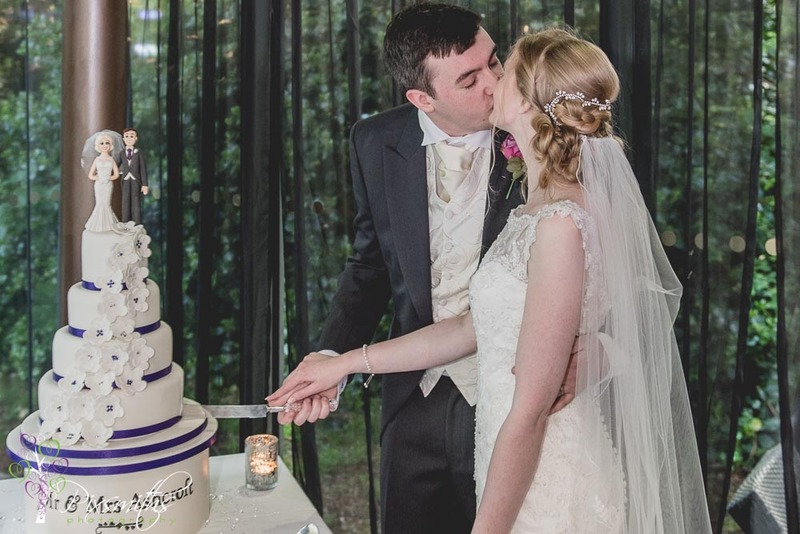 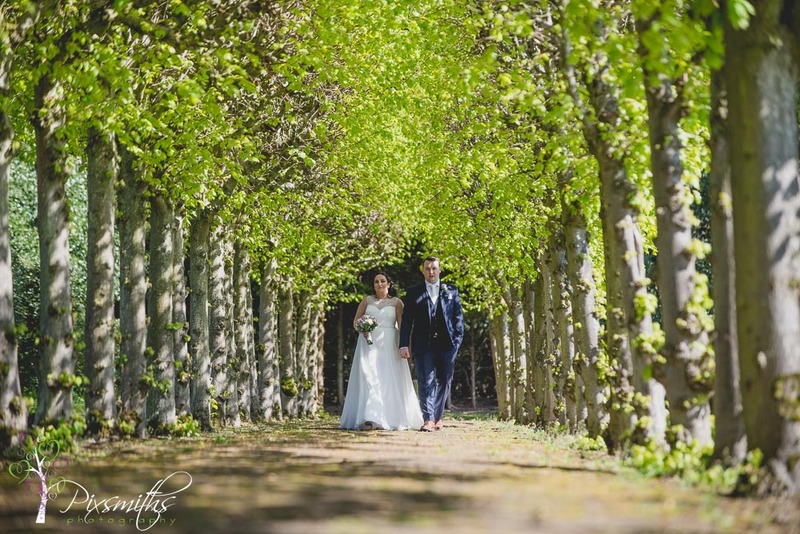 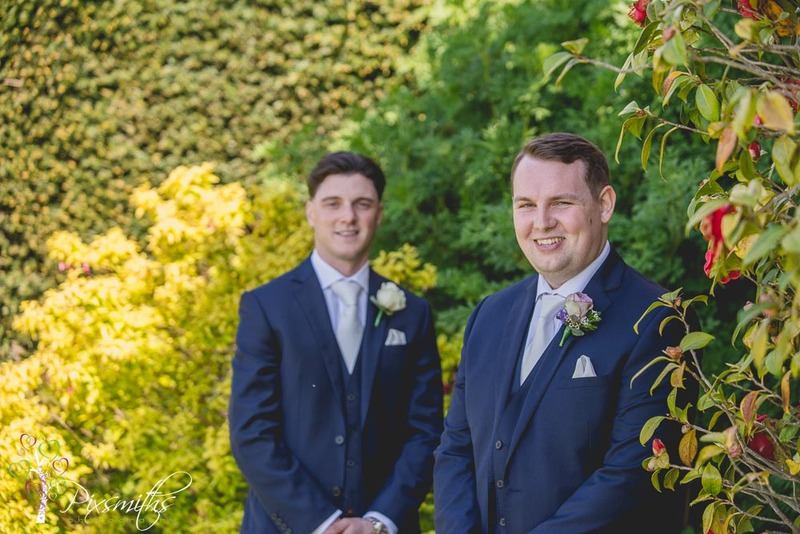 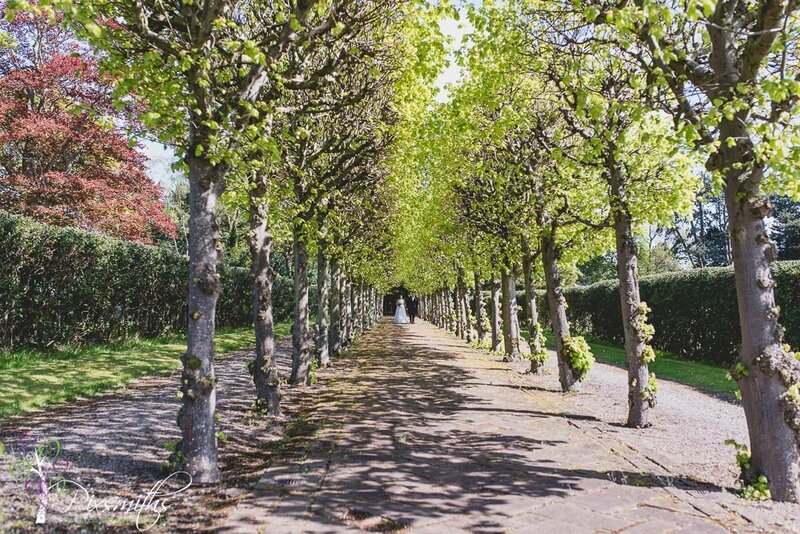 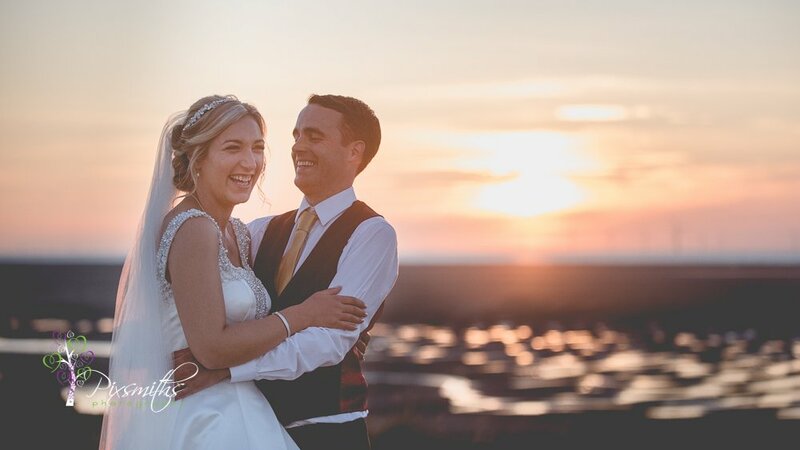 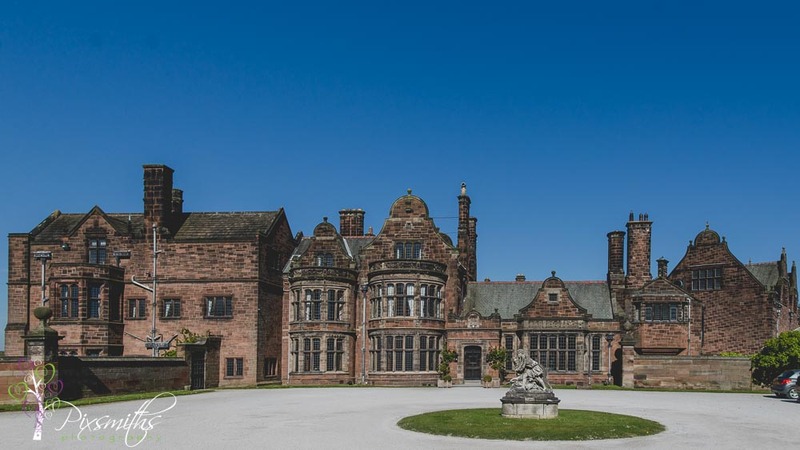 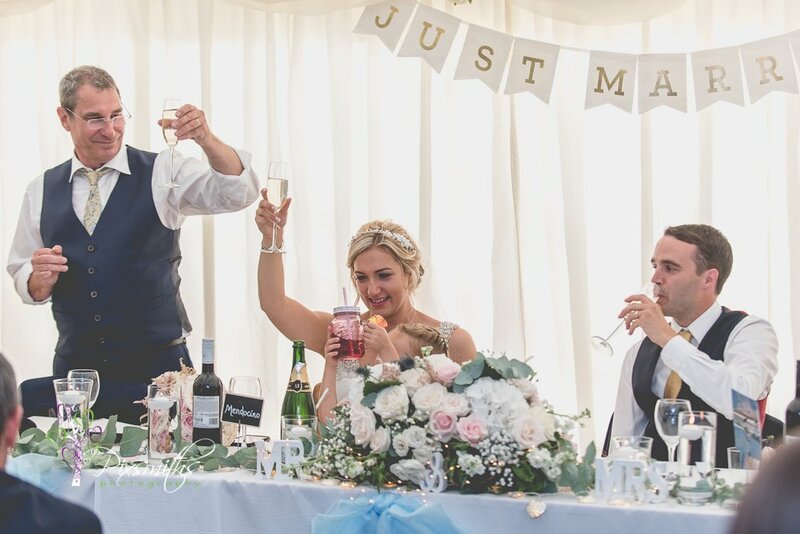 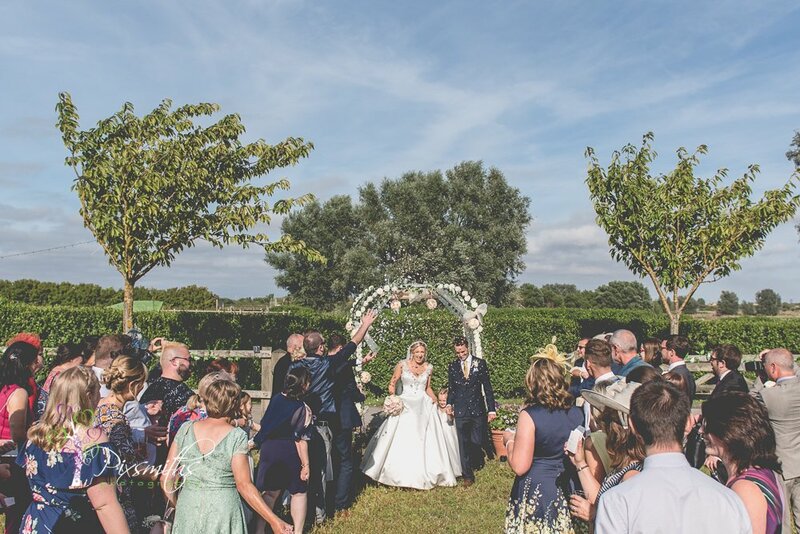 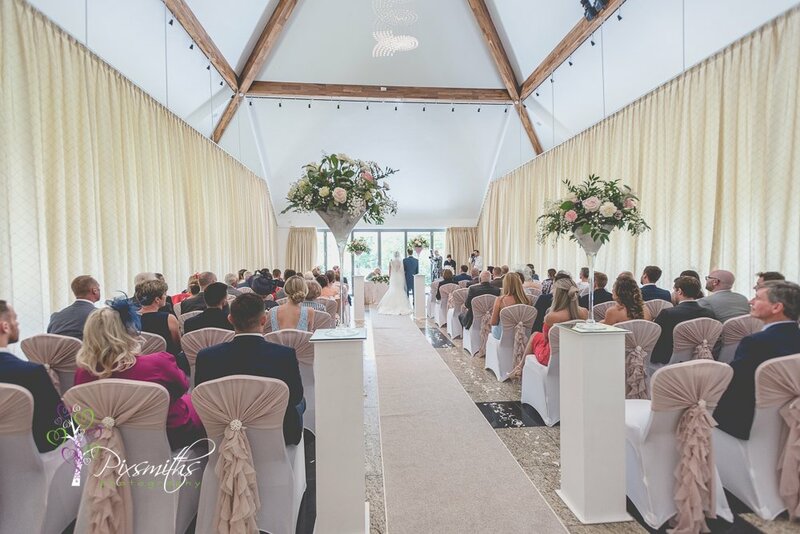 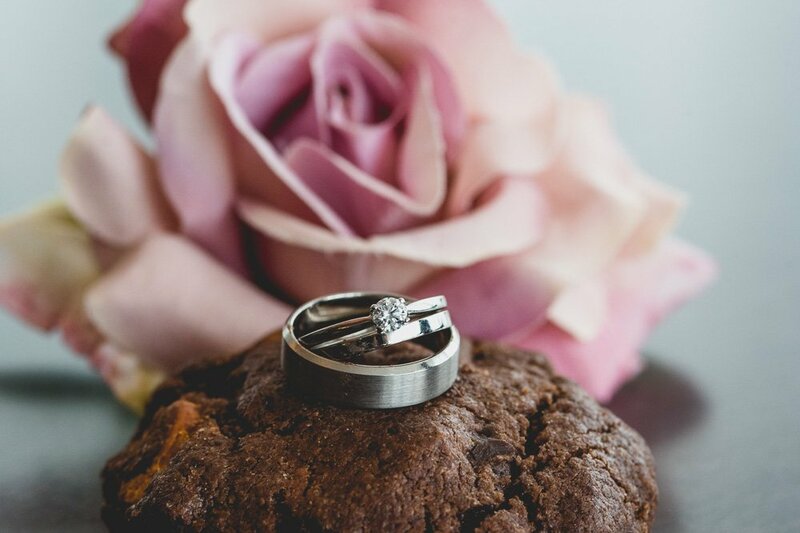 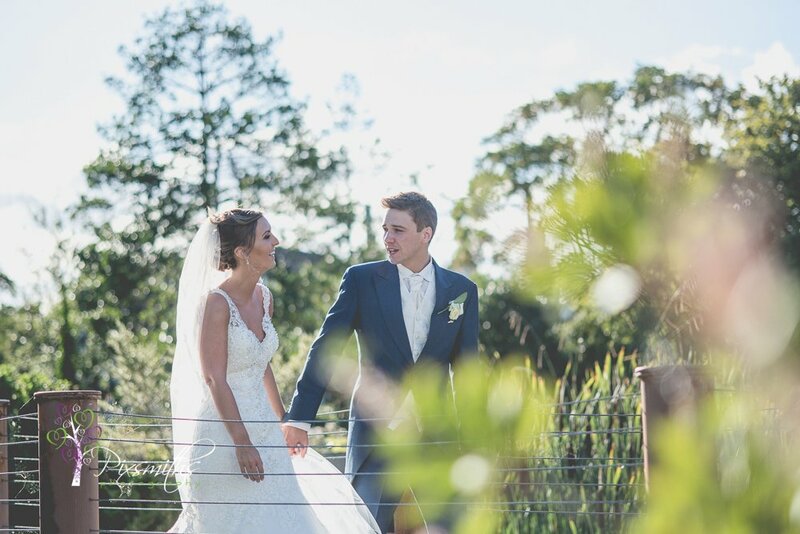 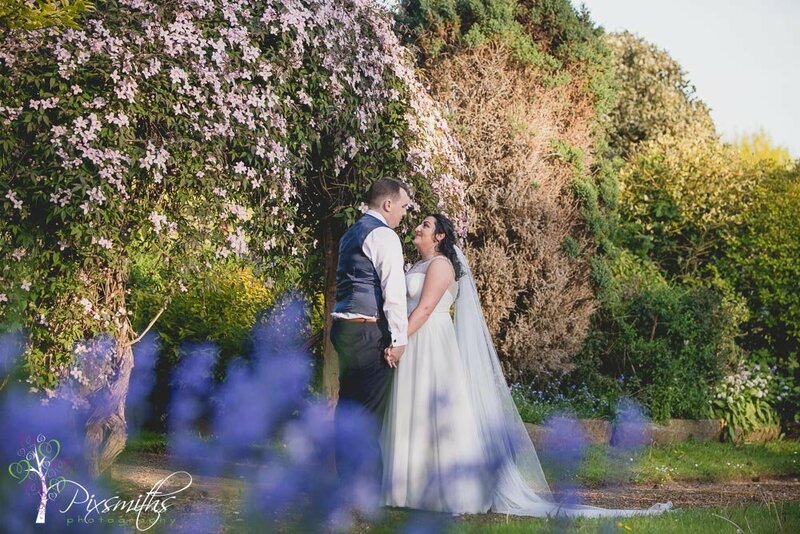 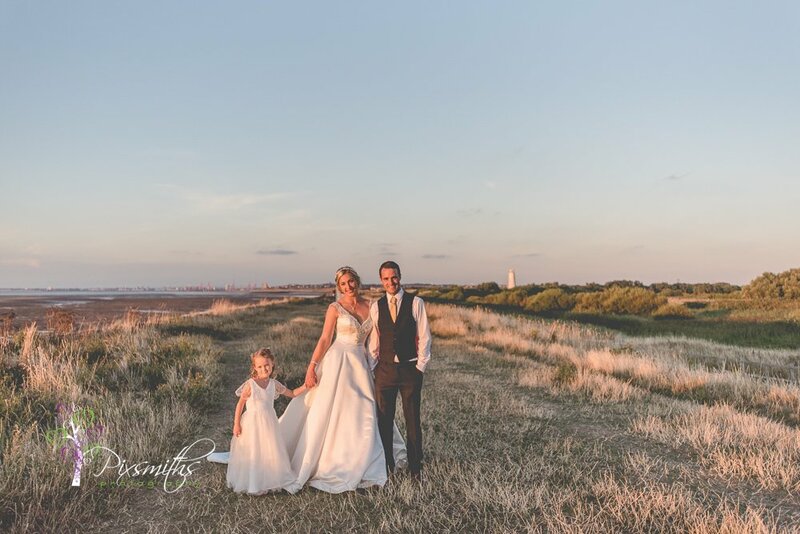 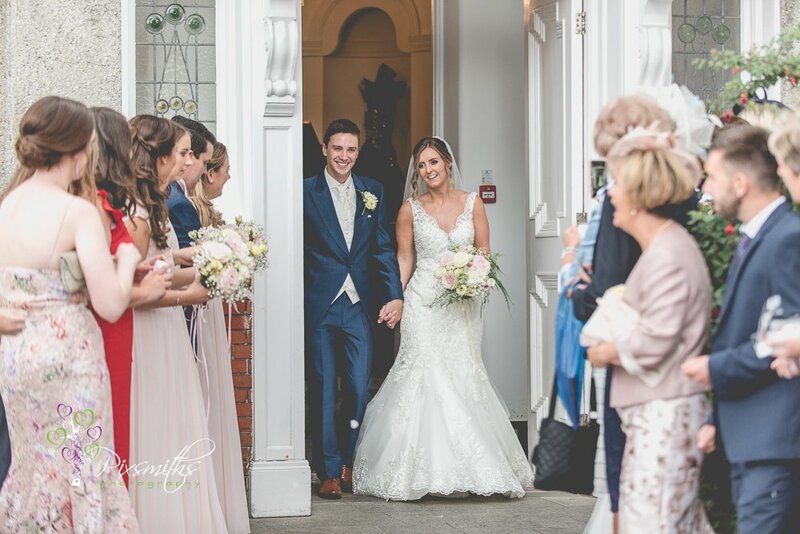 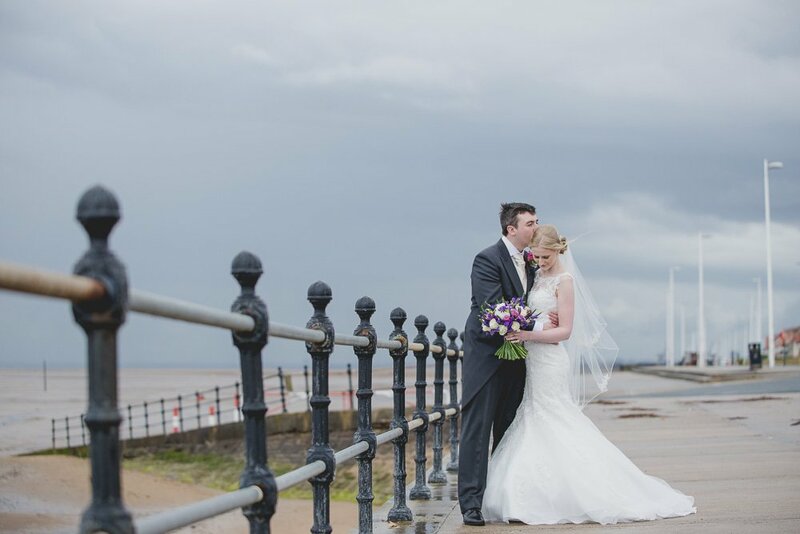 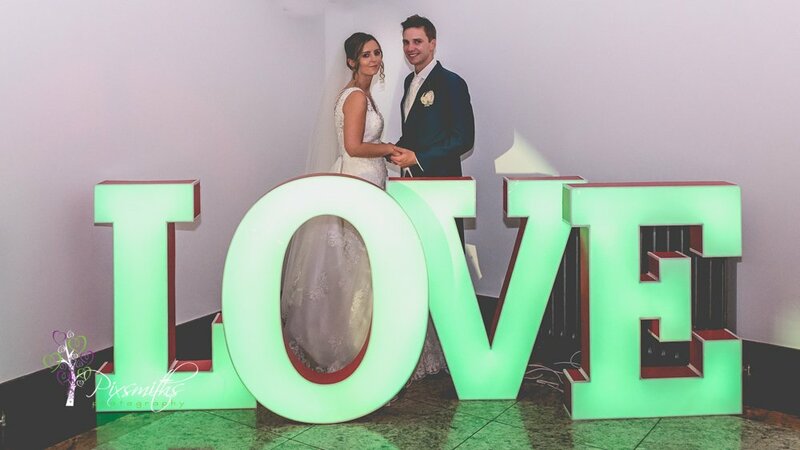 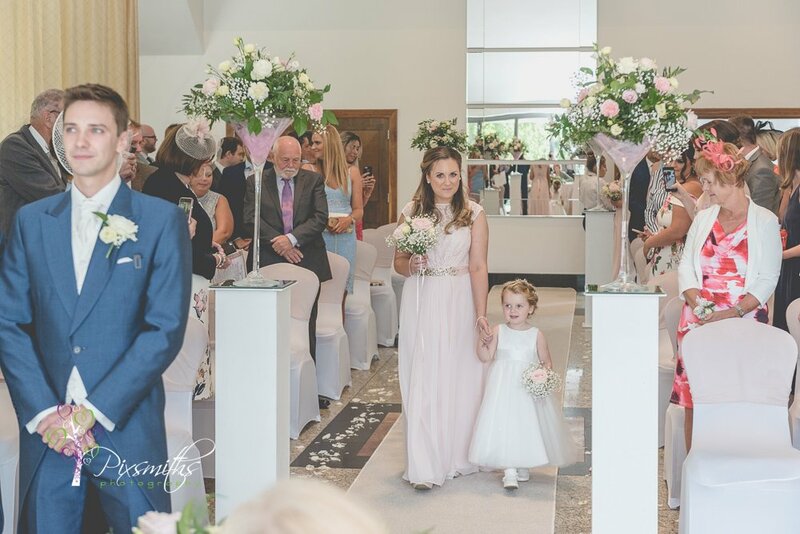 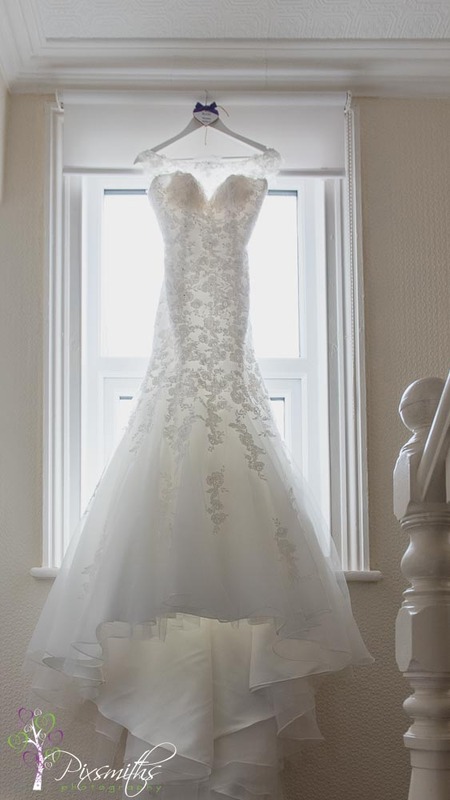 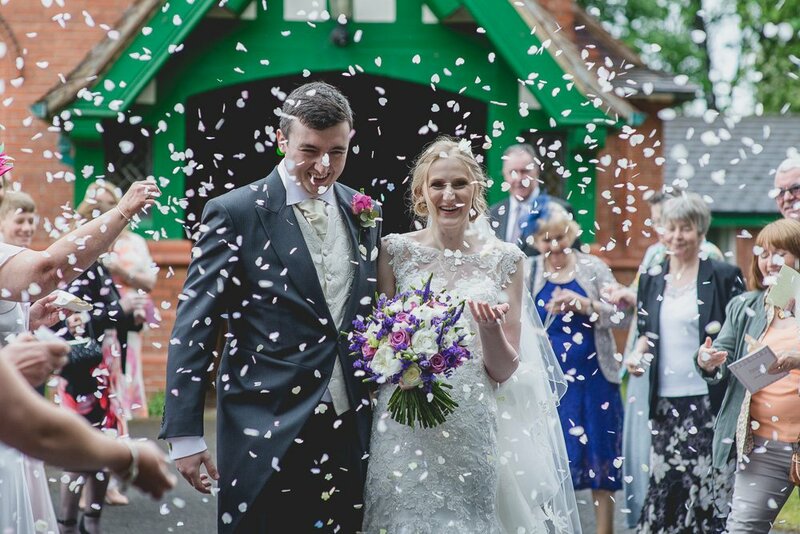 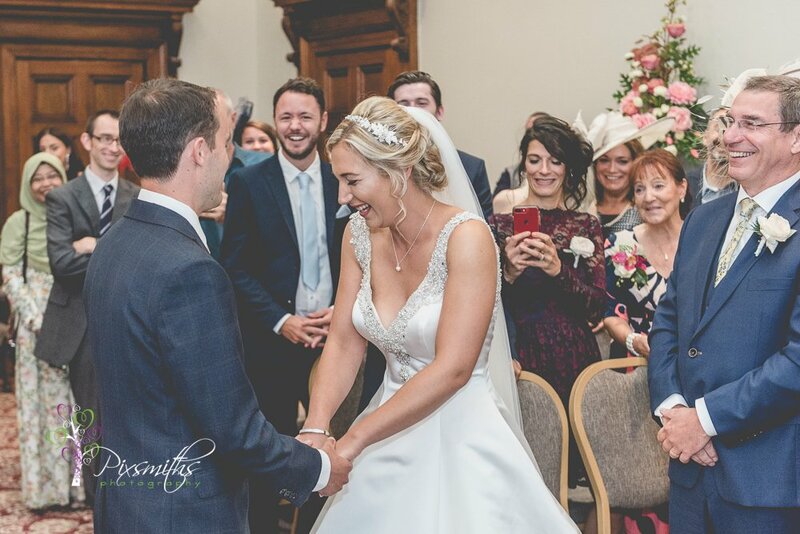 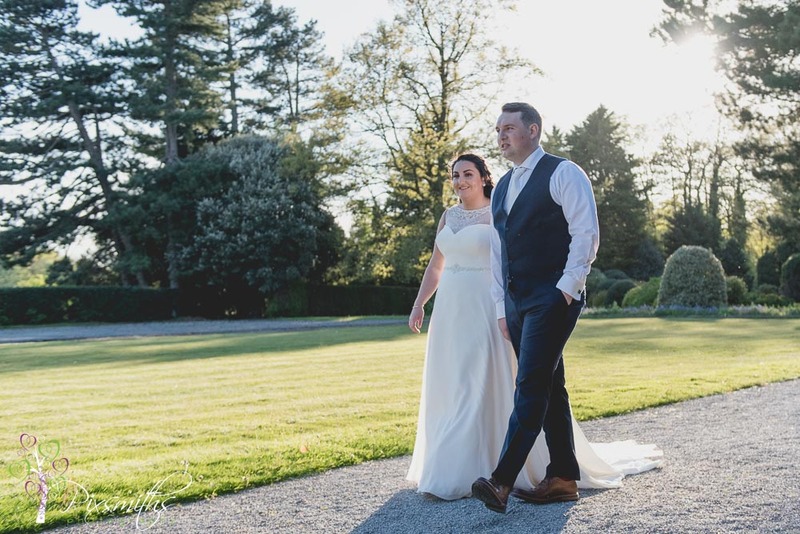 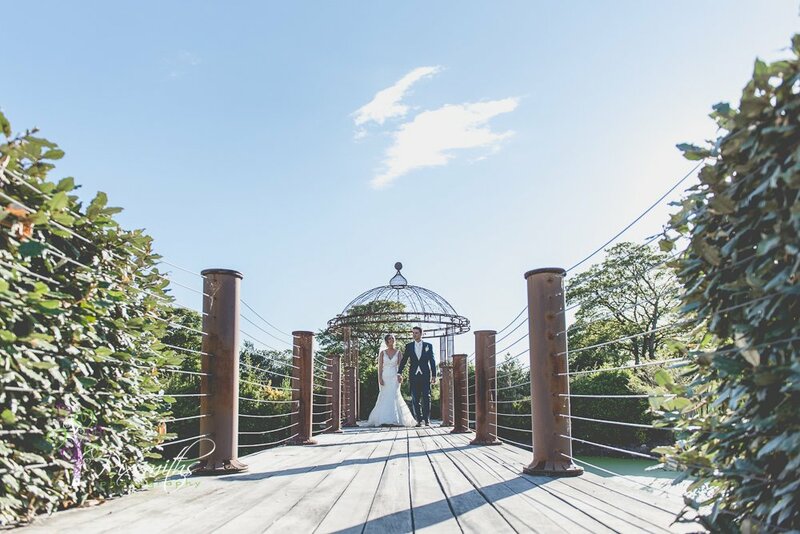 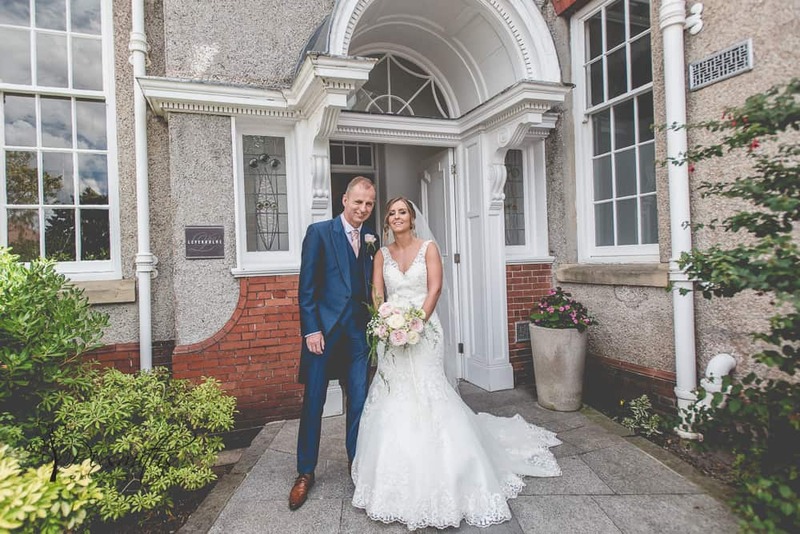 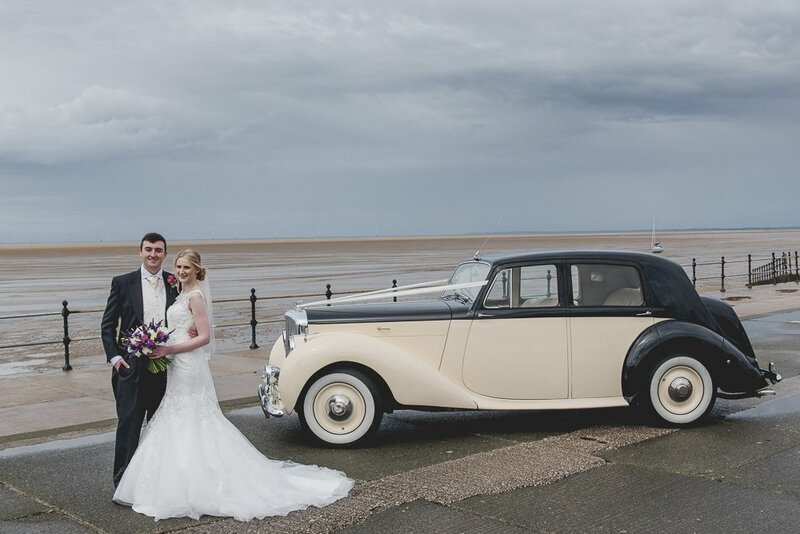 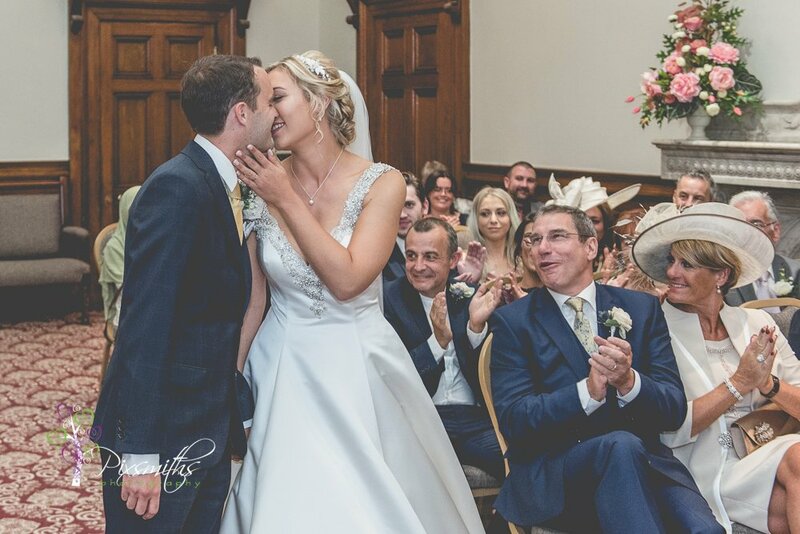 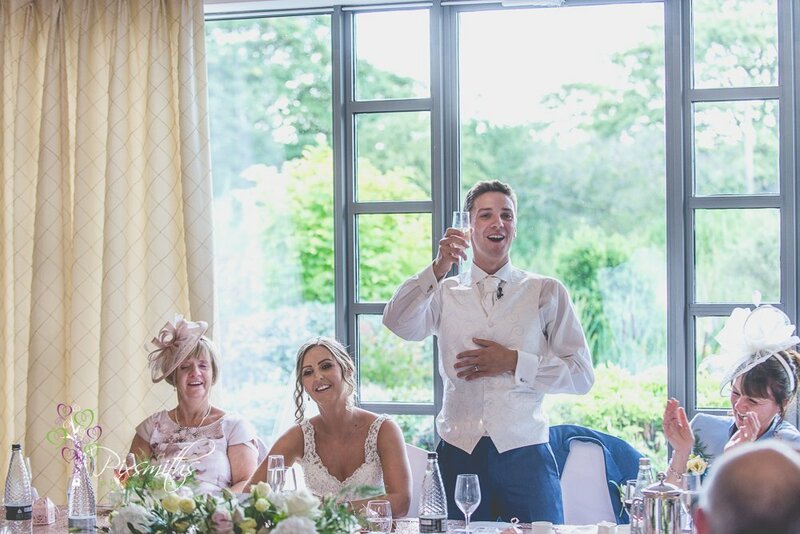 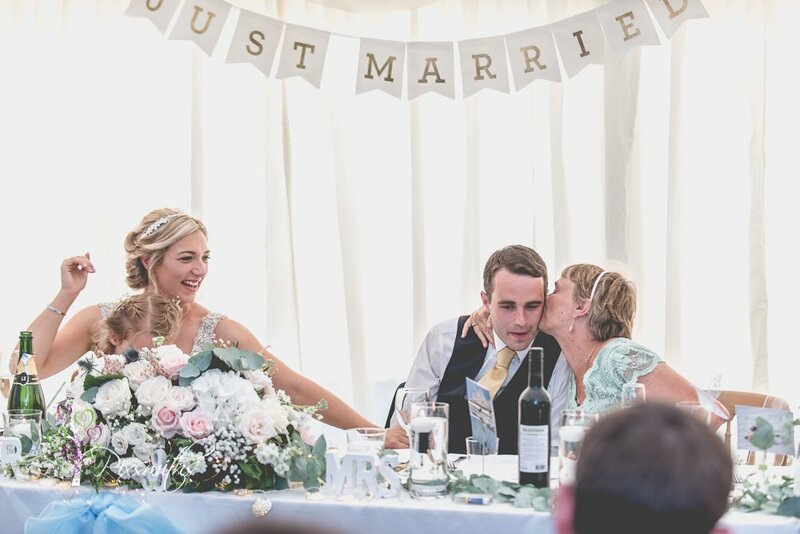 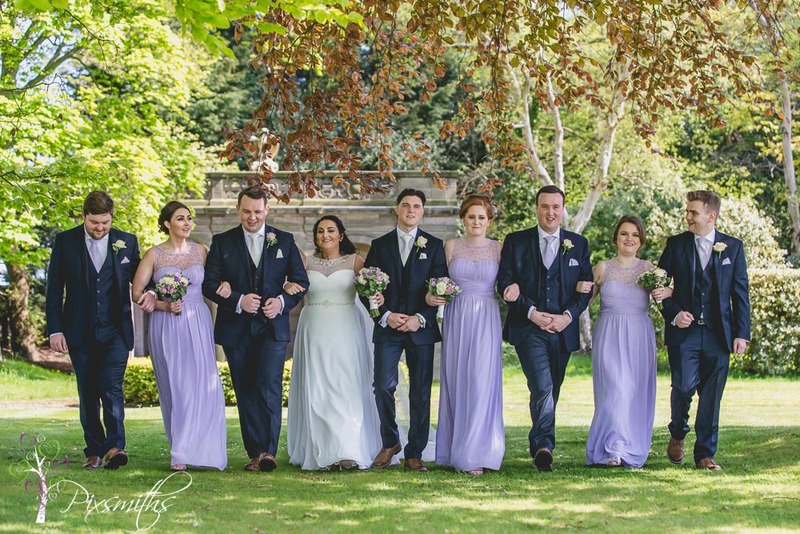 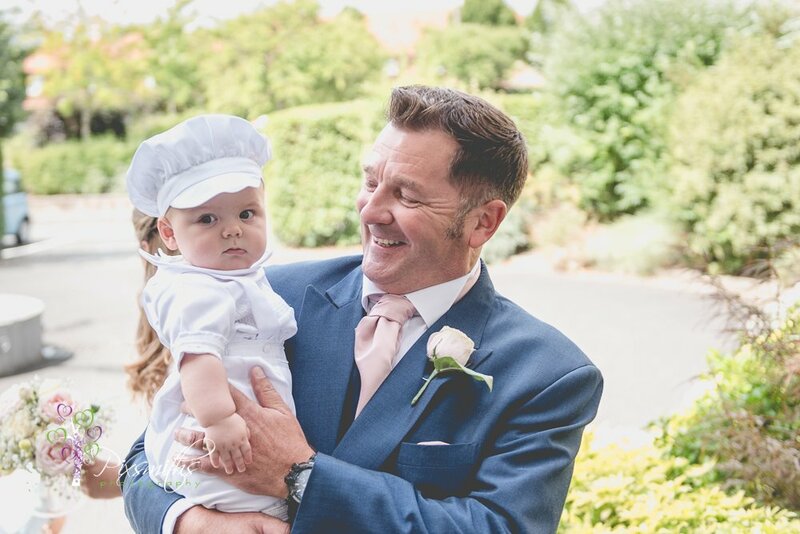 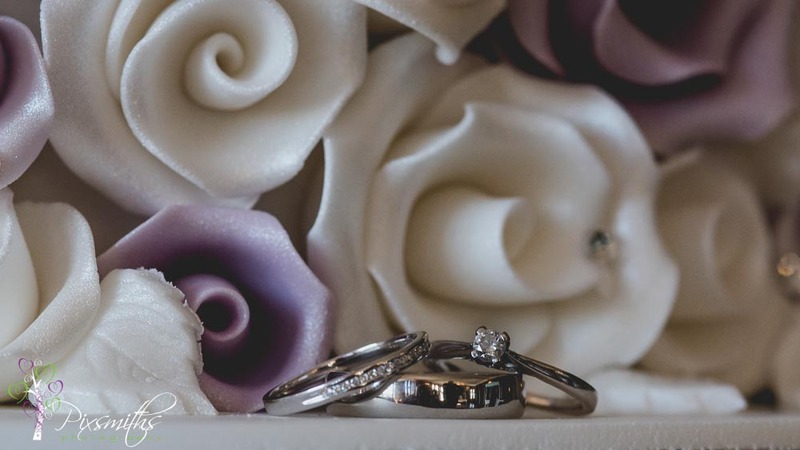 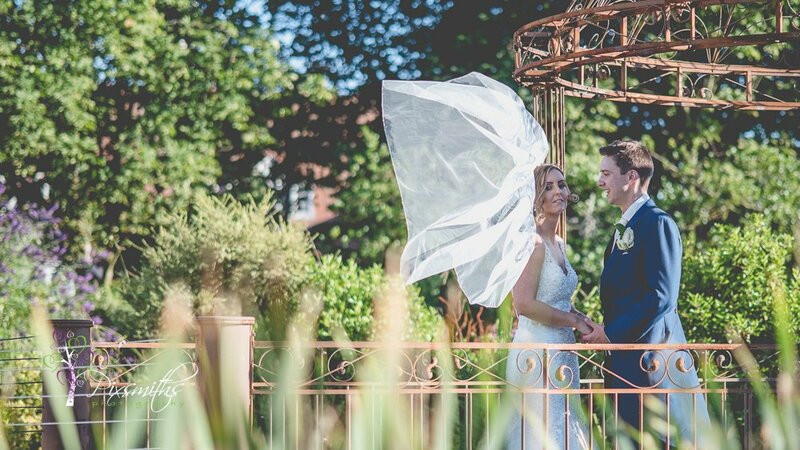 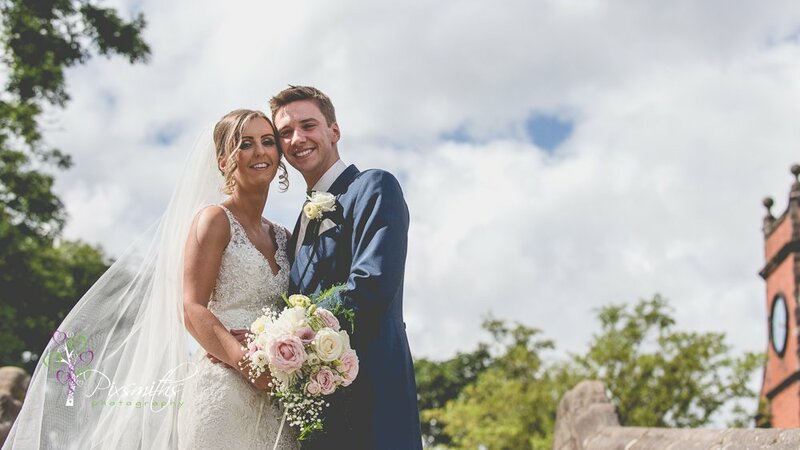 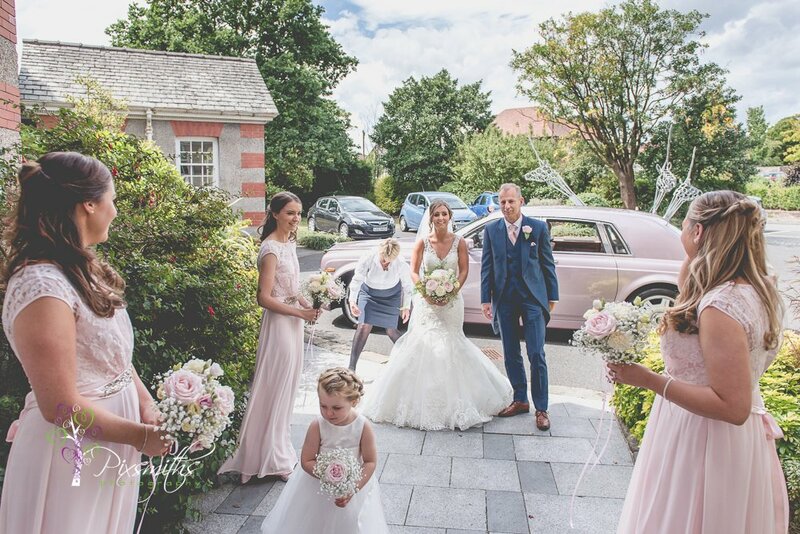 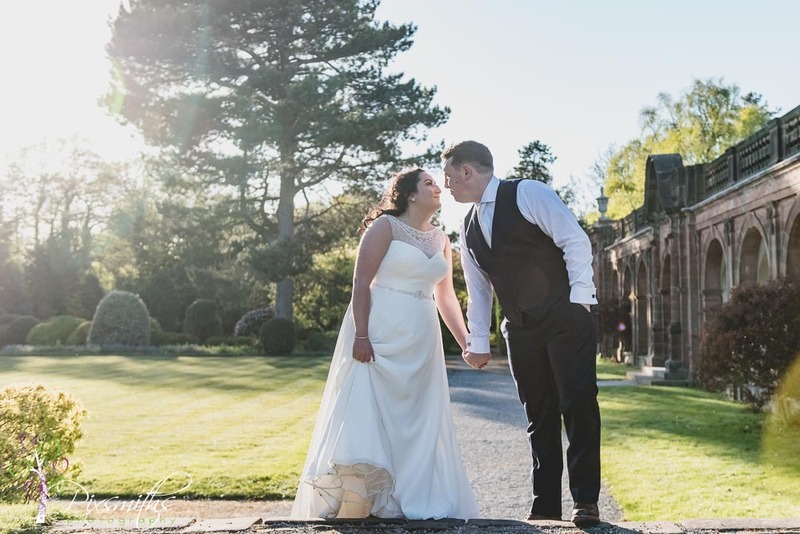 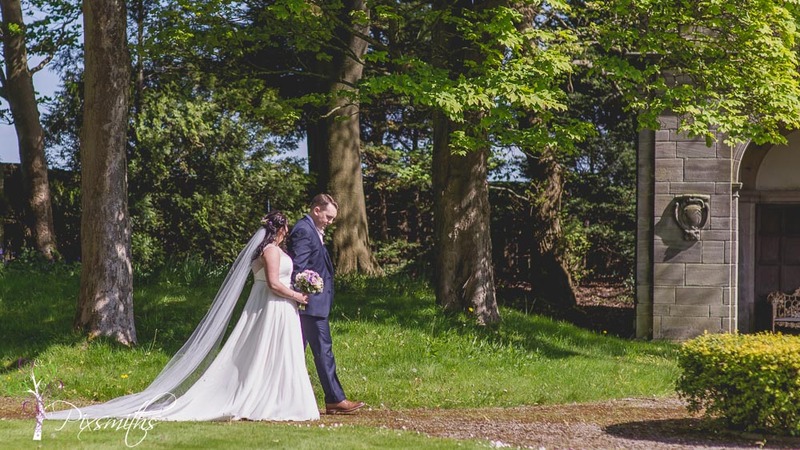 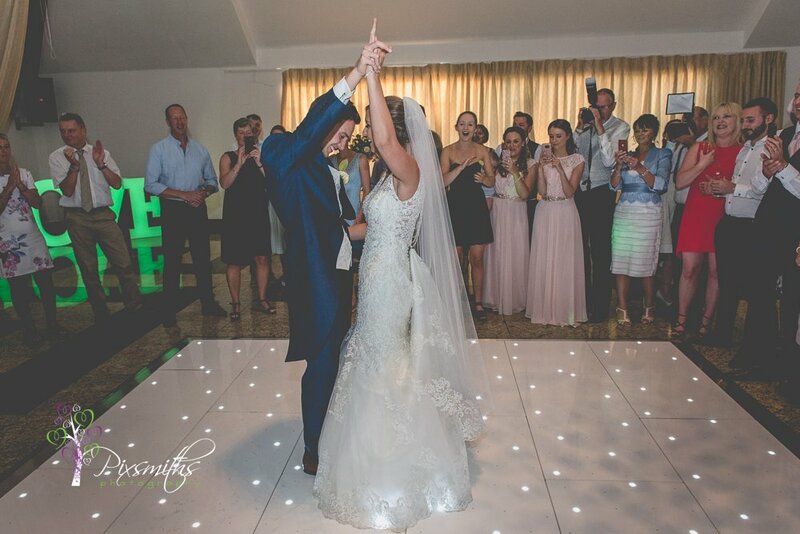 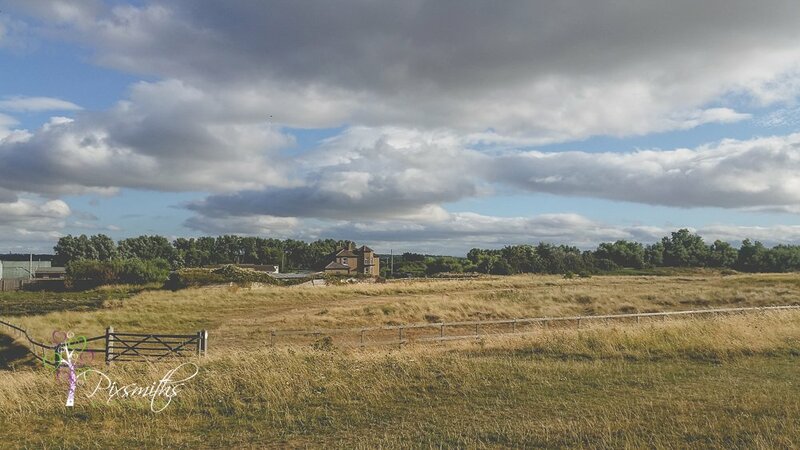 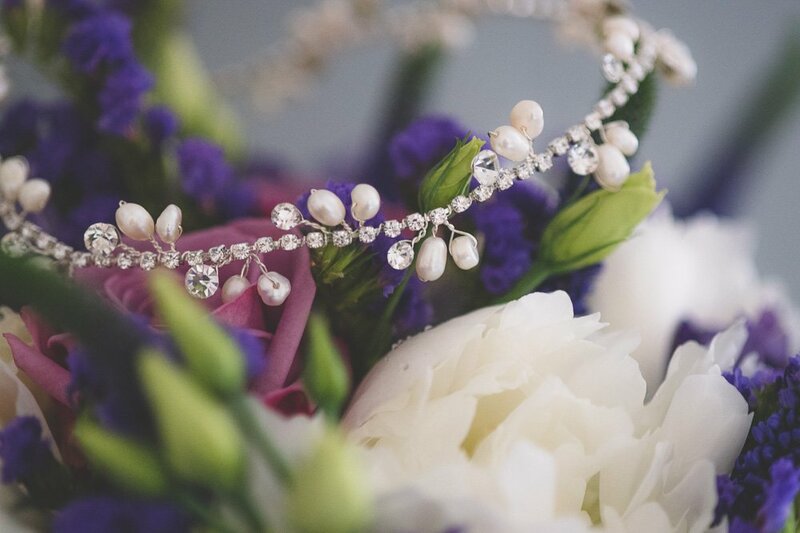 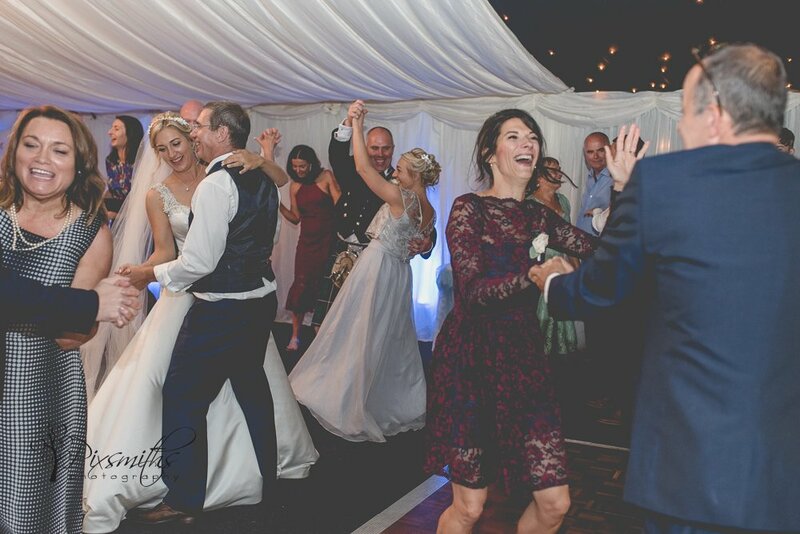 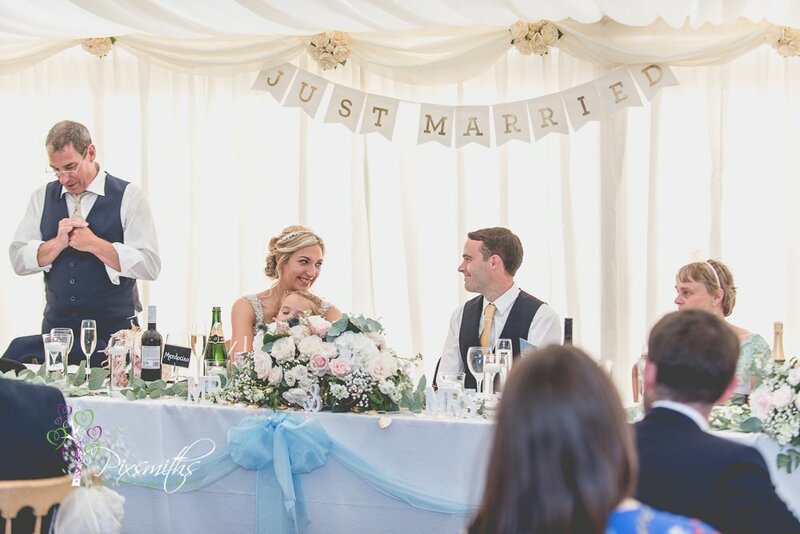 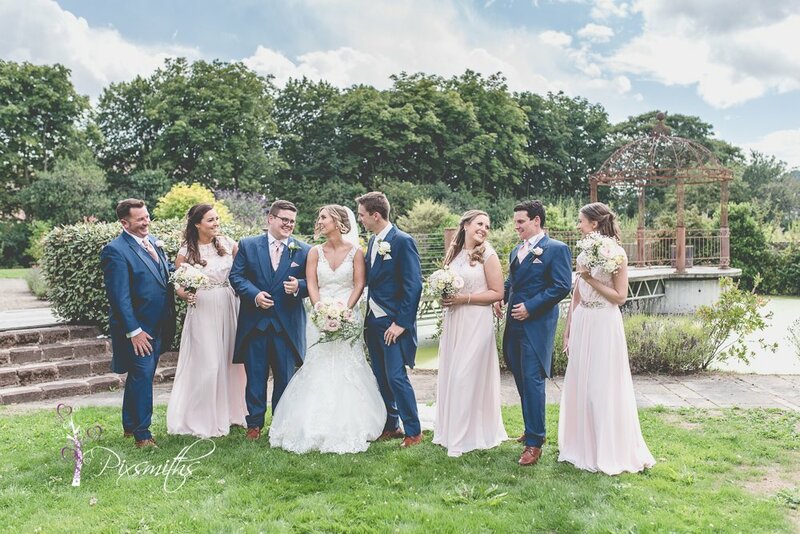 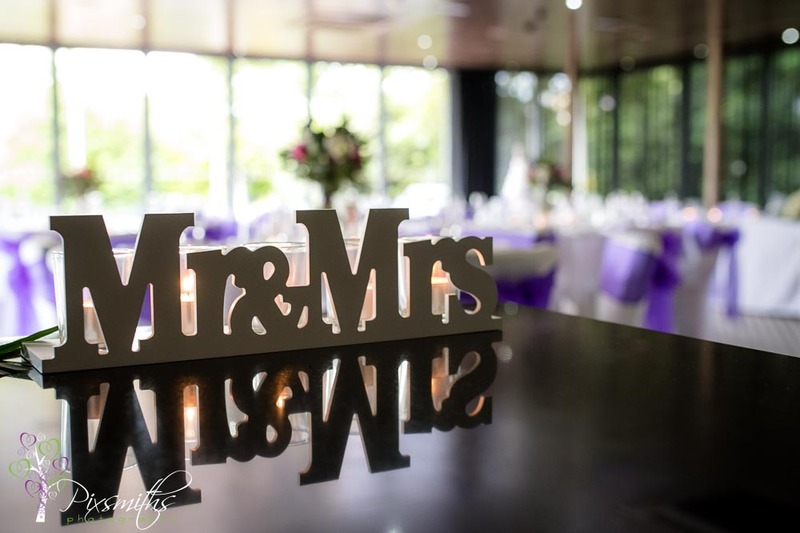 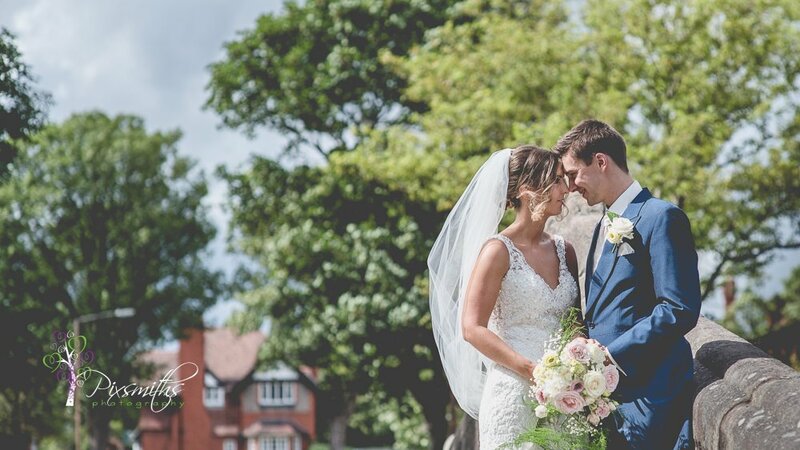 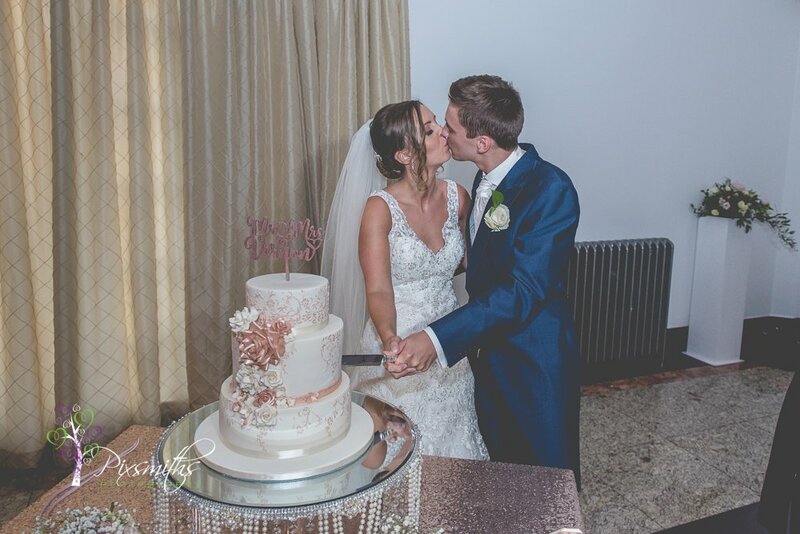 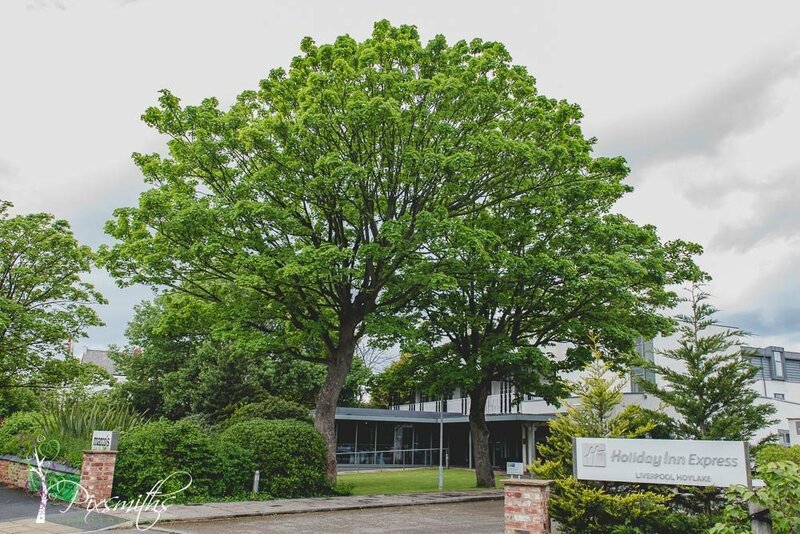 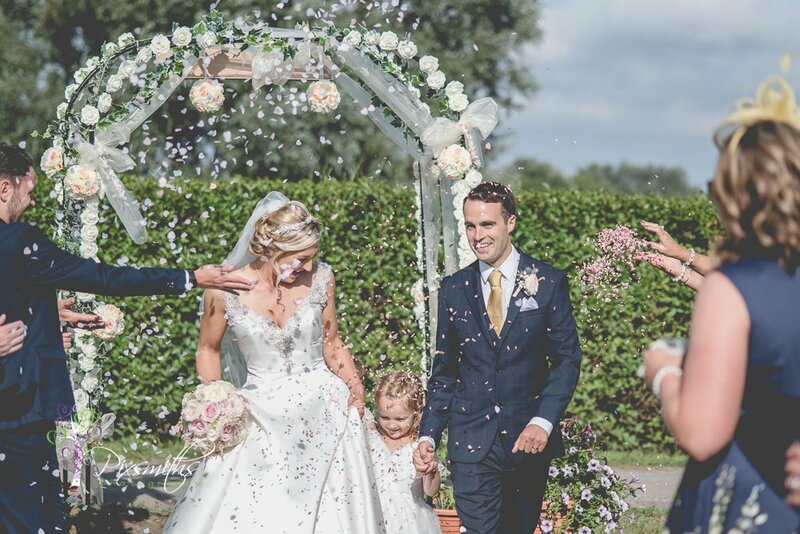 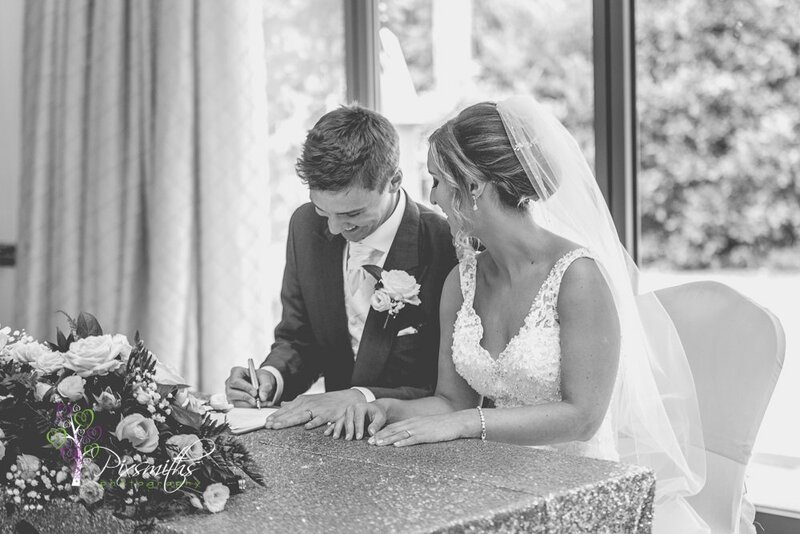 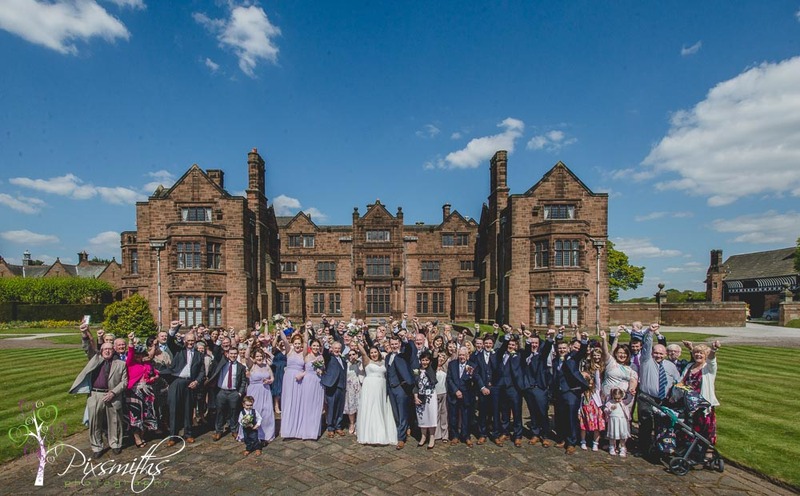 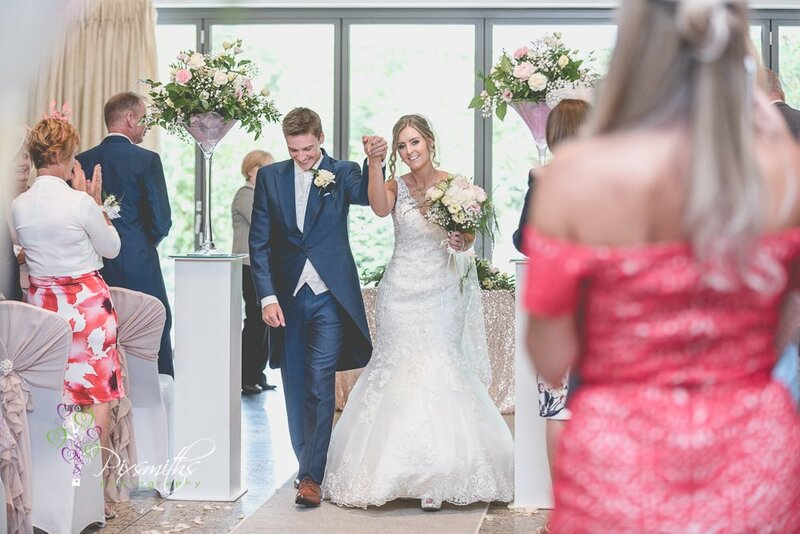 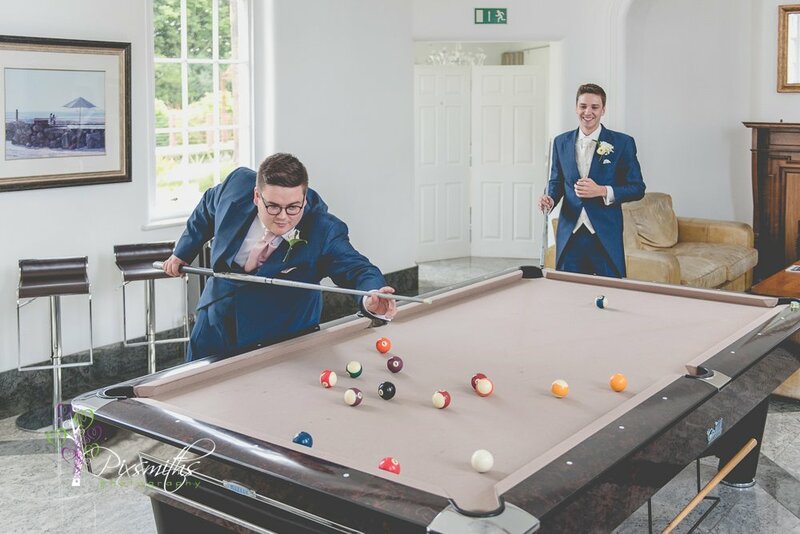 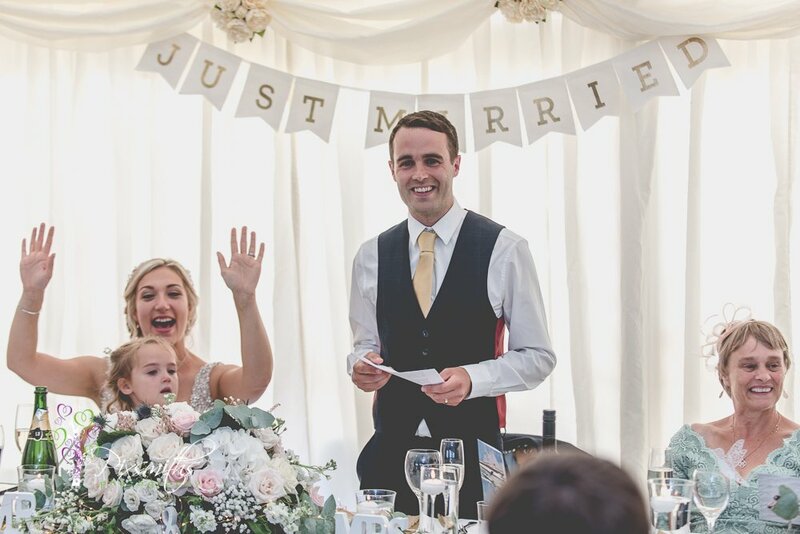 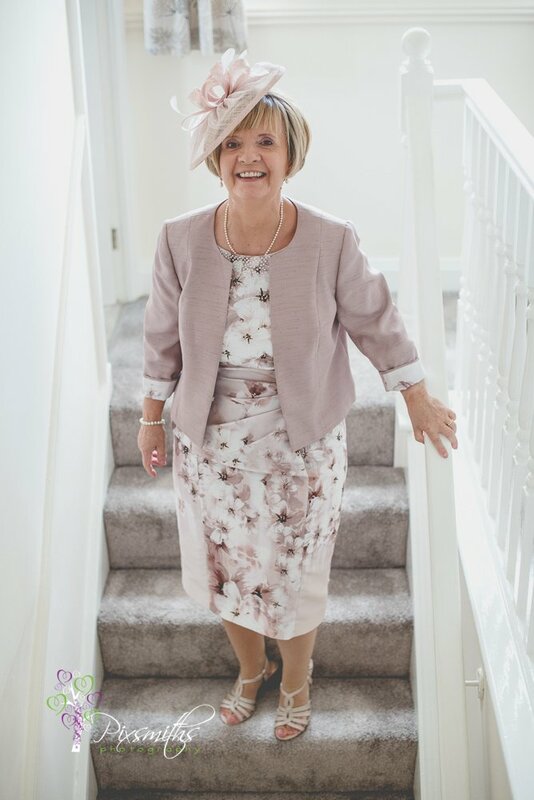 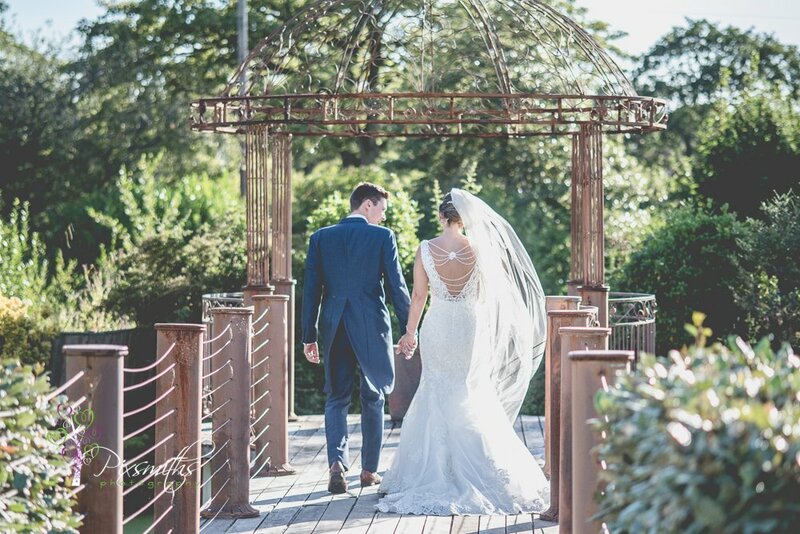 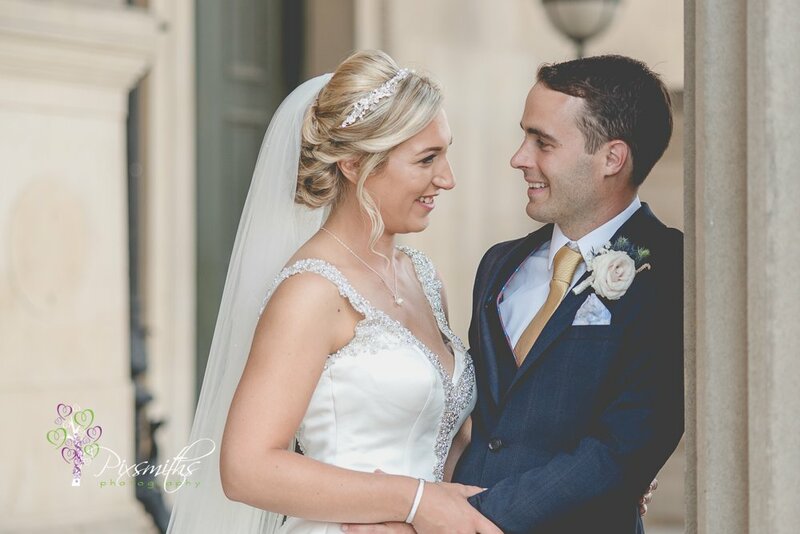 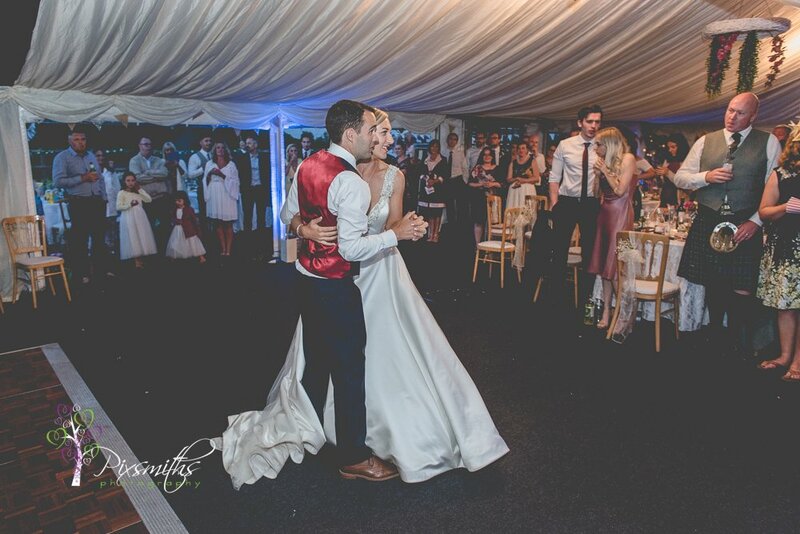 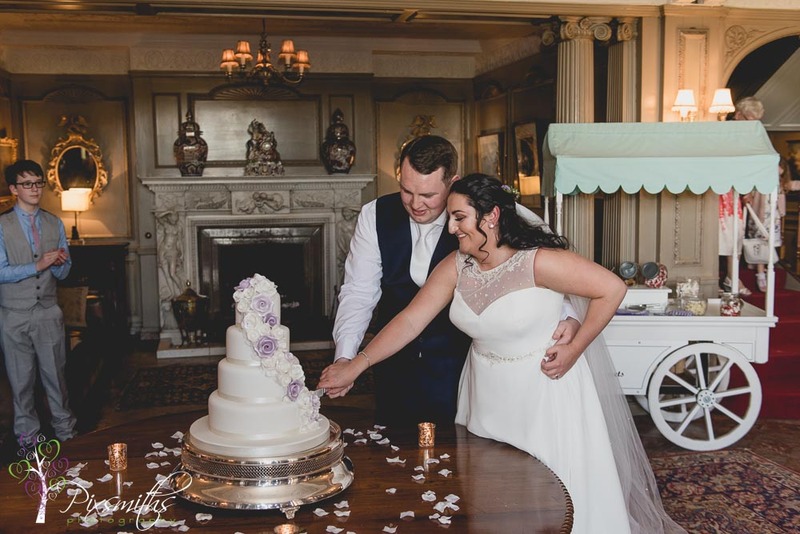 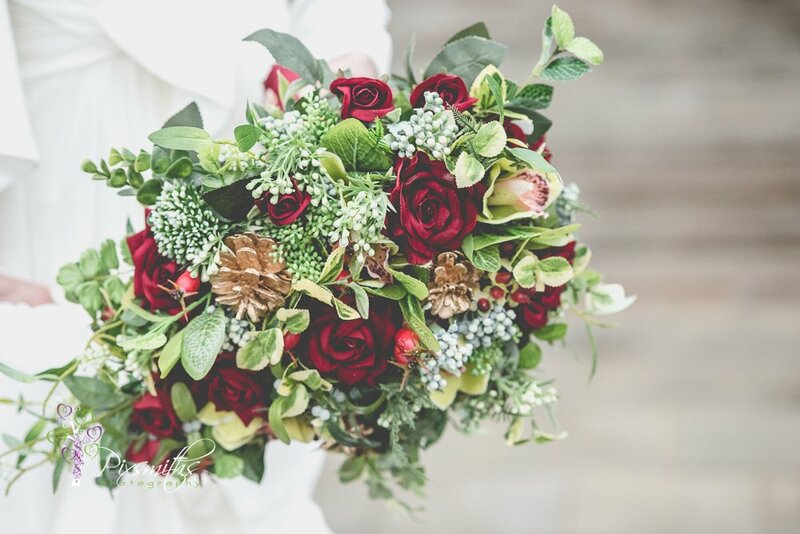 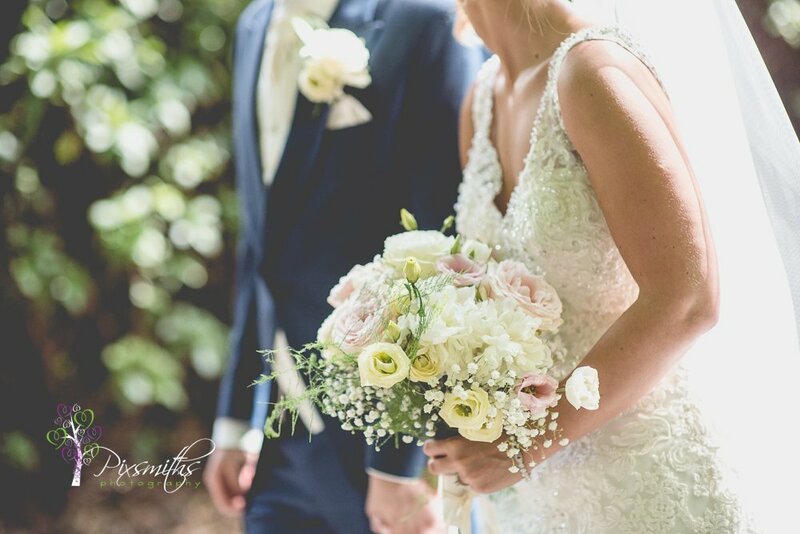 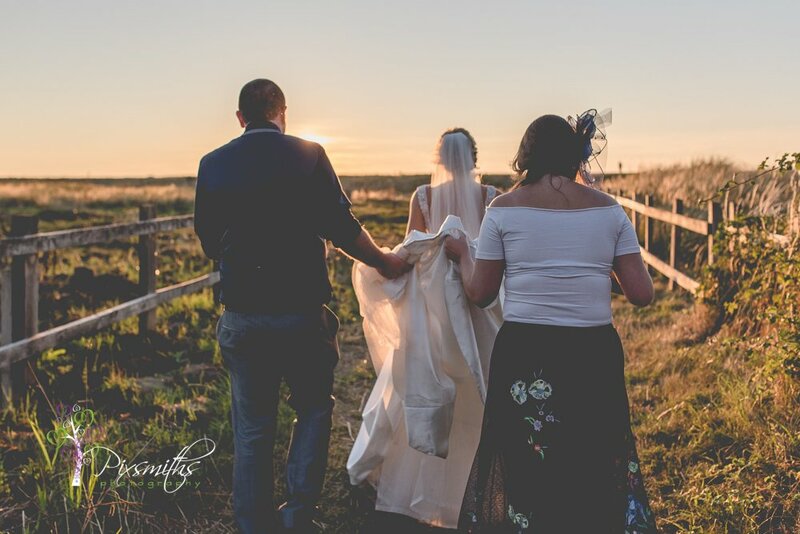 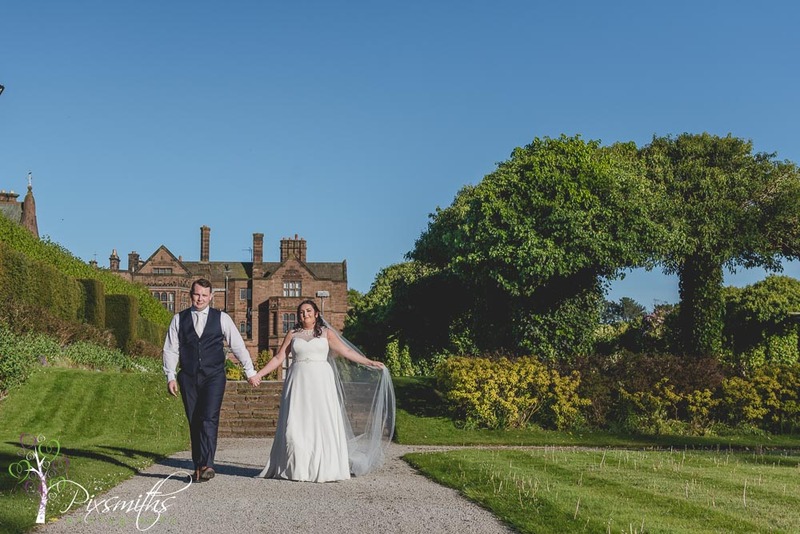 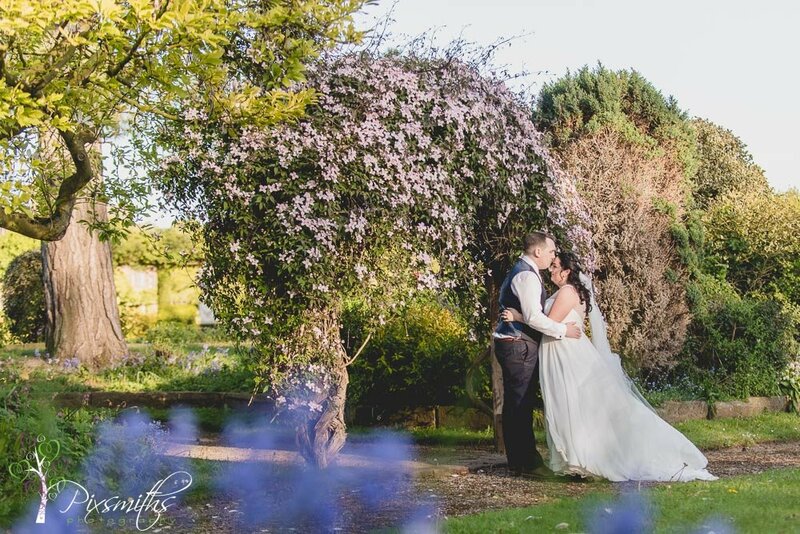 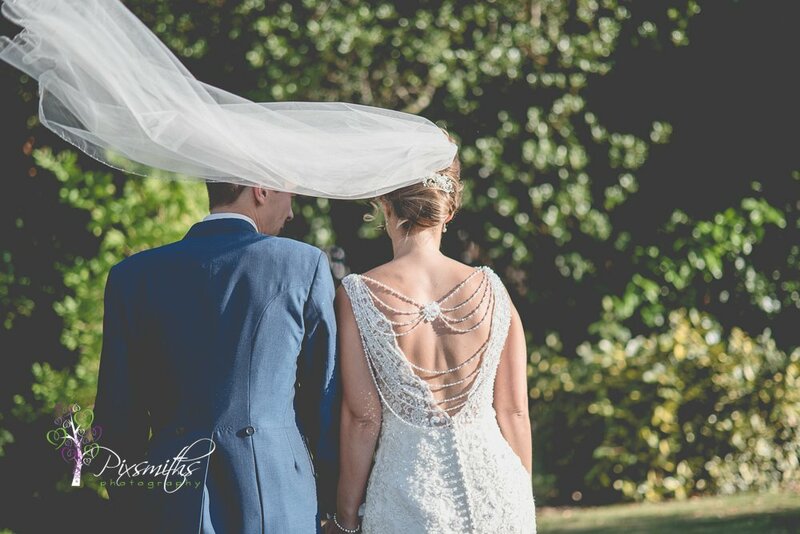 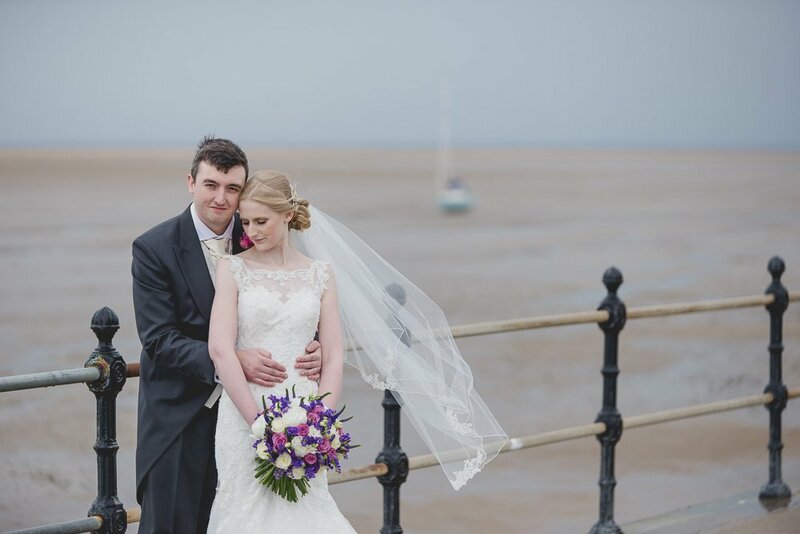 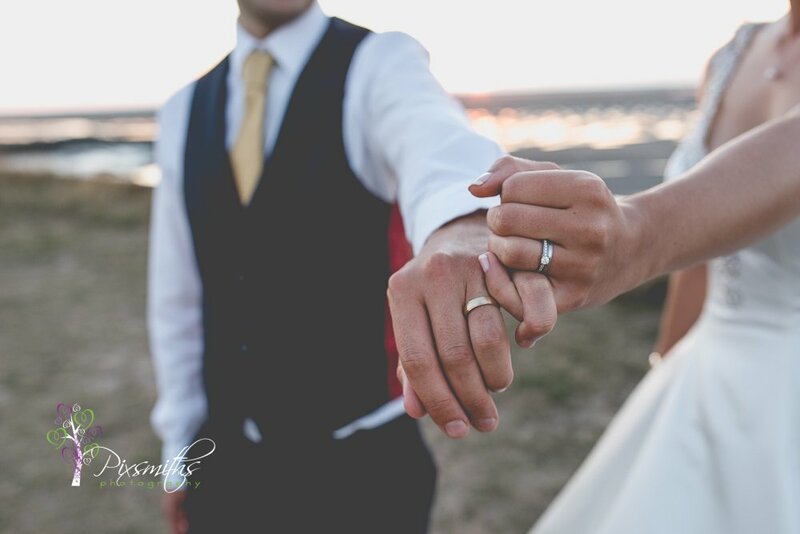 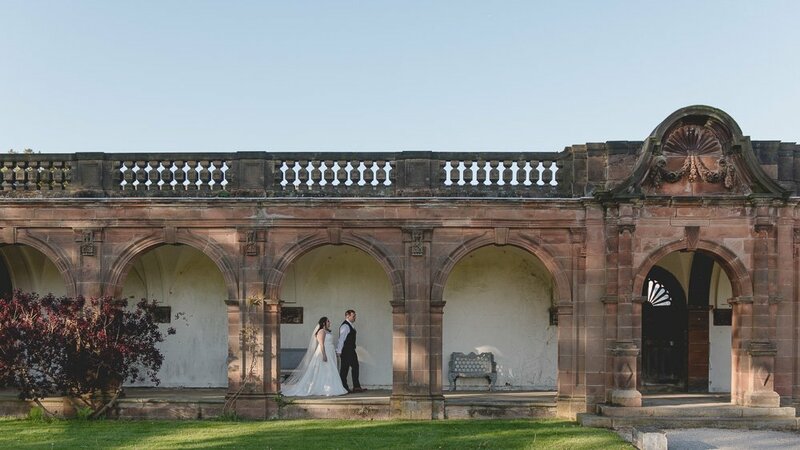 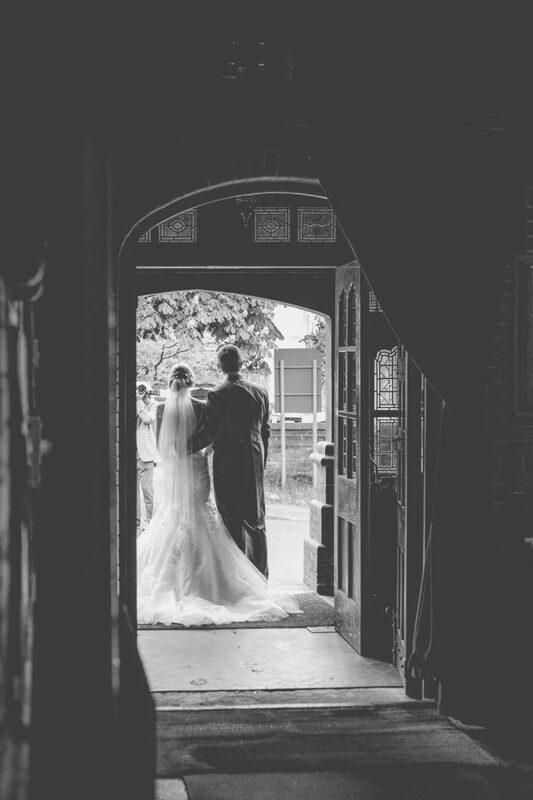 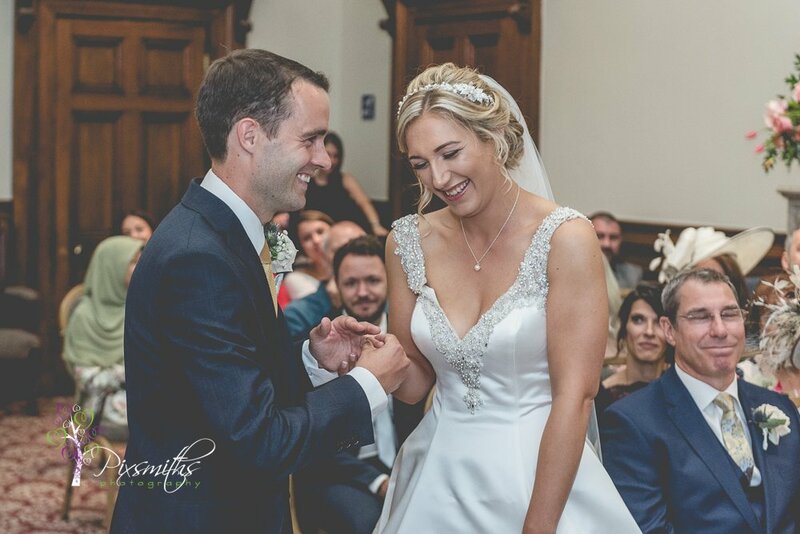 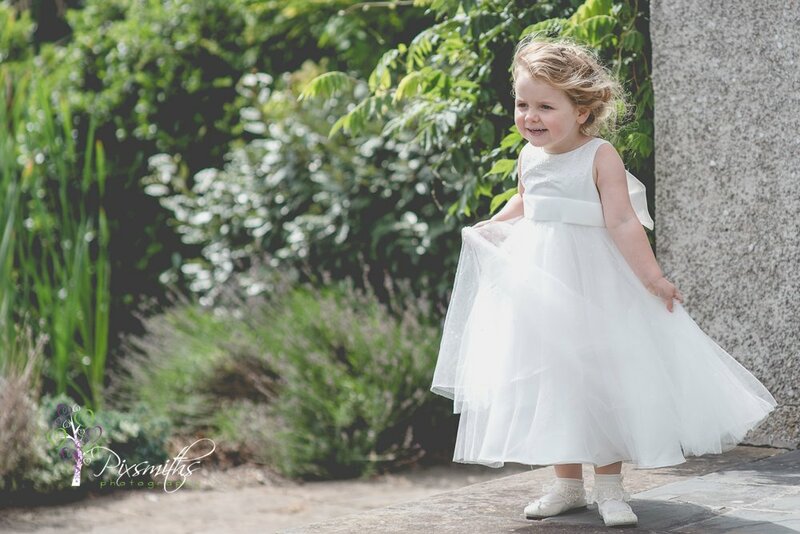 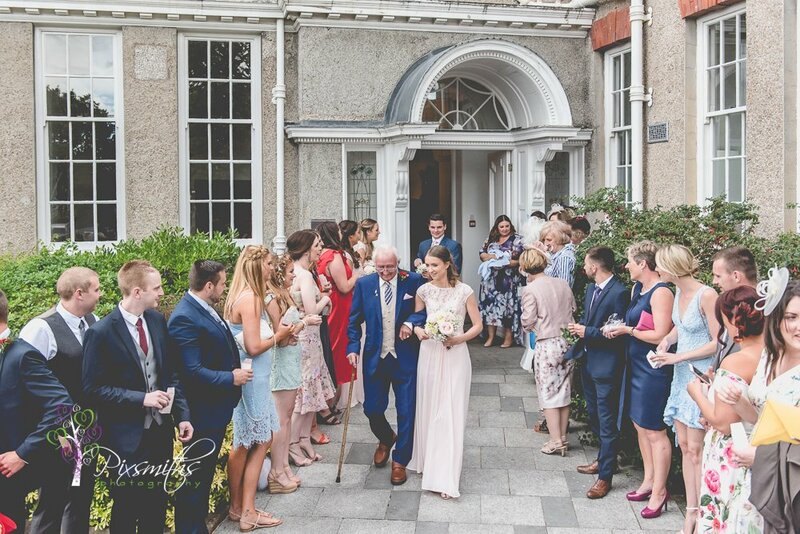 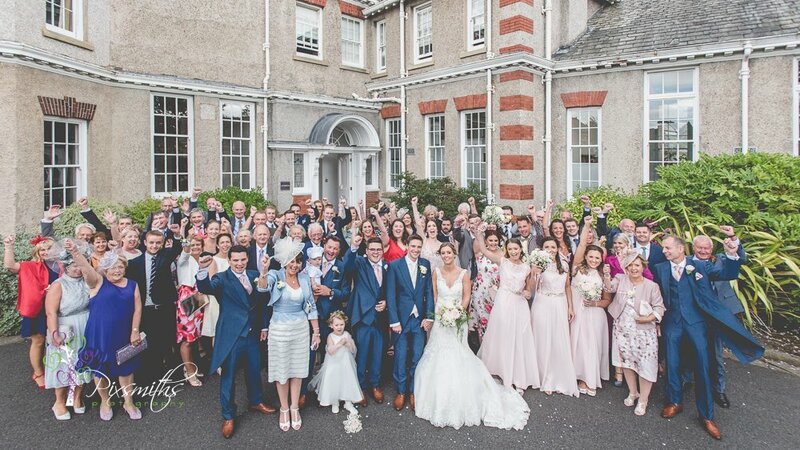 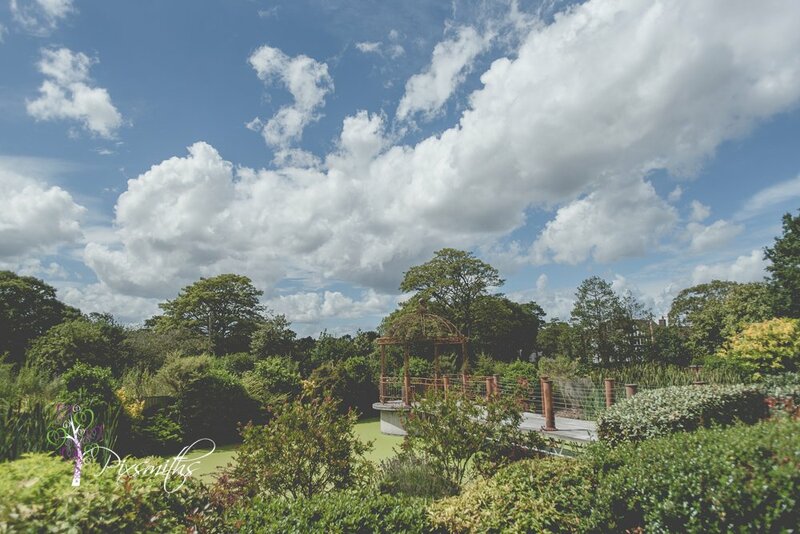 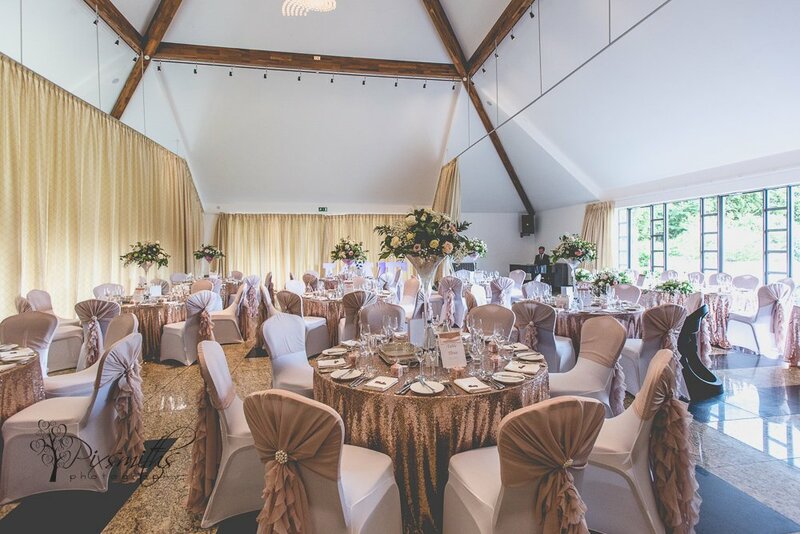 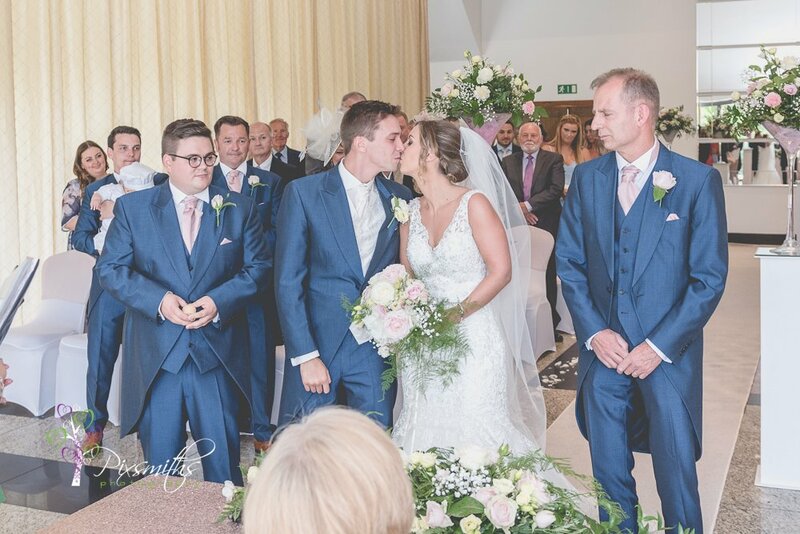 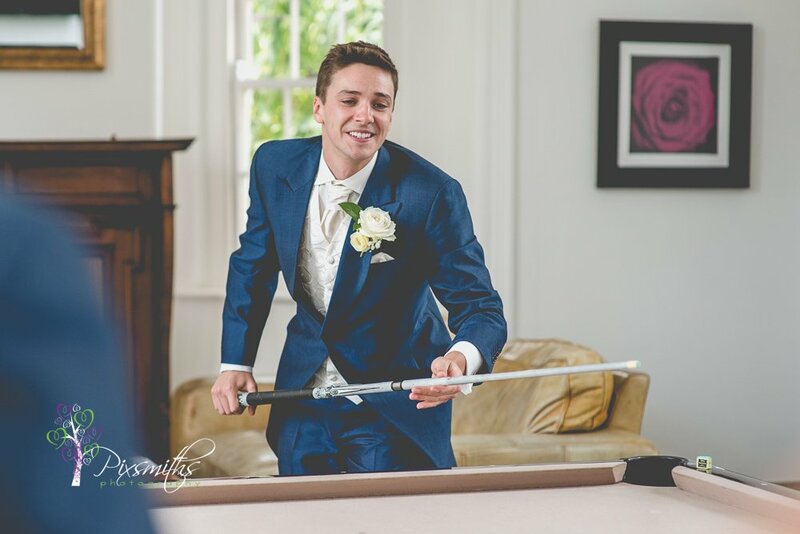 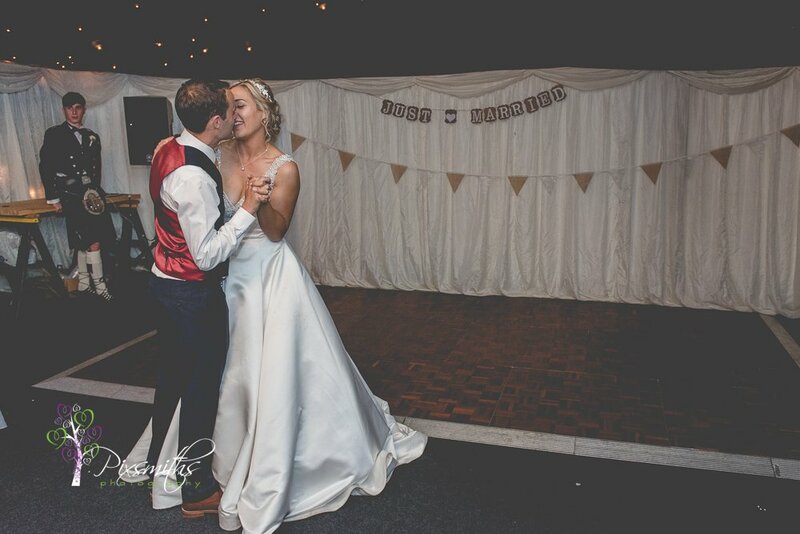 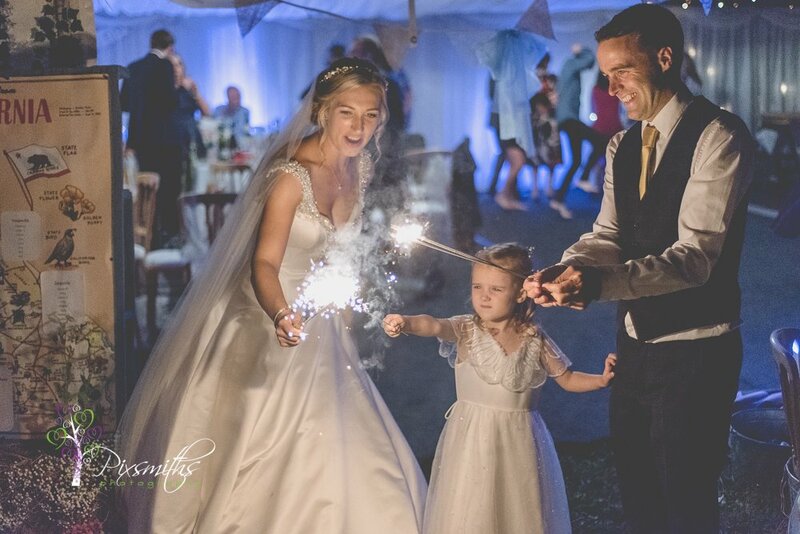 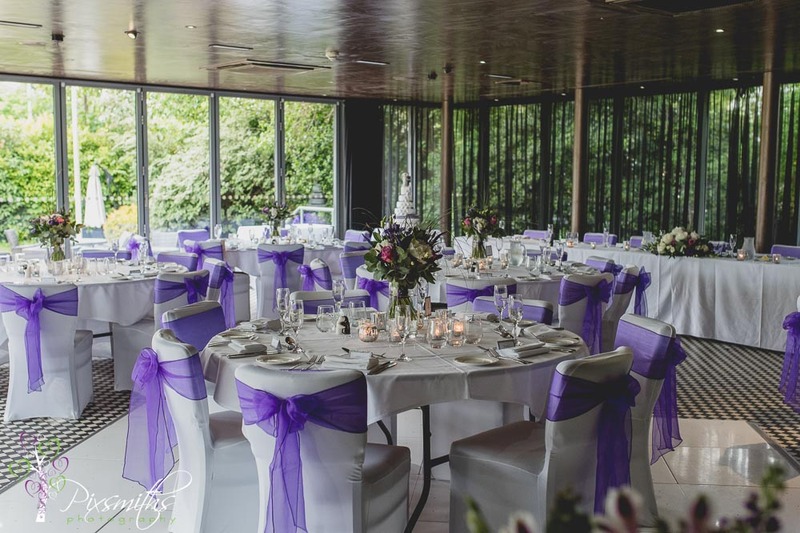 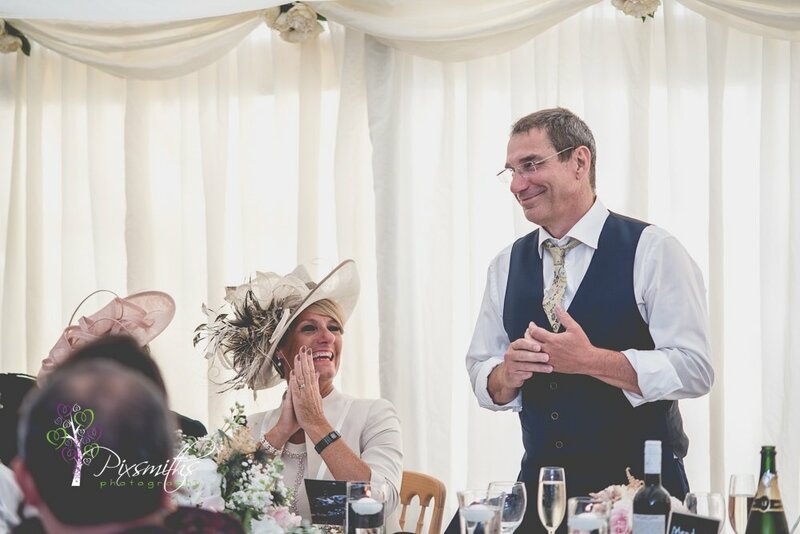 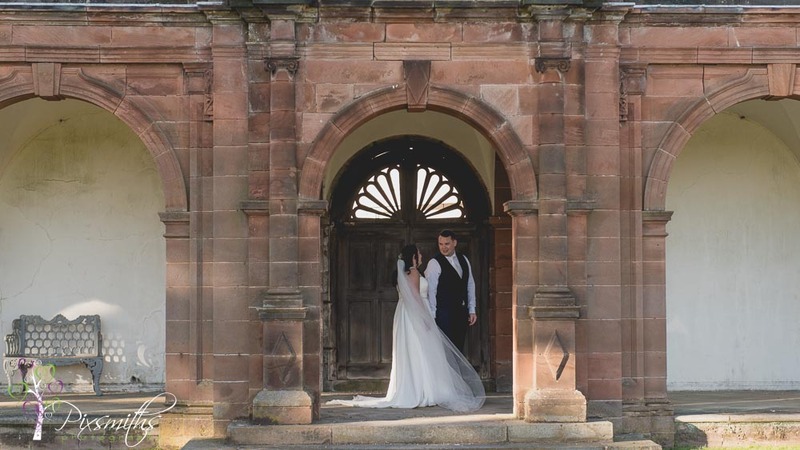 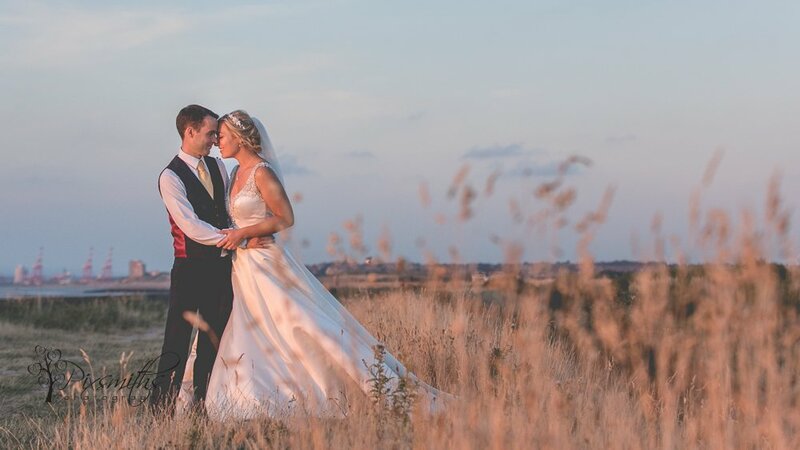 Always well organised and staff are brilliant The grounds and rooms are just stunning and a perfect wedding venue – exactly why Emily and Peter chose it. 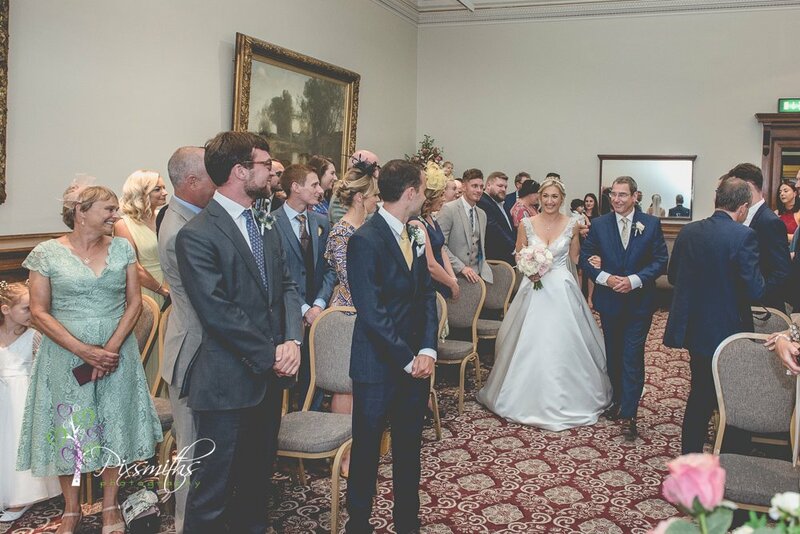 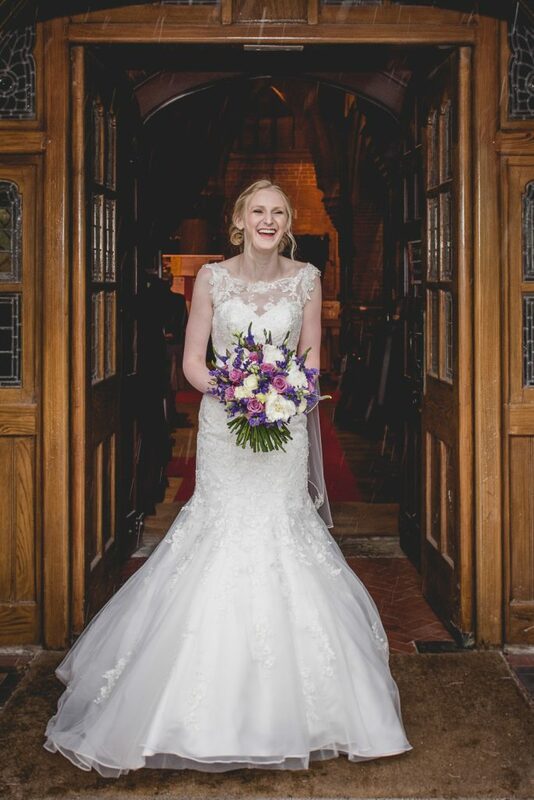 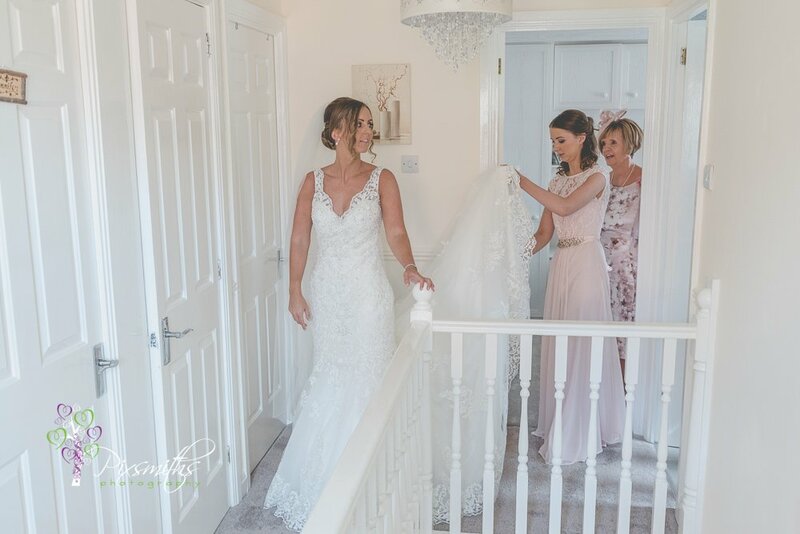 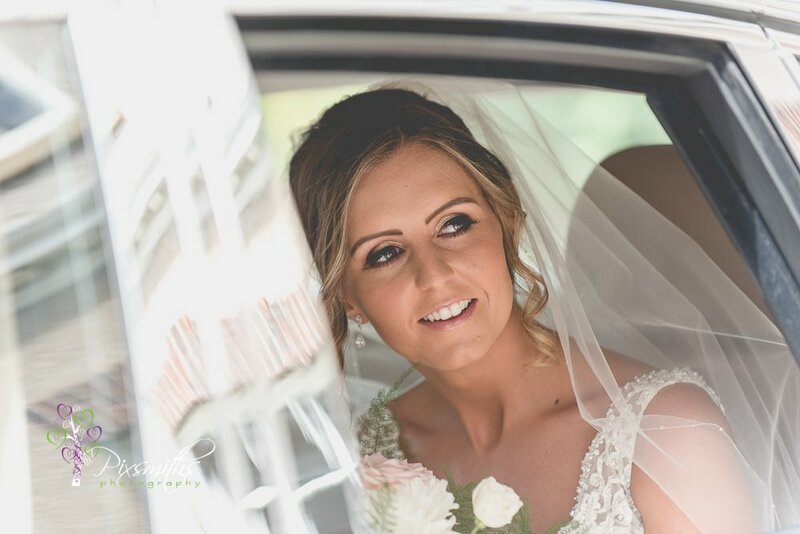 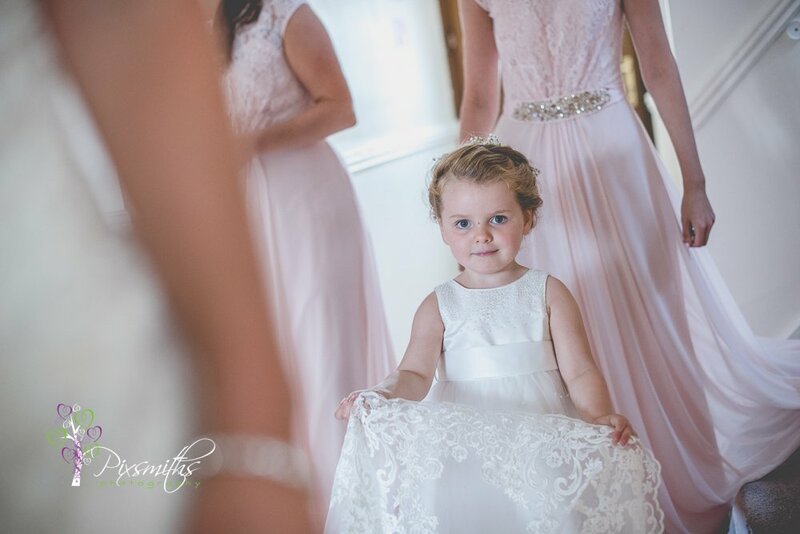 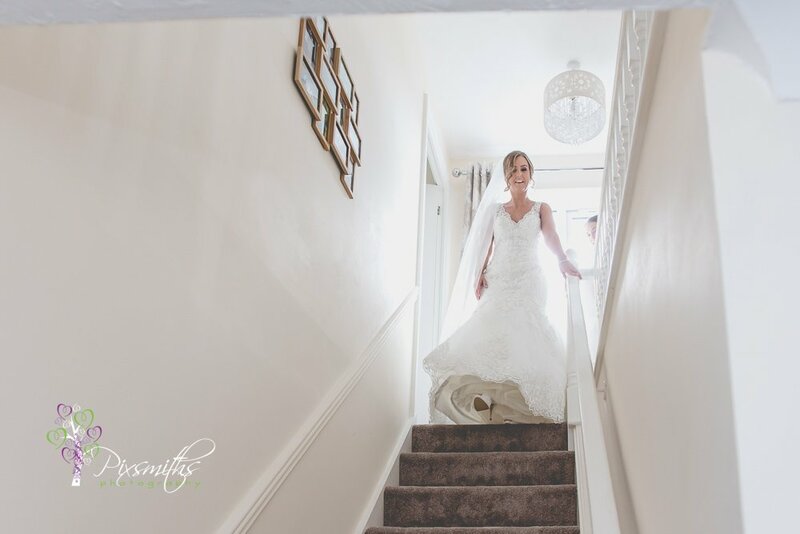 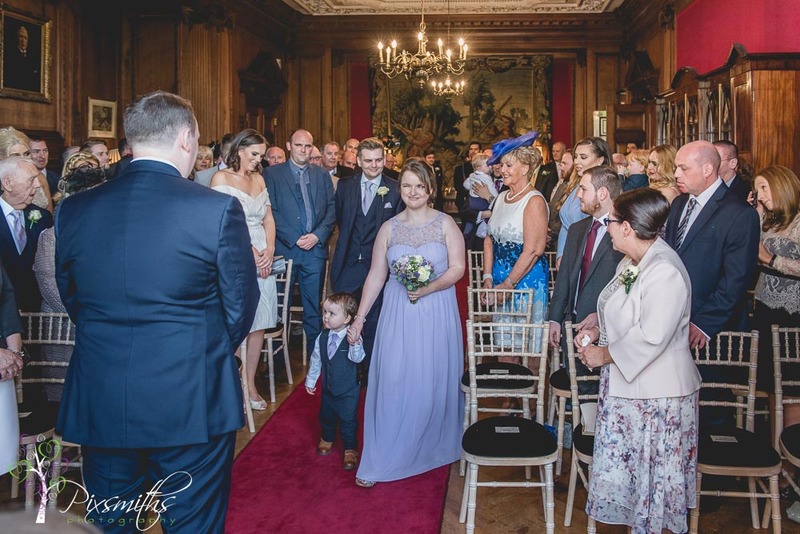 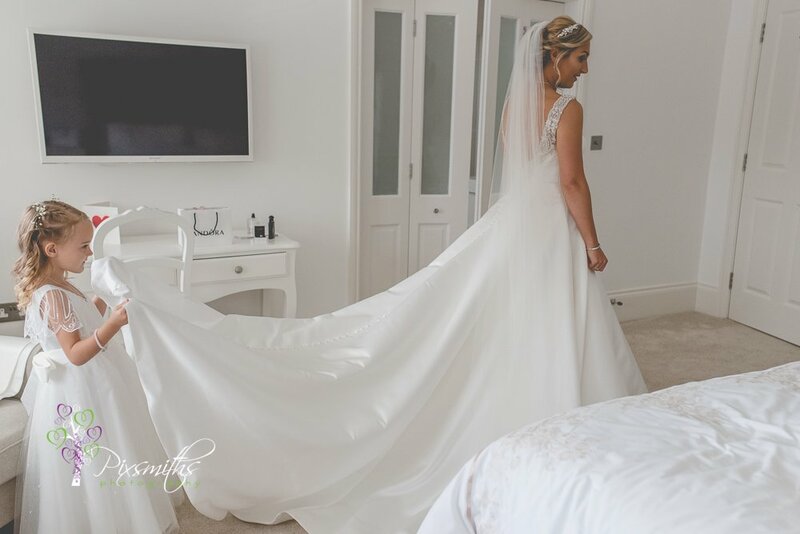 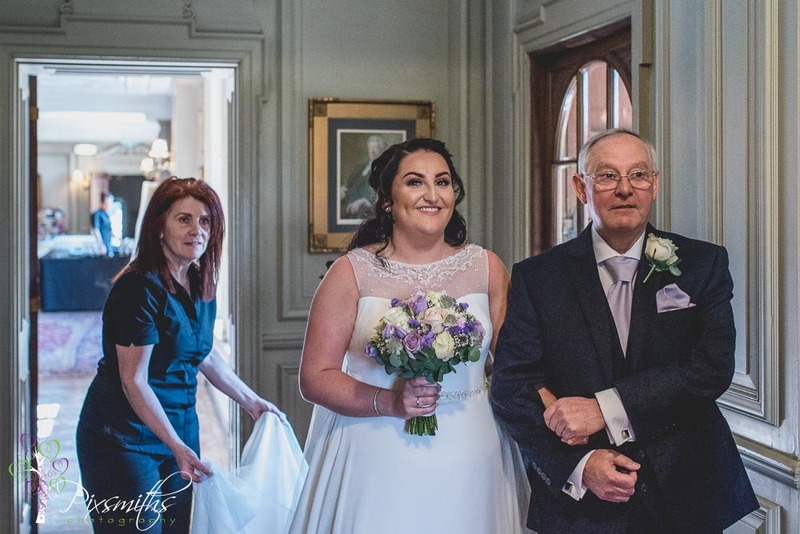 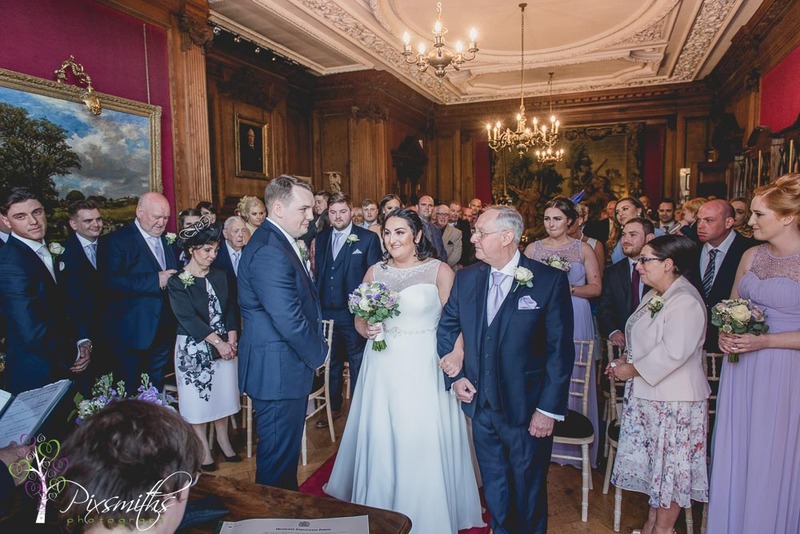 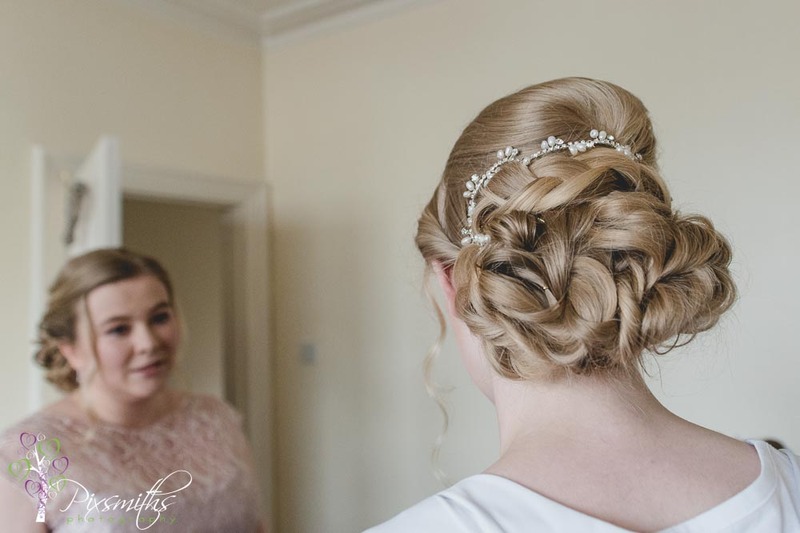 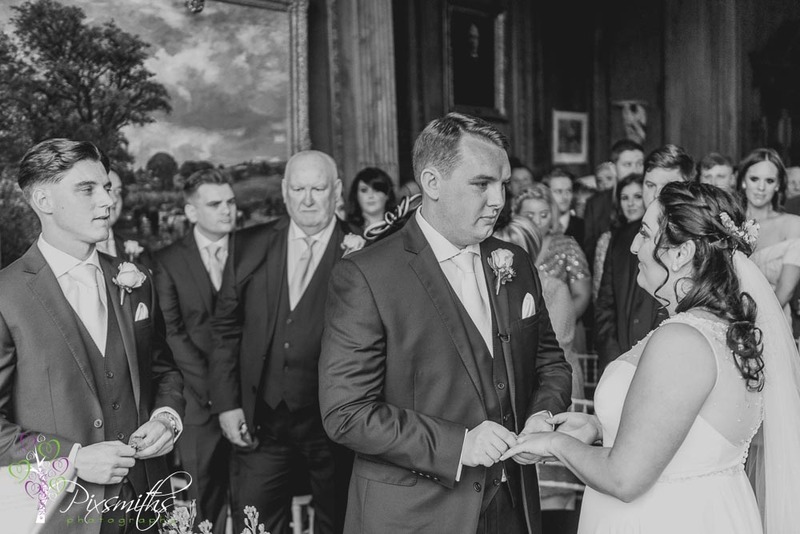 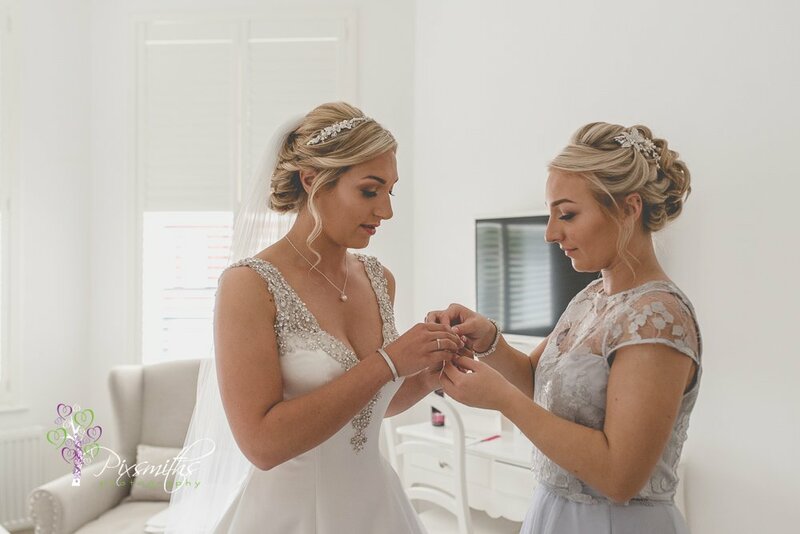 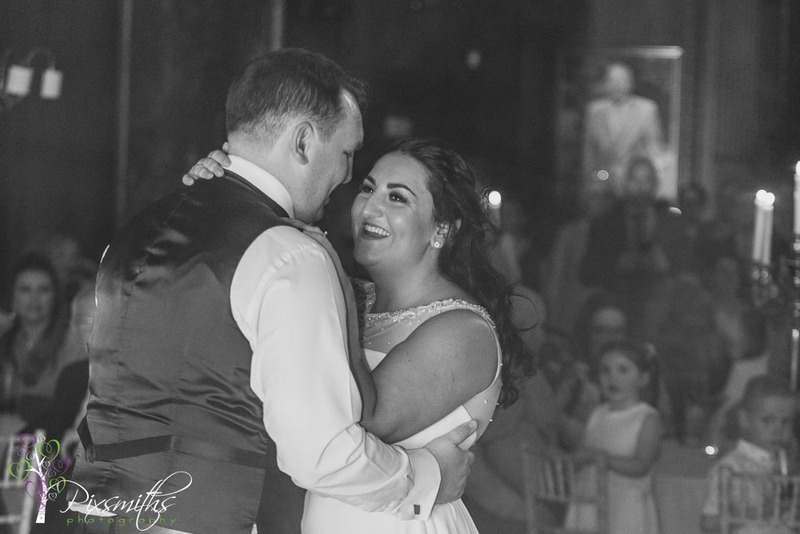 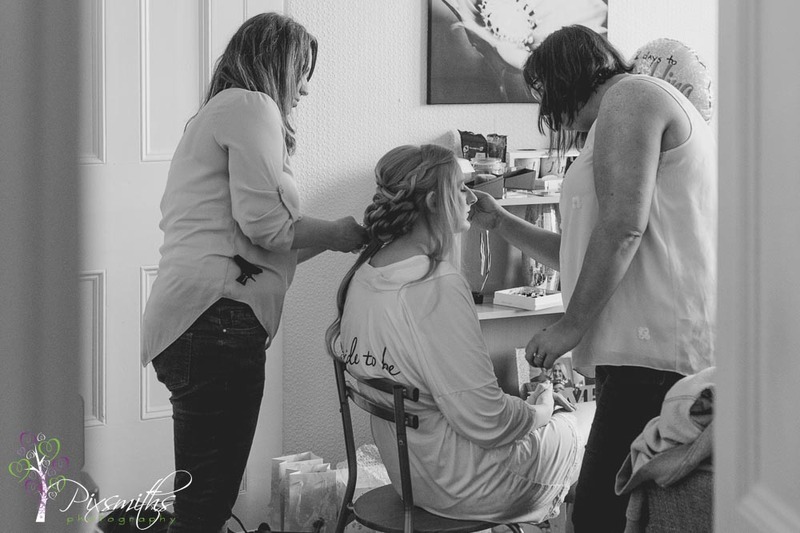 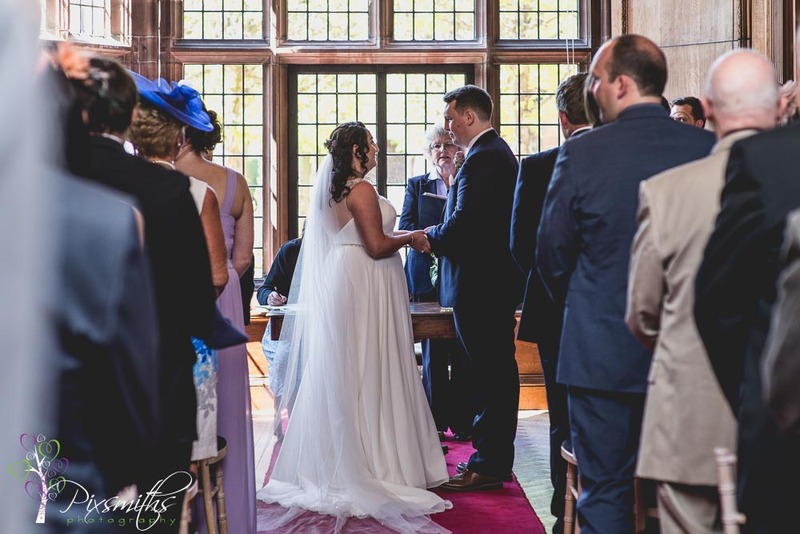 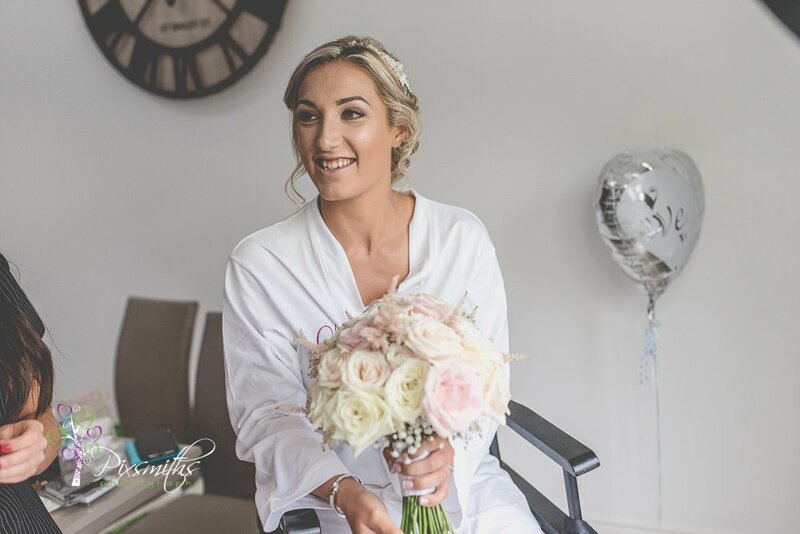 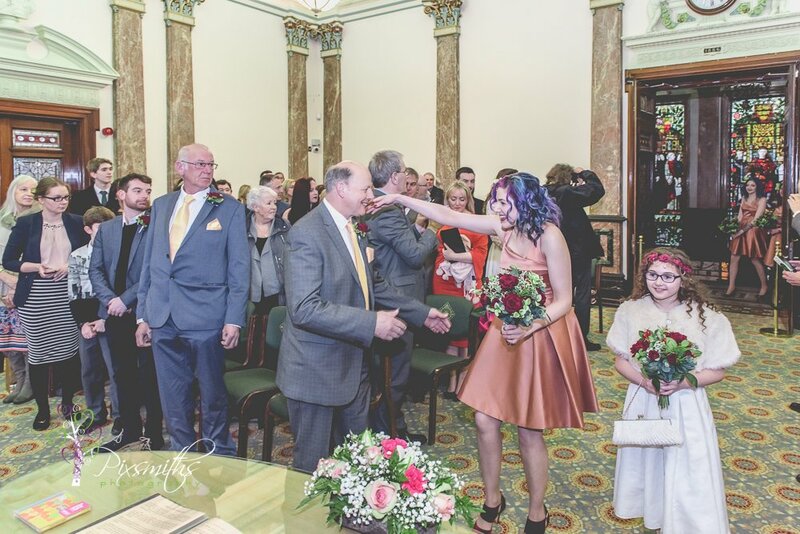 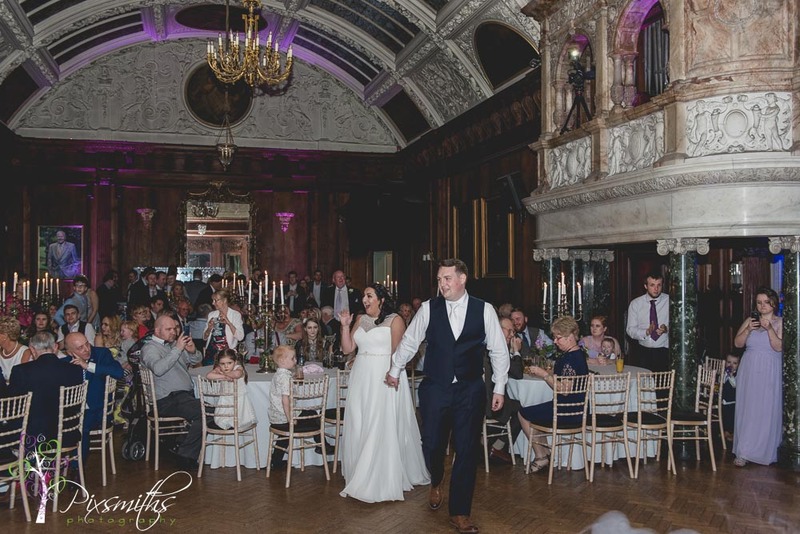 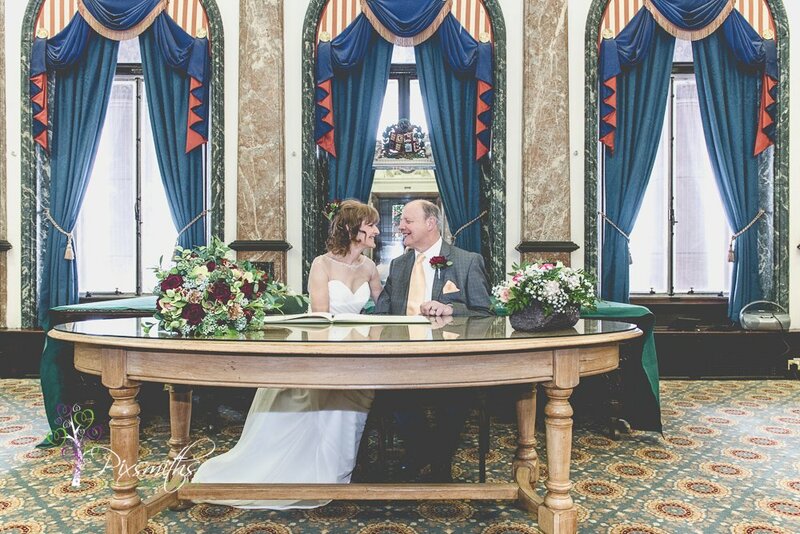 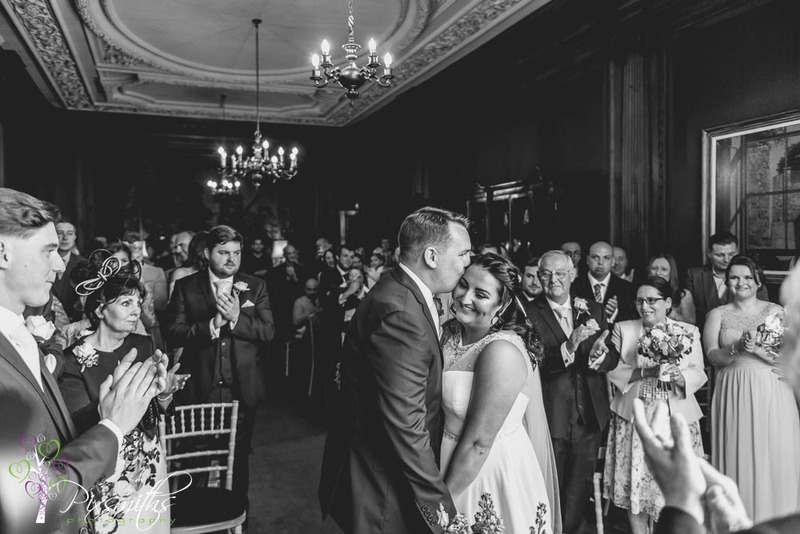 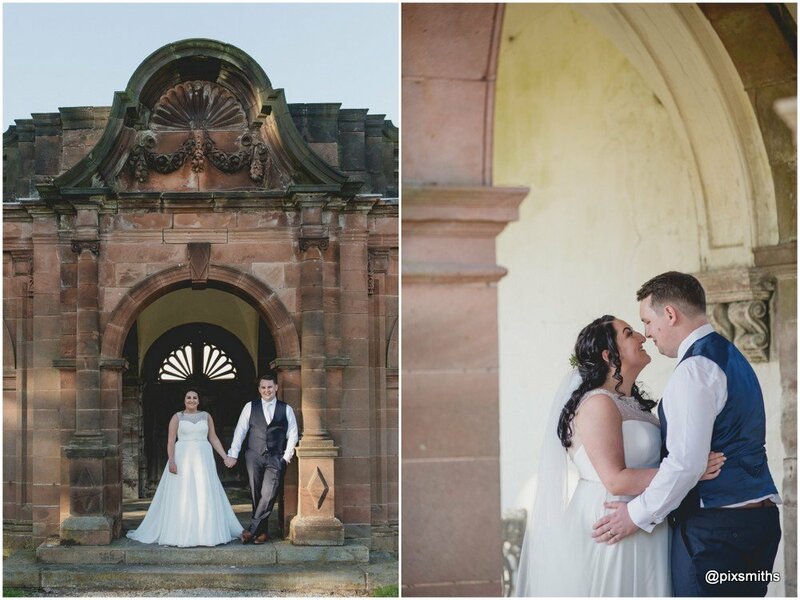 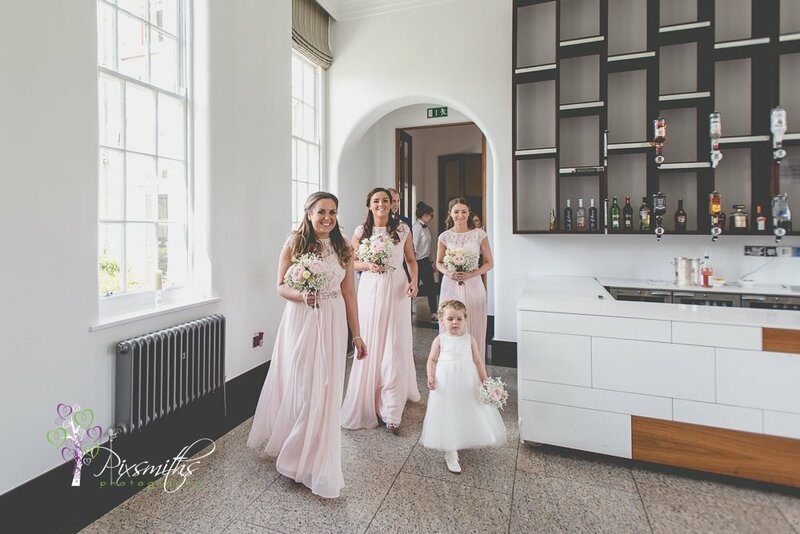 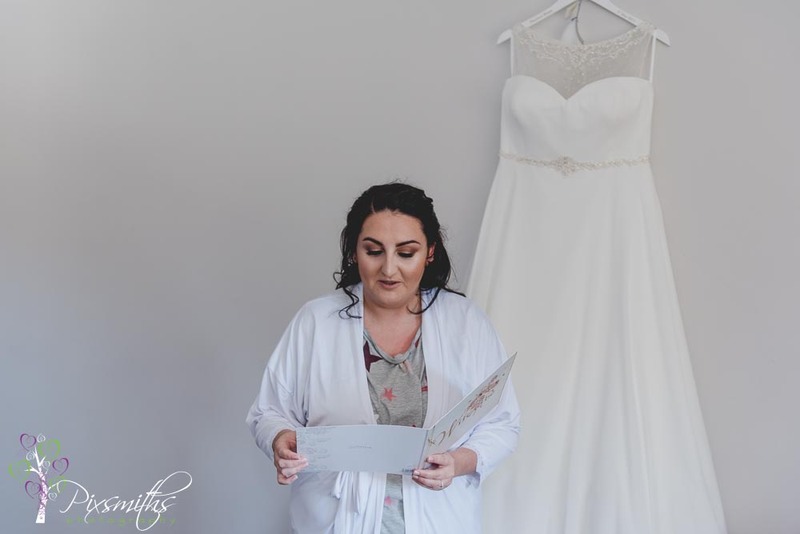 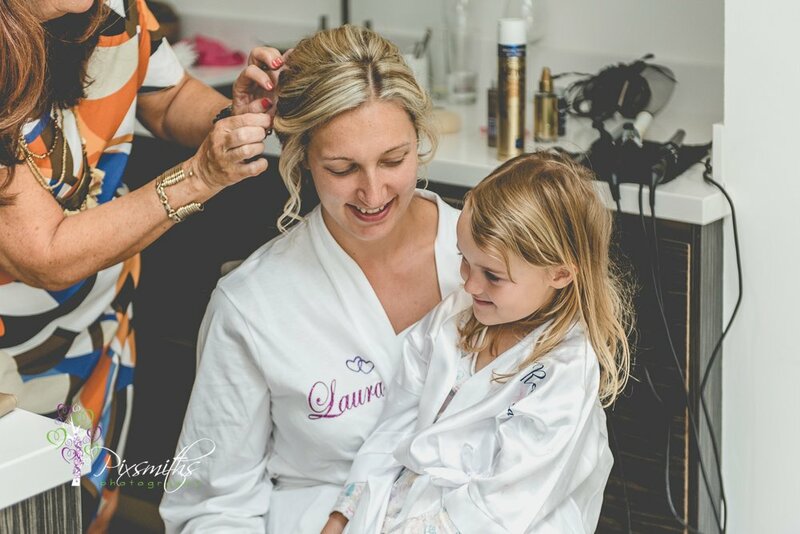 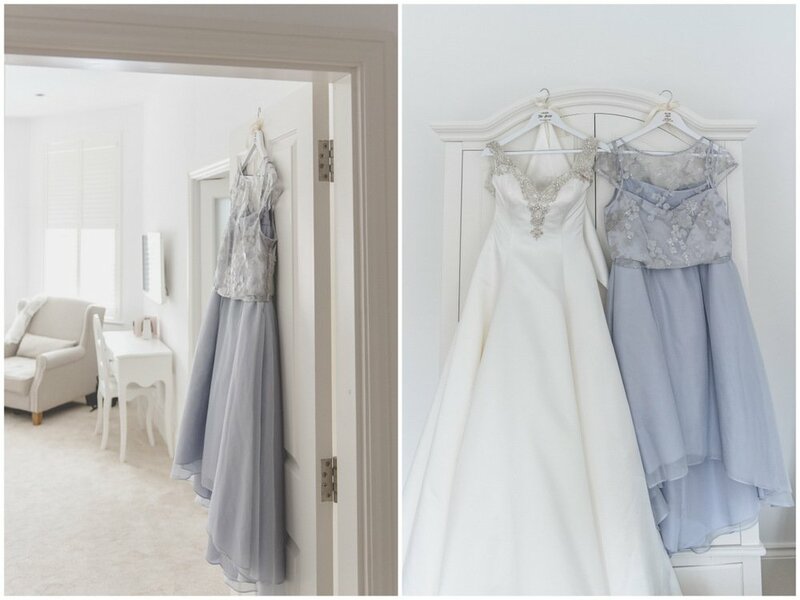 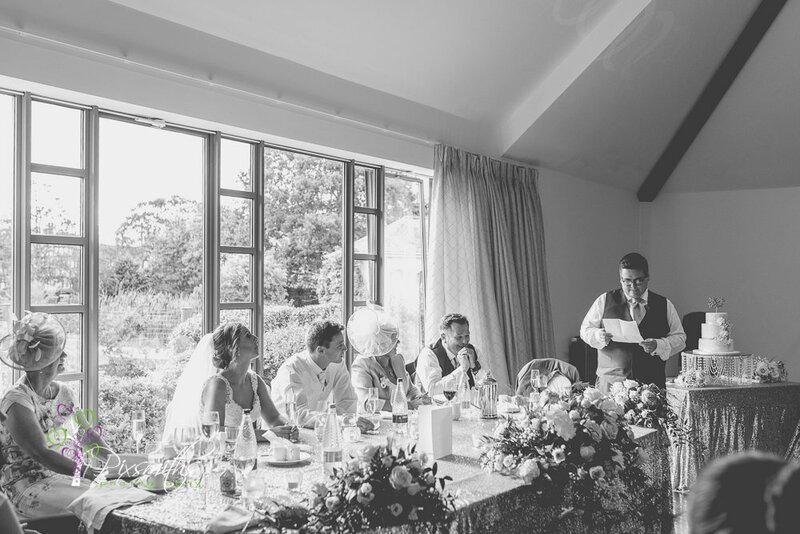 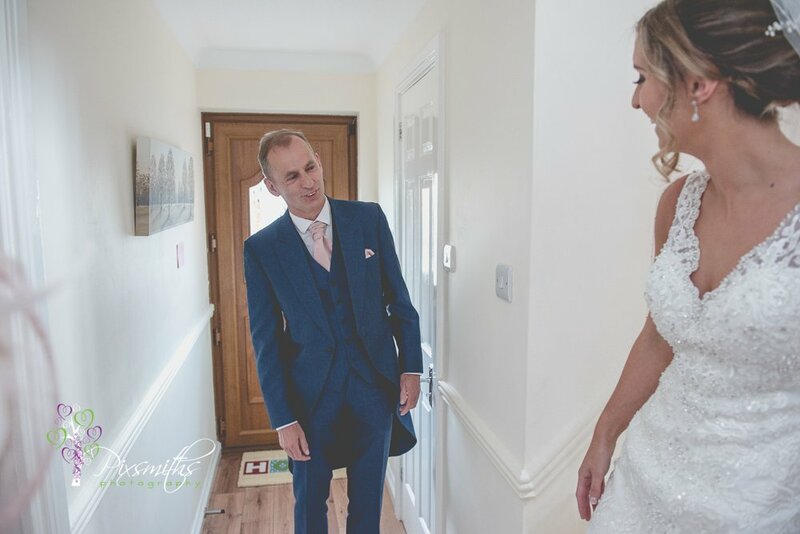 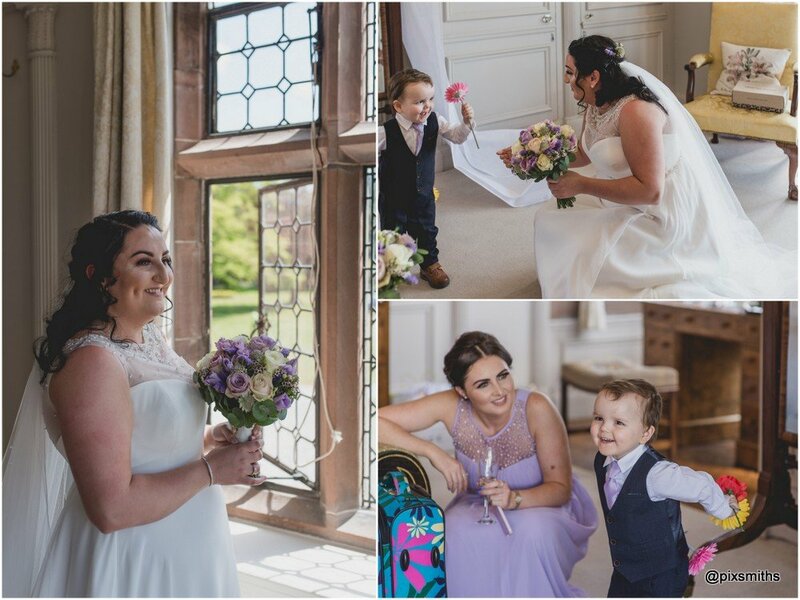 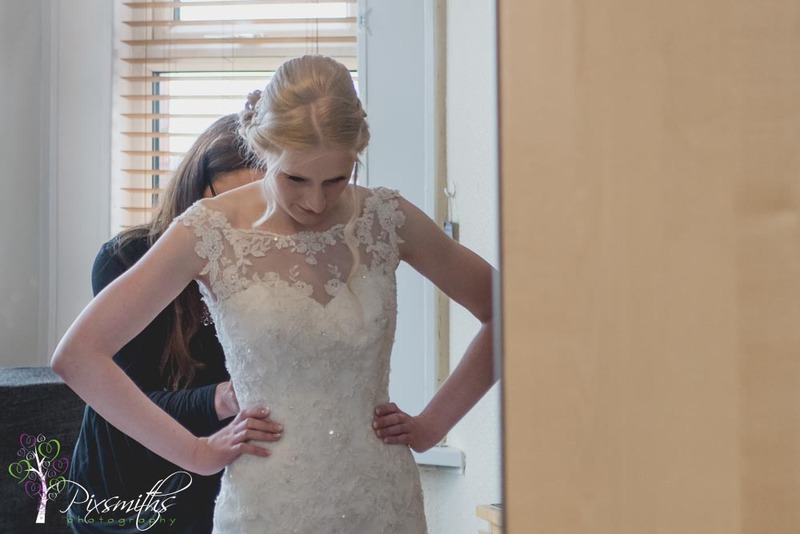 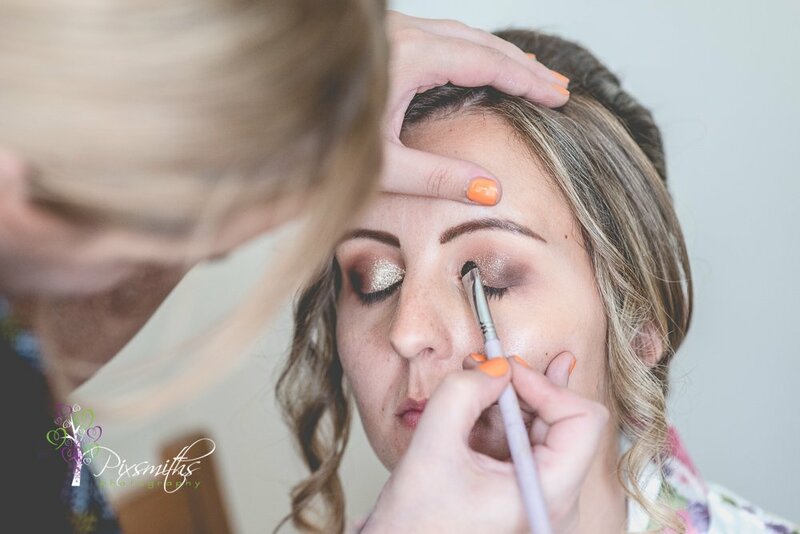 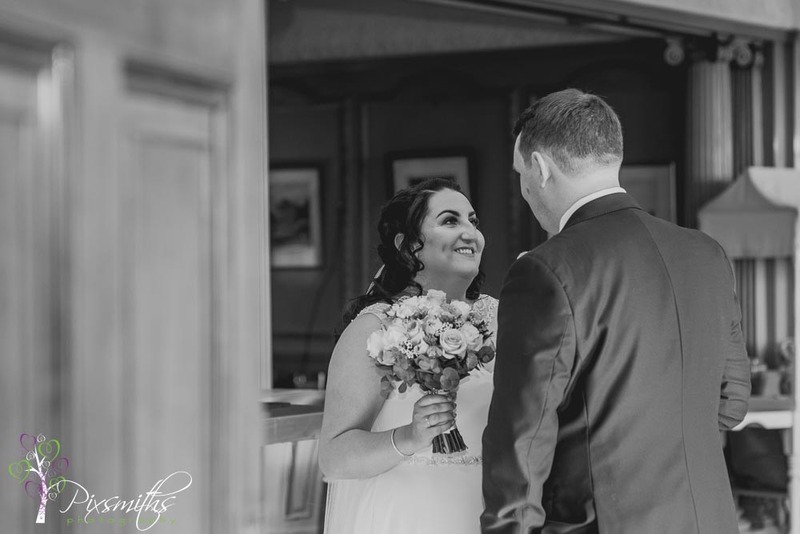 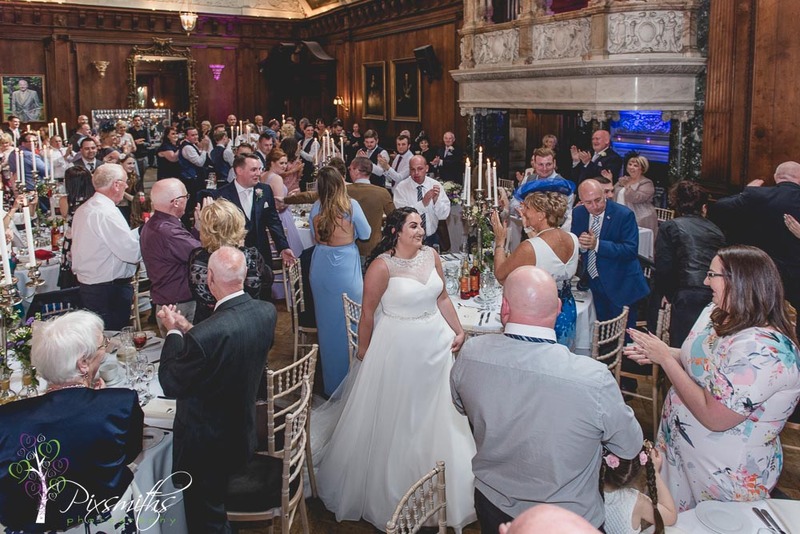 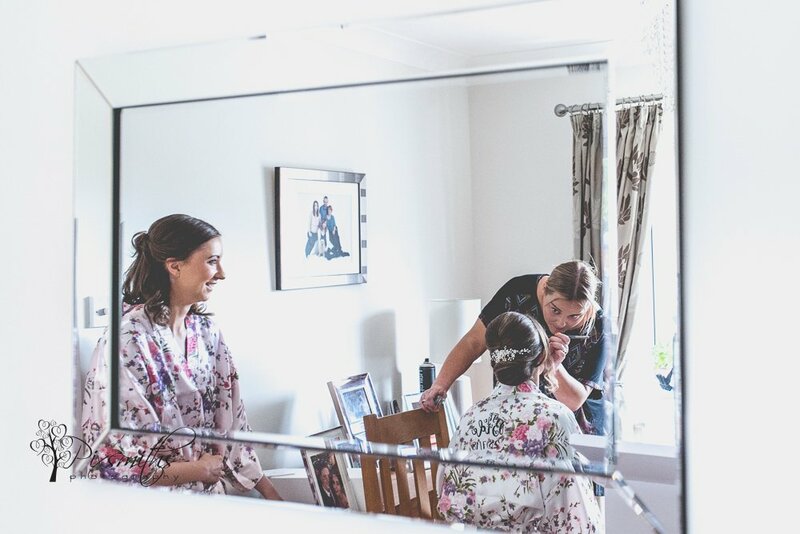 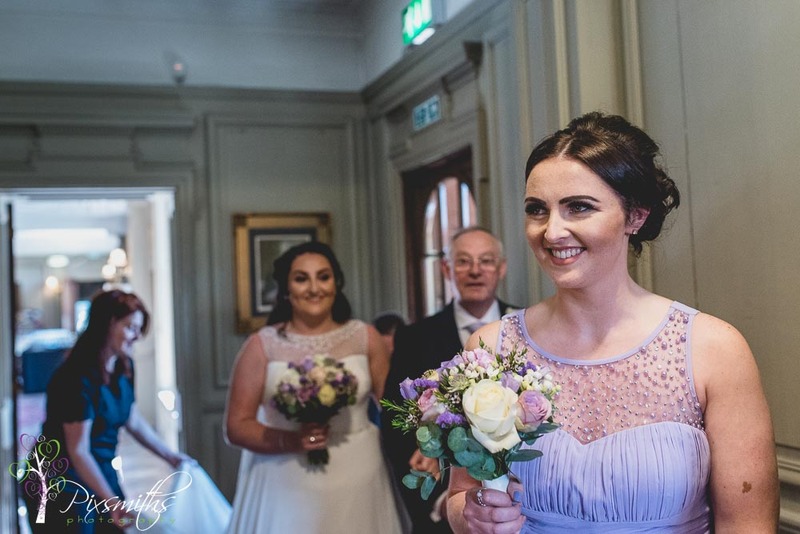 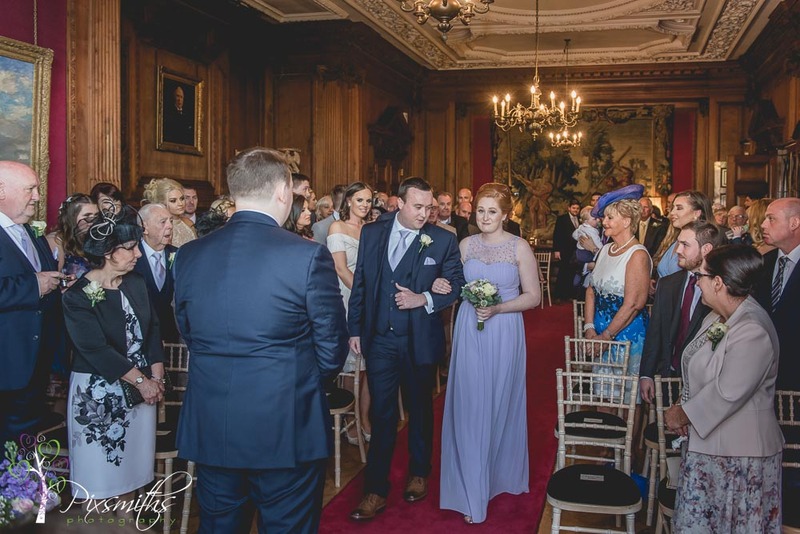 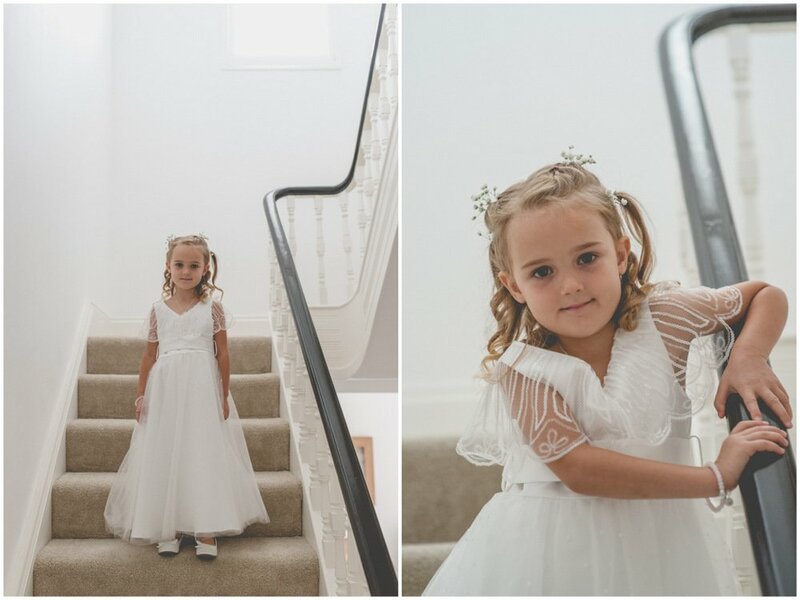 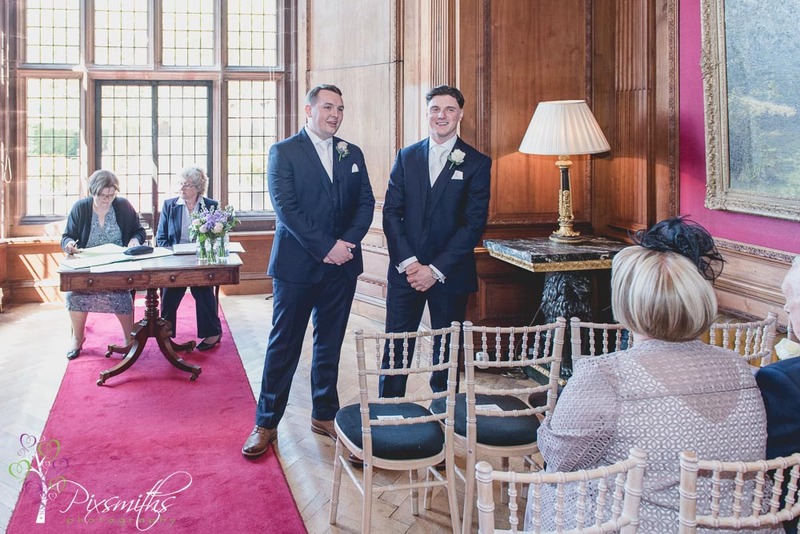 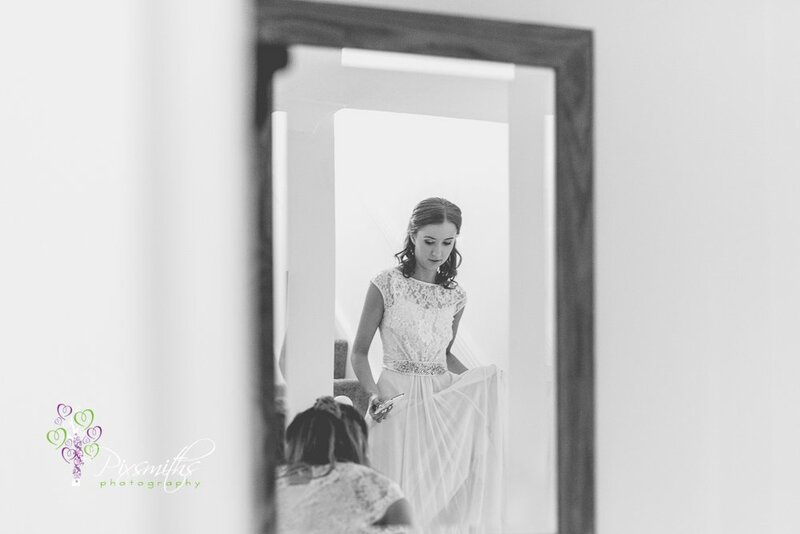 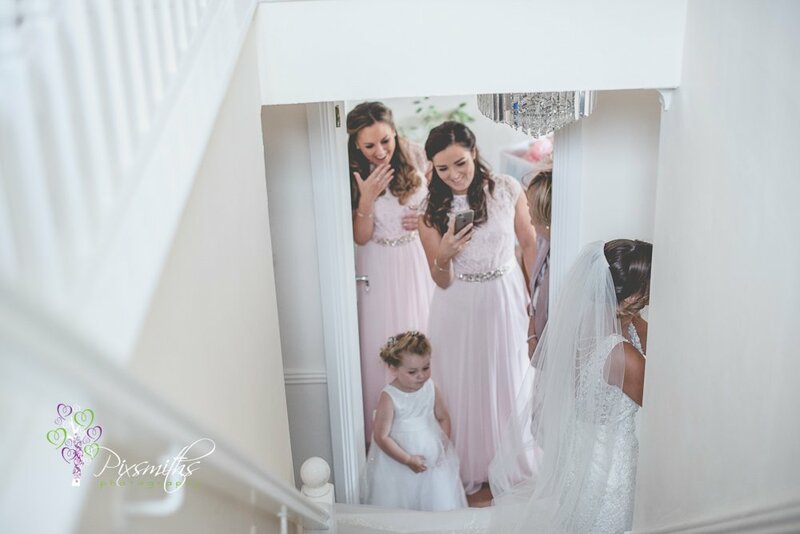 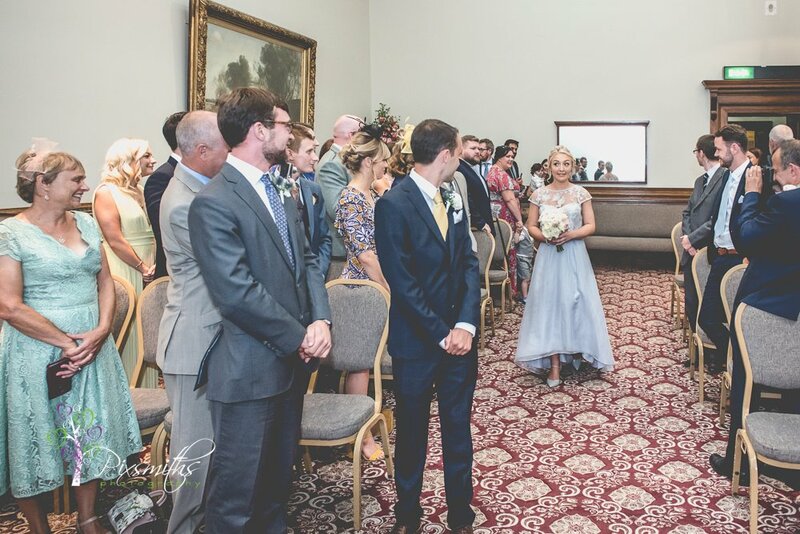 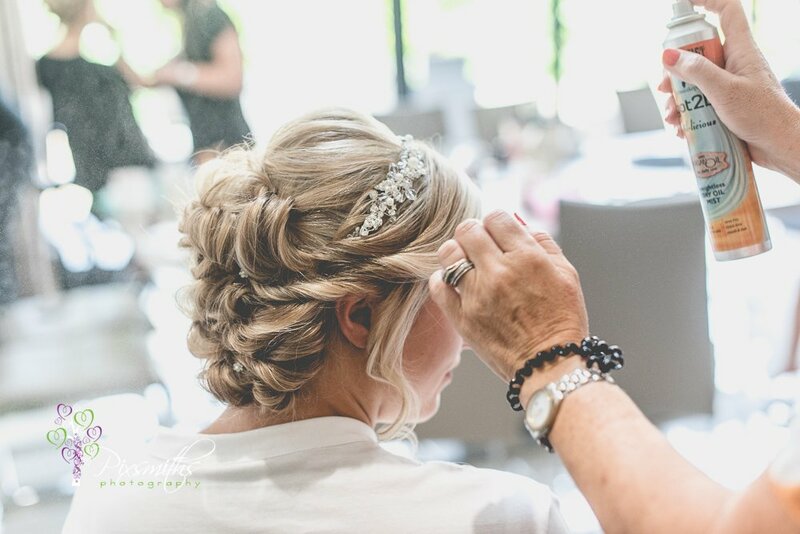 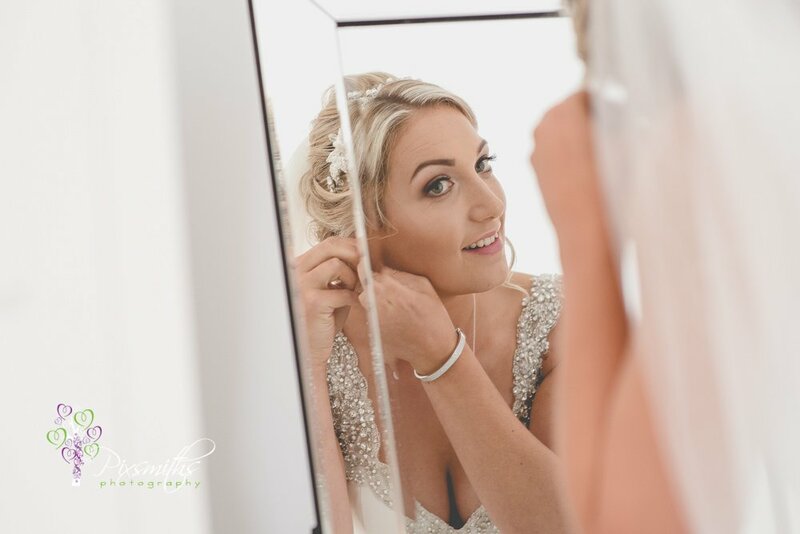 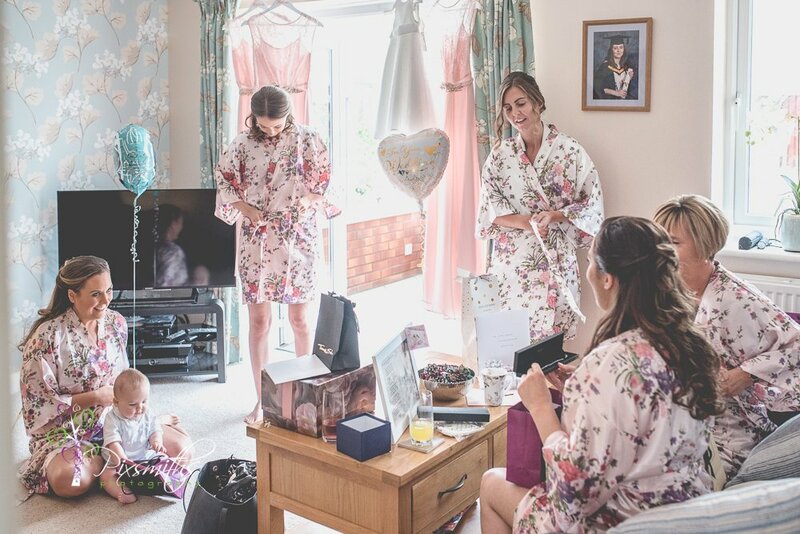 Bridal make up and hair preps were in the spacious Gatehouse and then Emily got dressed in an even more spacious room in the main house. 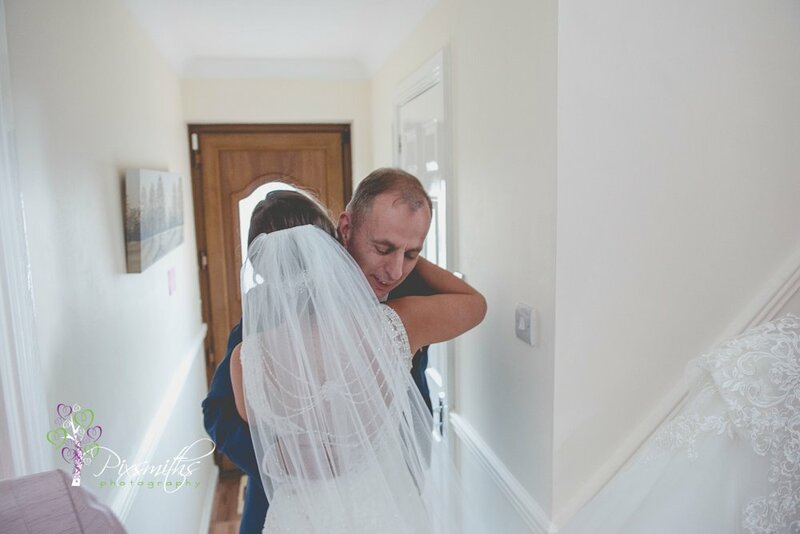 Very impressed with how he team organised transfer of belongings over. 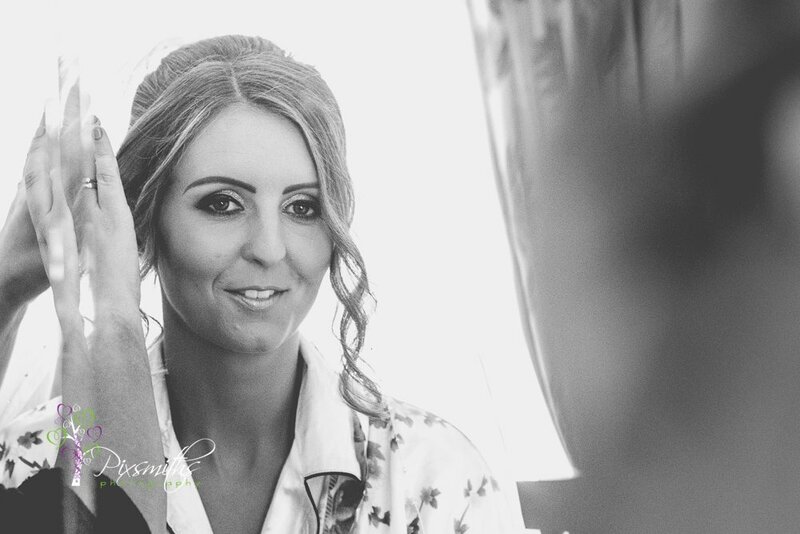 Emily was super organised from early on with make up already done when we arrived some hours before the ceremony. 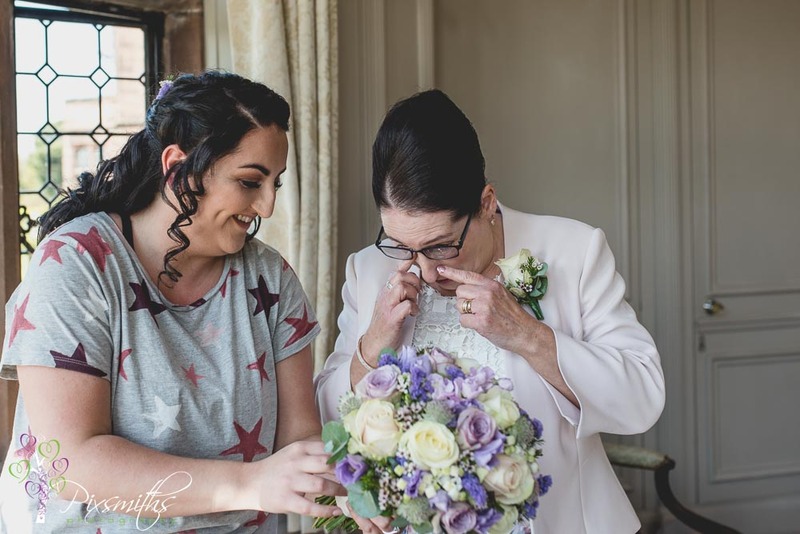 Peter had Emily all emotional with the message on his card to her and had arranged for her Nan’s chain (which she wore every day prior to her passing) to be placed in her bouquet. 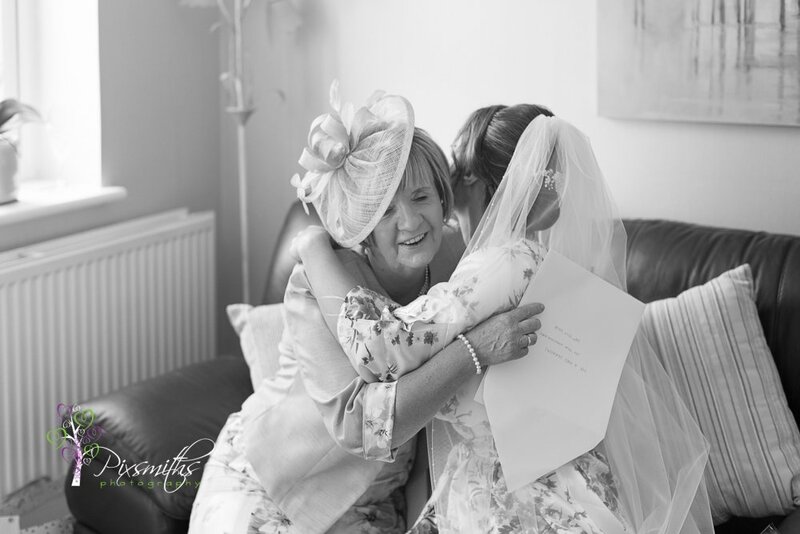 A thoughtful way to remember her Nan and Emily’s mum also got teary seeing it too. 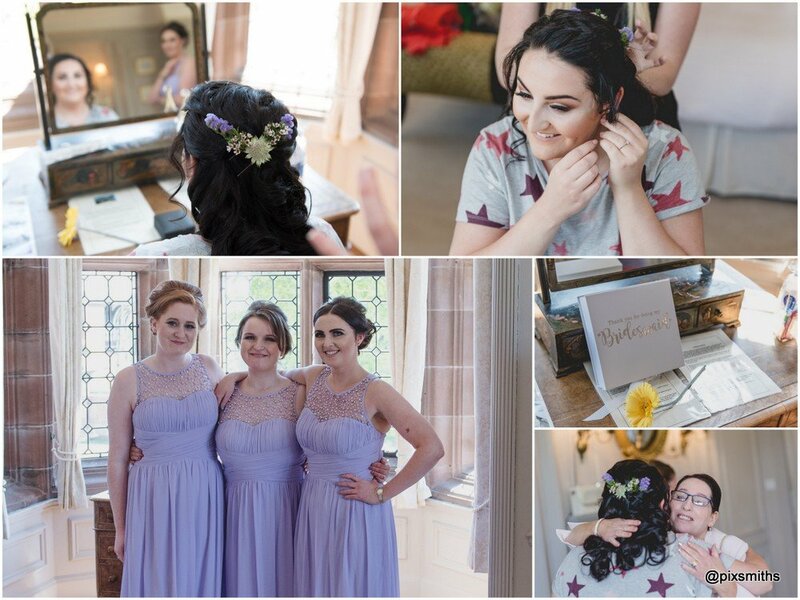 Emily wore flowers in her hair to match the lilac of the bridesmaids dresses. 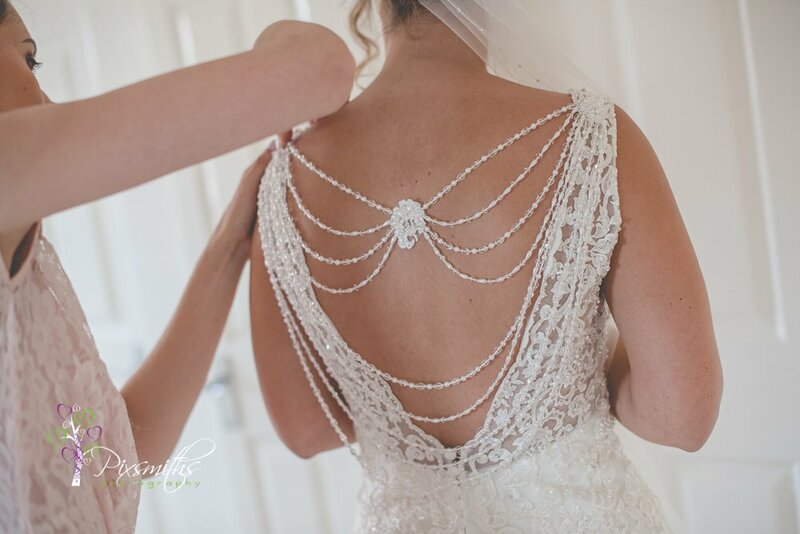 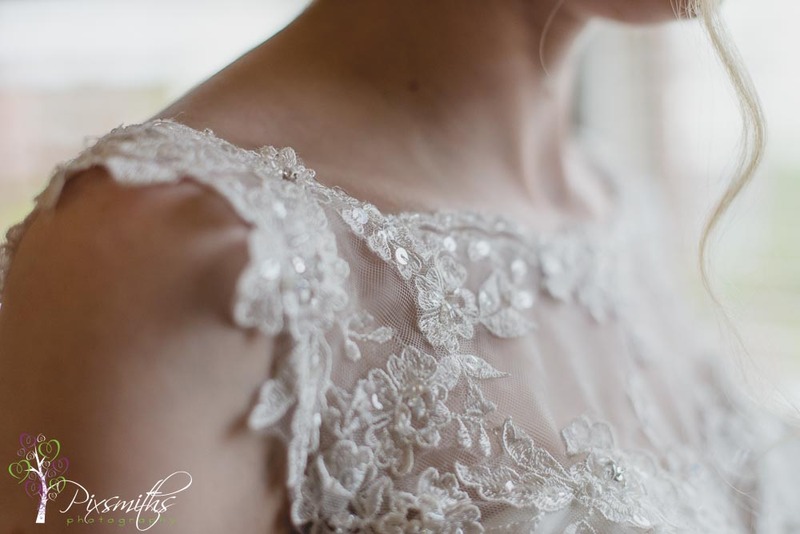 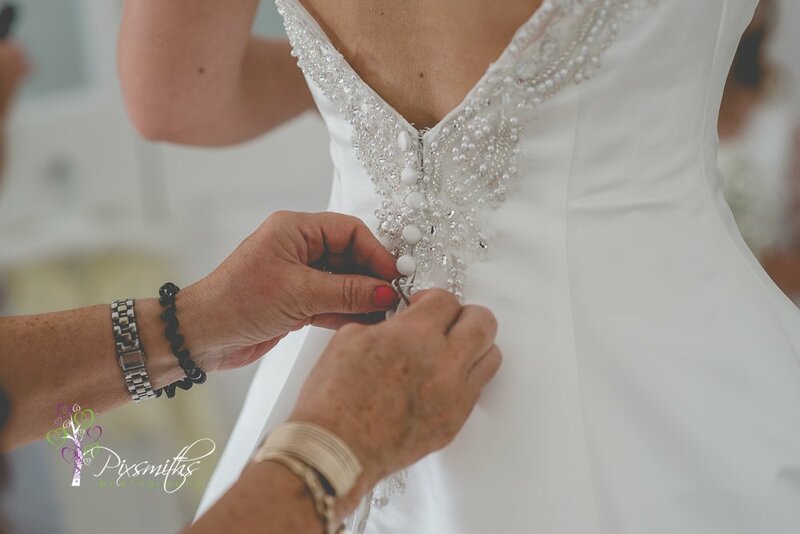 Lovely detail in the top beading detail of their dresses which matched that of Emily’s gorgeous dress. 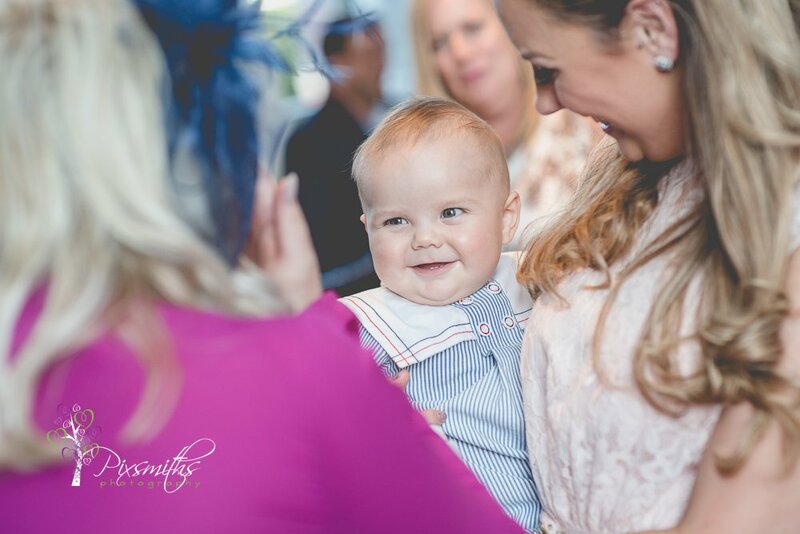 Little Oliver, Emily’s nephew almost stole the show though, so cute! 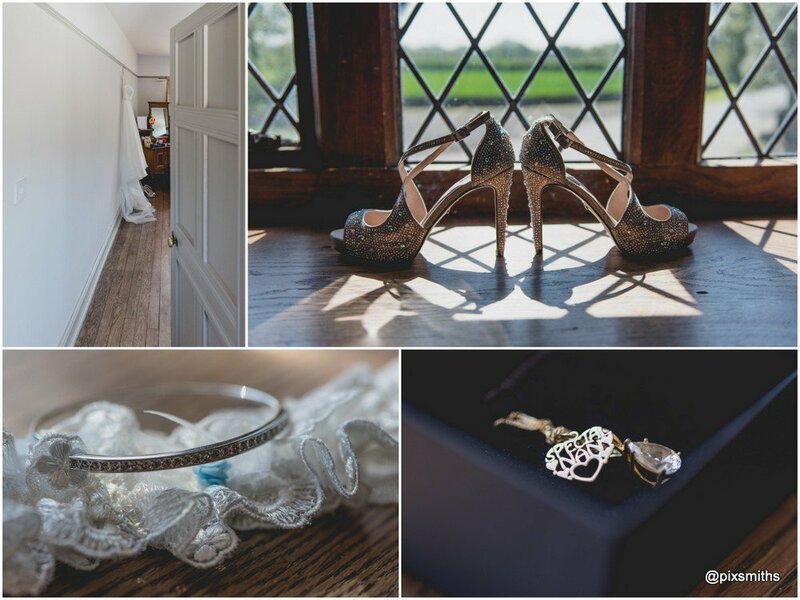 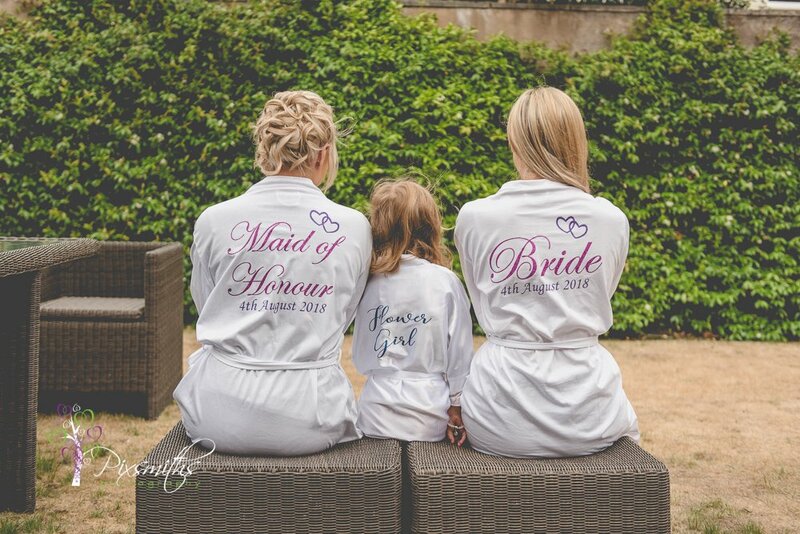 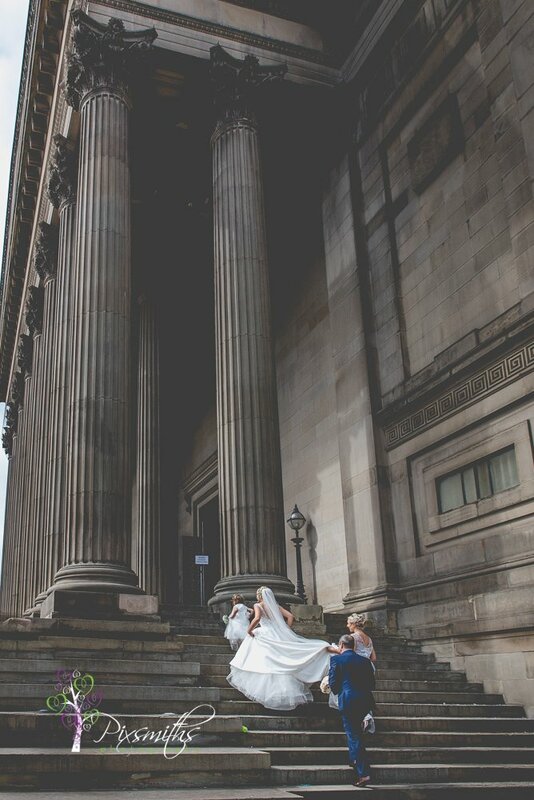 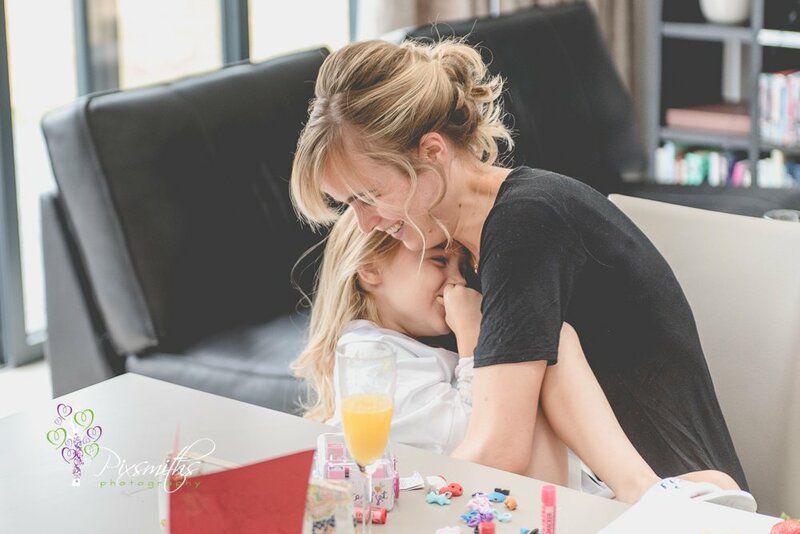 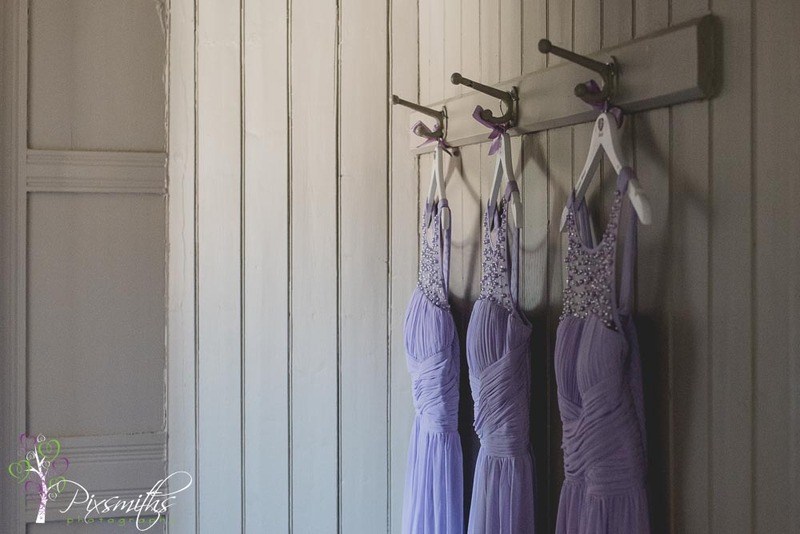 We always enjoy plenty of time relaxing with the girls and get some venue shots. 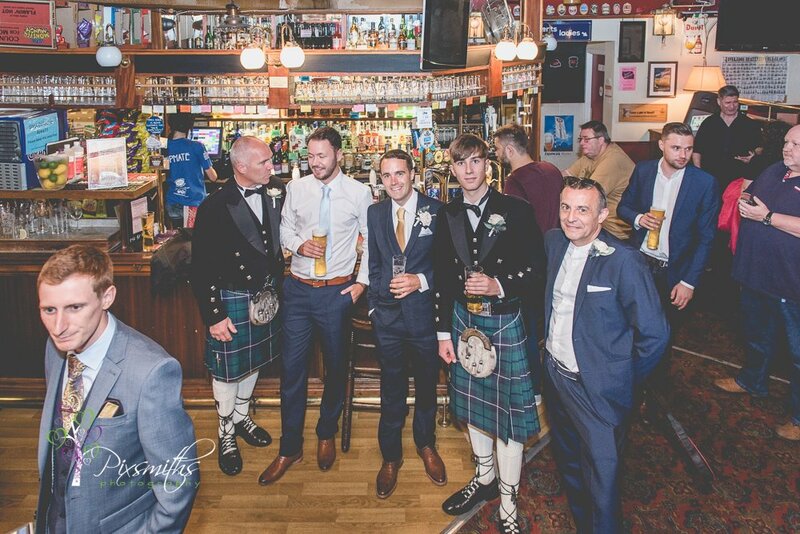 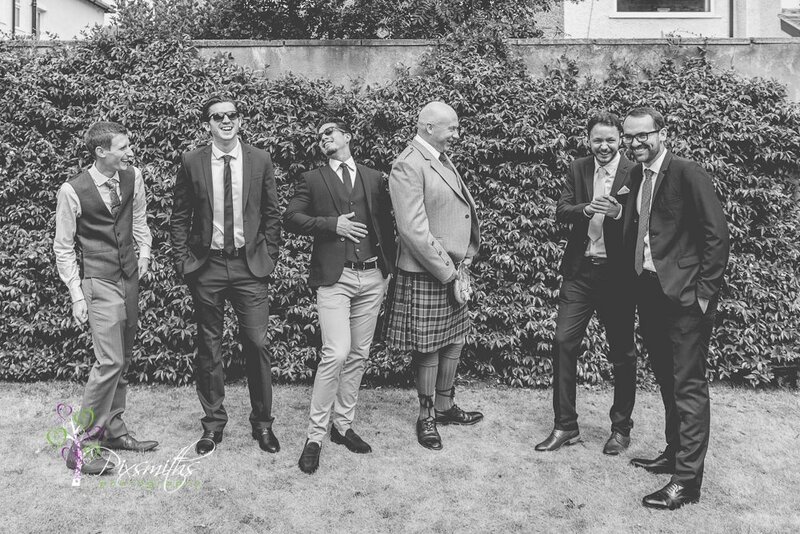 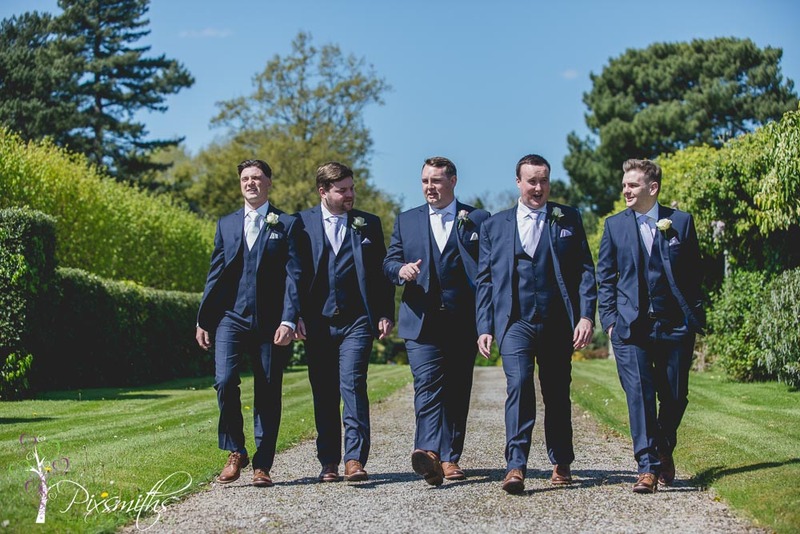 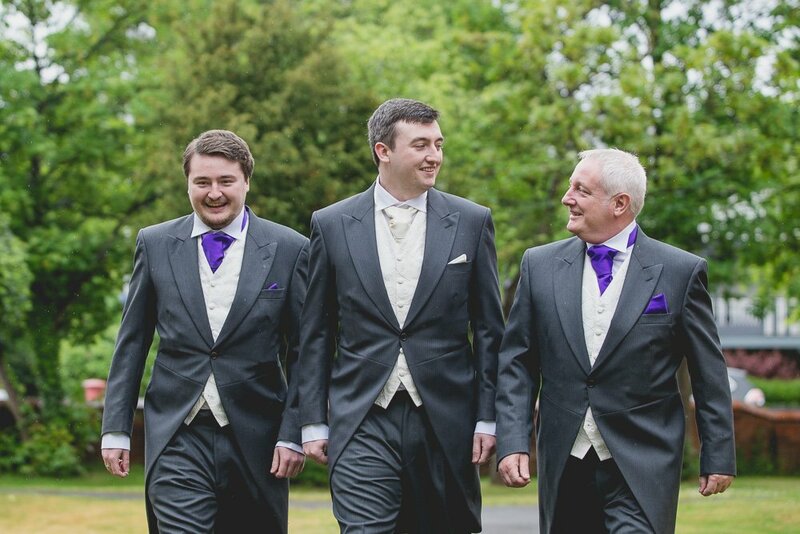 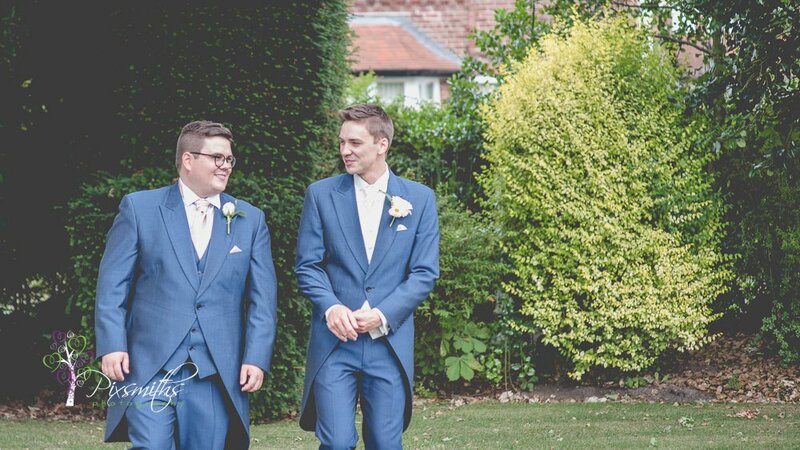 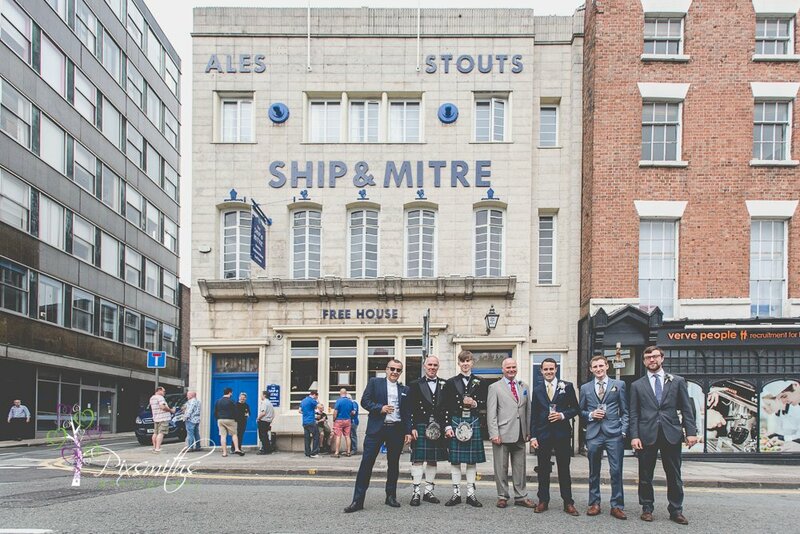 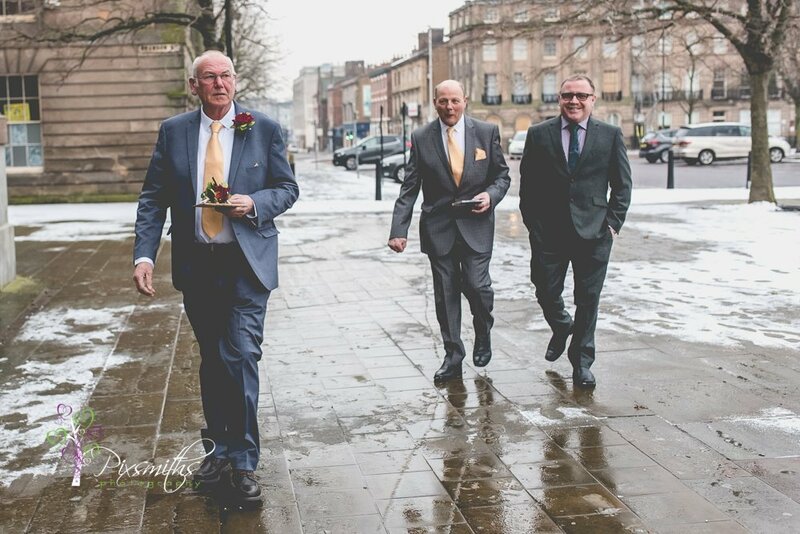 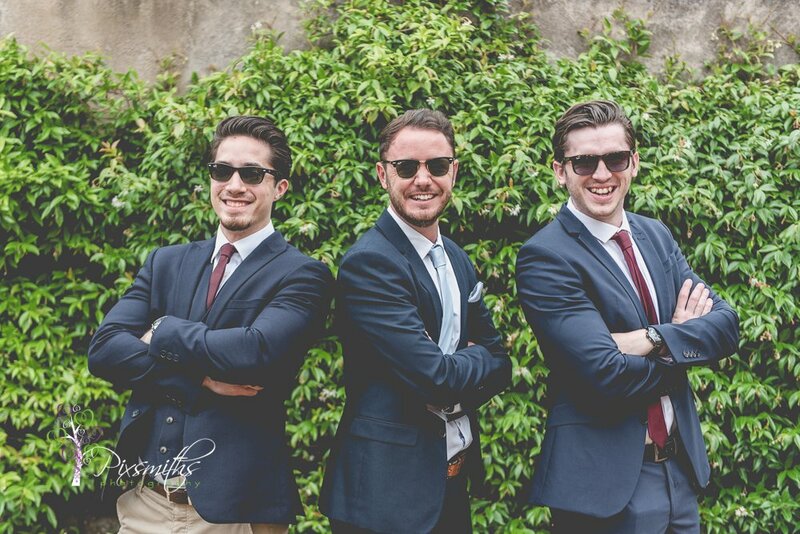 Seeing as the girls were getting ready on site it was easy to capture the groomsmen arrival too. 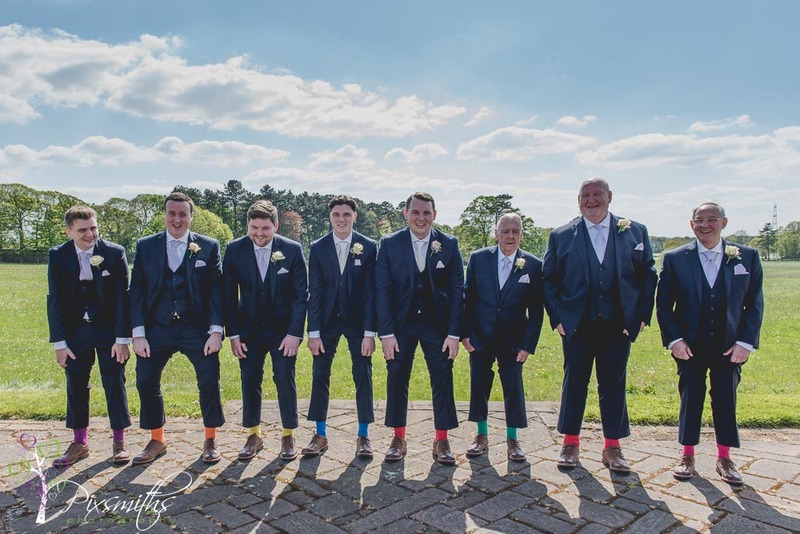 The groomsmen added to the colour of the day by wearing a variety of colourful socks. 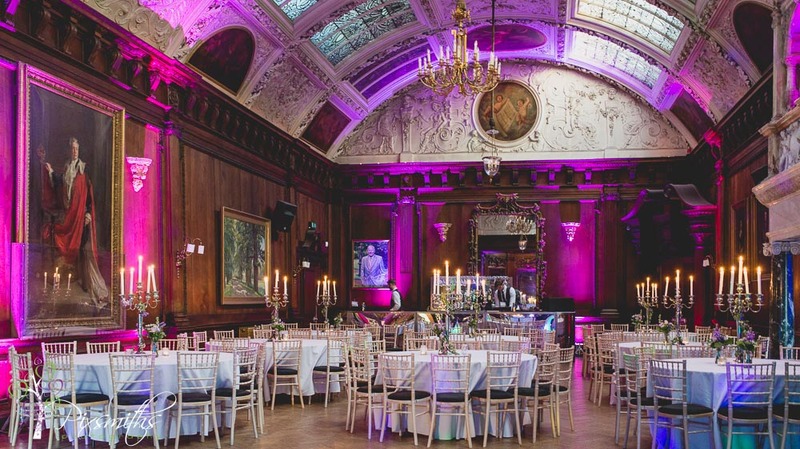 The music room always looks fabulous and today was no exception, truly a grand setting for a memorable meal. 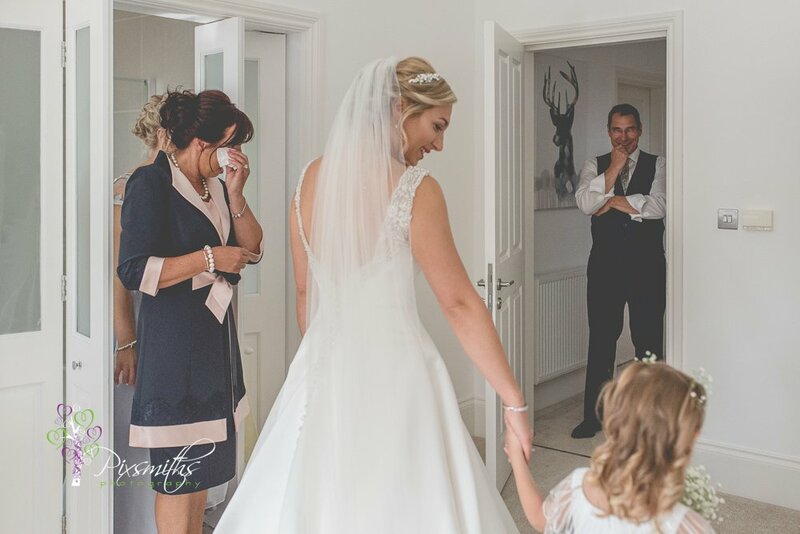 We loved the expression of joy on Emily’s face when she was shown the room. 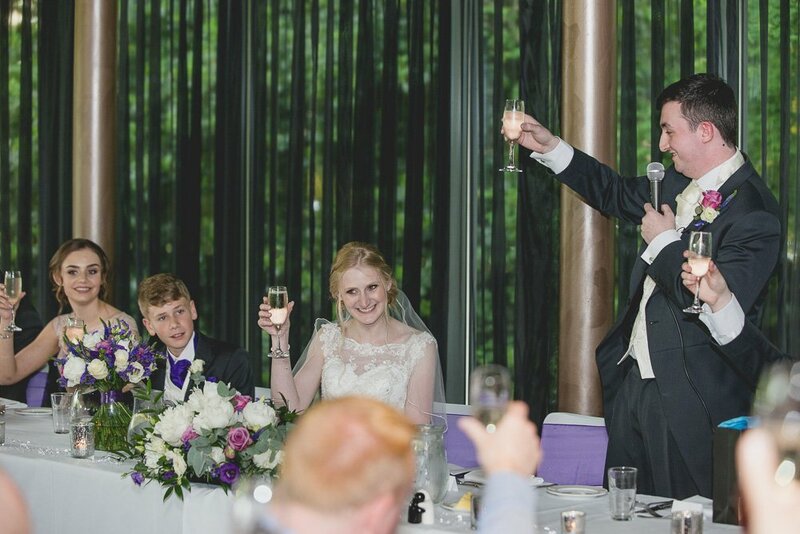 Lots of cheers and hand waving as Peter and Emily were announced in as the new Mr and Mrs. Good food and entertaining speeches followed, the best man had everyone laughing. 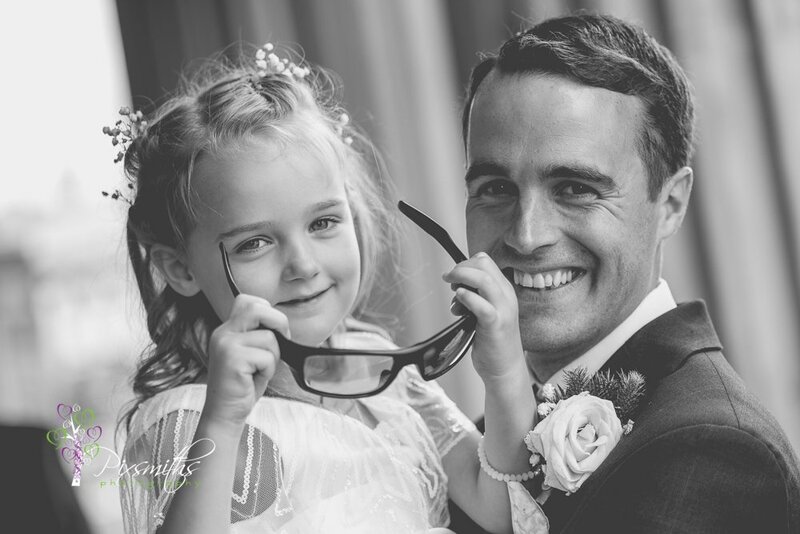 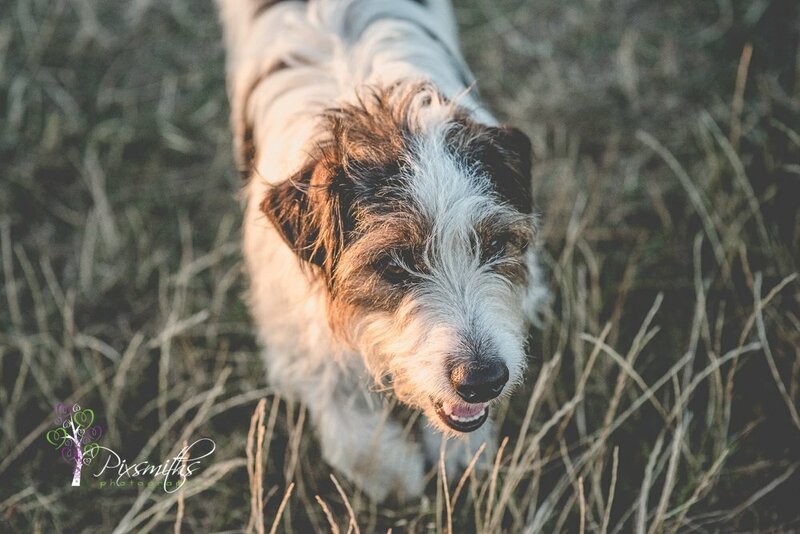 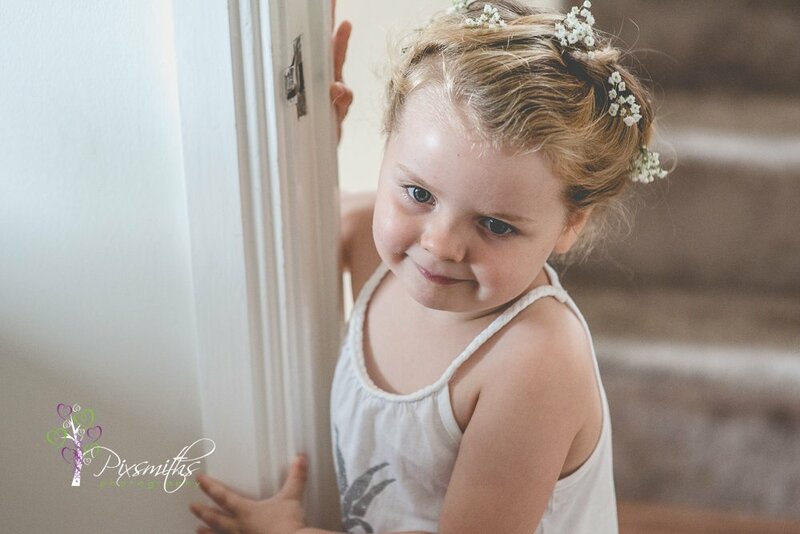 Extra portraits are a bonus when we are booked for a full day package, making the most of your photo opportunities and spreadign it over the day. 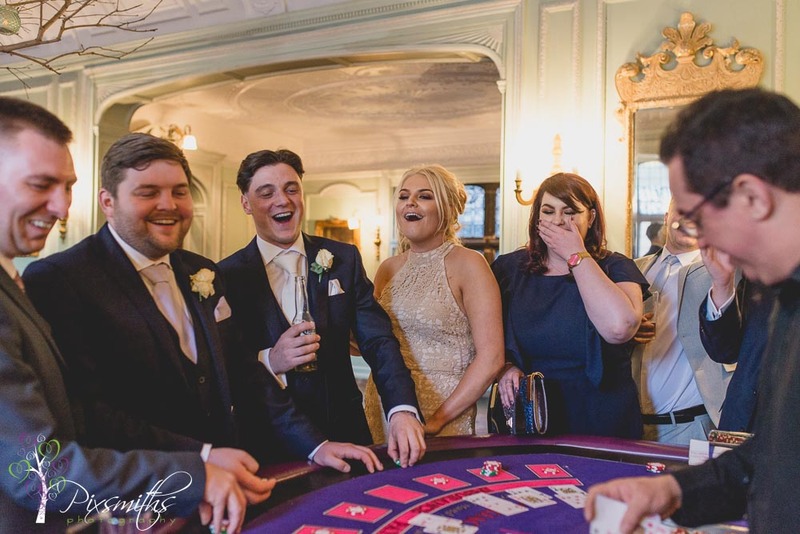 Soon time for the evening dancing and party with the casino going down a treat, certainly provided for a lively atmosphere! 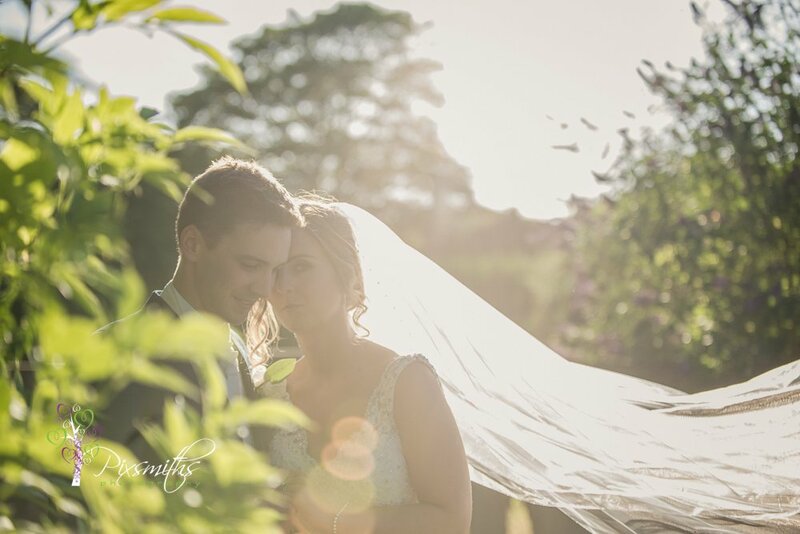 The sun shone all day and everyone had a great time.